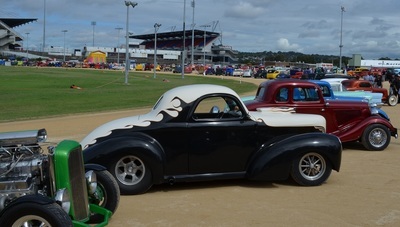 Easter 2015 saw the ASRF Nationals at Newcastle for the first time with all the local Hot Rod Clubs pitching in together to run the Event. 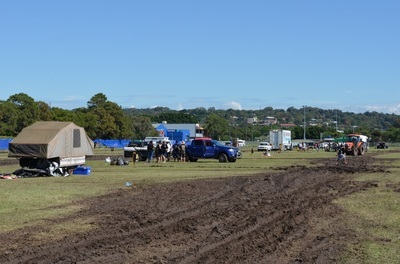 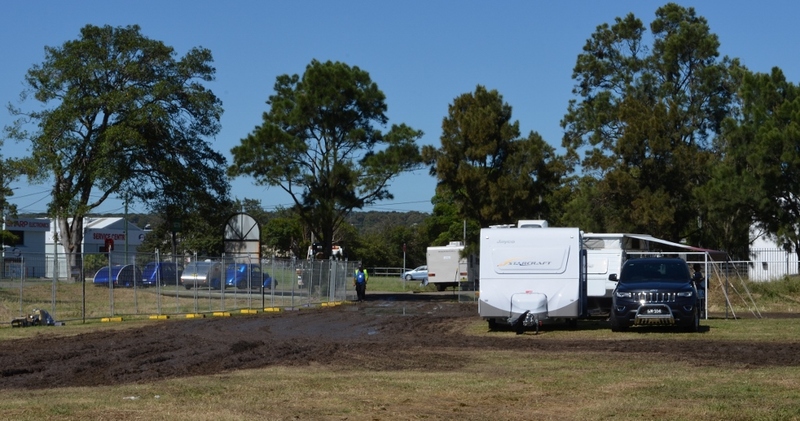 Those in the club that camped arrived on the Wednesday and while the ladies went off to make up the goodies bags for the entrants the men set up camp in glorious sunshine. 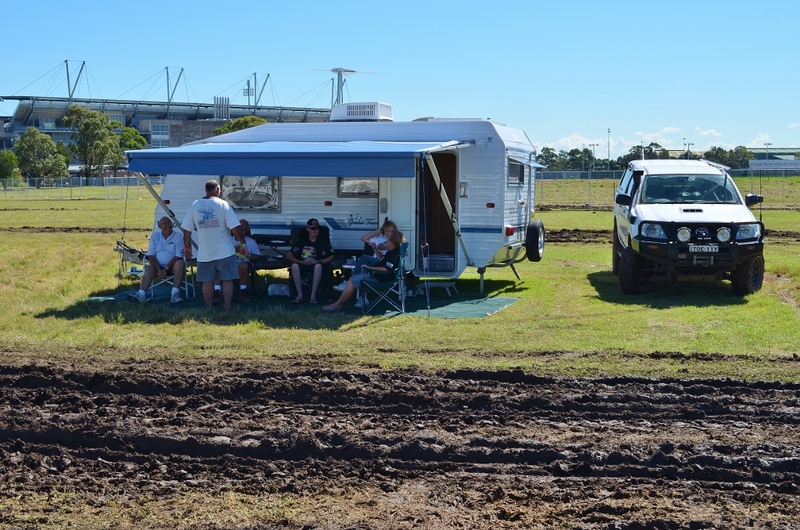 That evening we all sat around and talked about the day with excitement for the weekend. Thursday the weather was fine for registration day and again the ladies went to help while some of the men put up all the marques and others were lucky enough to have a tour of the Westpac Rescue Helicopter base. 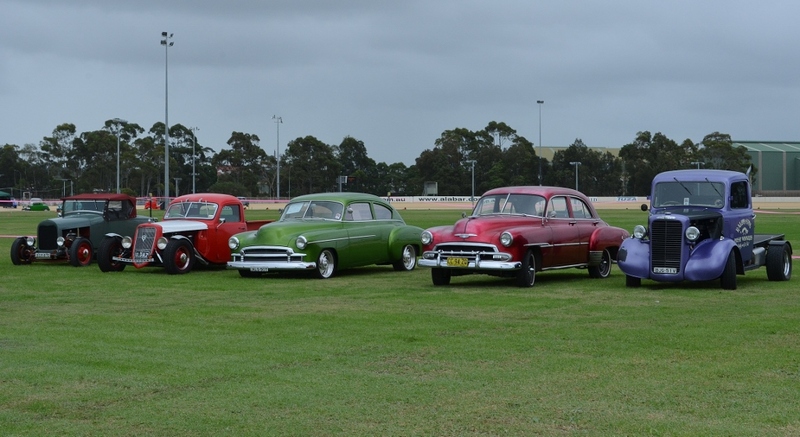 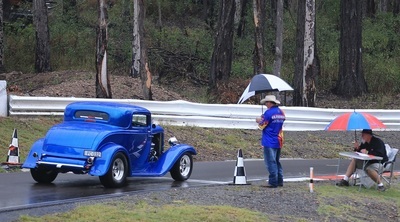 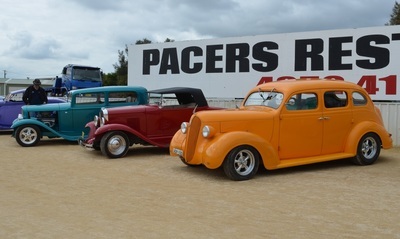 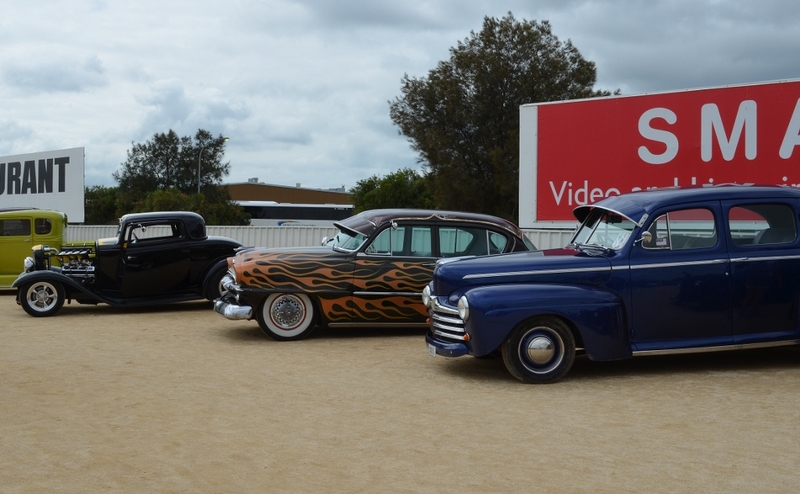 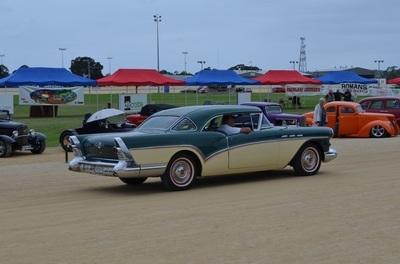 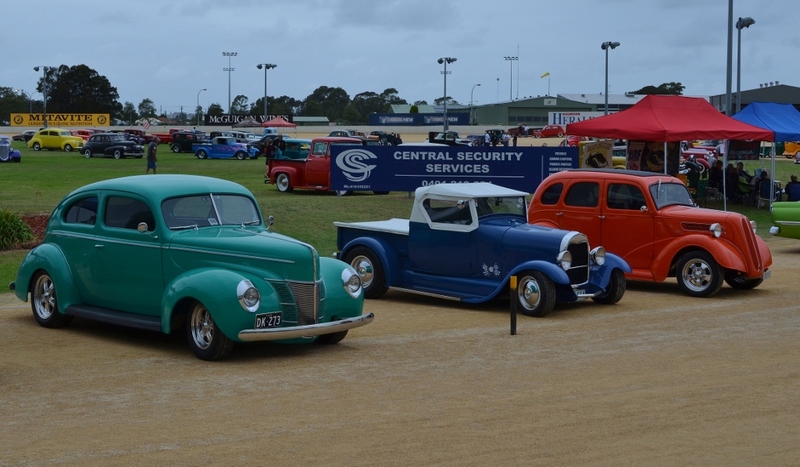 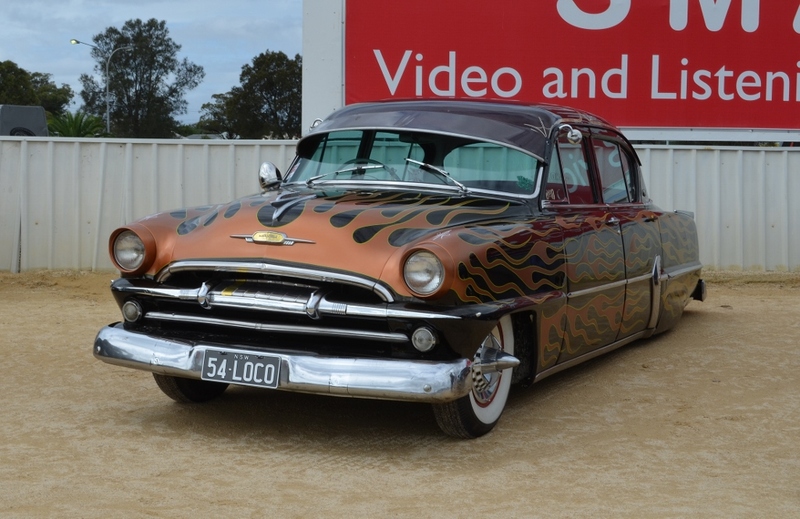 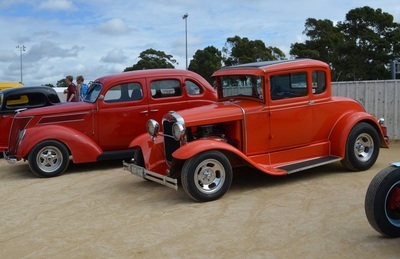 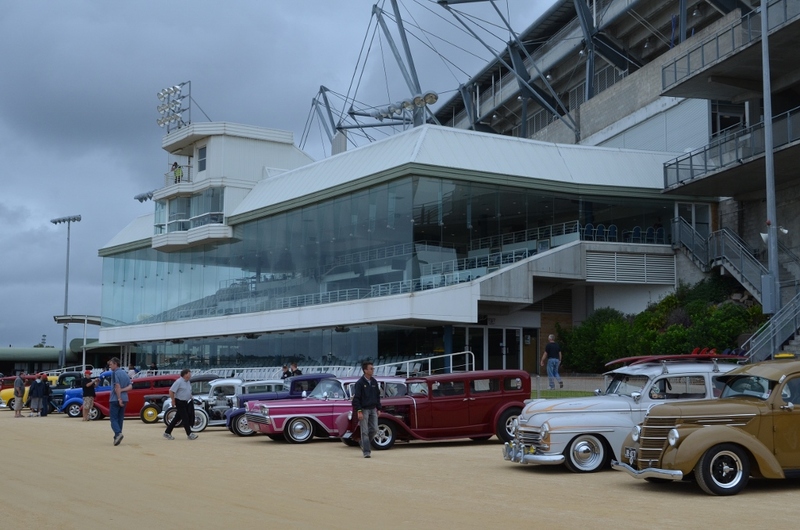 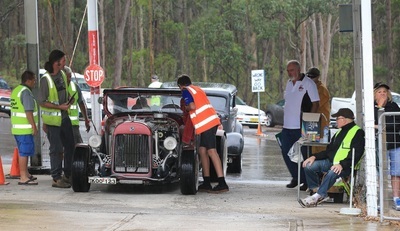 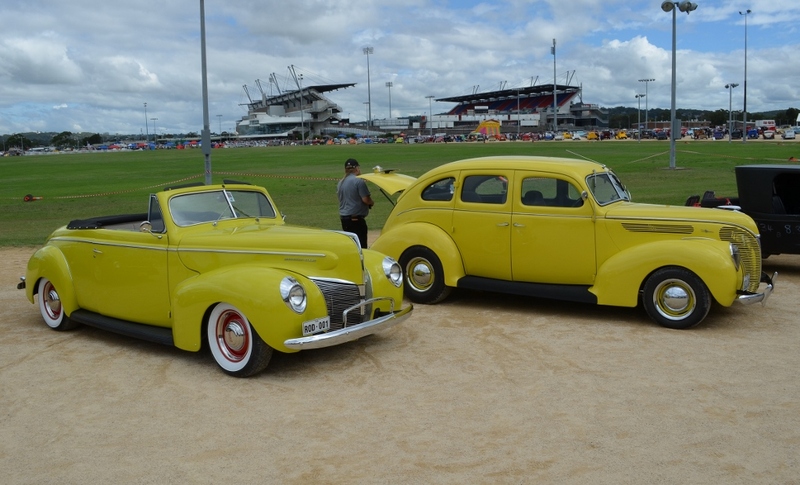 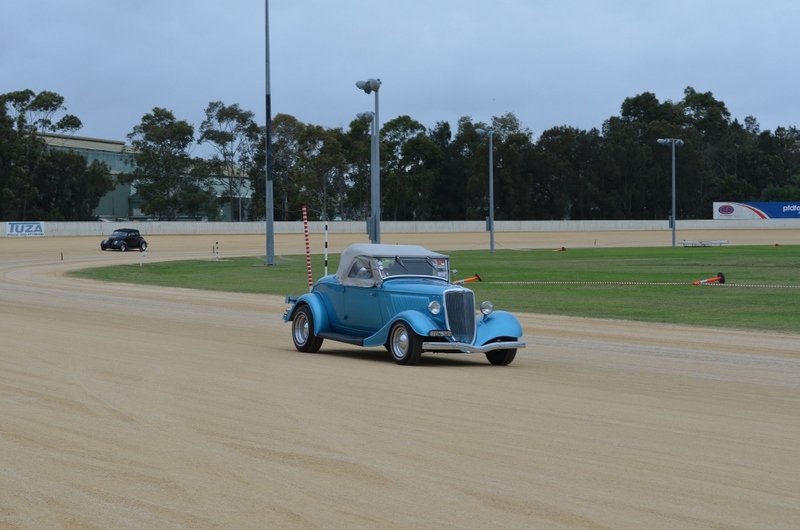 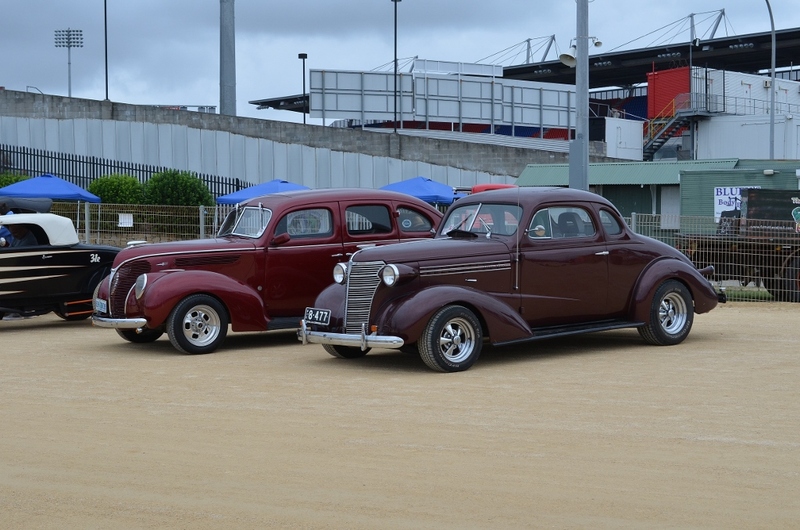 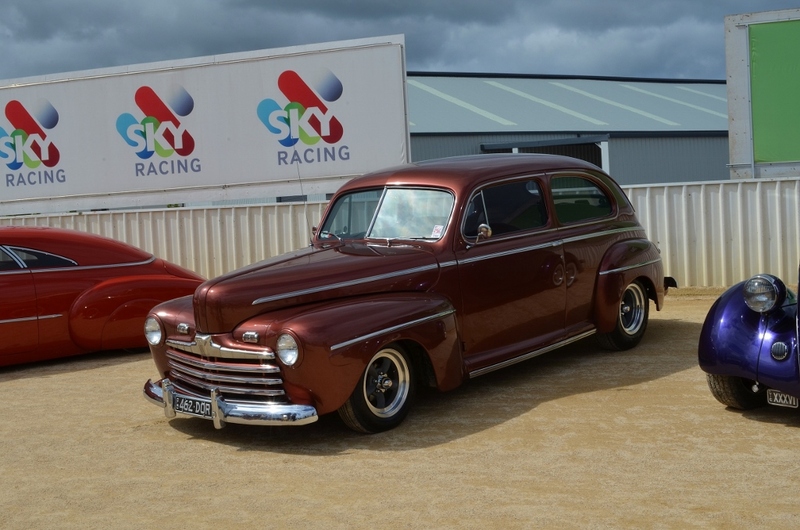 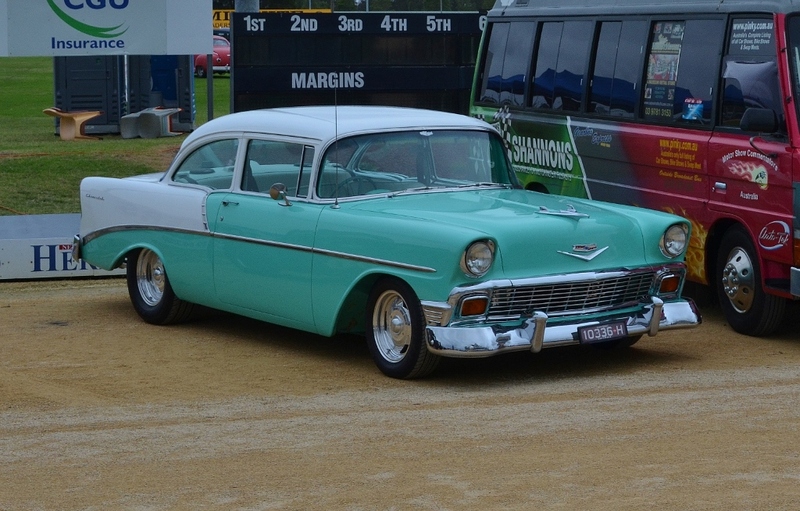 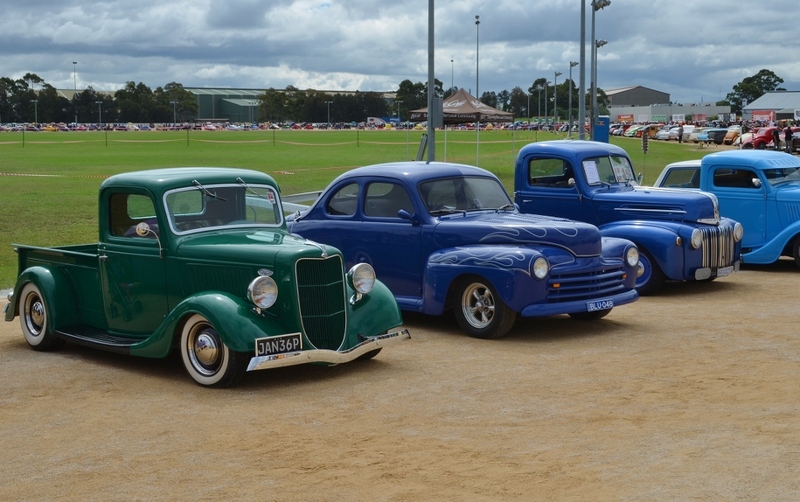 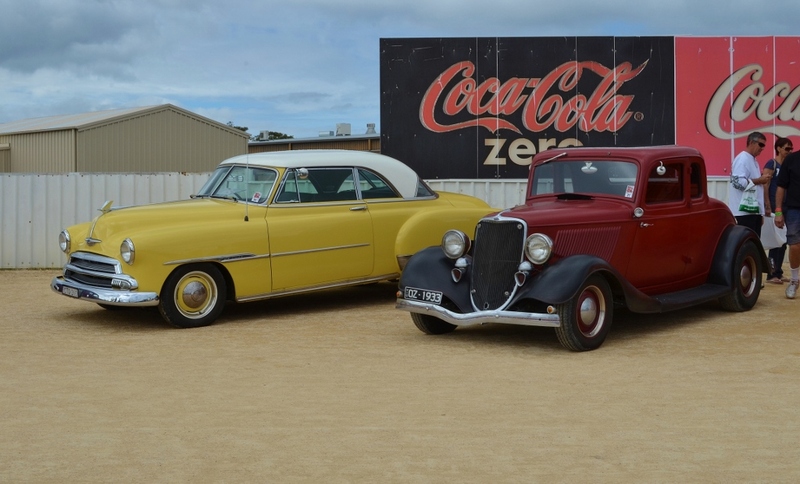 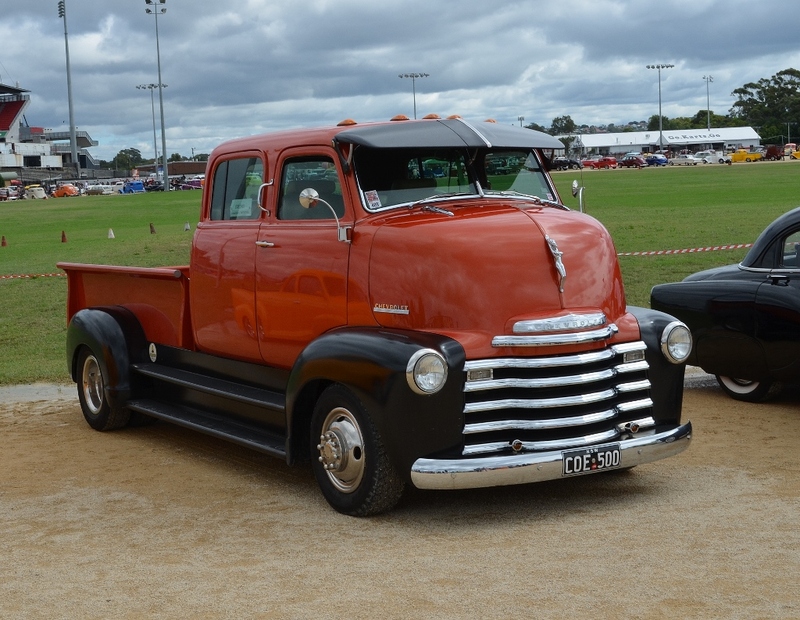 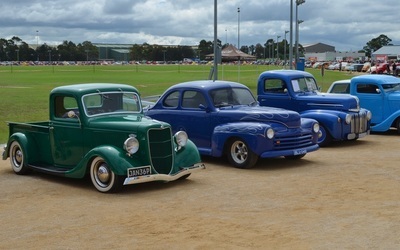 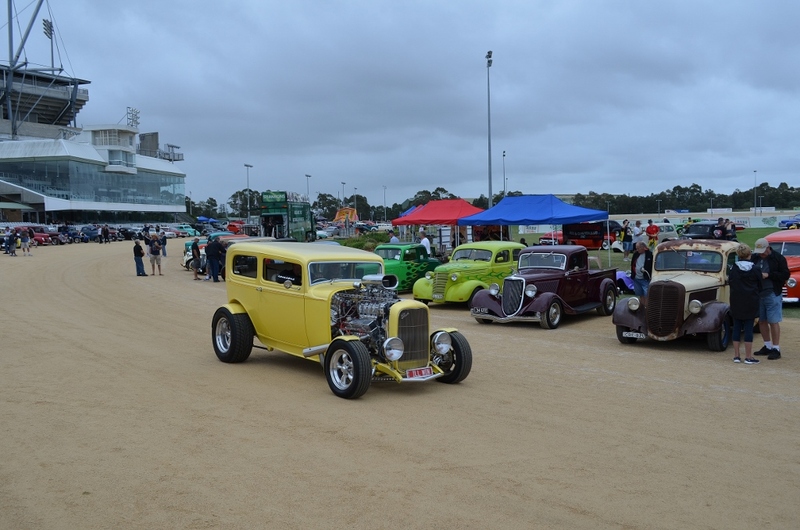 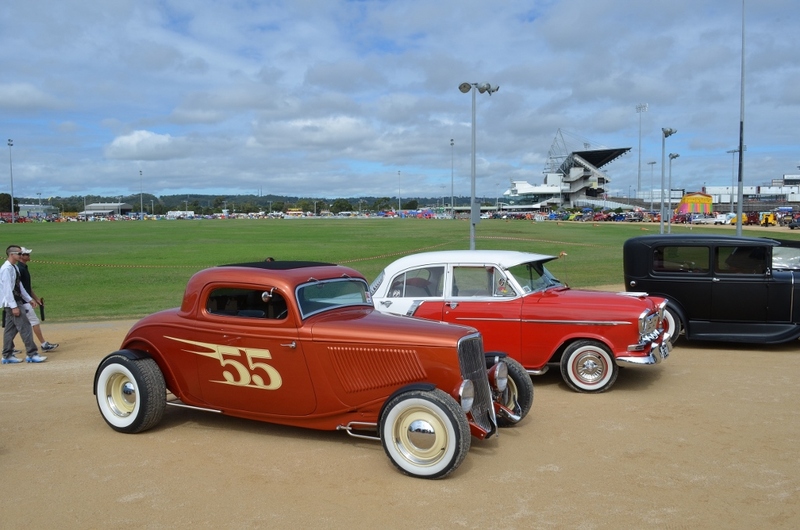 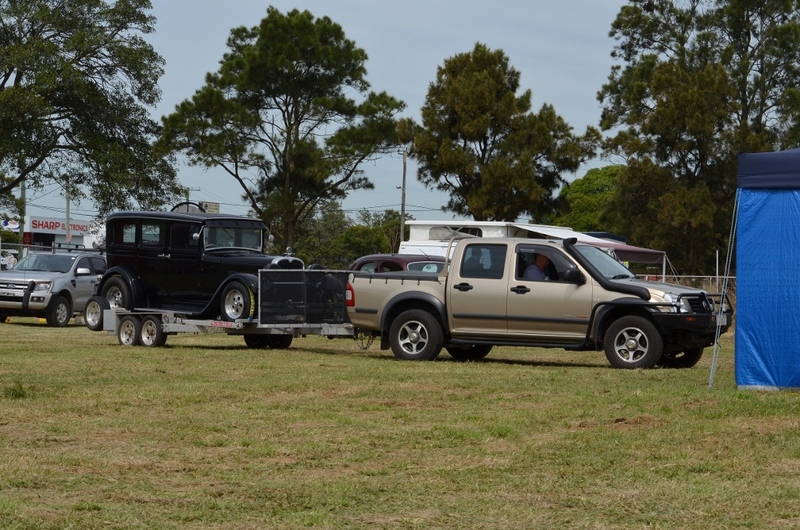 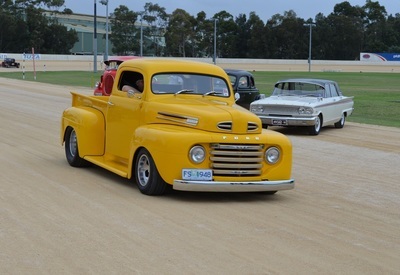 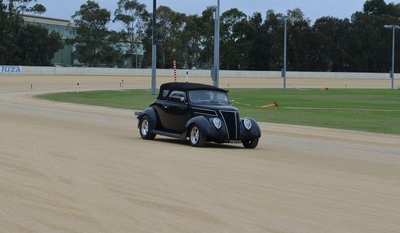 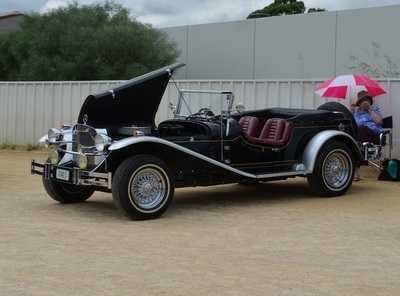 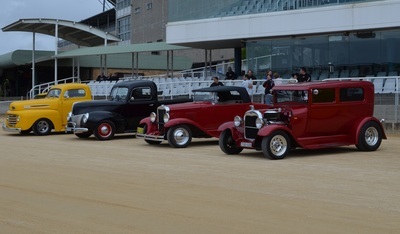 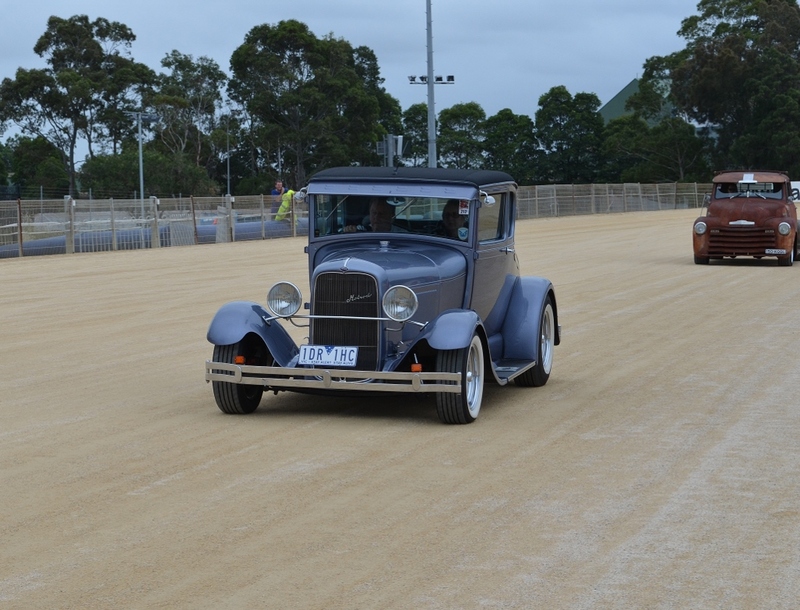 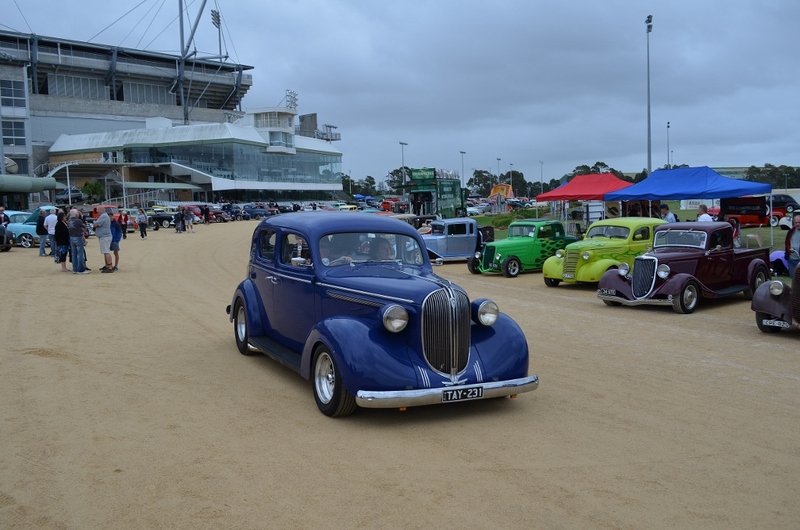 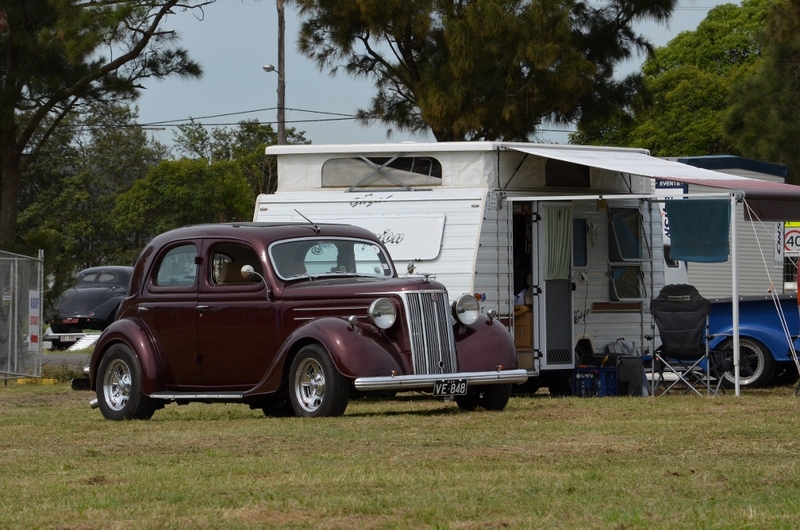 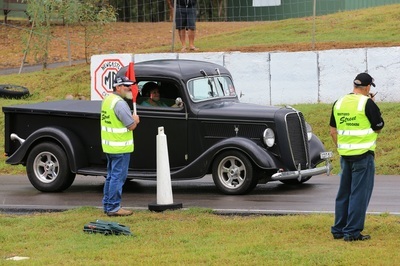 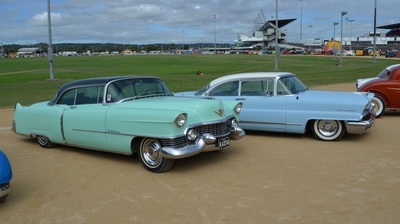 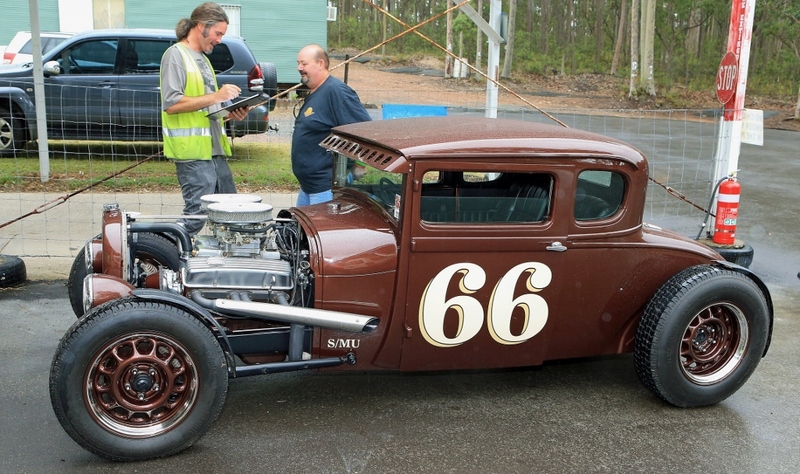 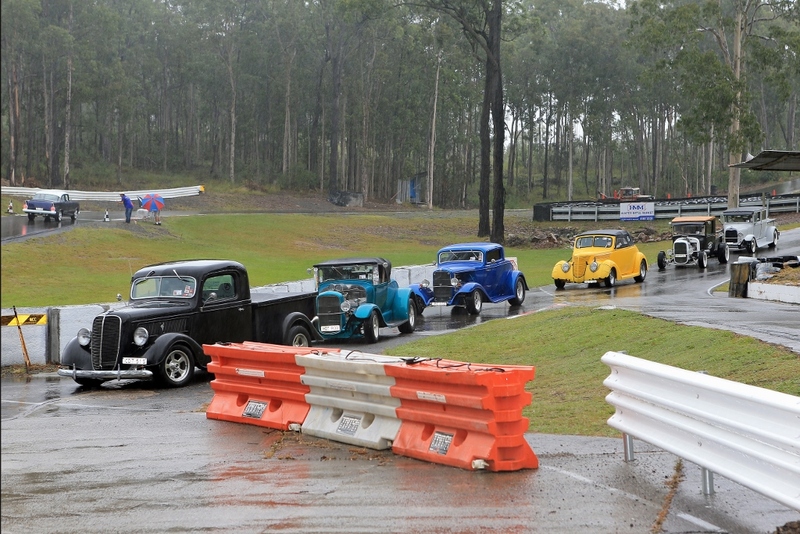 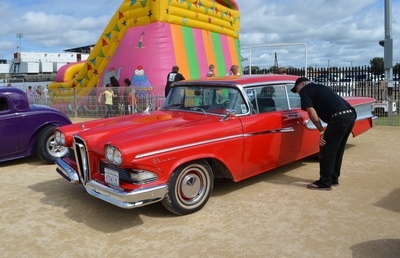 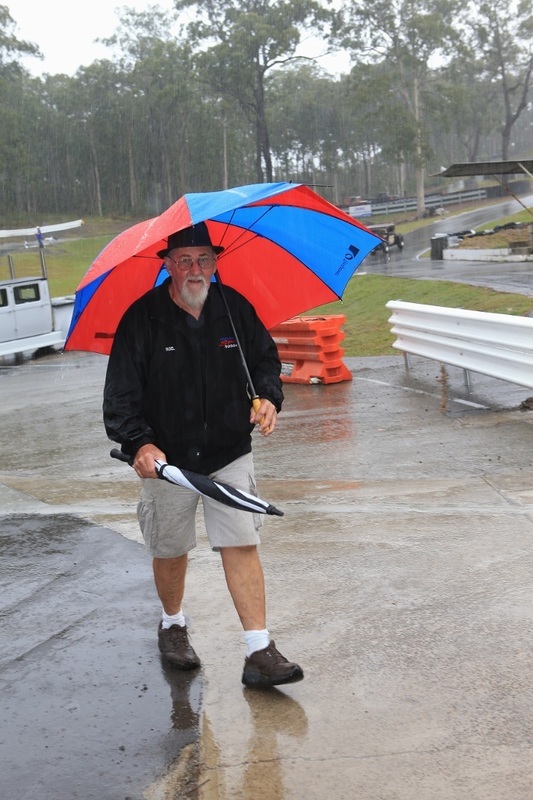 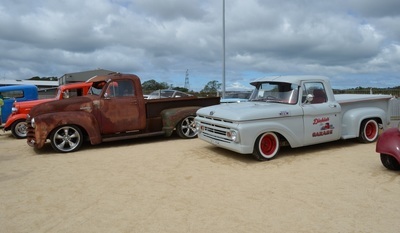 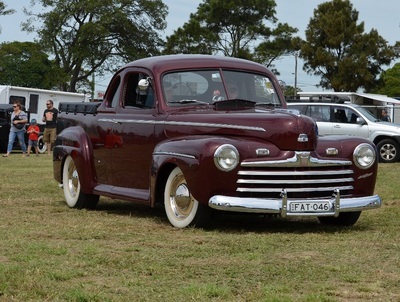 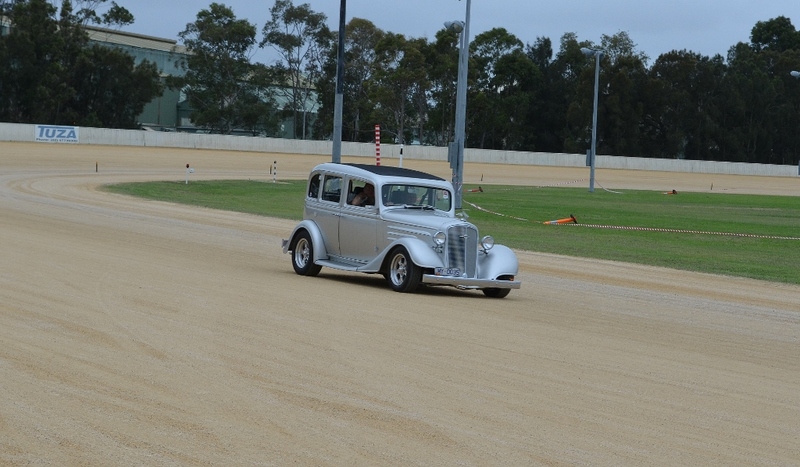 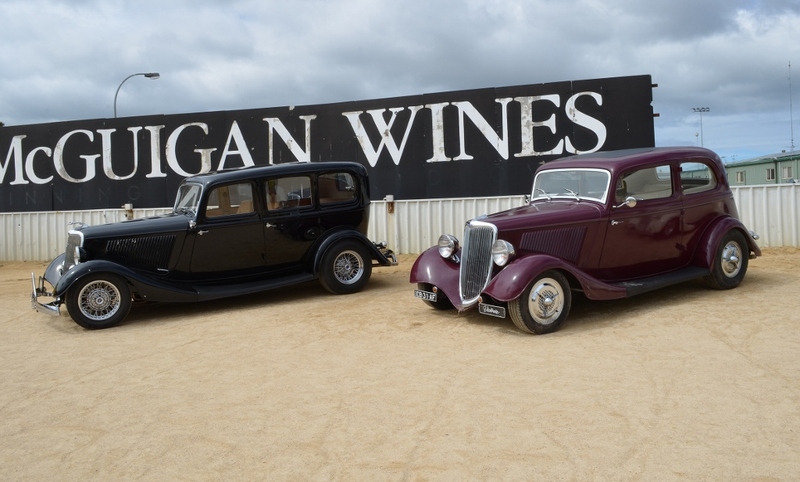 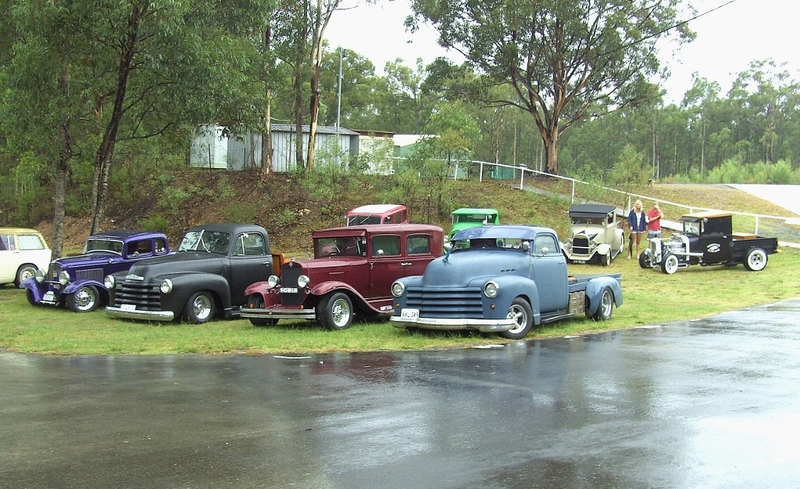 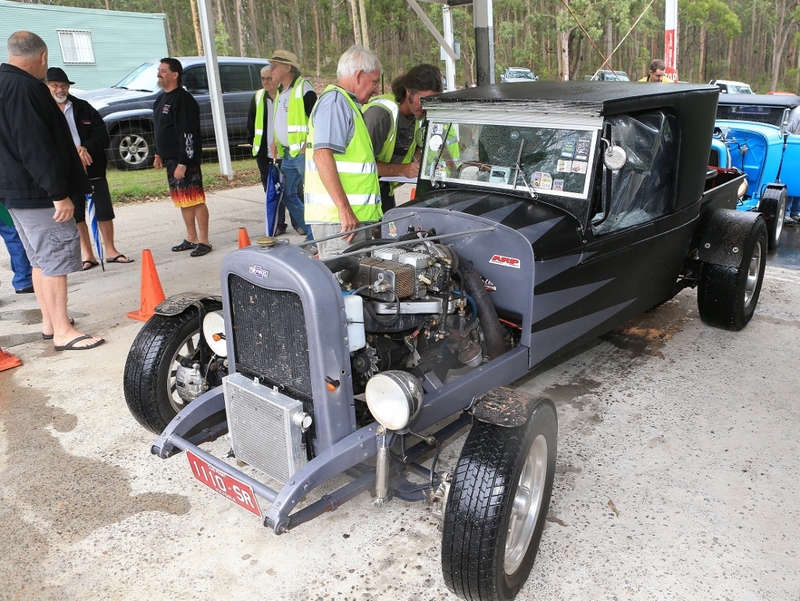 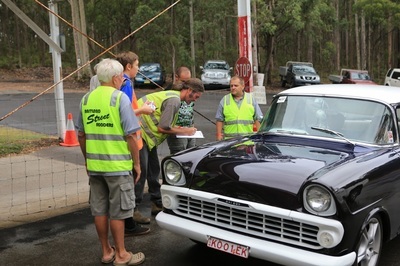 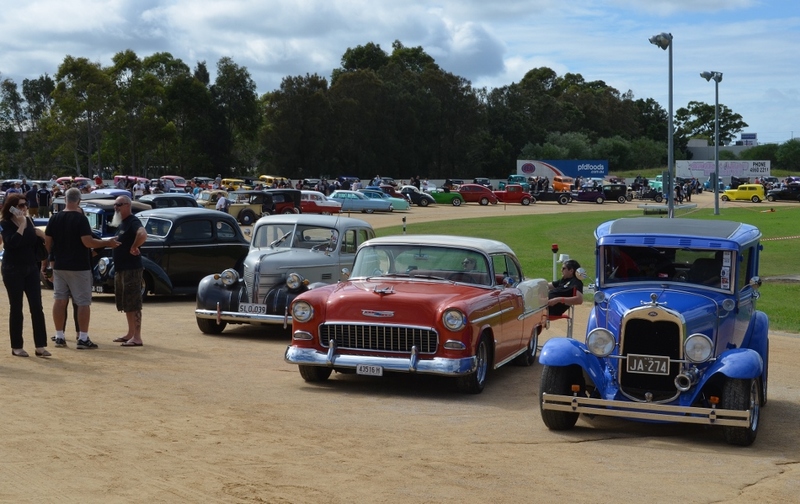 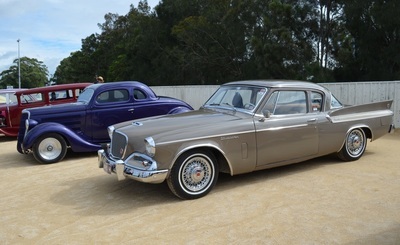 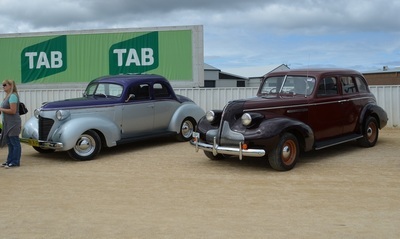 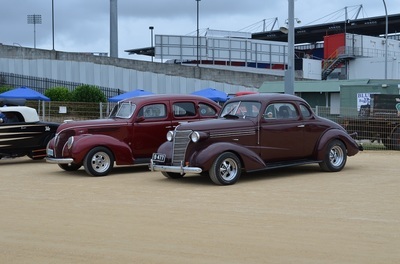 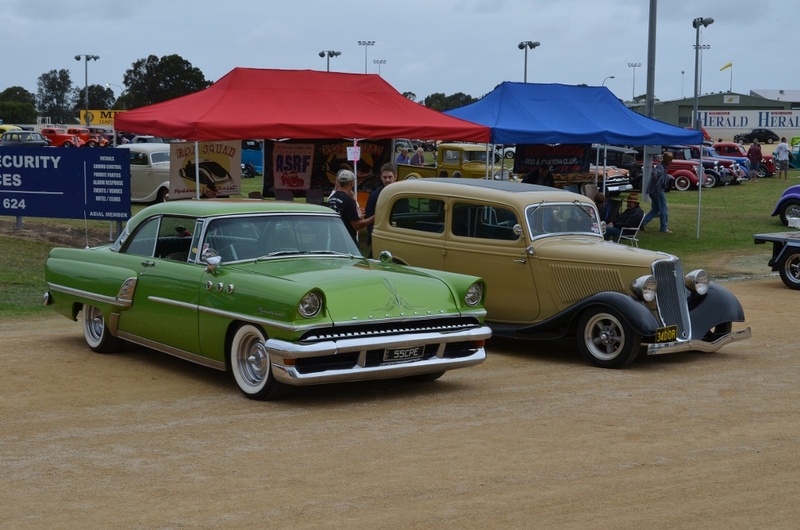 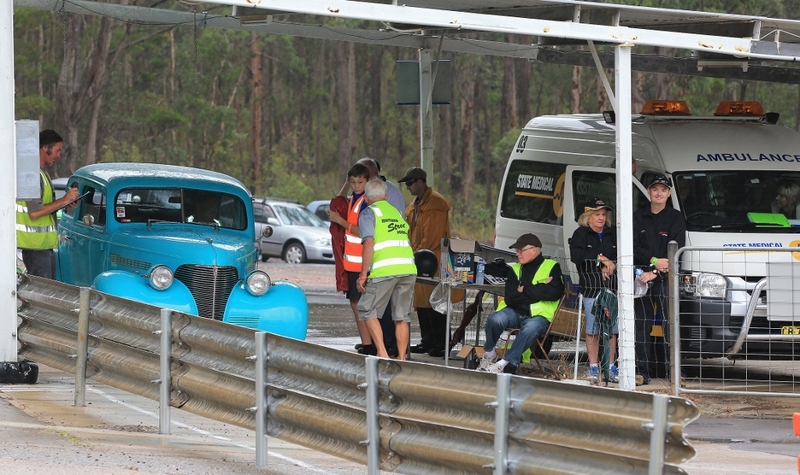 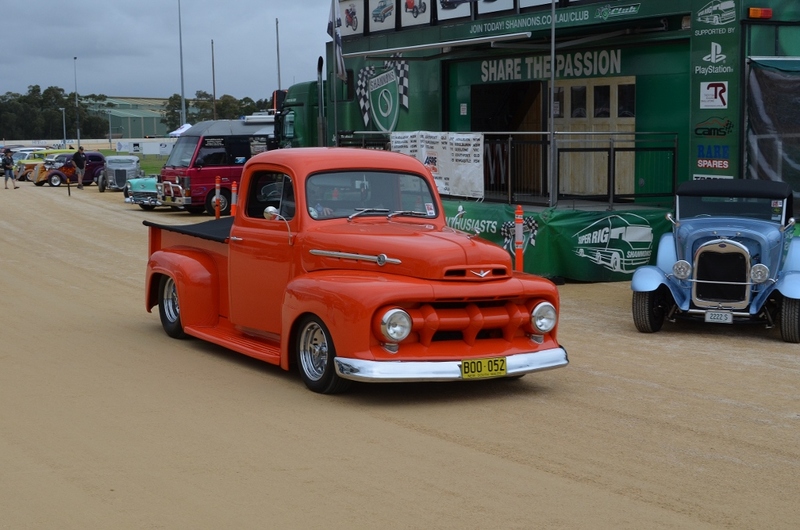 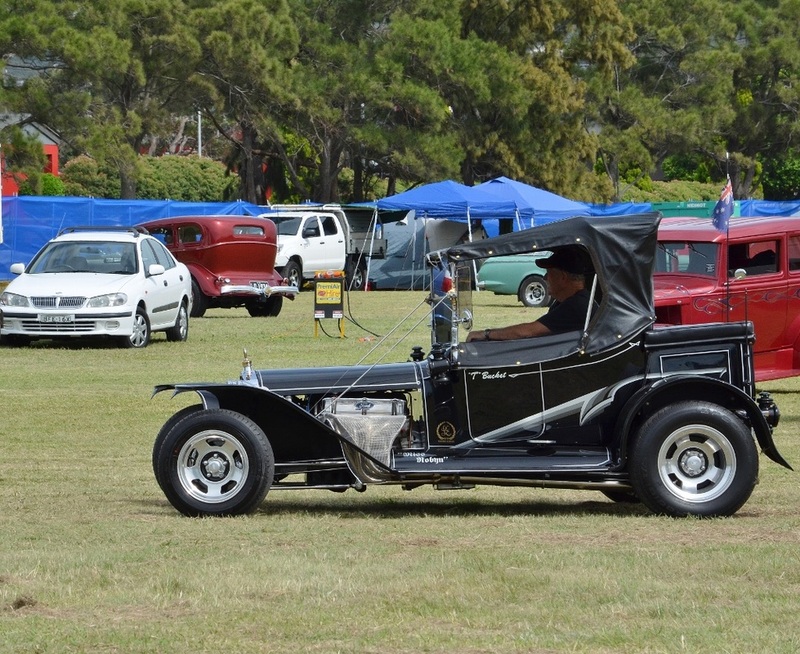 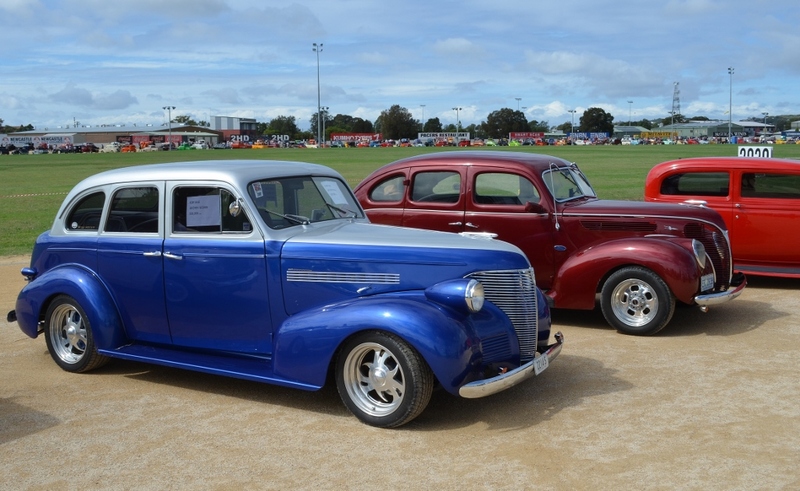 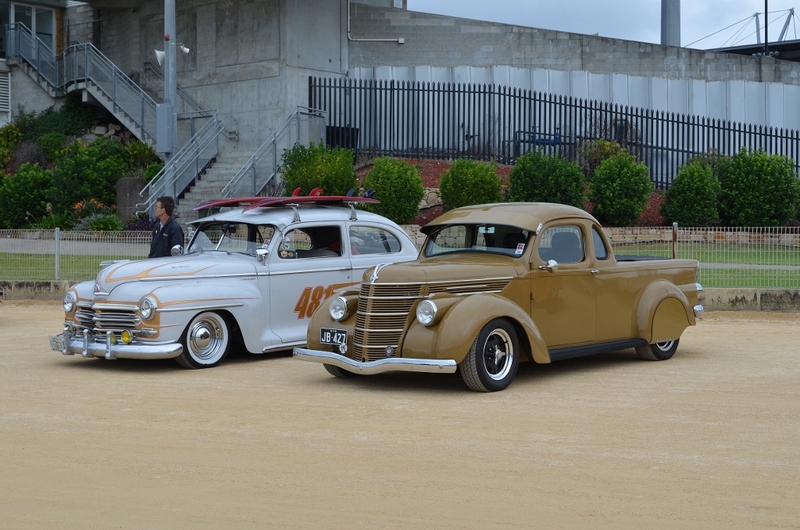 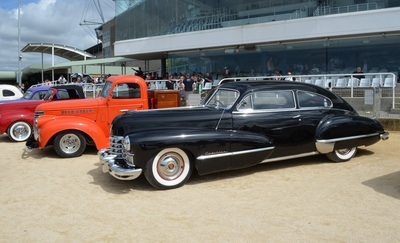 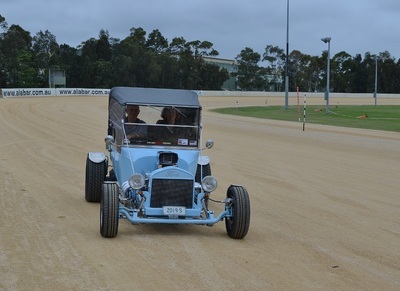 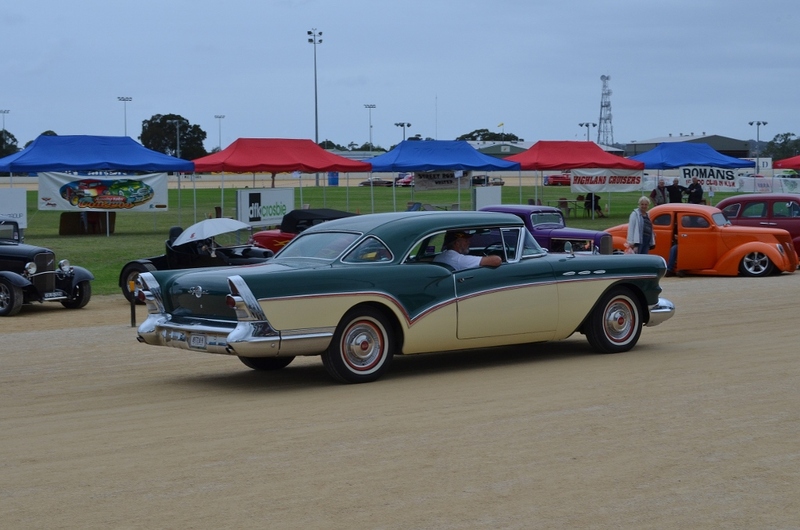 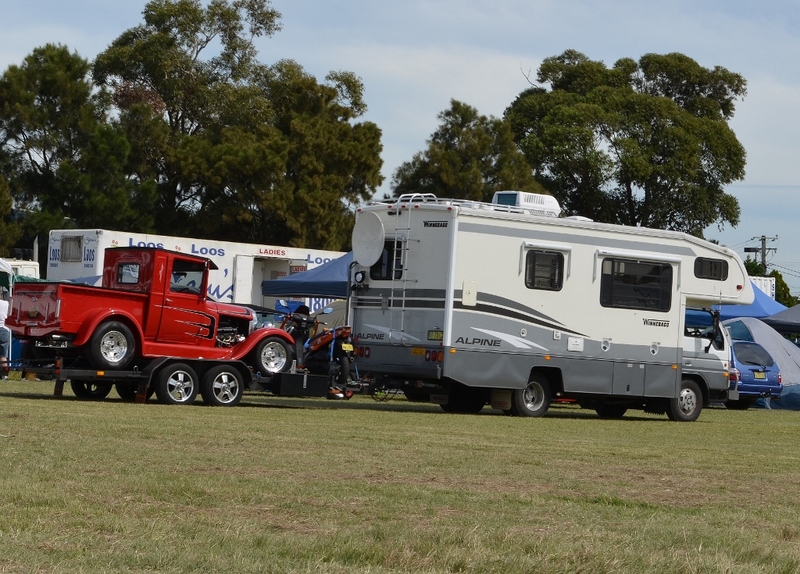 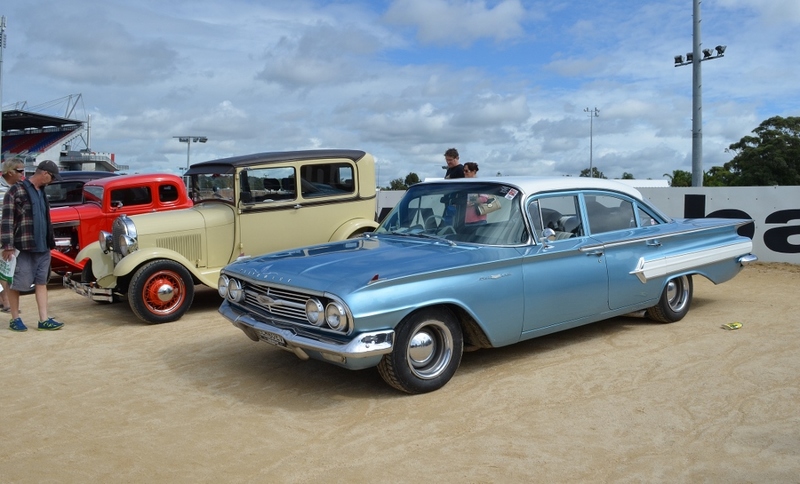 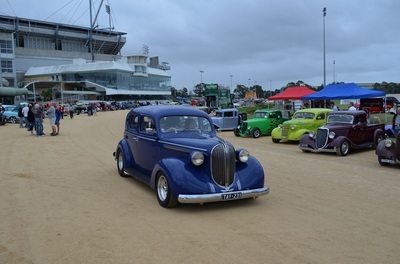 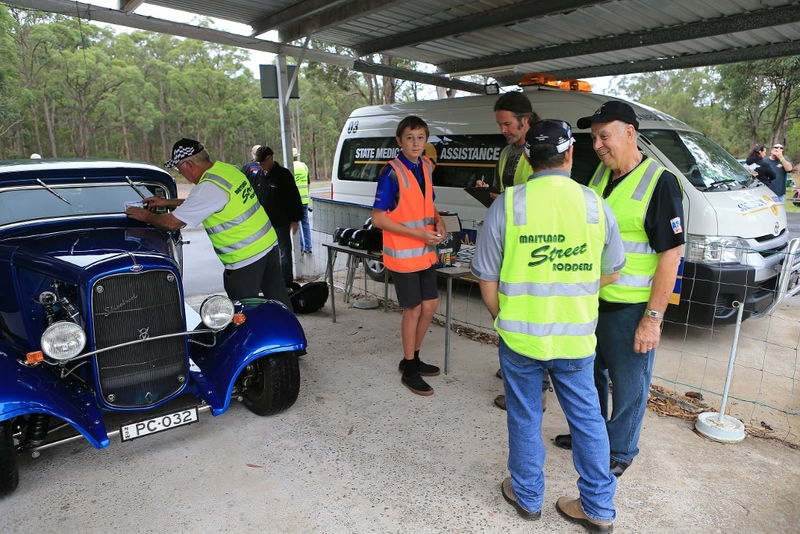 Friday the entrants events started with some going to Lost in the 50's while all our club members were running the driving events at Ringwood. 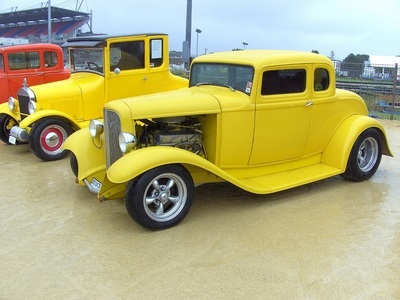 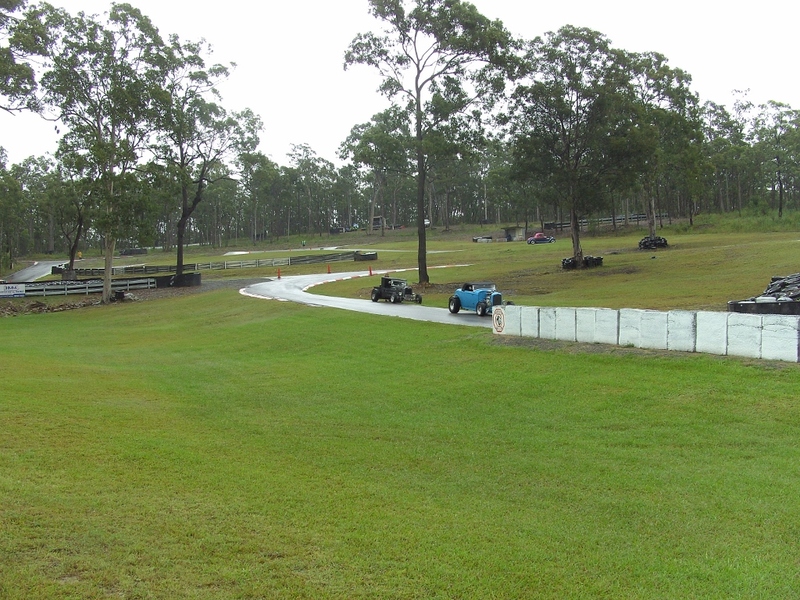 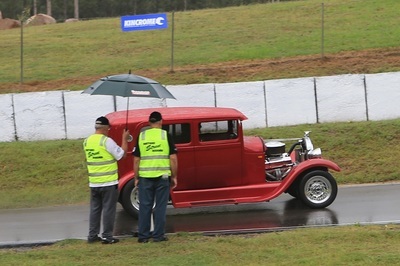 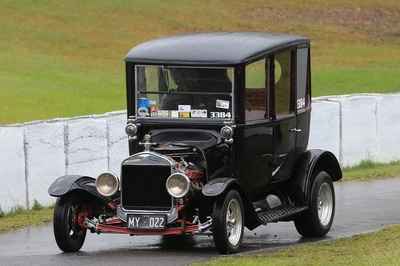 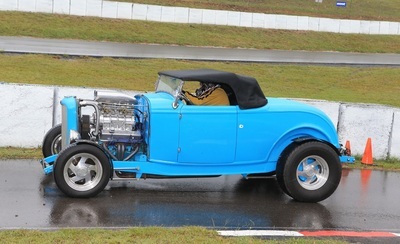 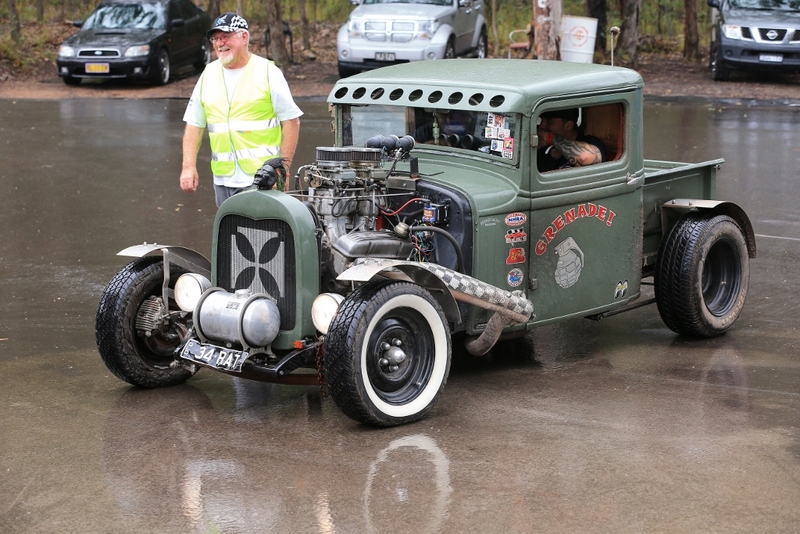 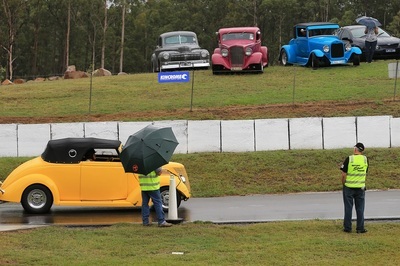 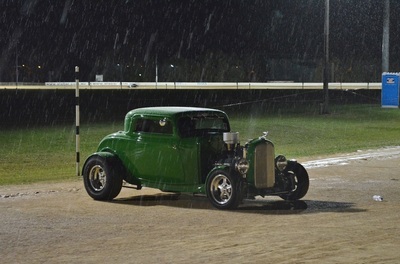 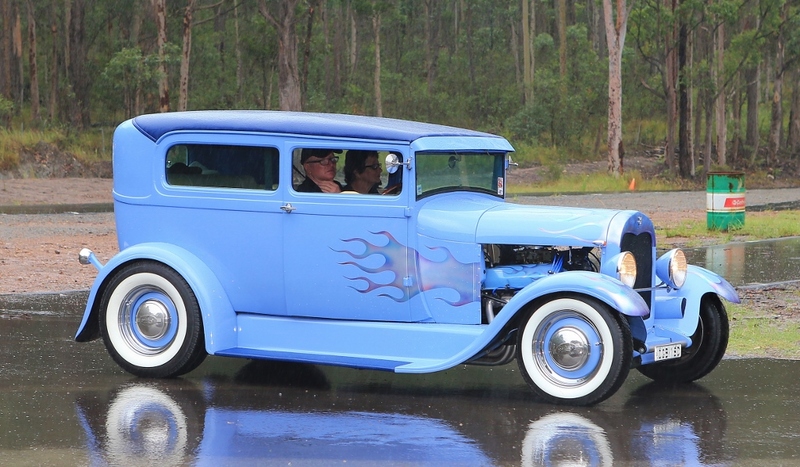 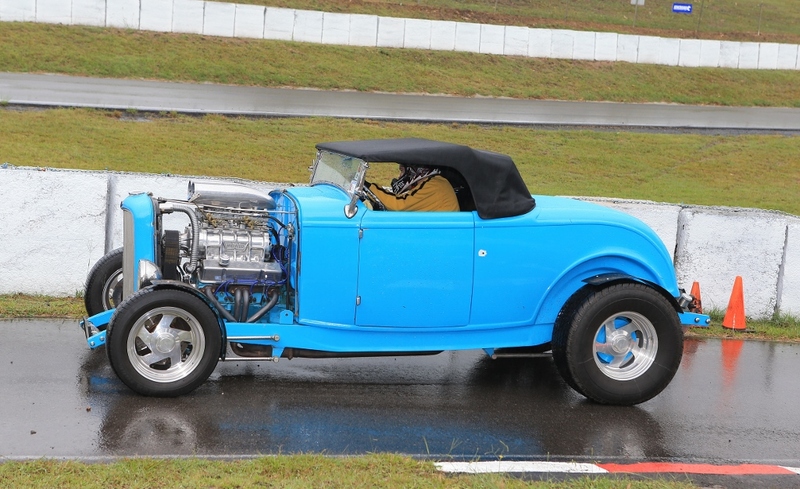 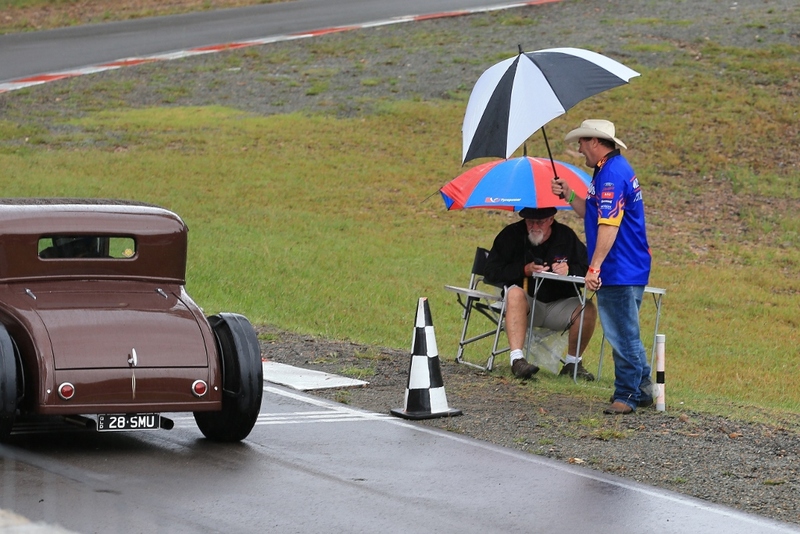 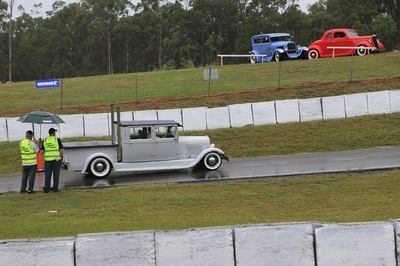 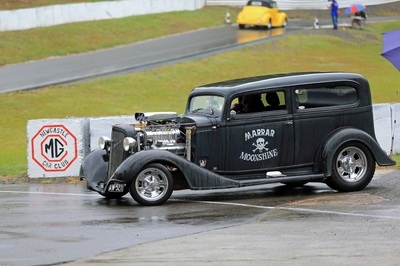 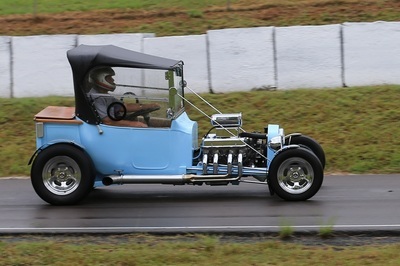 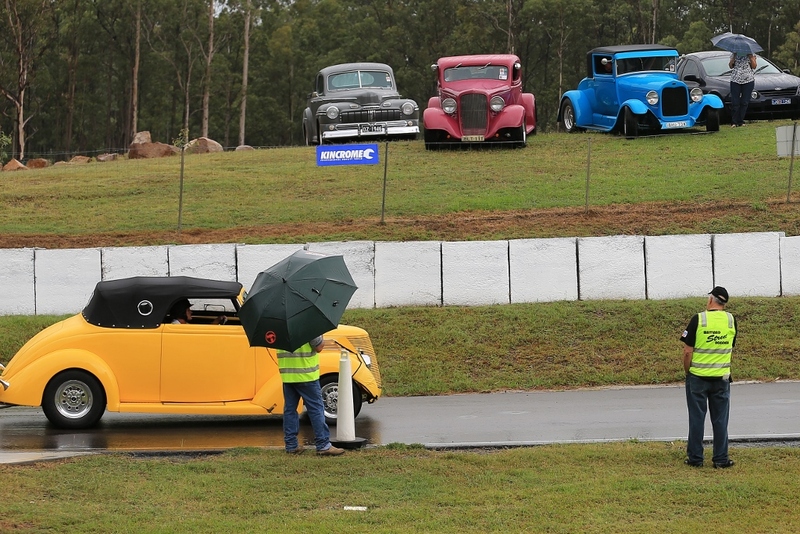 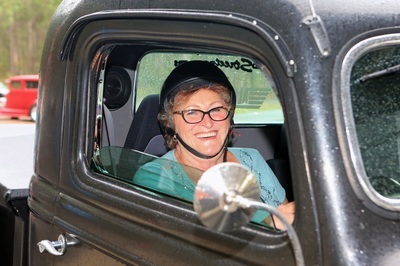 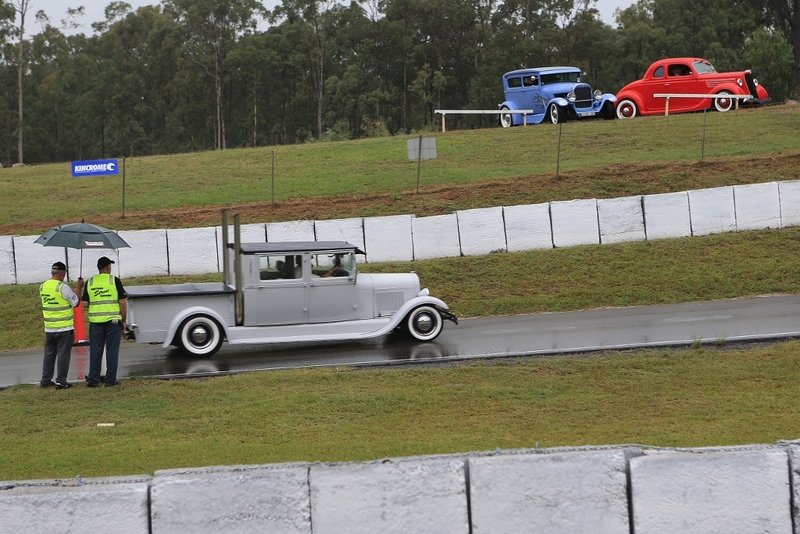 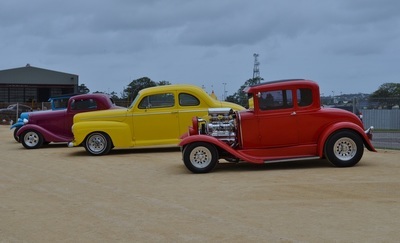 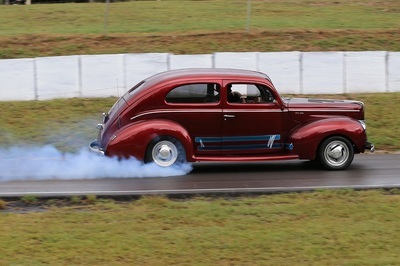 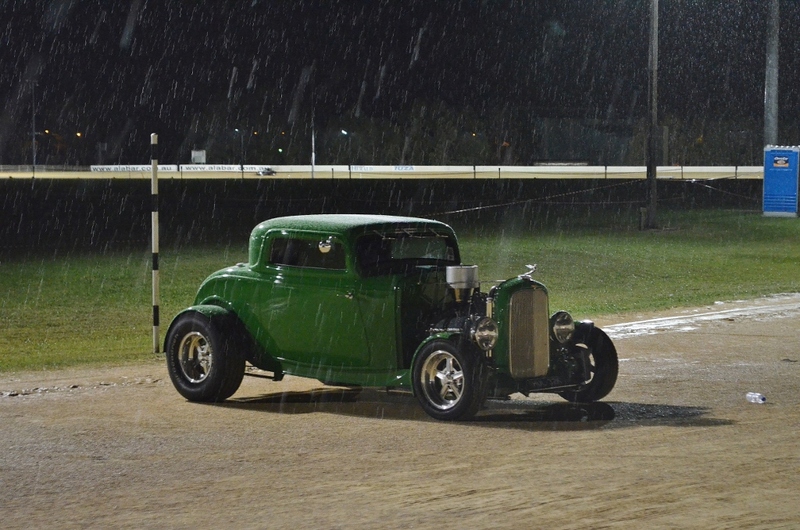 It was raining and the numbers attending the driving events were down a little allowing our members to have some fun in their rods. 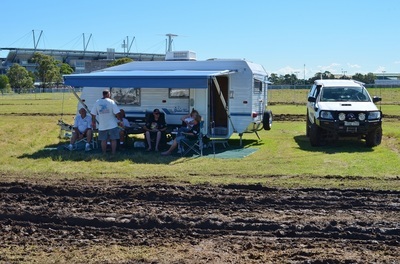 Friday night it poured with rain and it rained all day Saturday turning the camping area into a bog with only half the rods managing to get out of the park before it was closed to traffic. 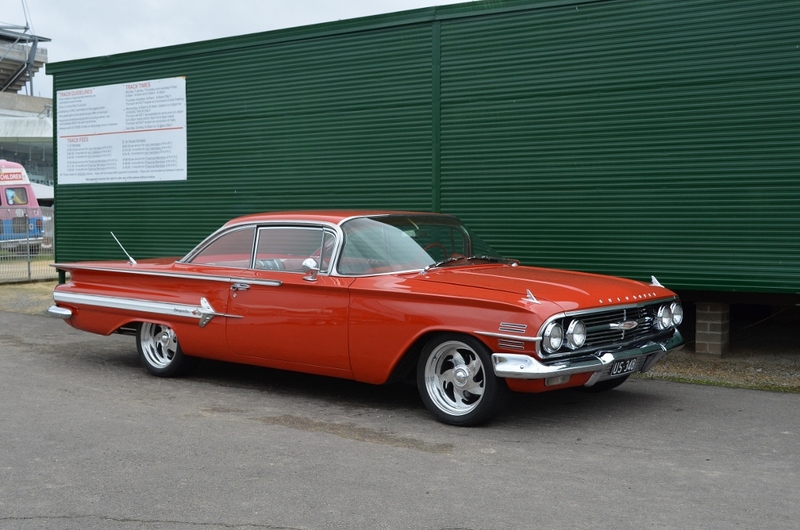 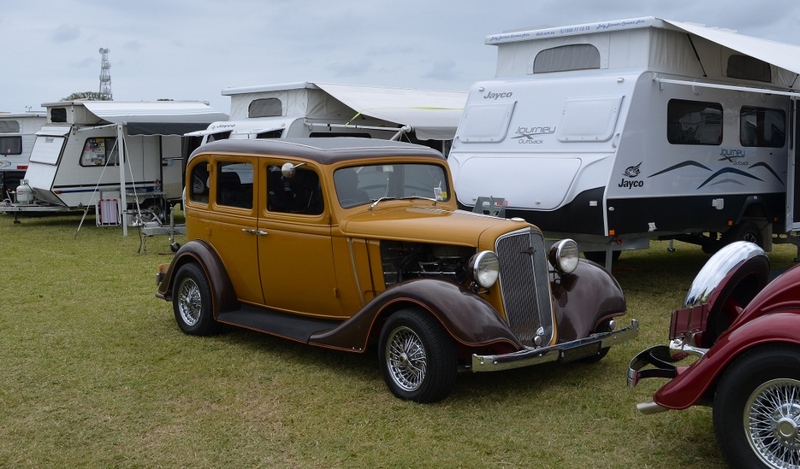 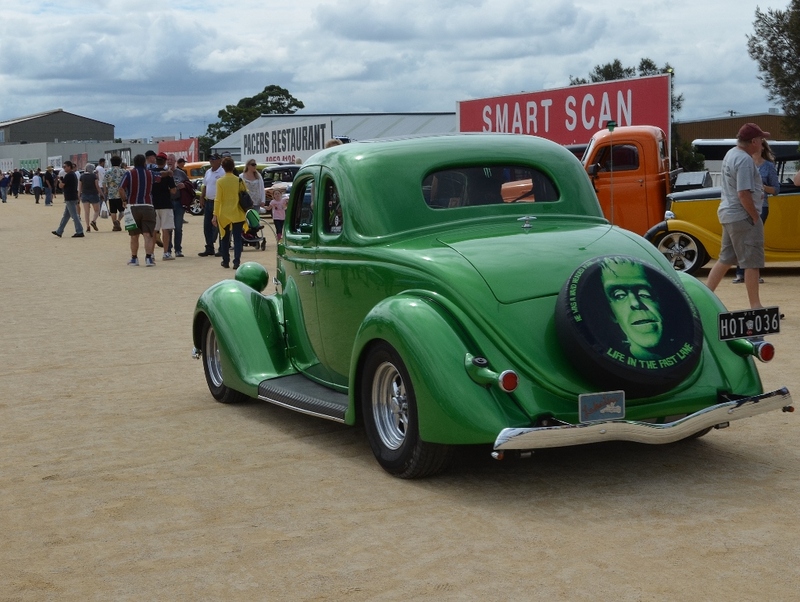 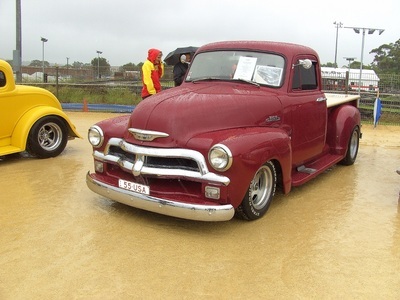 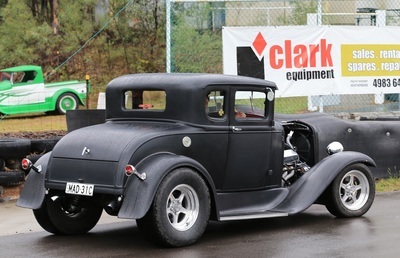 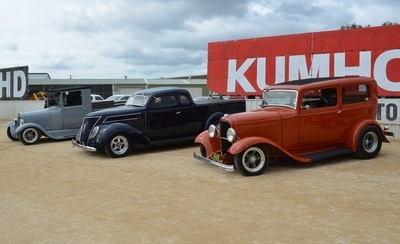 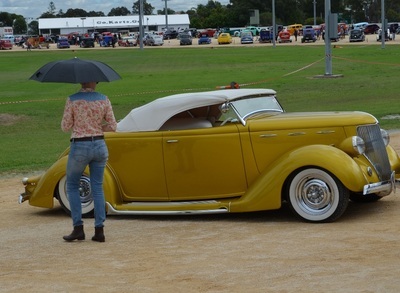 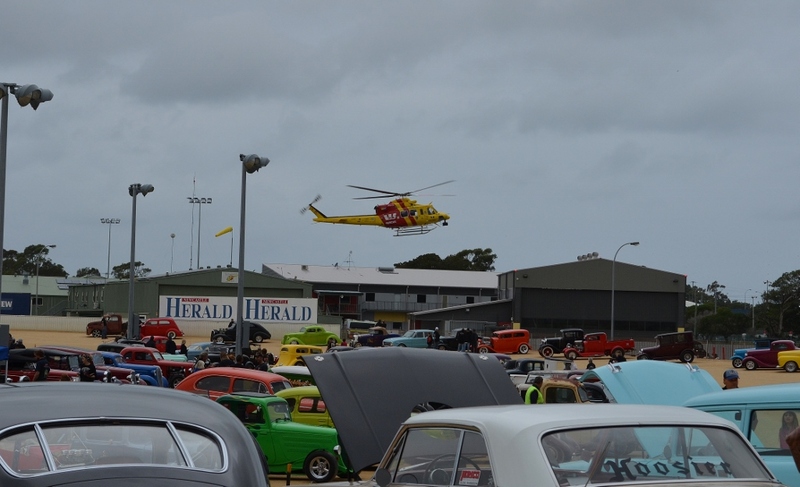 This rain caused the Show and Shine to be down on numbers and keep the public away however it was still a good day for entrants who had plenty of time to visit the 70 trade stands. 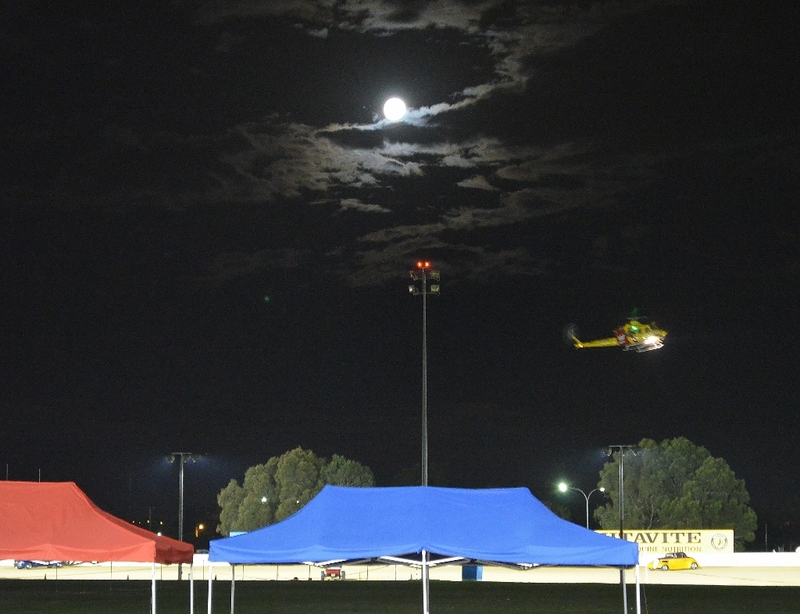 That evening the meal put on for the entrants was terrific and the band kept all entertained until late into the evening. 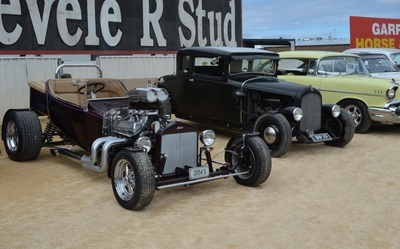 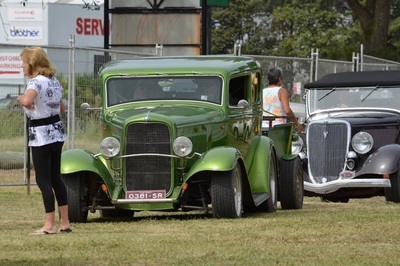 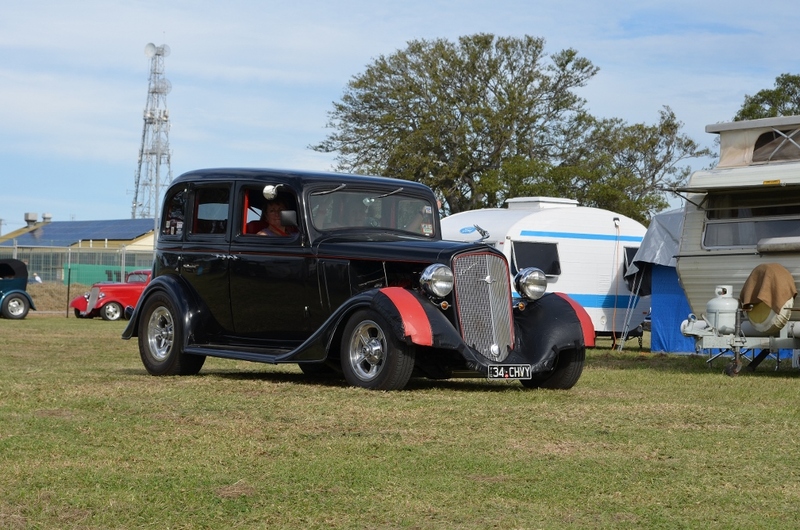 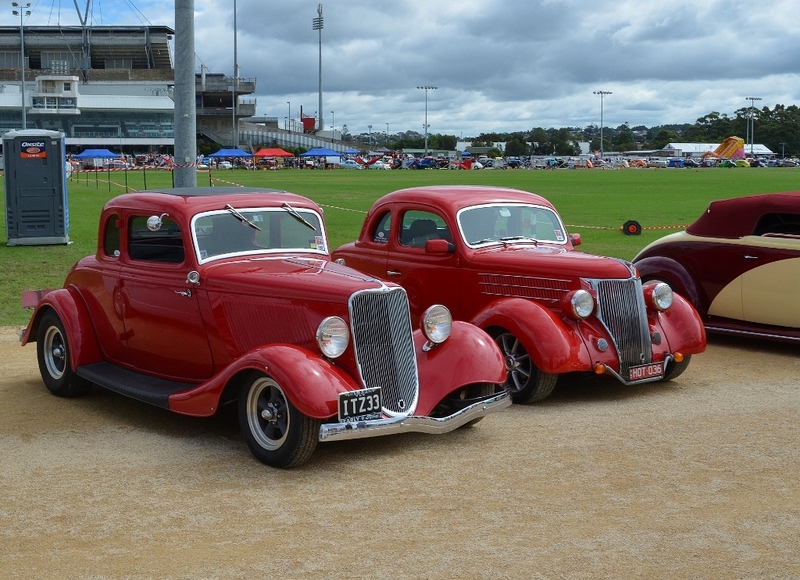 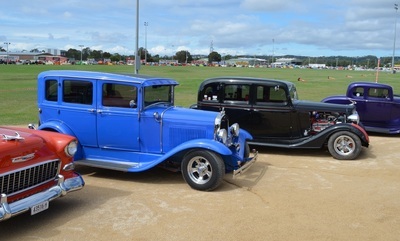 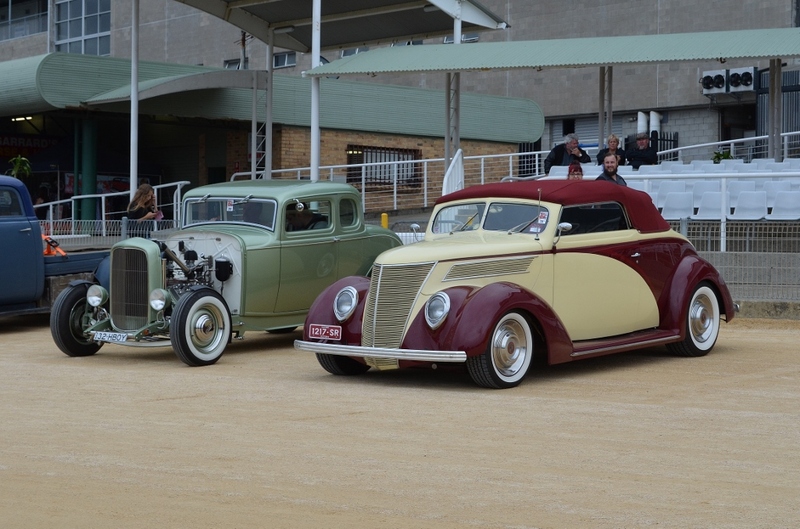 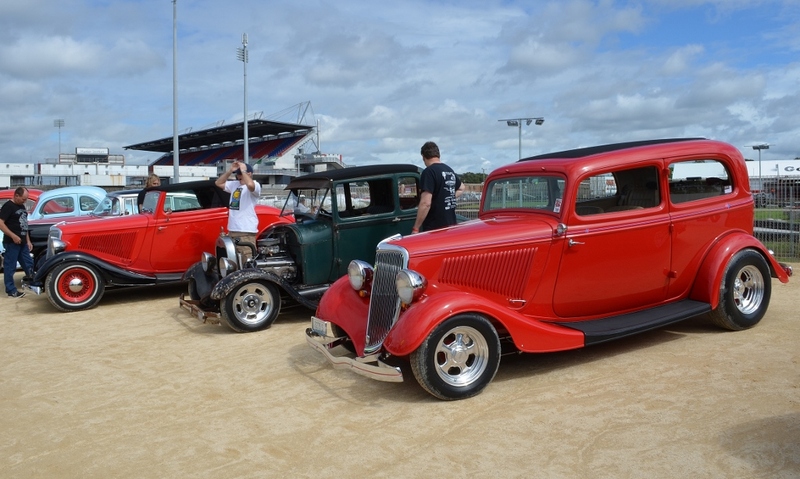 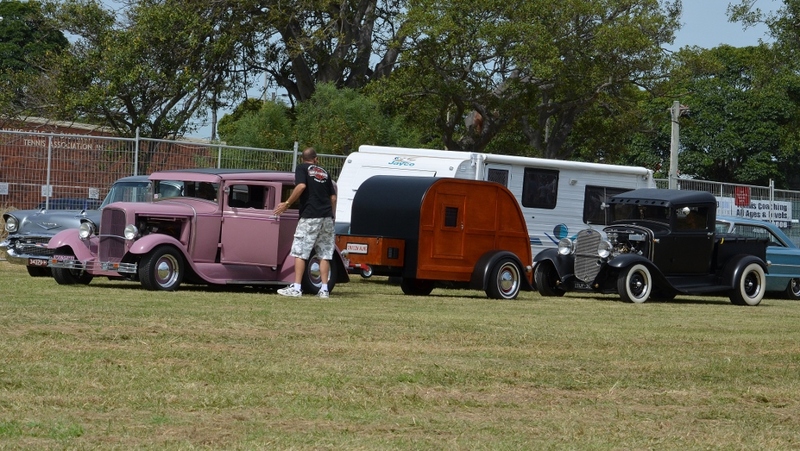 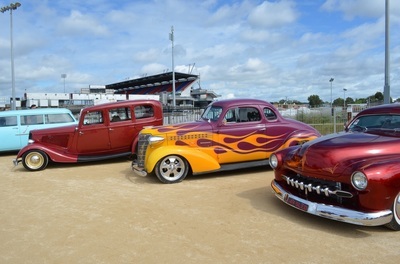 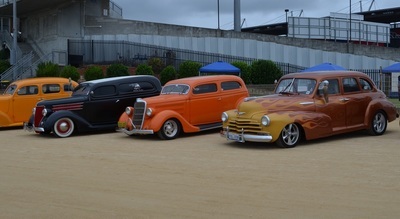 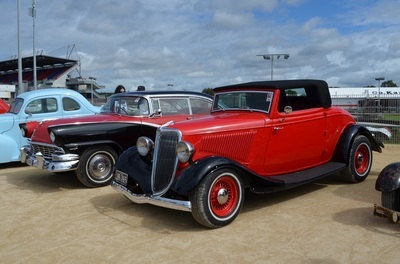 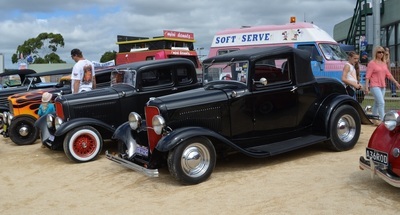 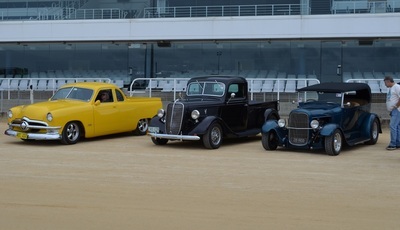 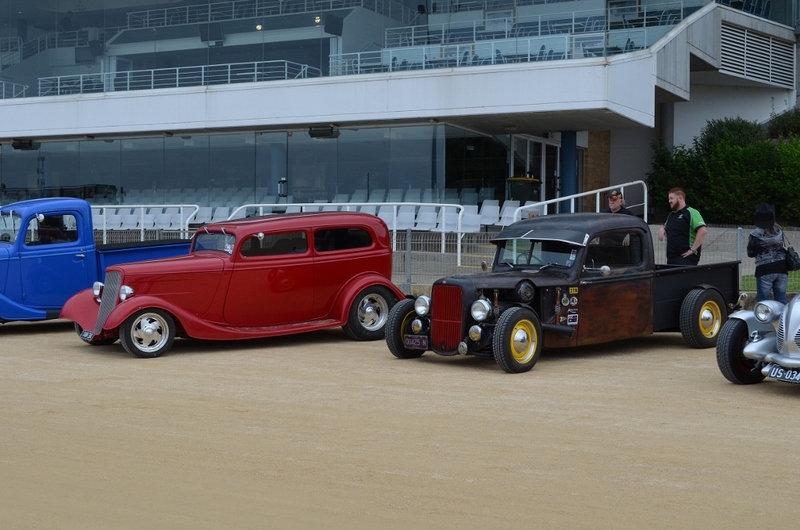 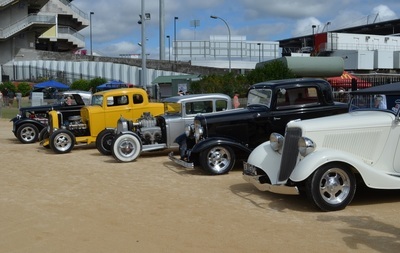 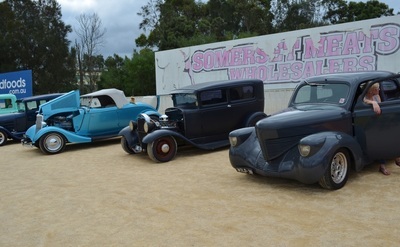 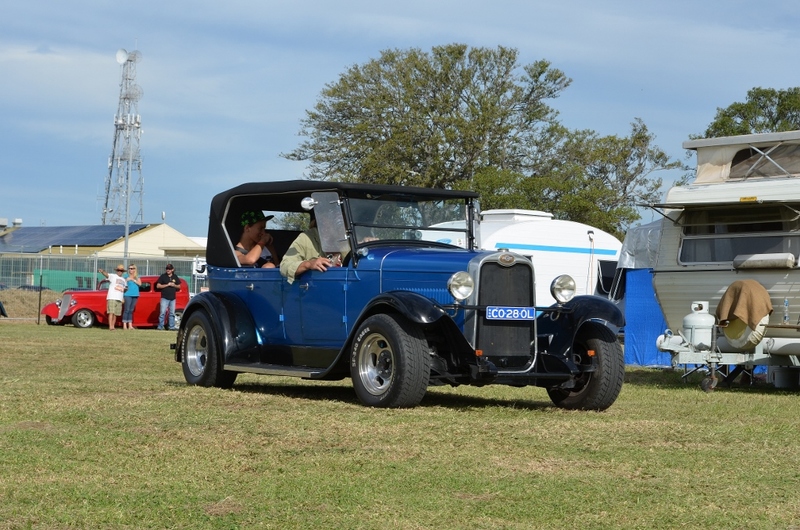 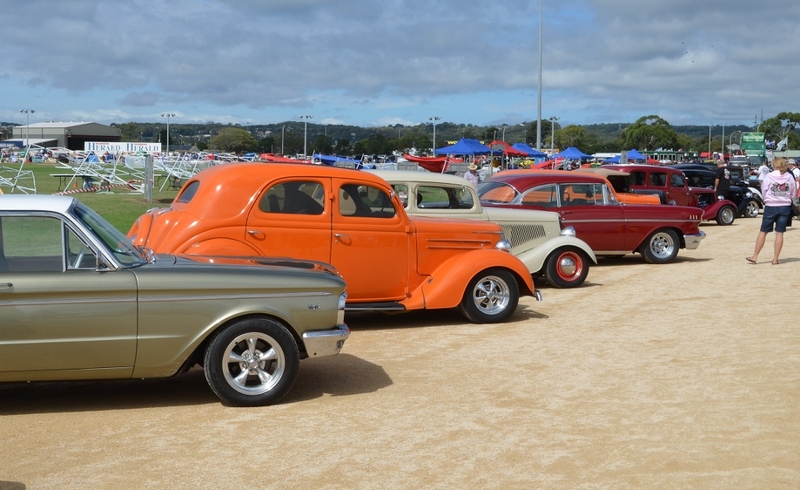 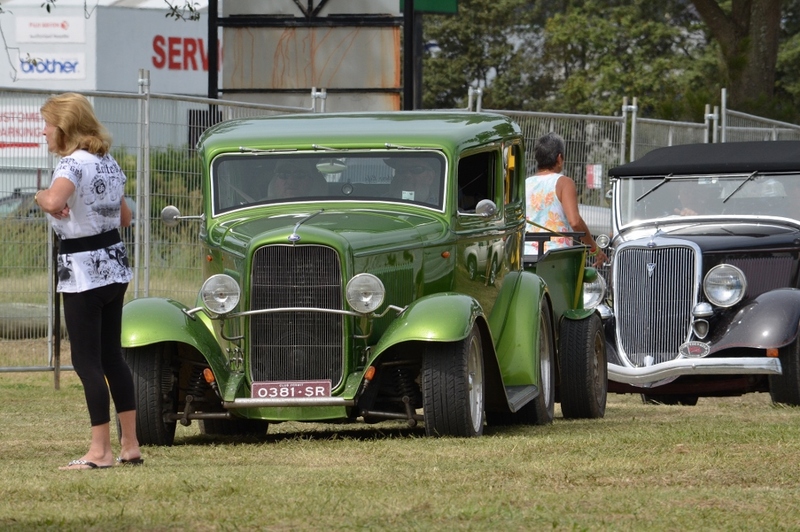 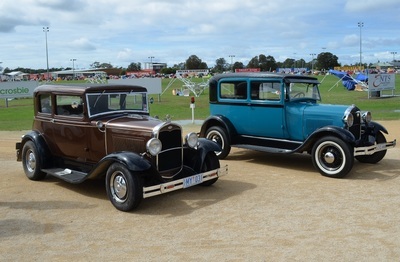 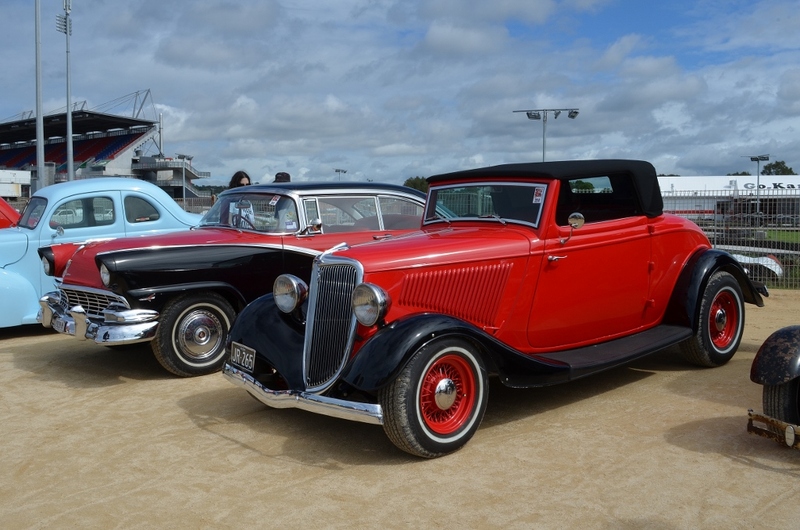 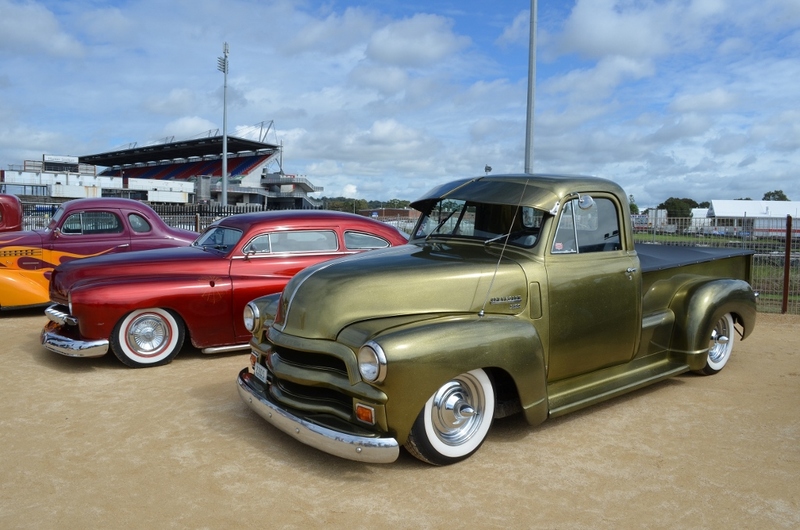 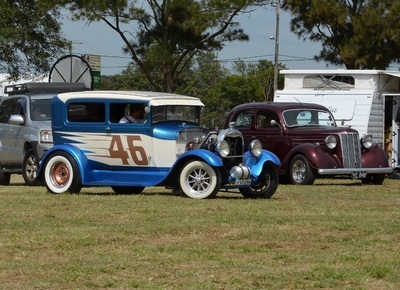 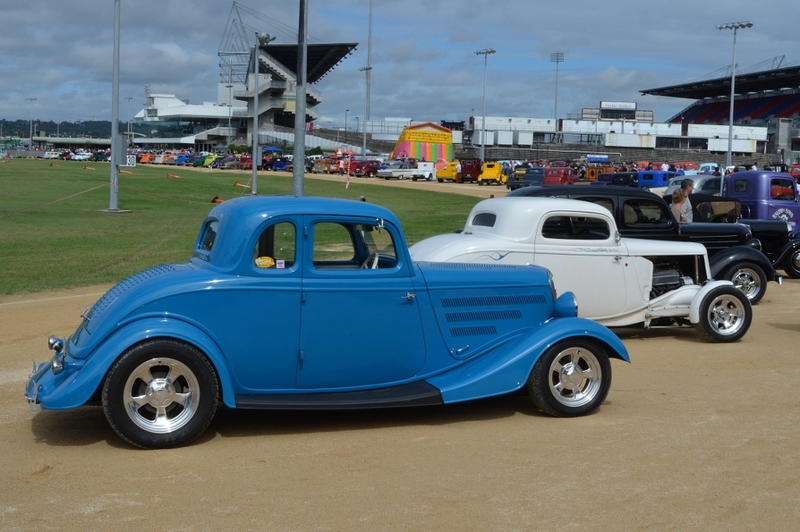 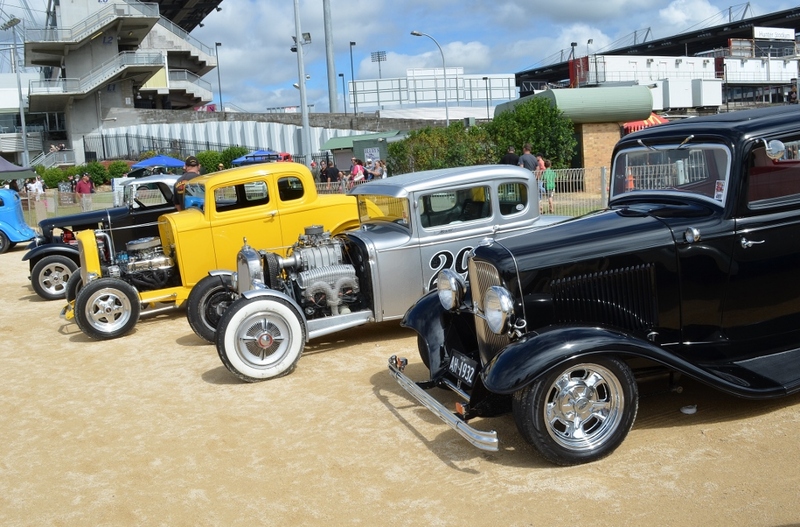 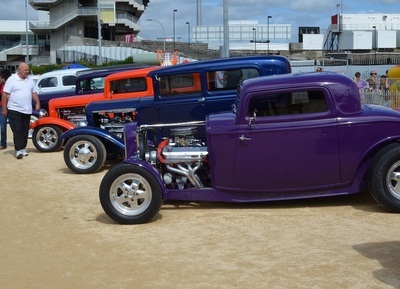 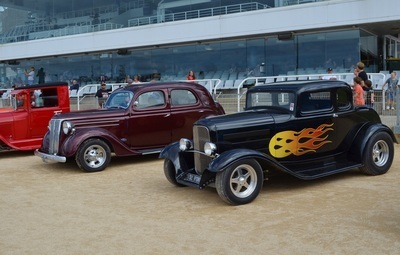 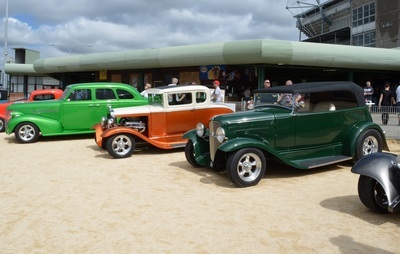 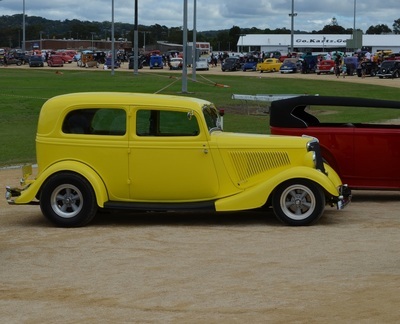 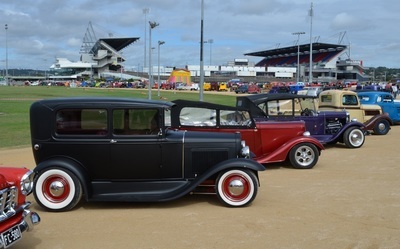 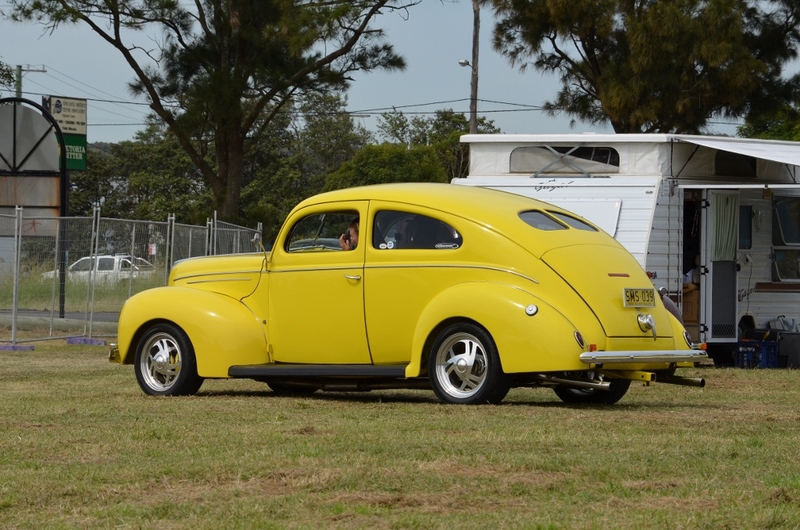 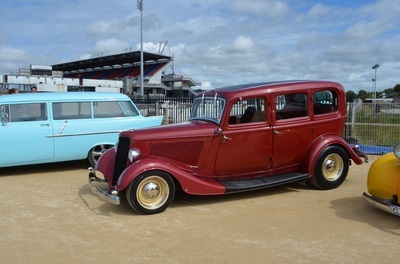 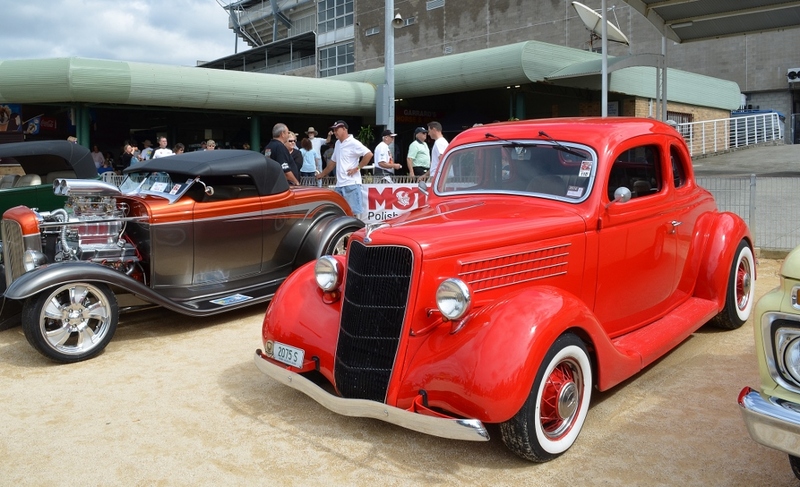 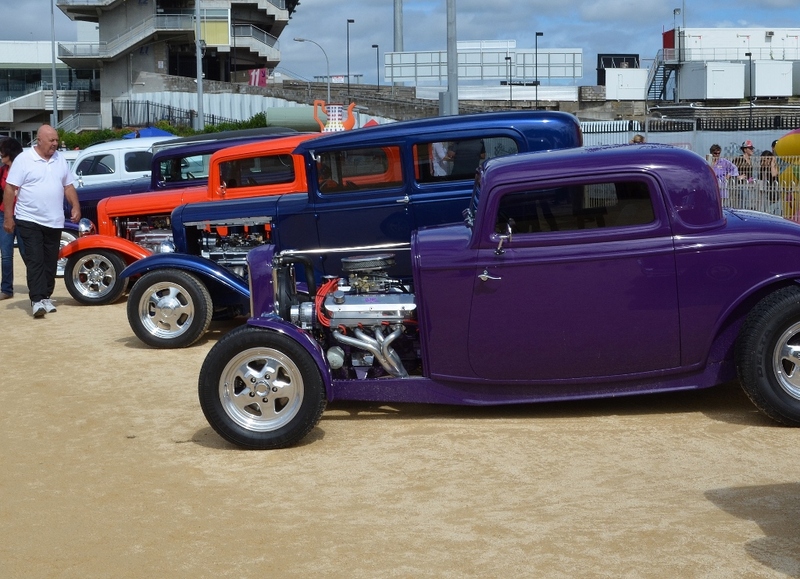 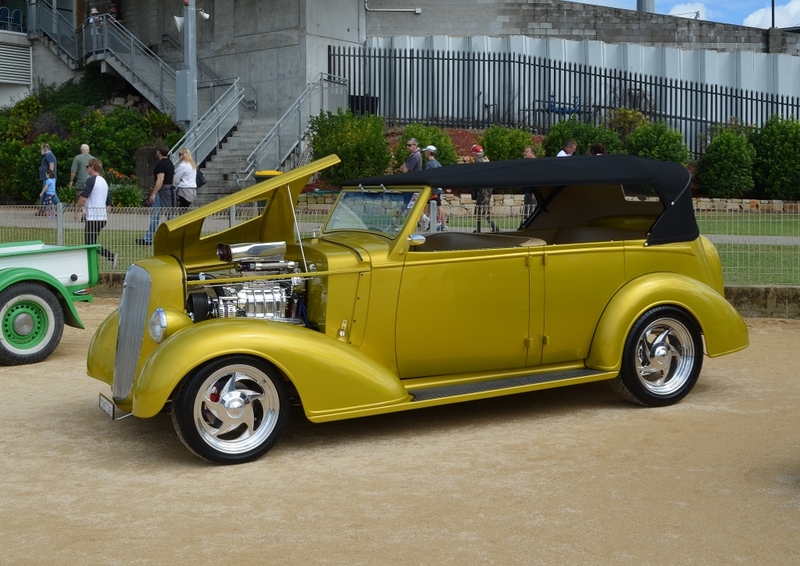 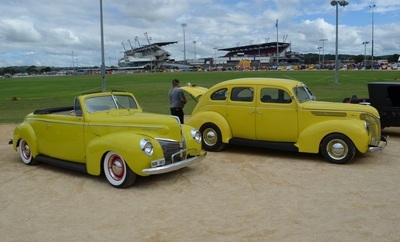 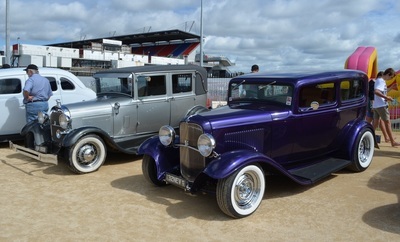 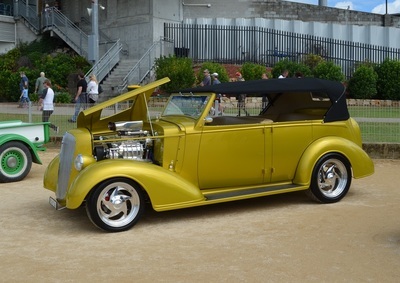 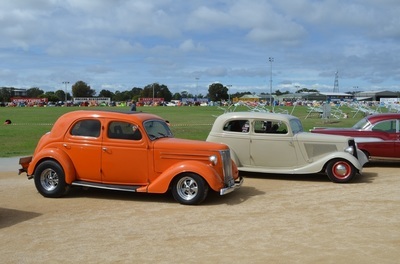 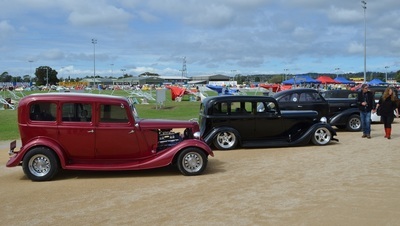 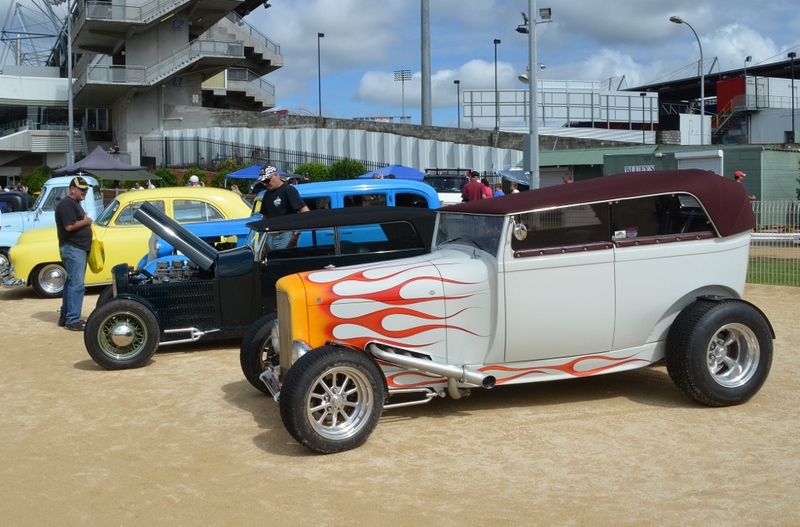 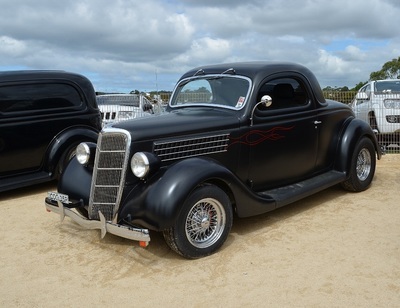 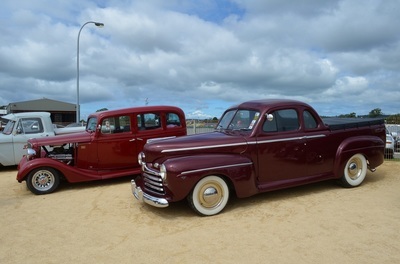 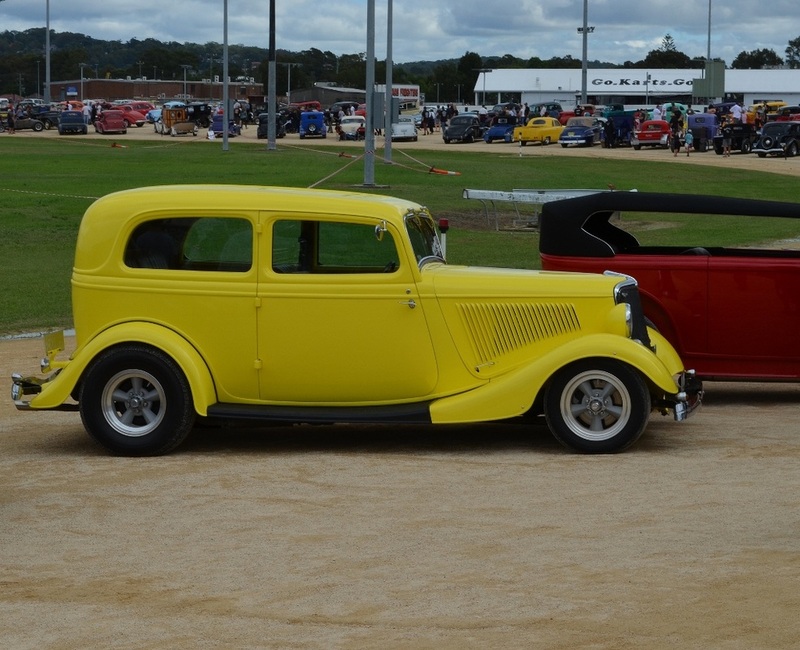 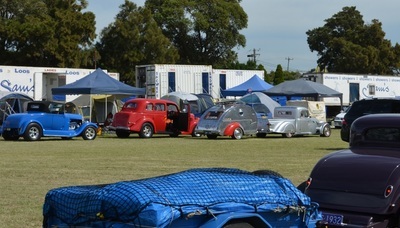 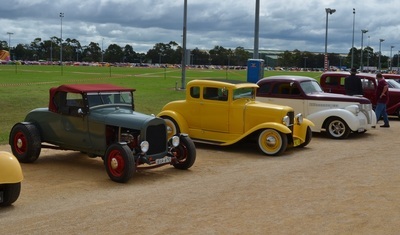 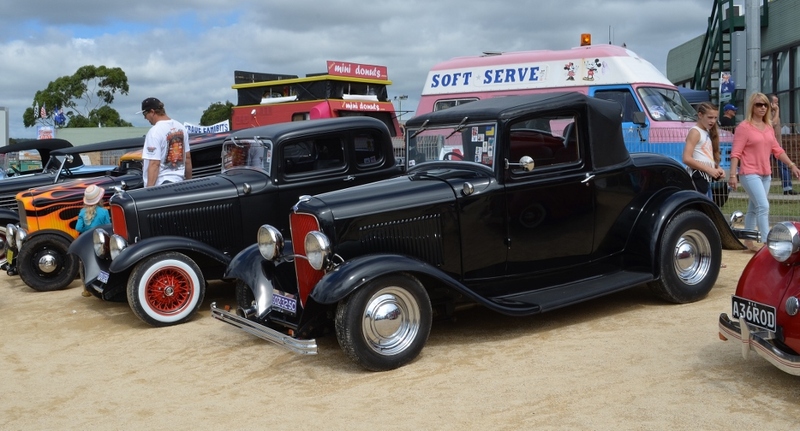 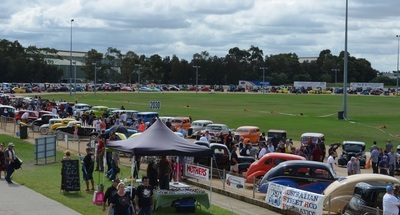 On Sunday the sun came out, the rods showed up and so did the public. 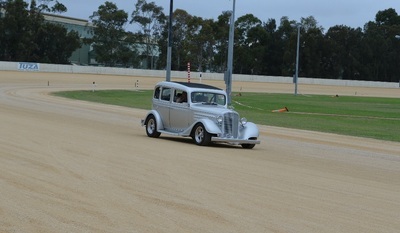 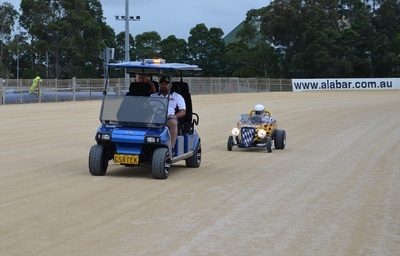 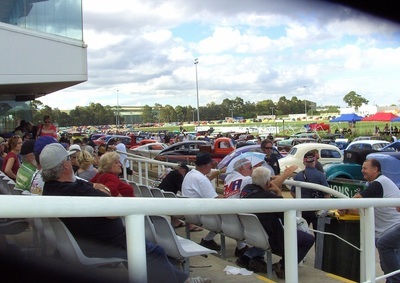 What a great day the trotting track looked a picture and everyone should have had a fantastic time. I was on the gate late in the afternoon and as the pubic left they all congratulated and thanked us for putting on a great show. 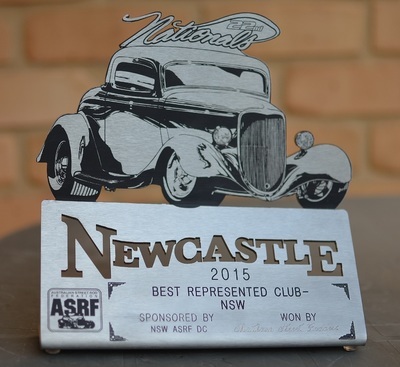 As for Maitland Street Rodders not only did the members come out in force to help run the event we also took out the Best Represented NSW Club trophy which in Noel's words is "mind blowing" and something we are very proud of. 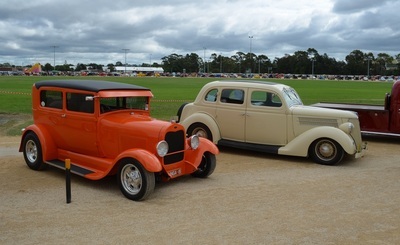 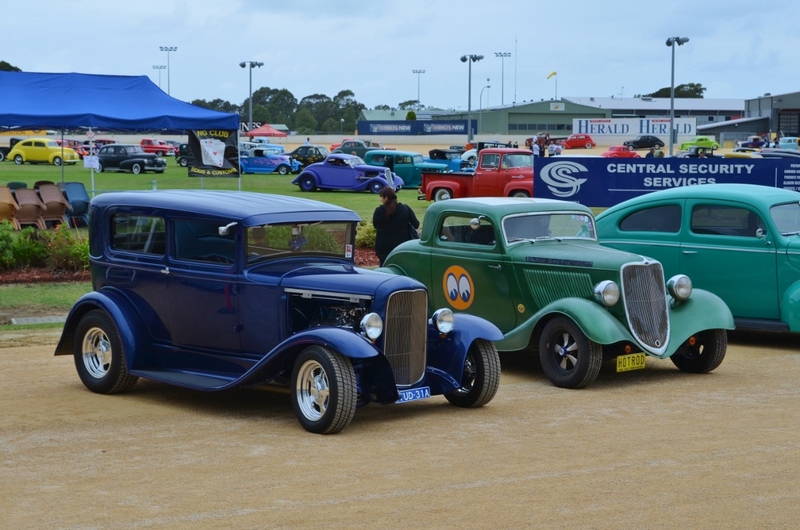 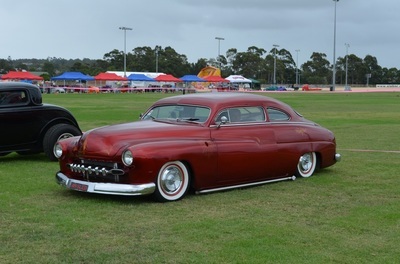 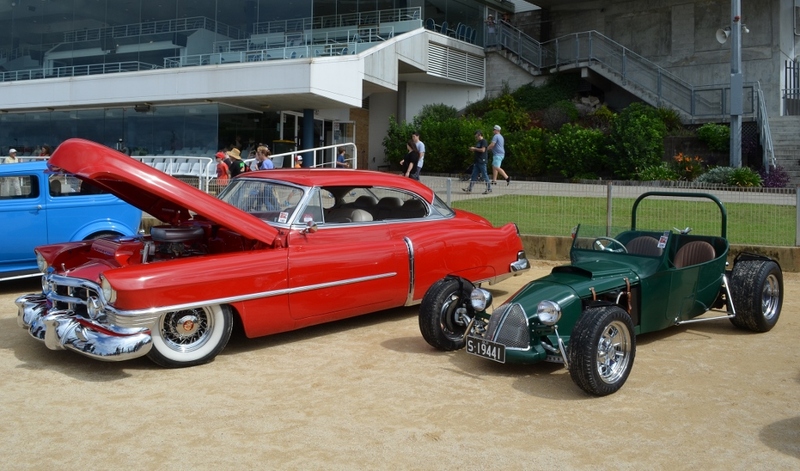 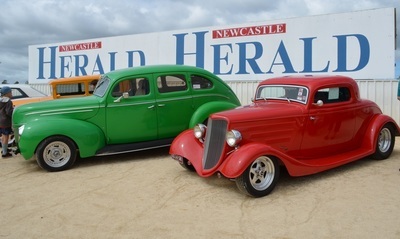 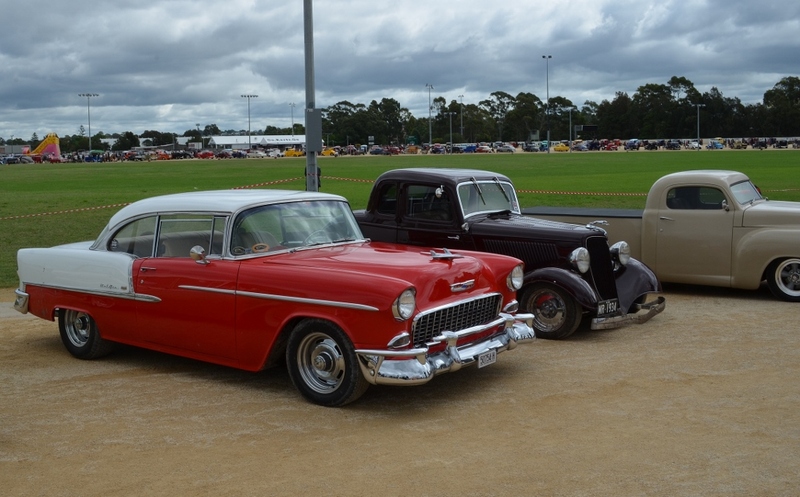 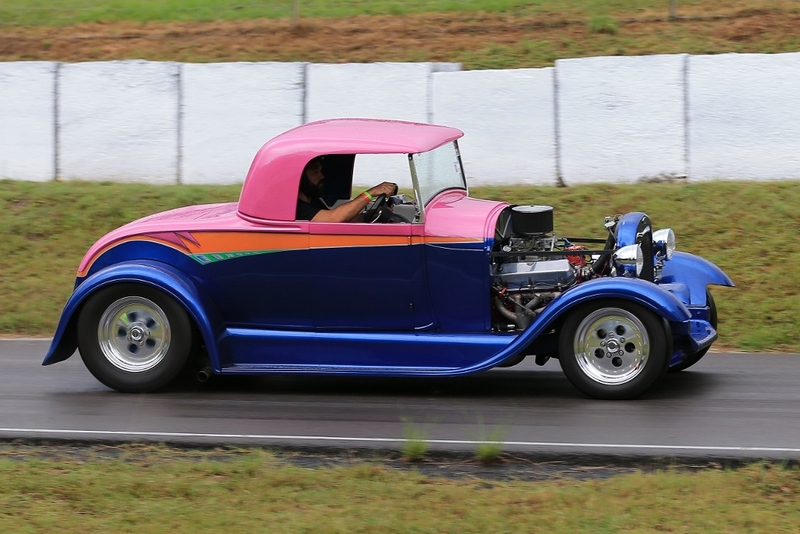 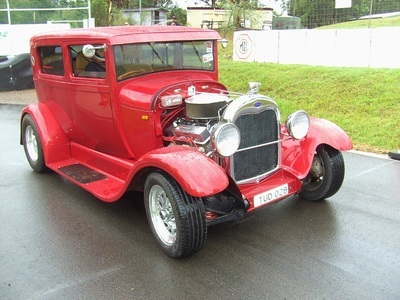 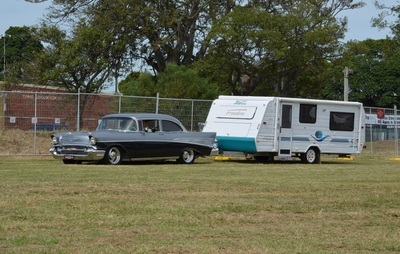 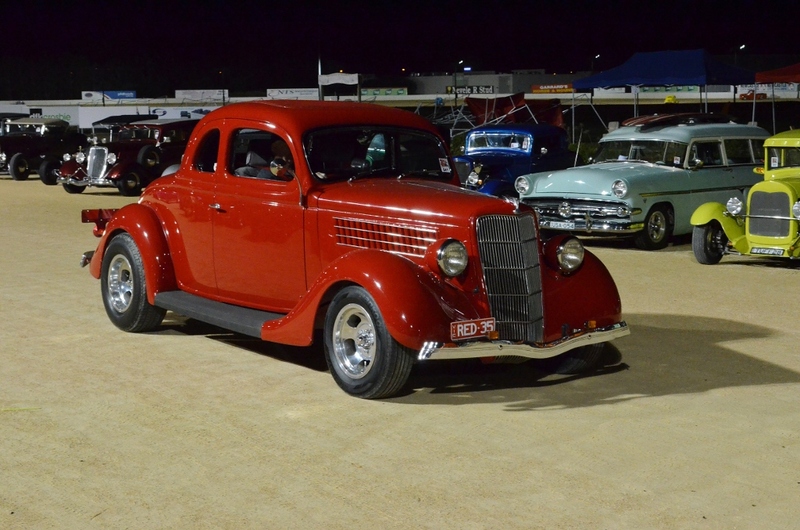 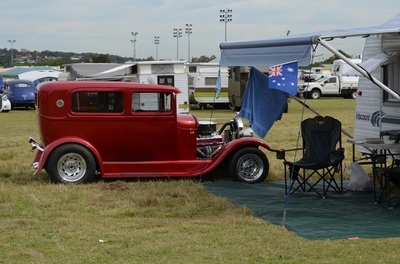 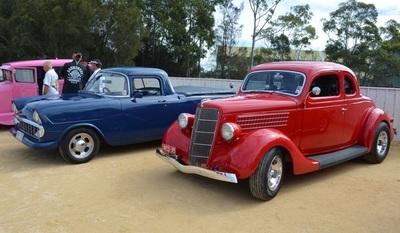 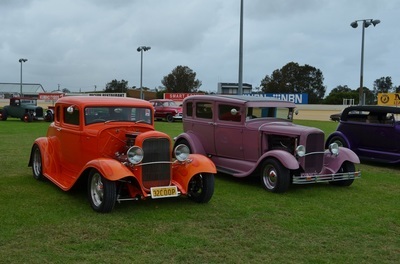 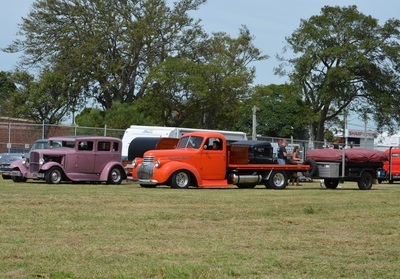 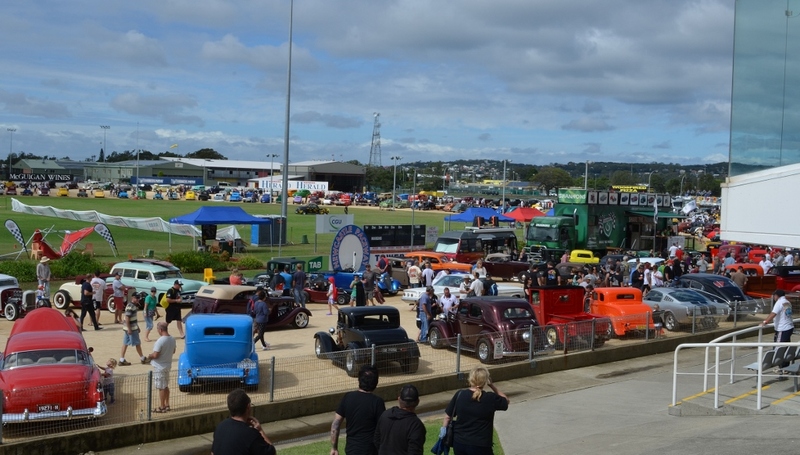 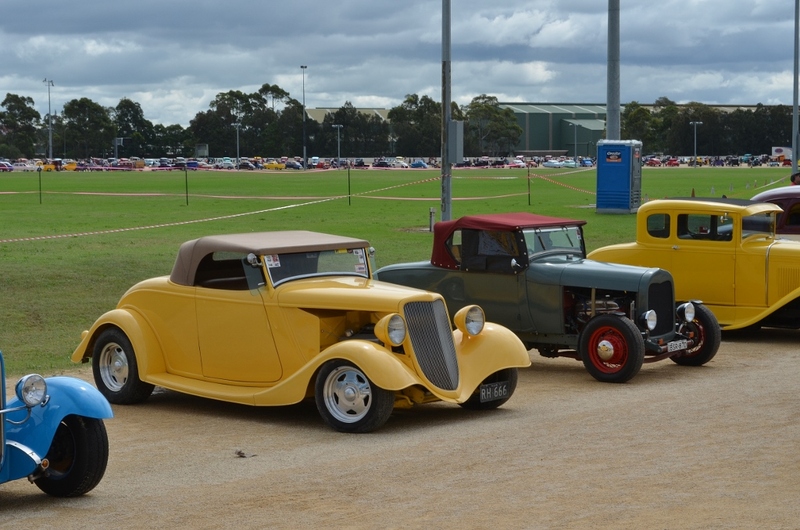 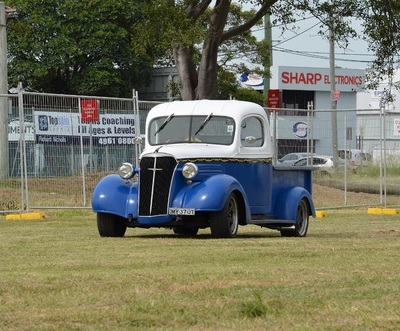 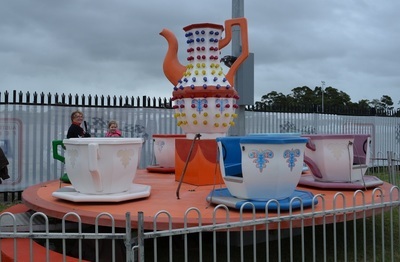 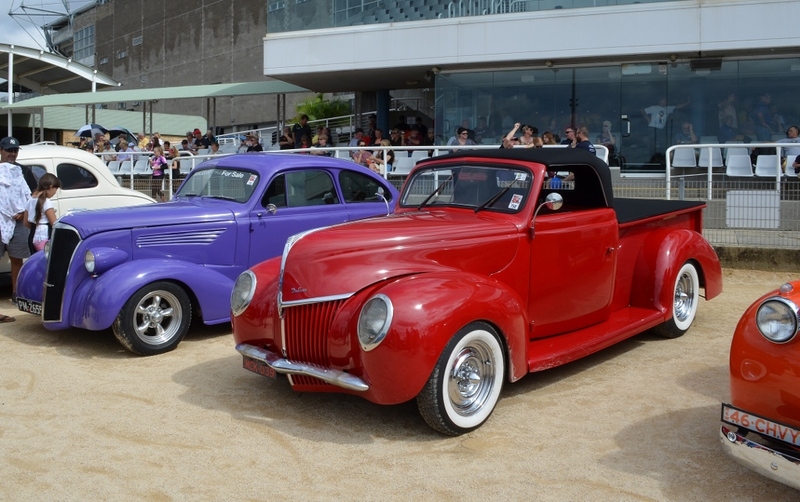 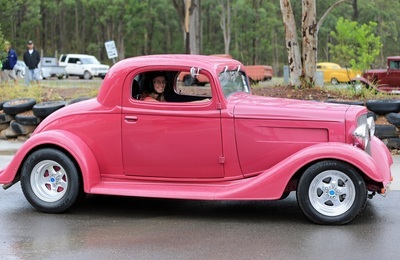 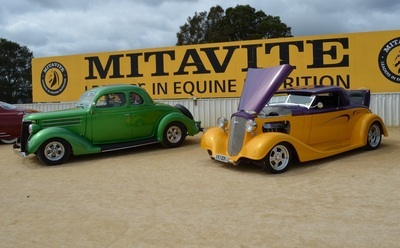 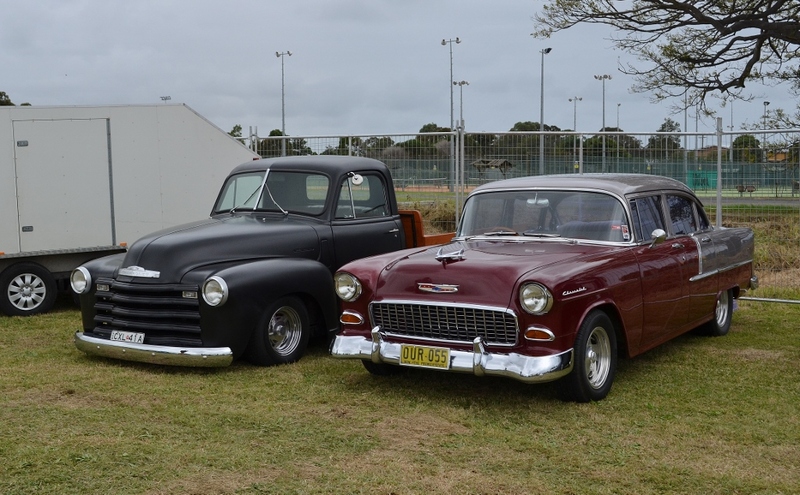 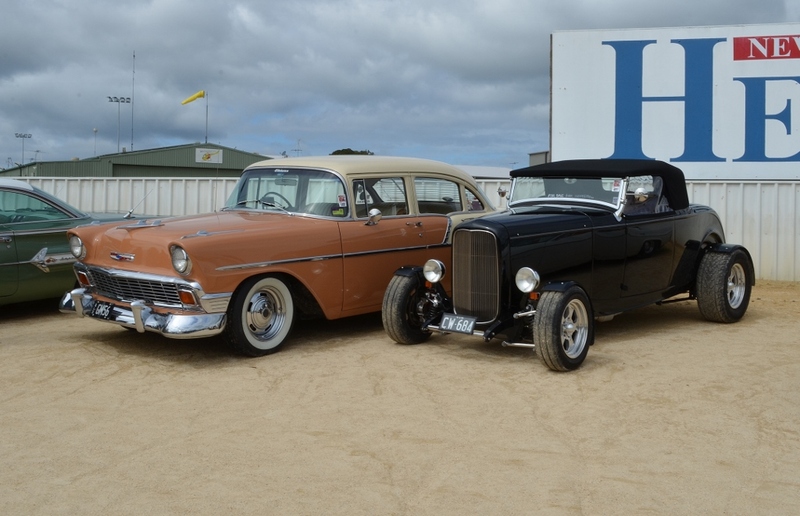 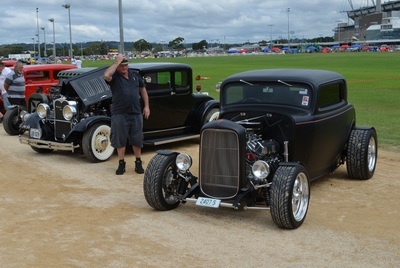 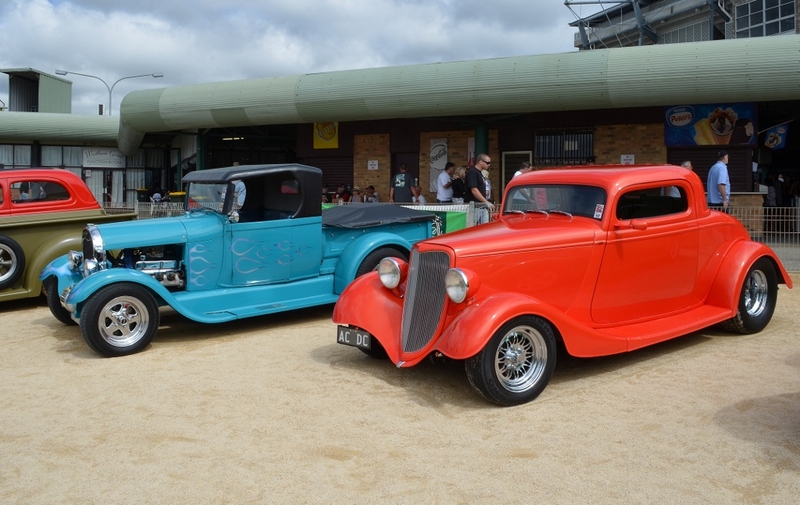 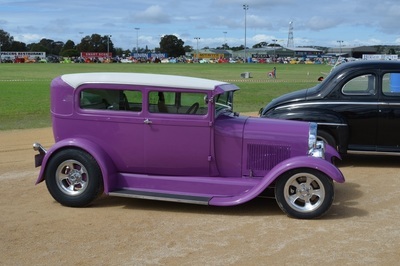 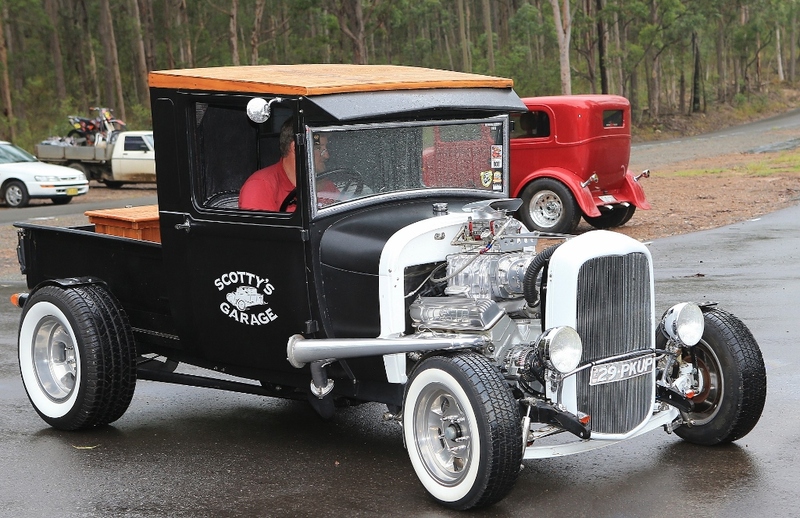 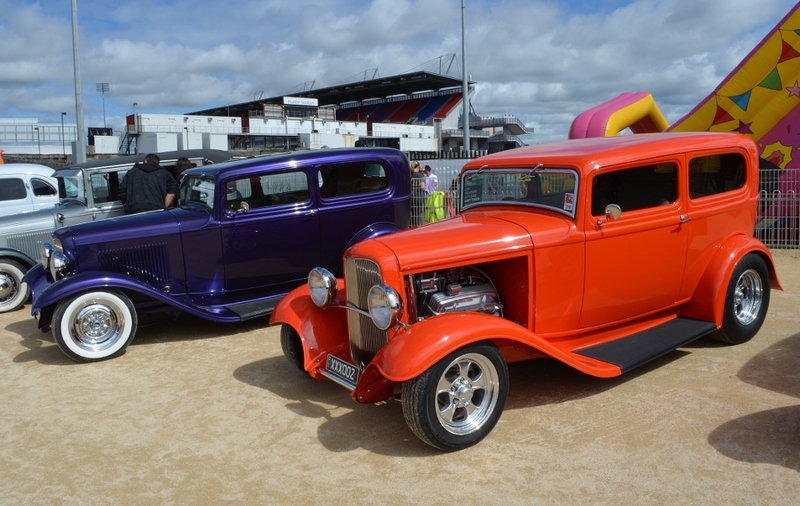 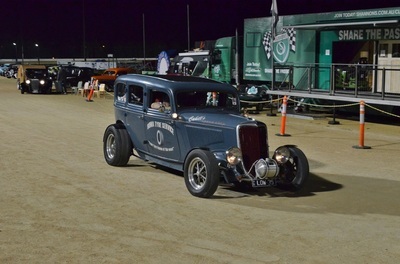 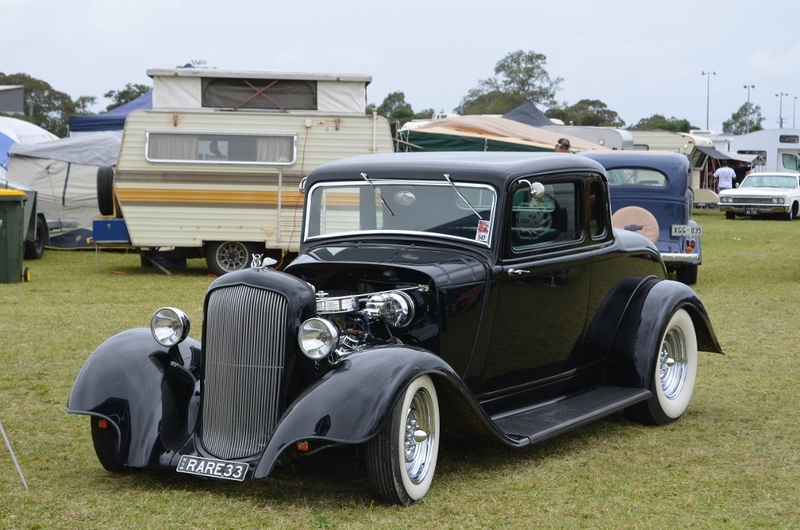 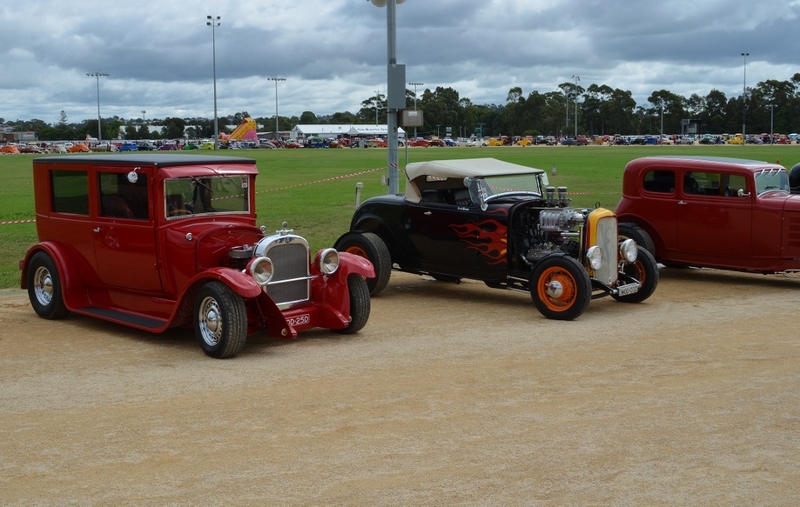 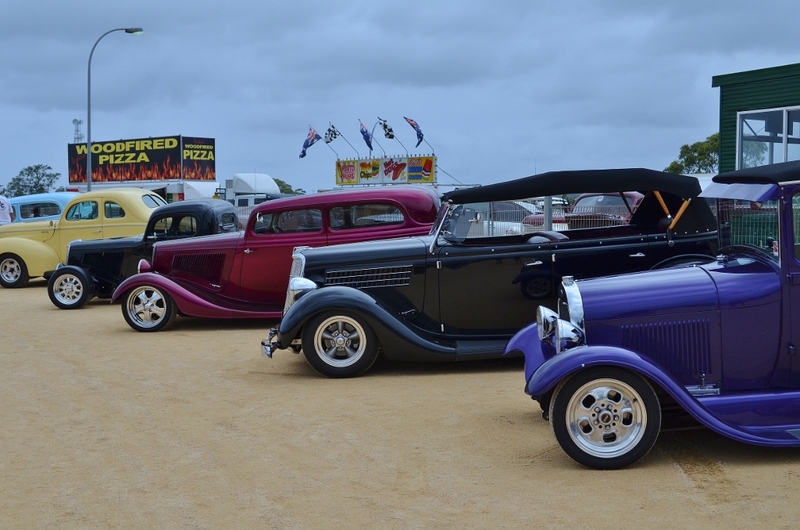 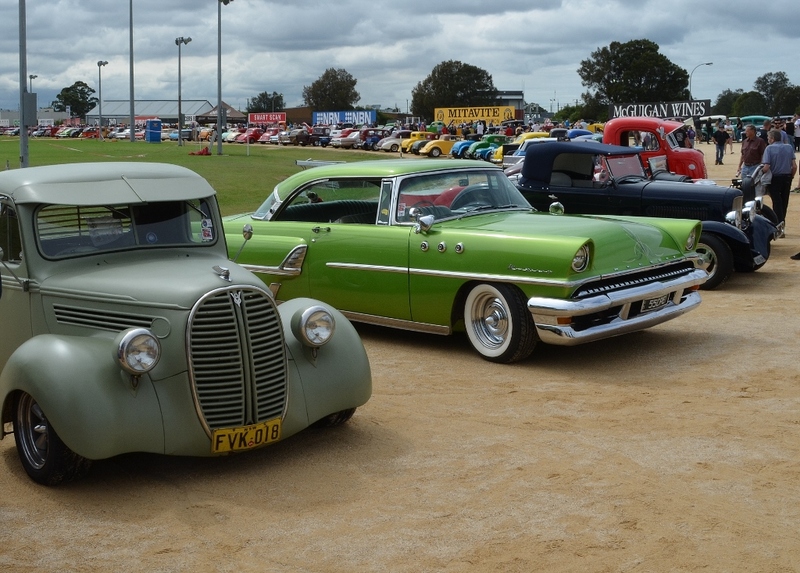 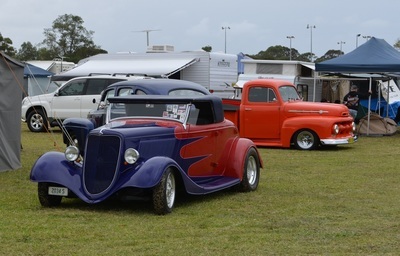 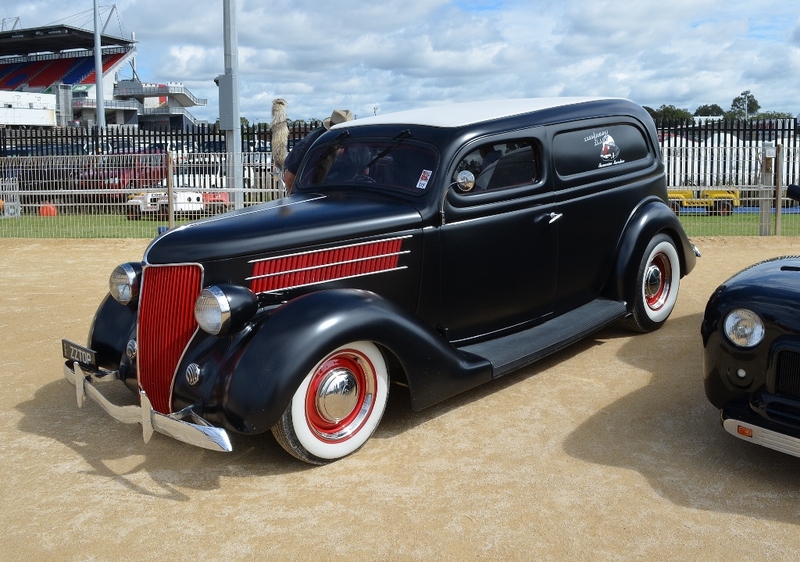 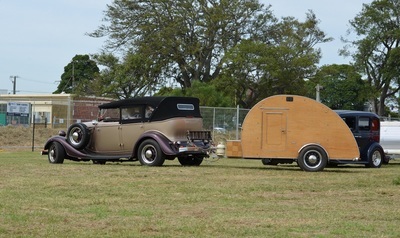 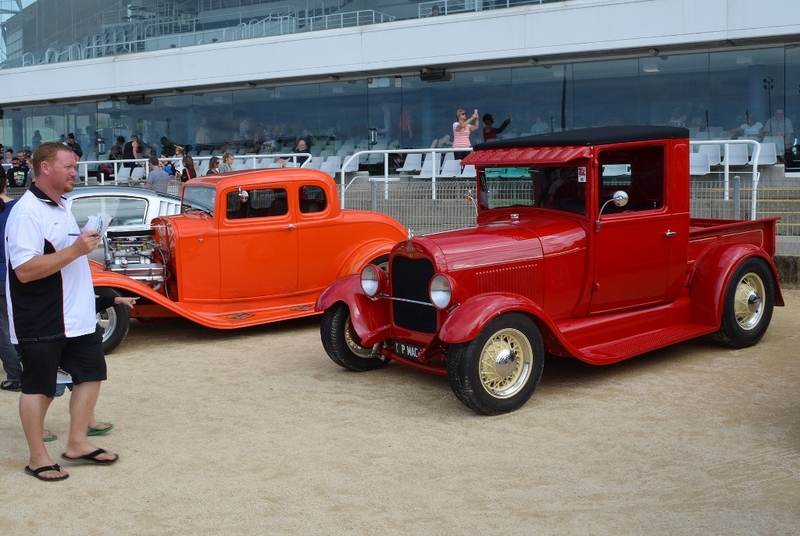 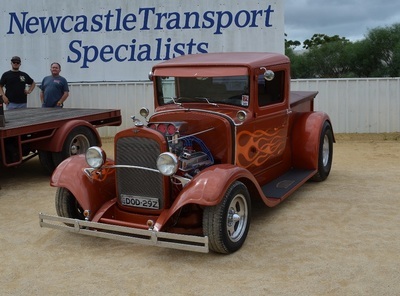 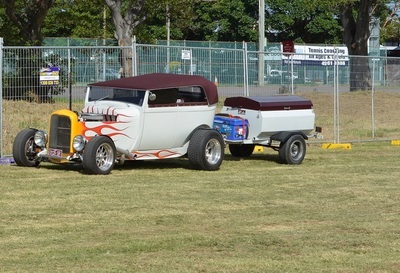 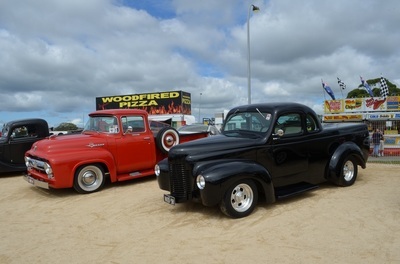 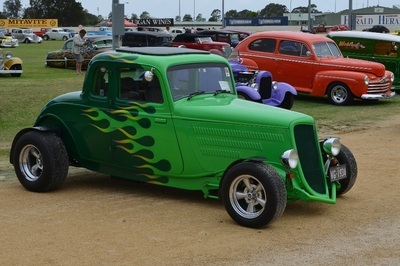 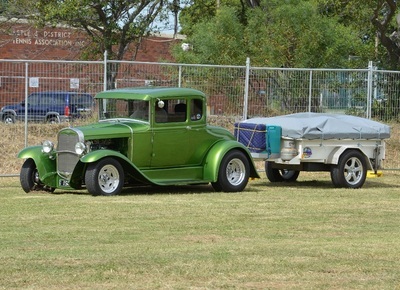 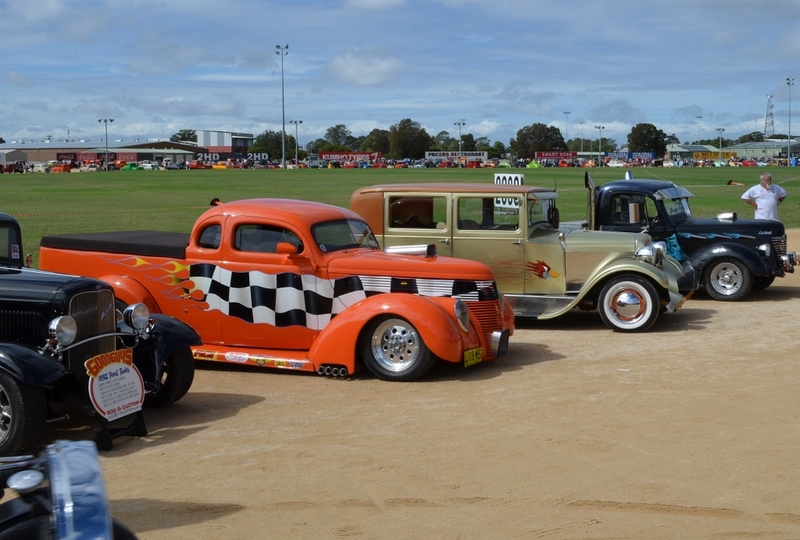 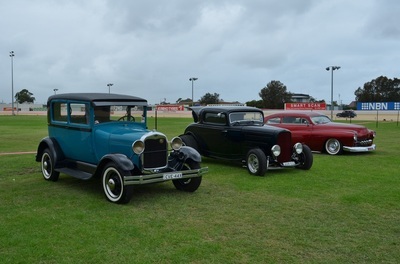 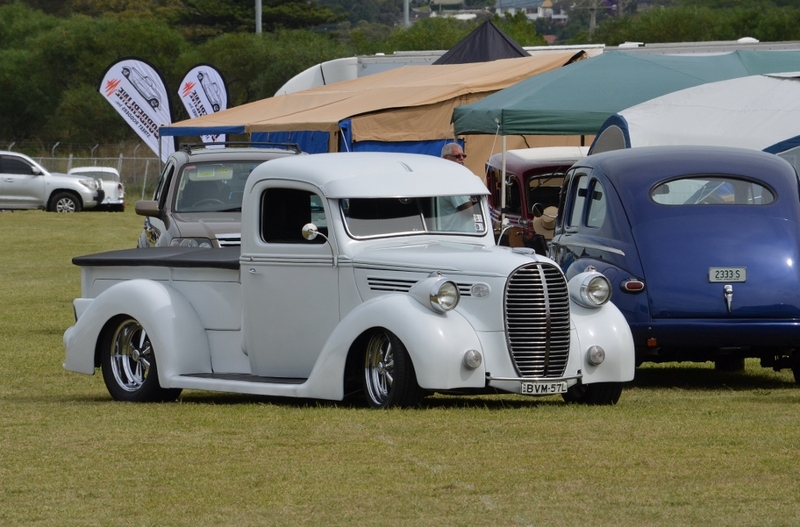 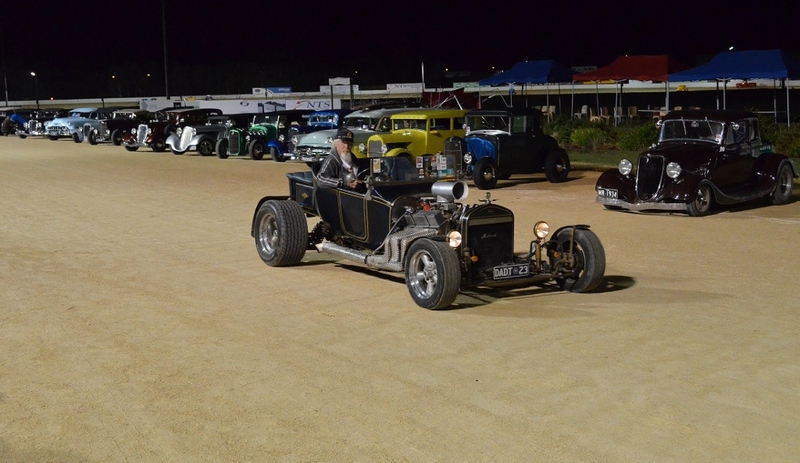 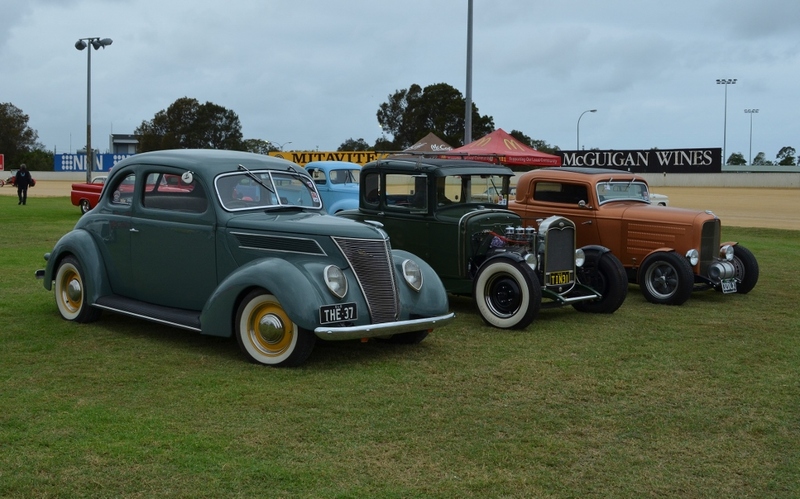 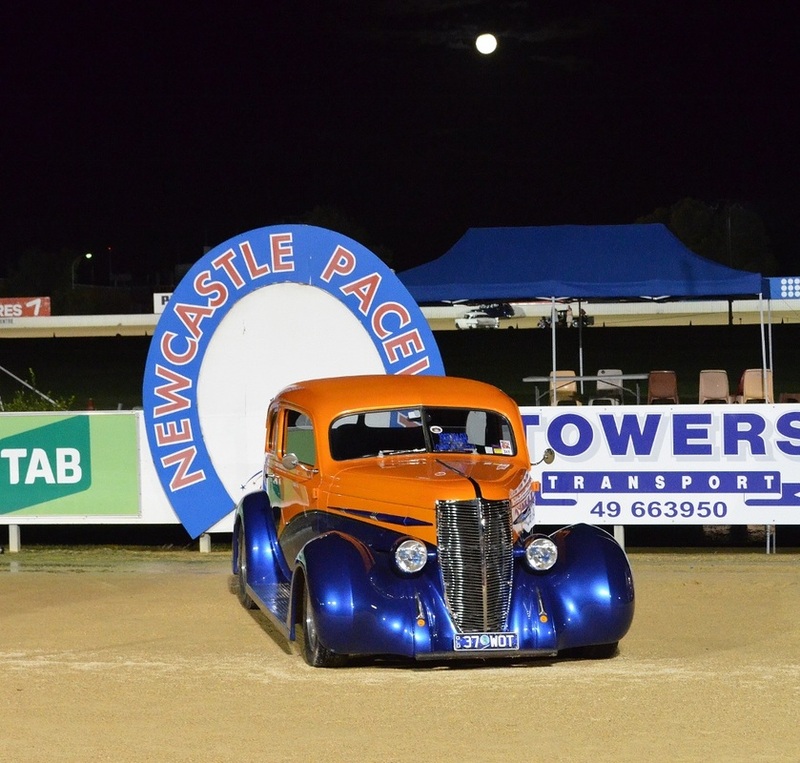 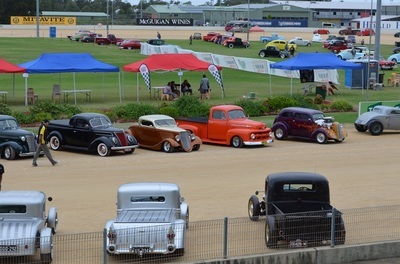 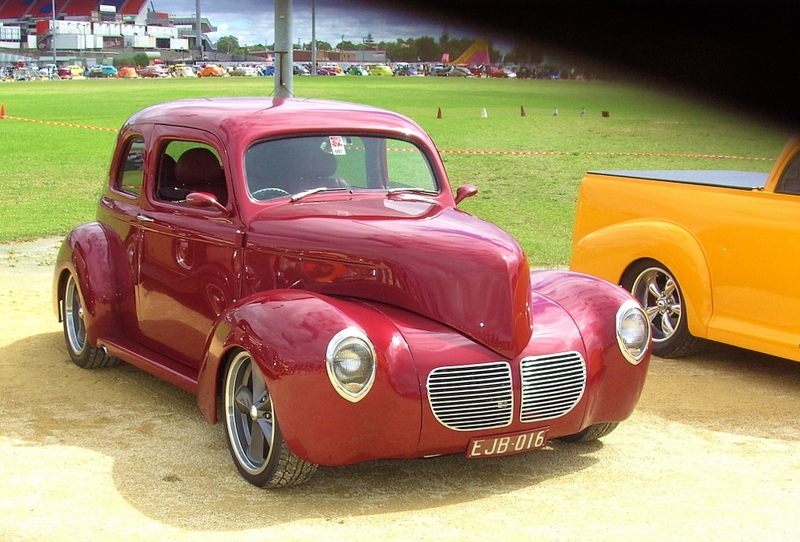 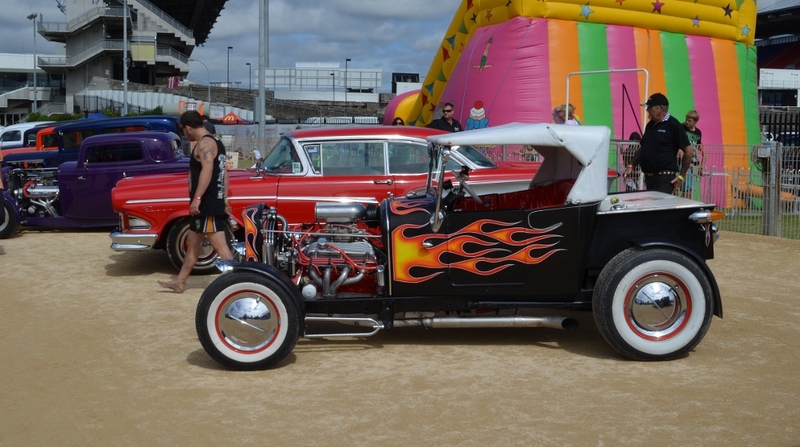 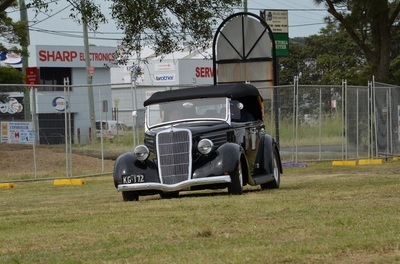 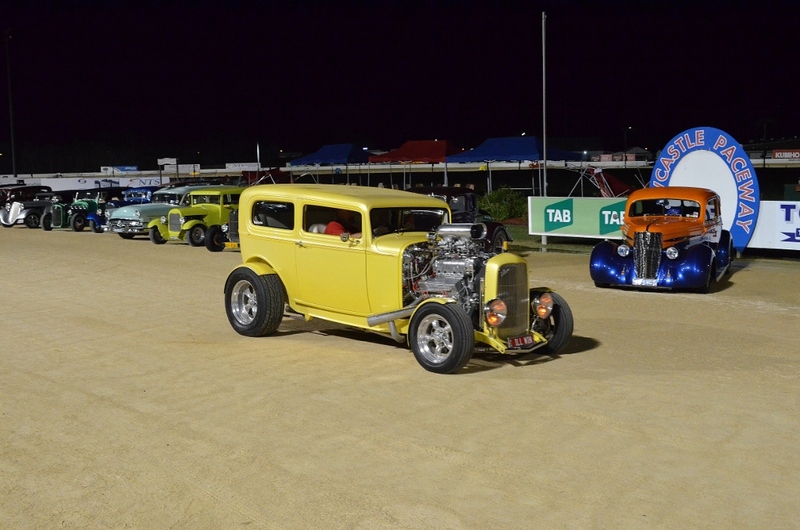 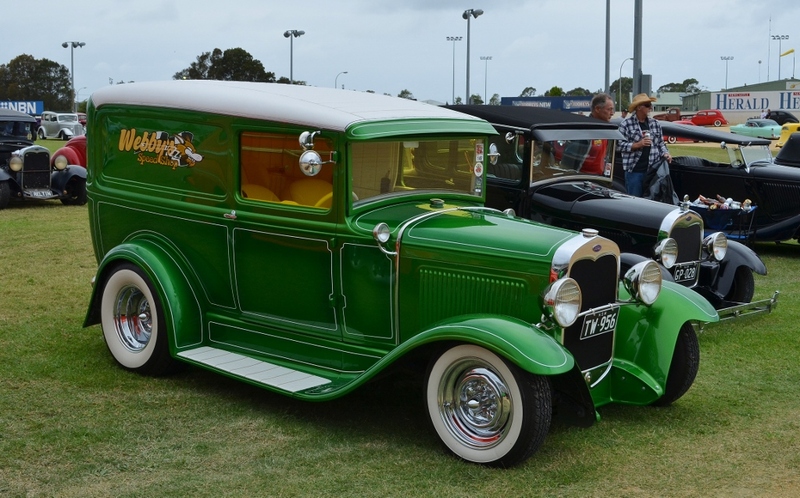 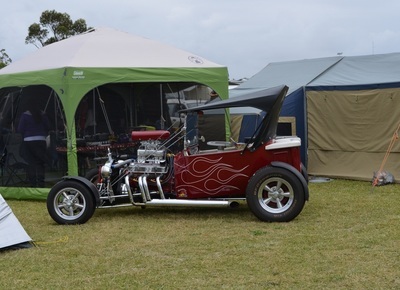 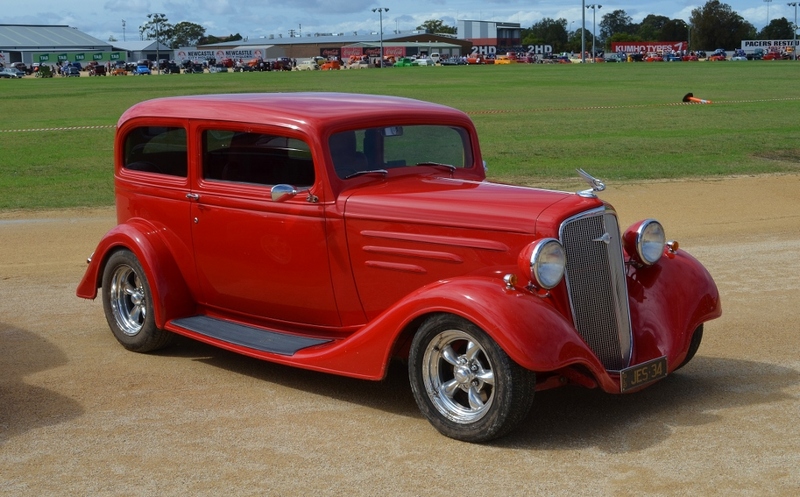 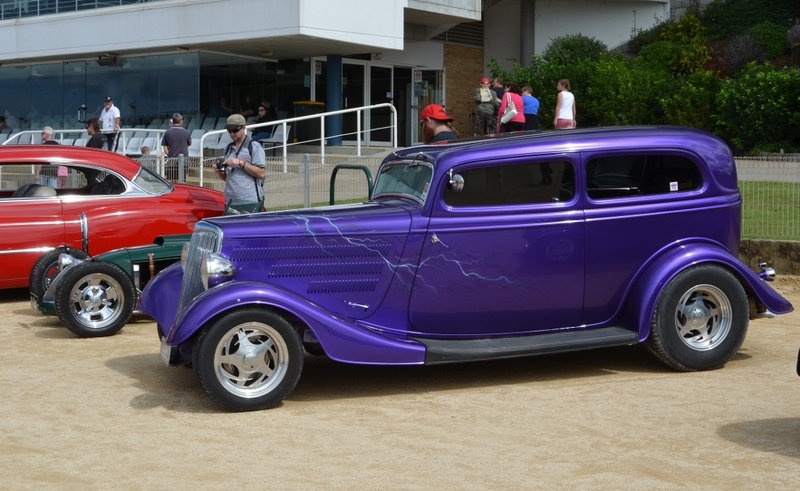 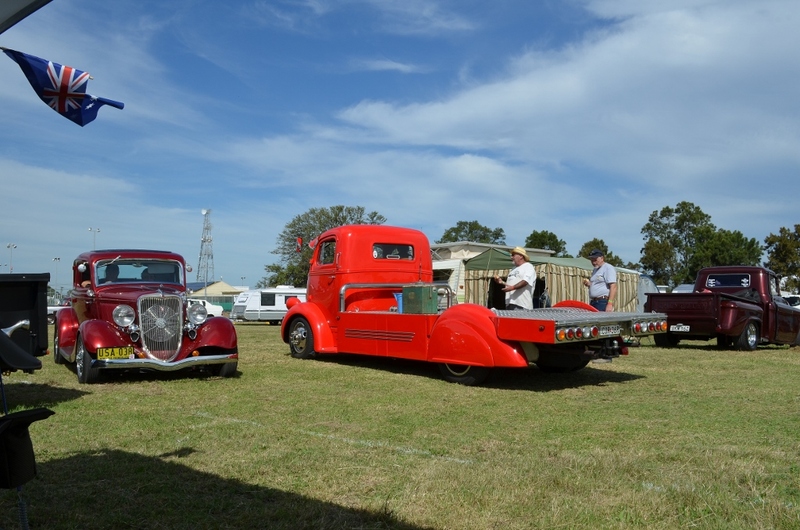 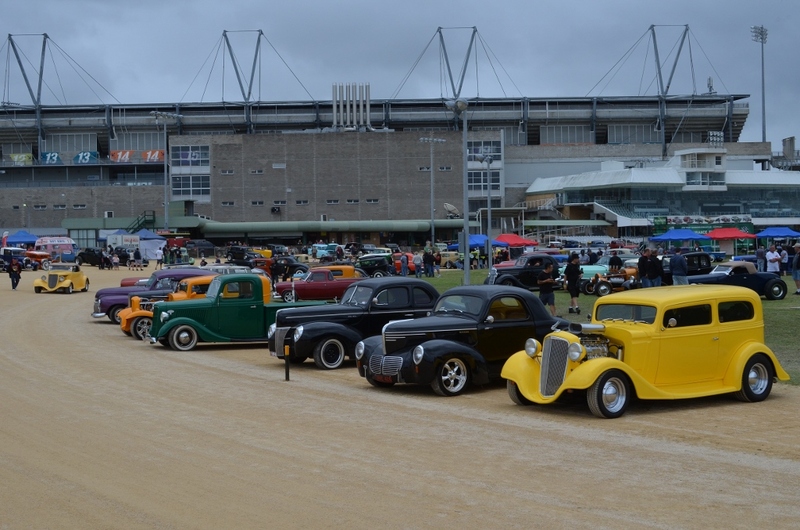 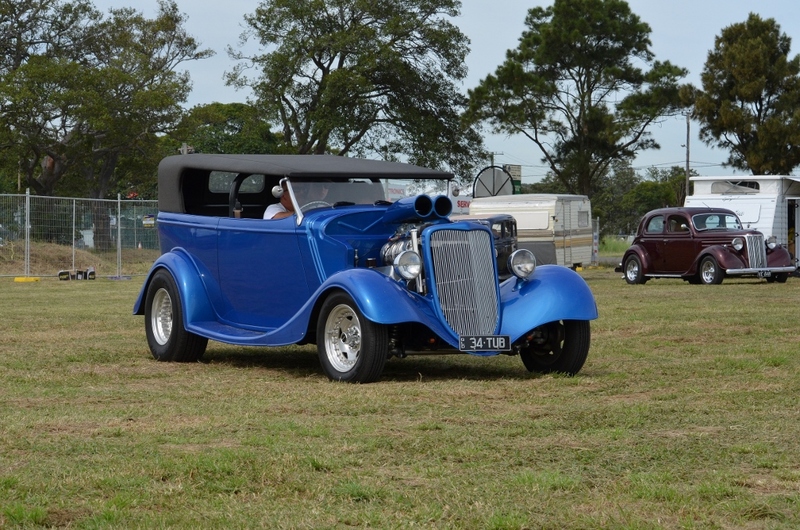 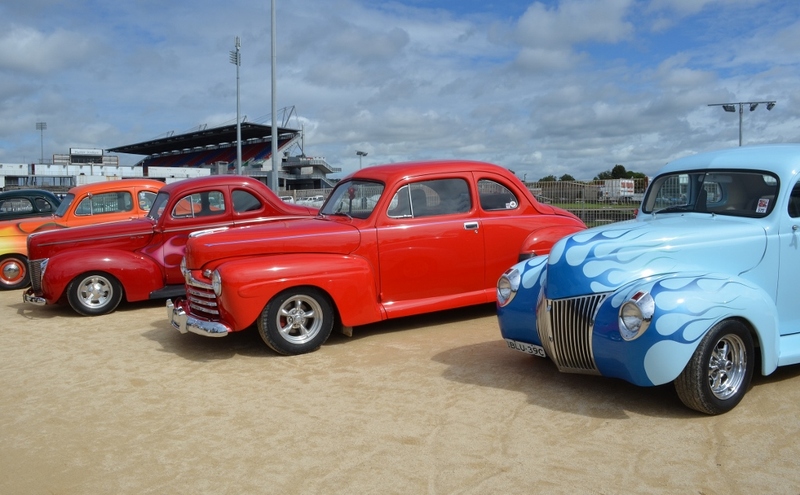 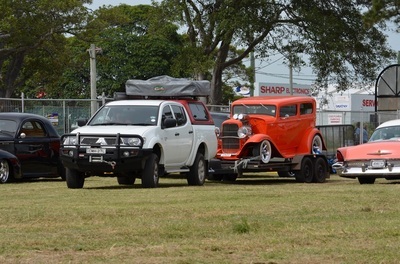 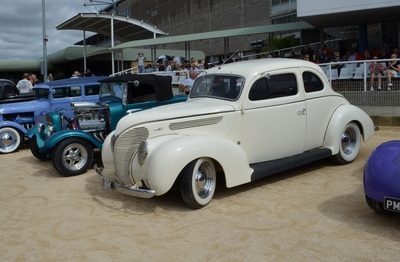 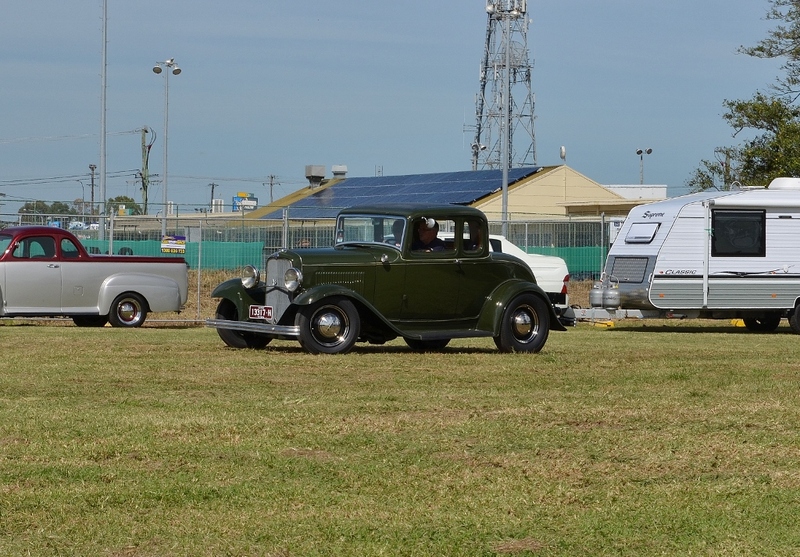 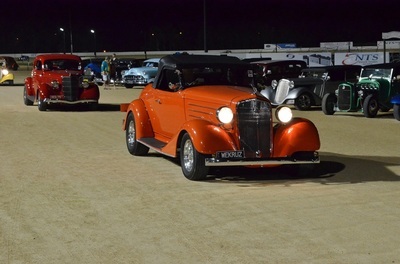 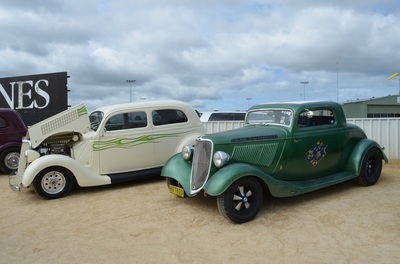 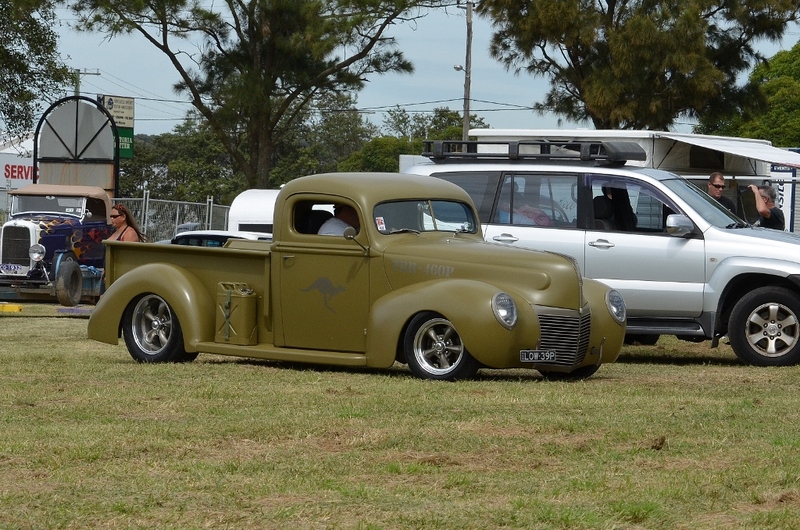 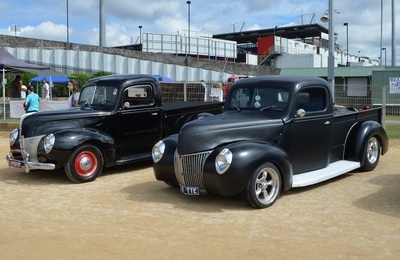 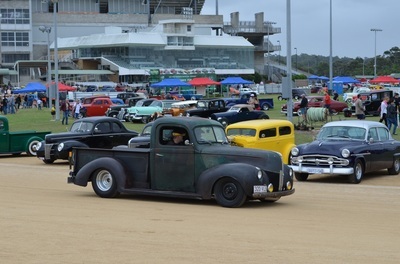 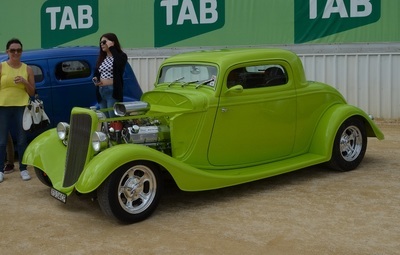 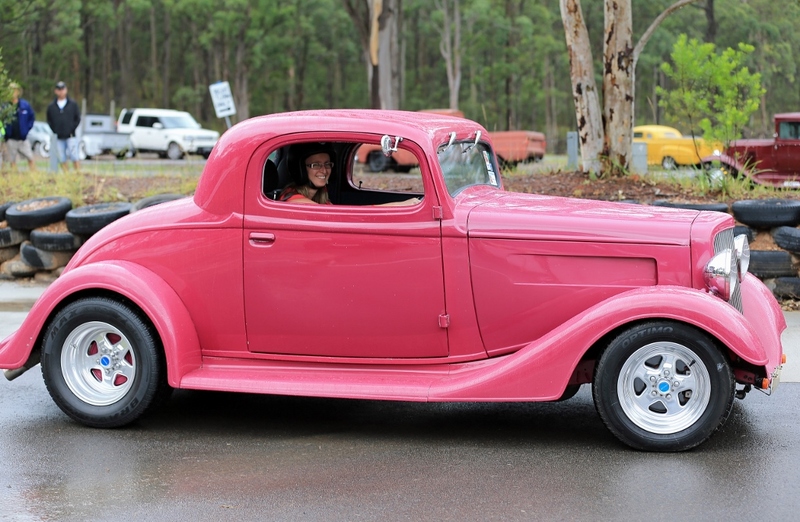 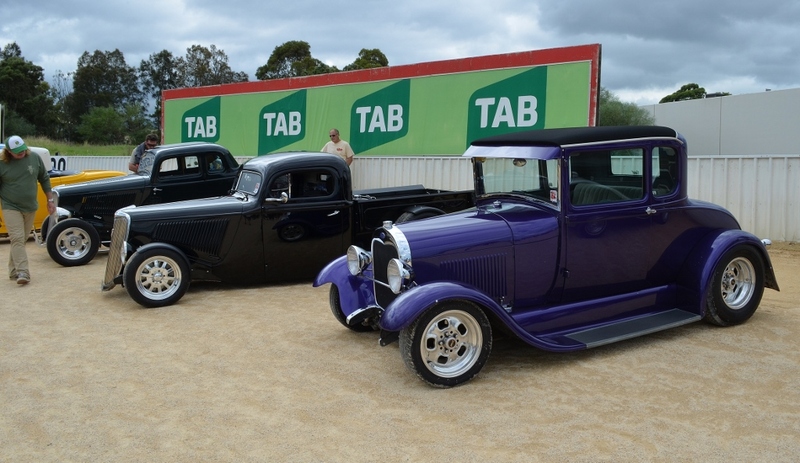 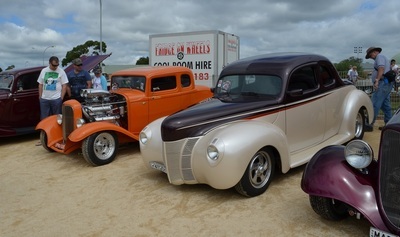 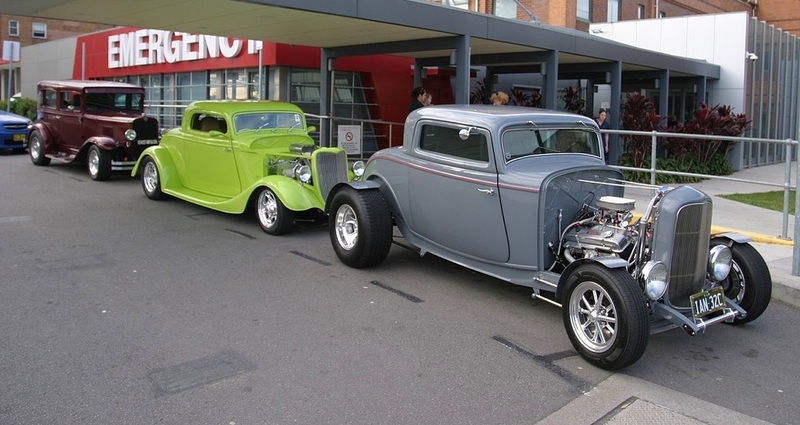 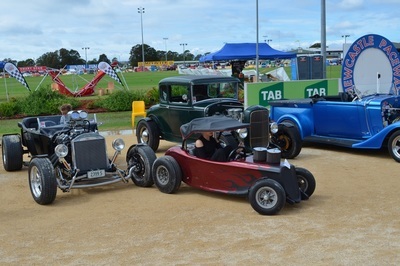 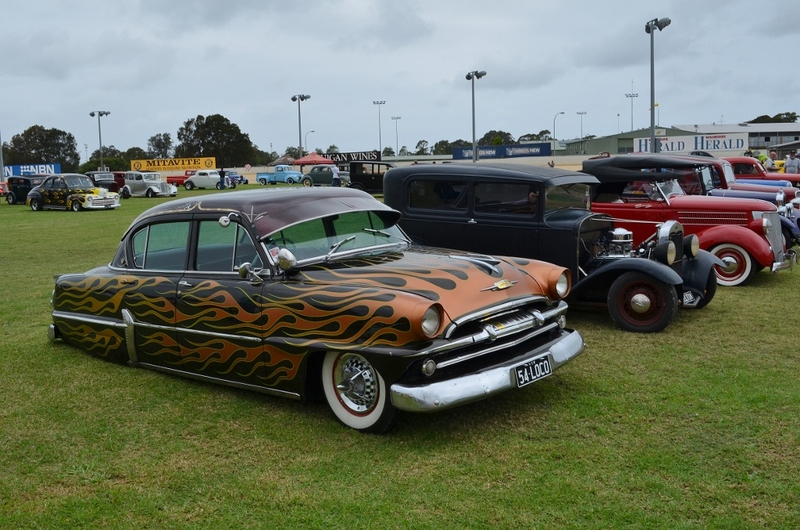 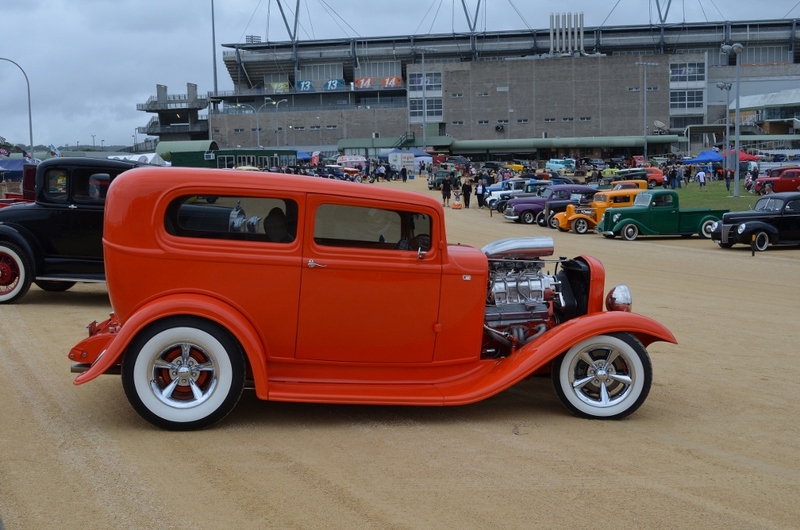 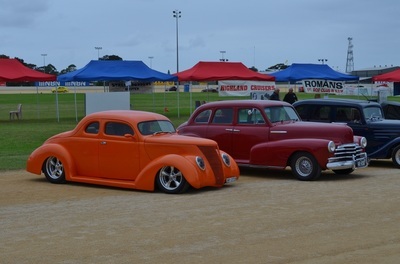 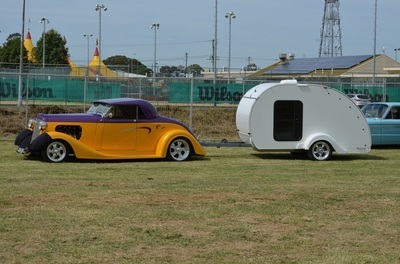 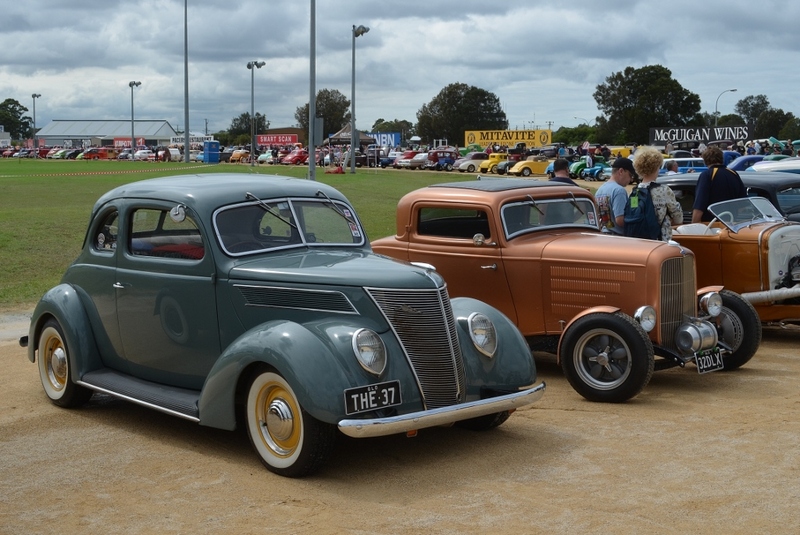 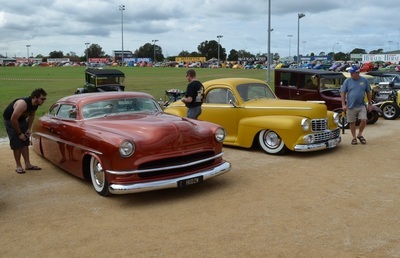 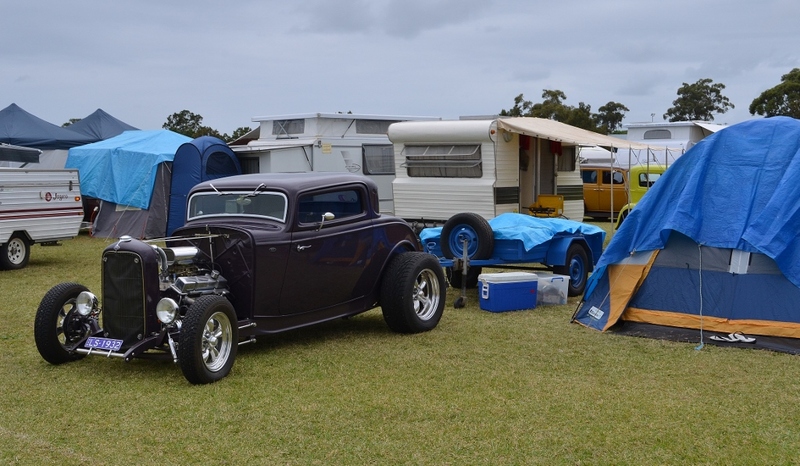 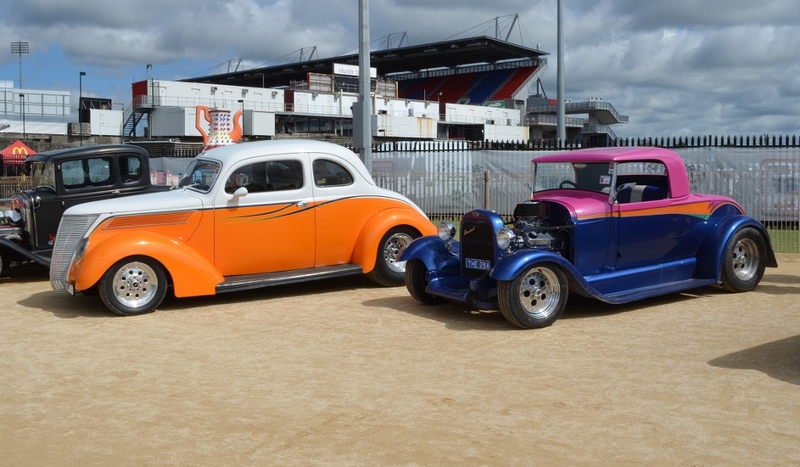 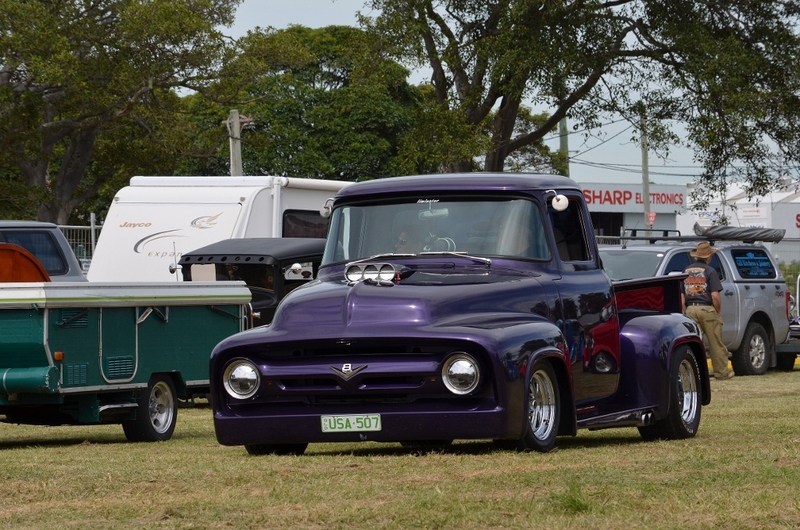 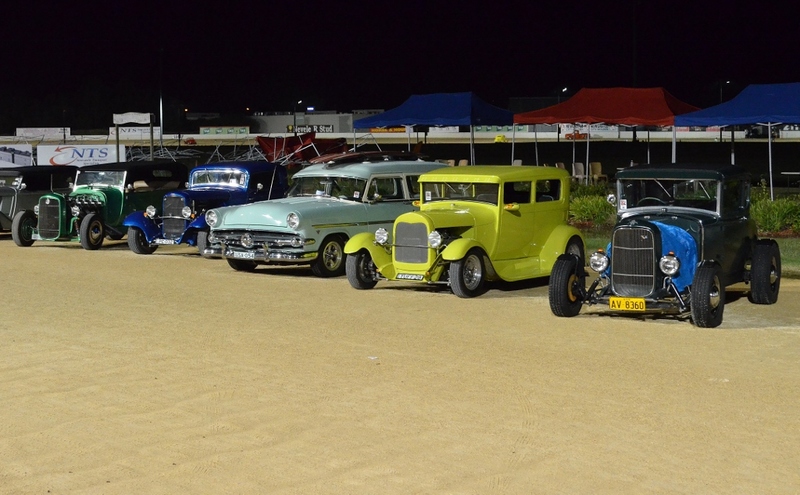 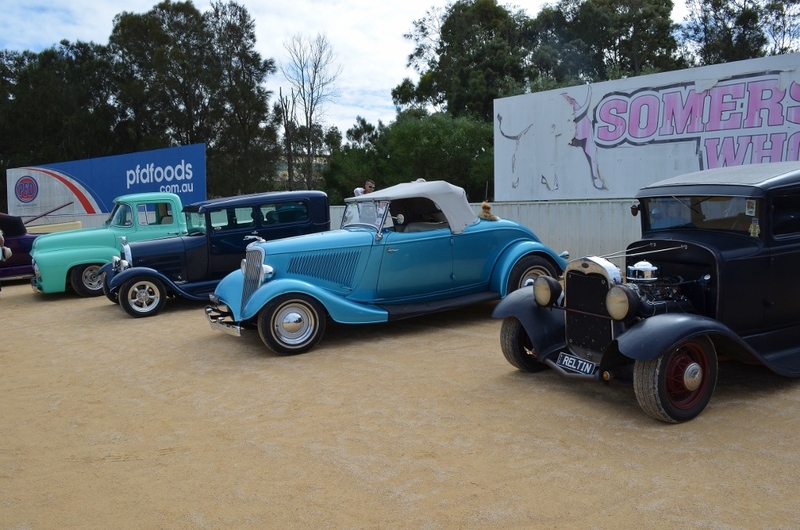 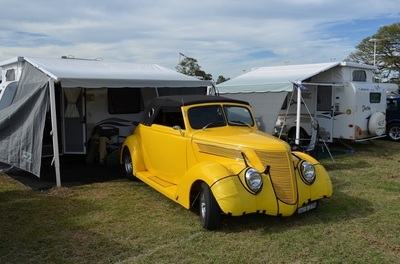 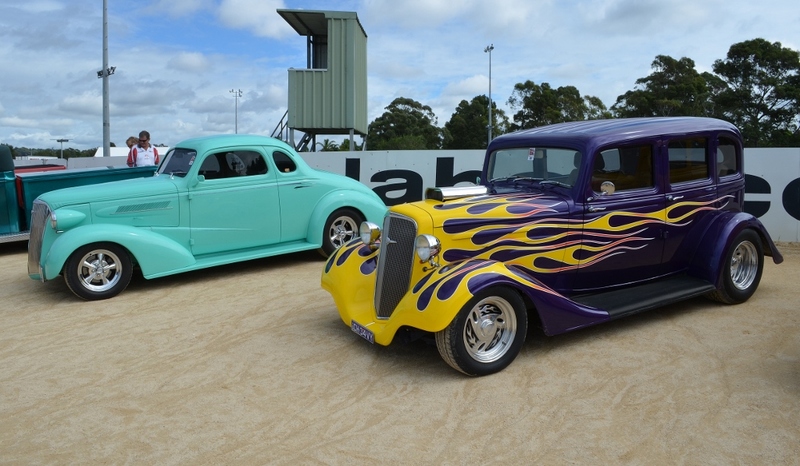 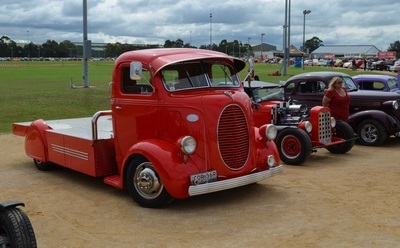 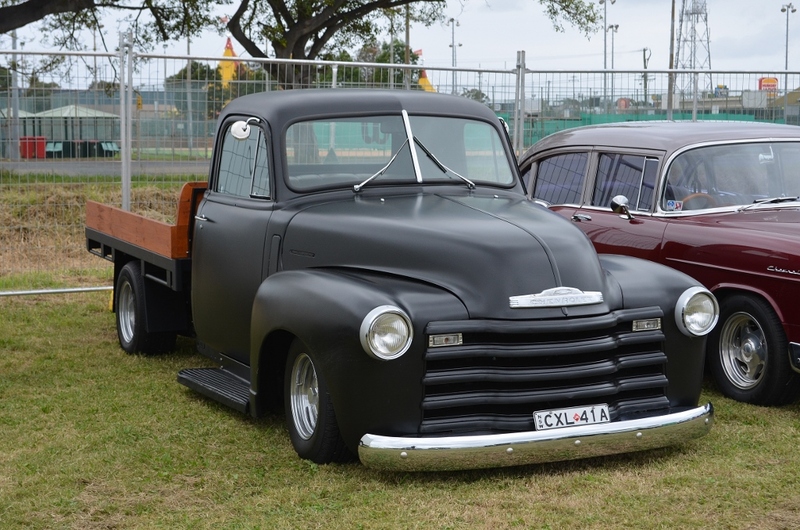 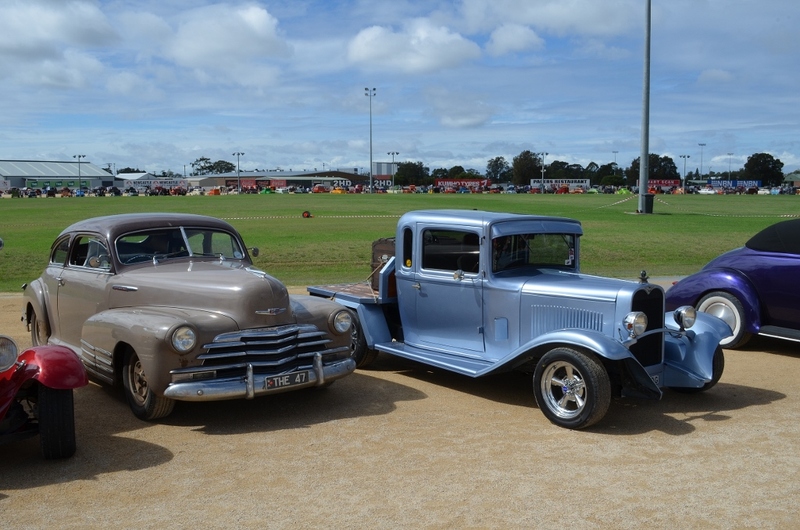 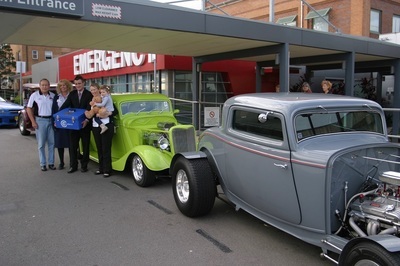 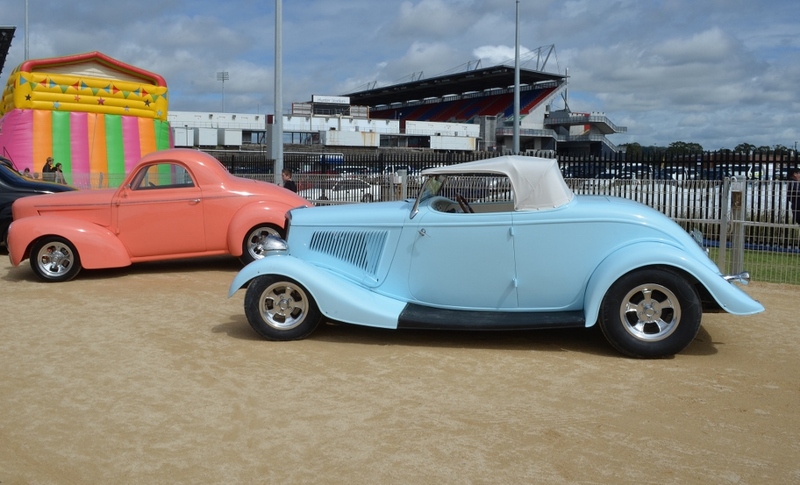 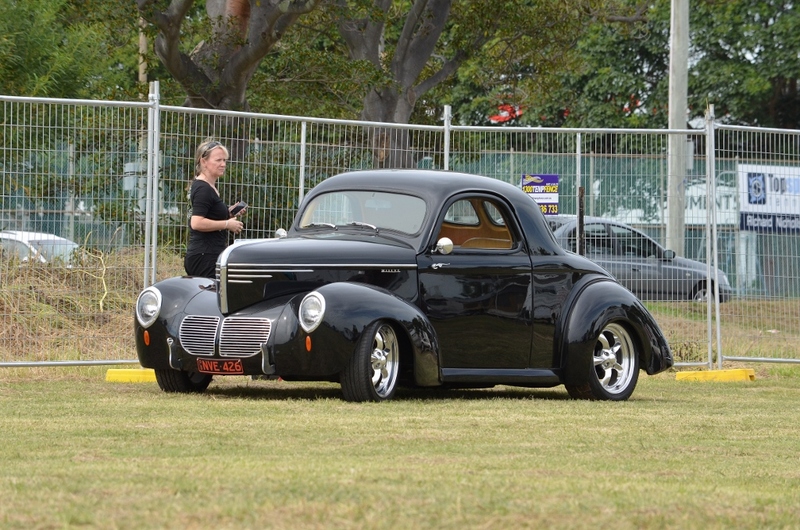 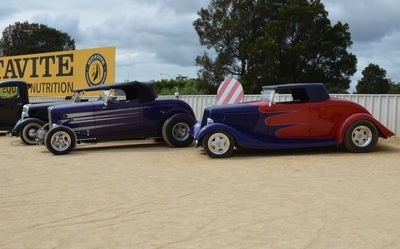 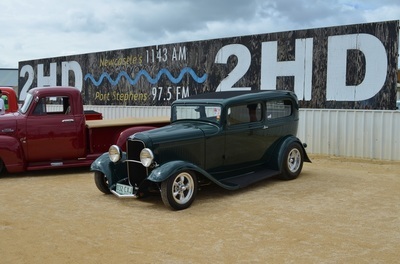 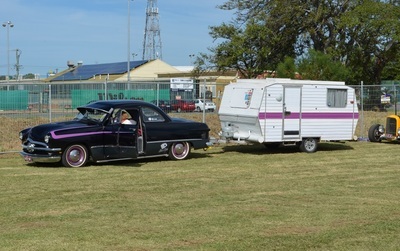 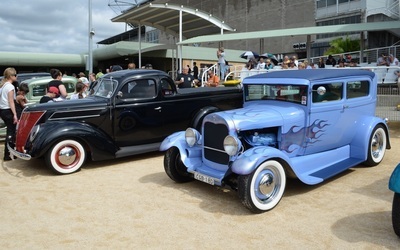 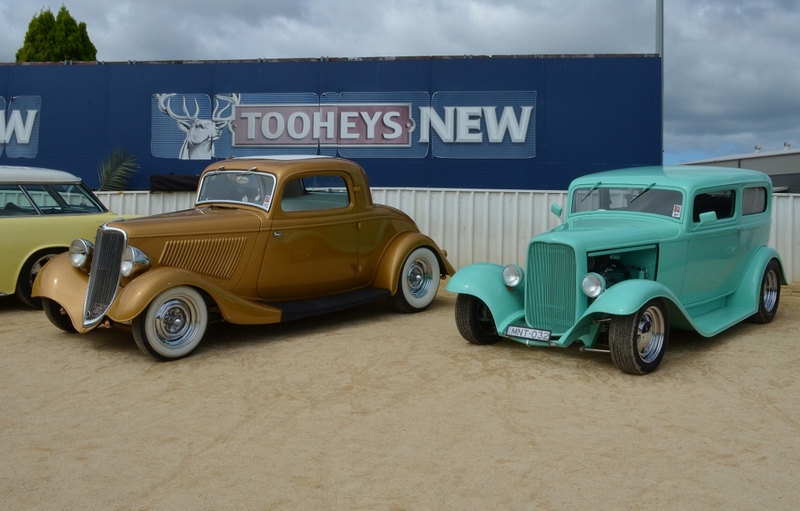 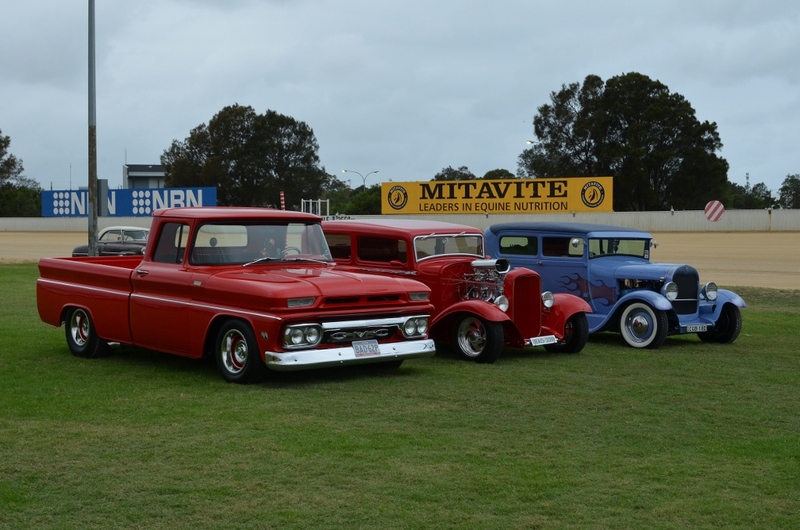 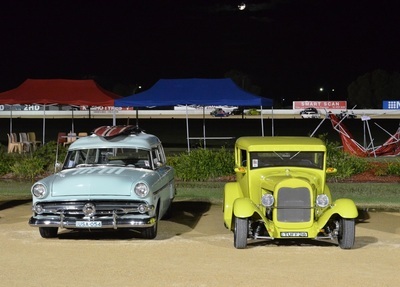 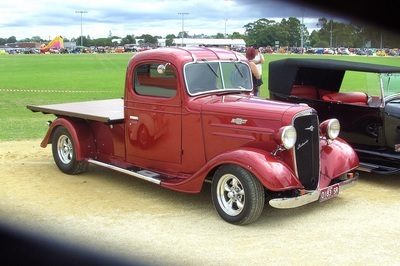 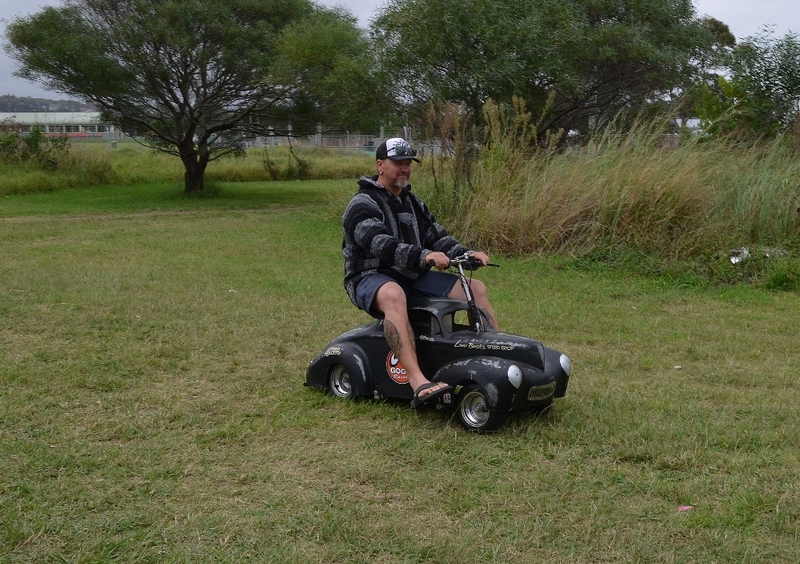 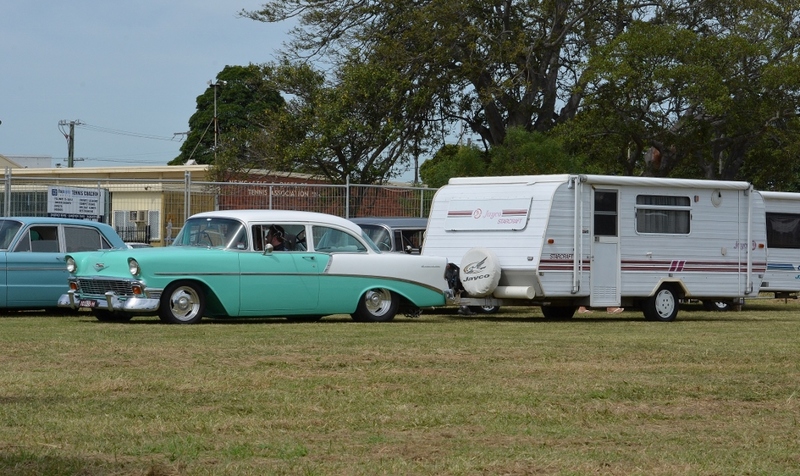 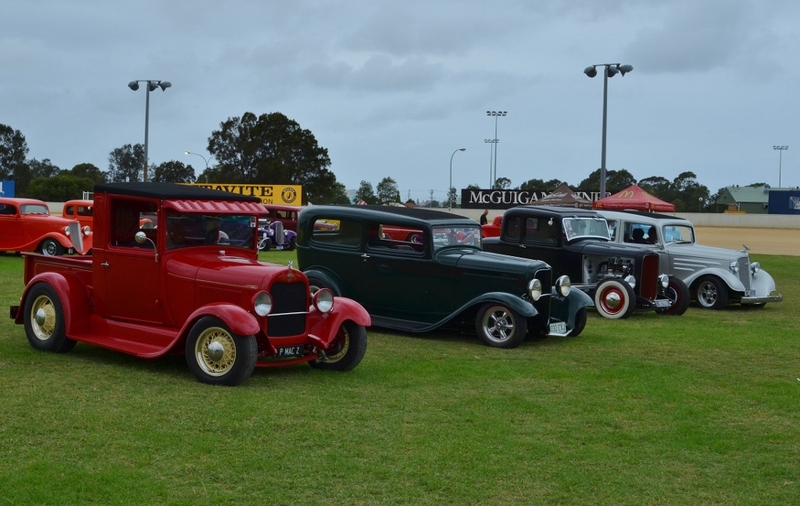 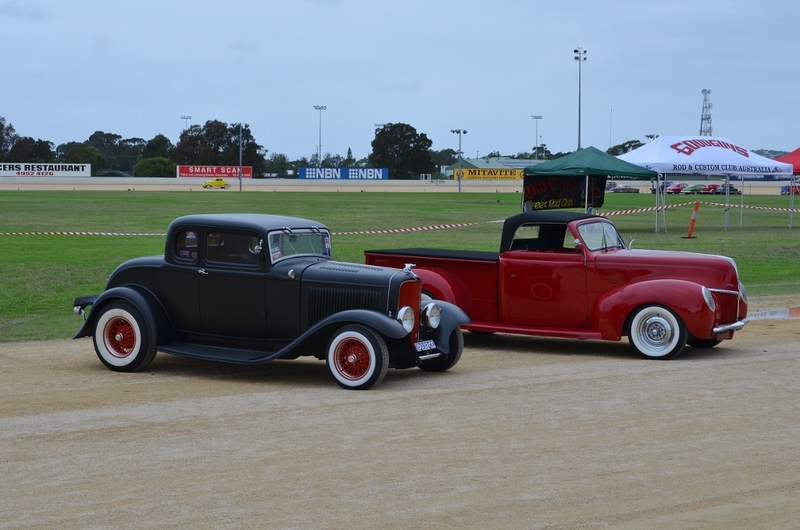 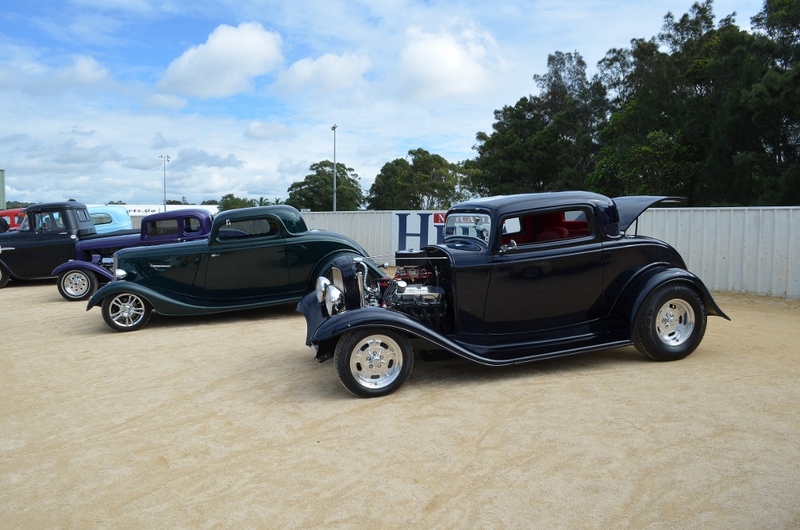 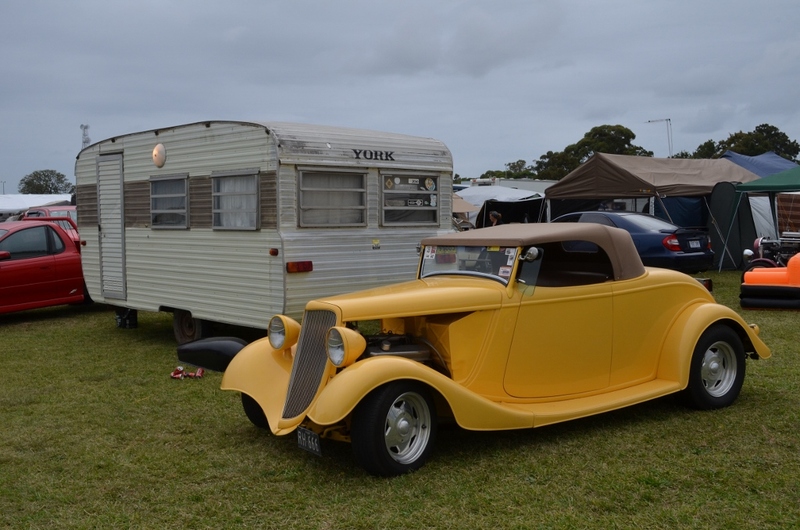 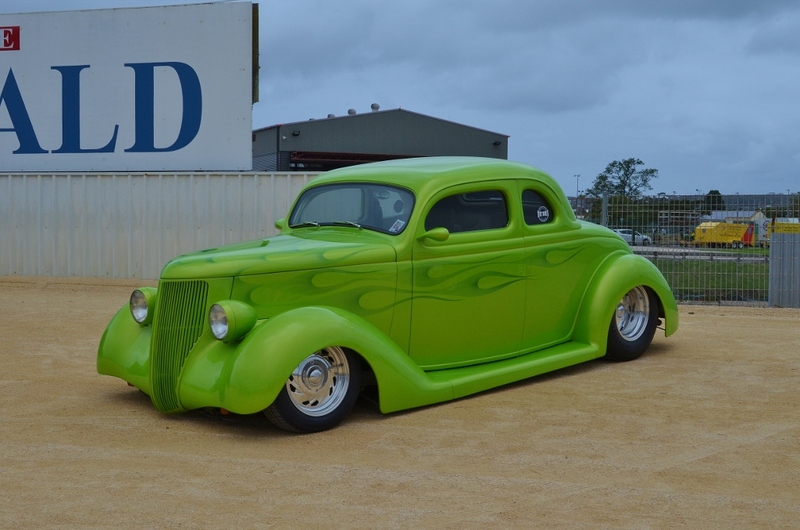 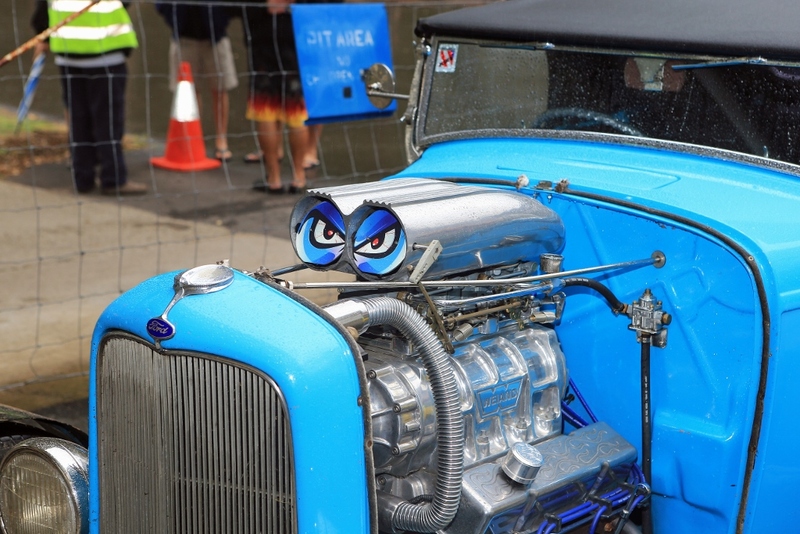 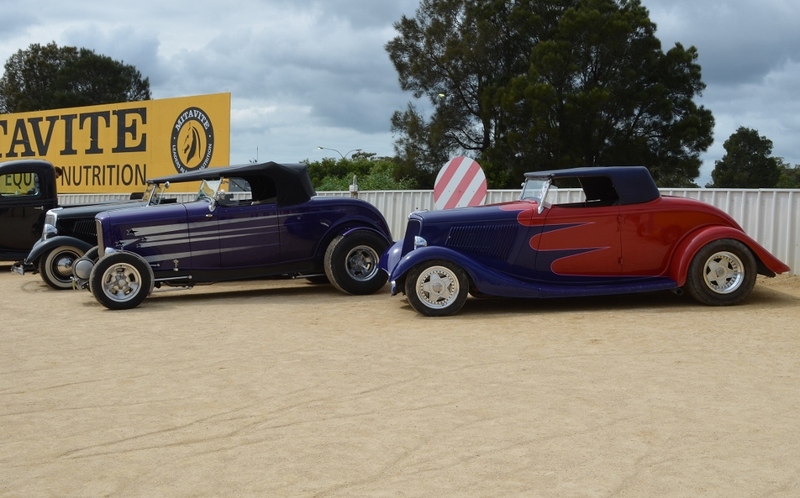 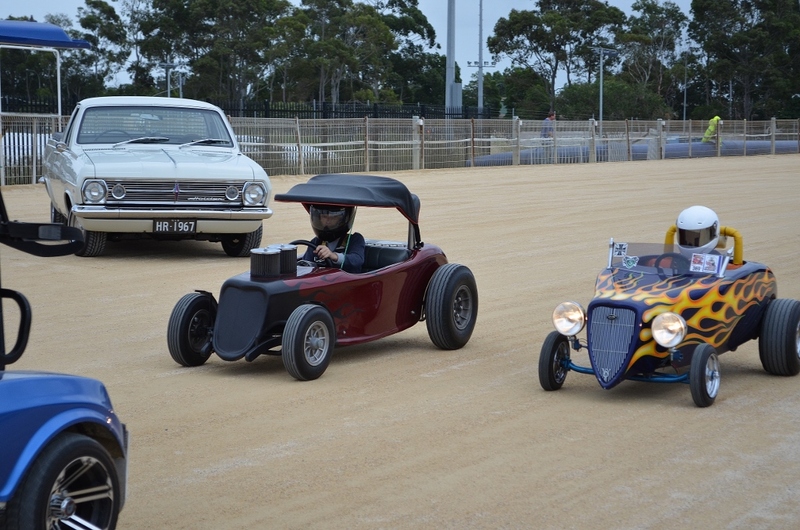 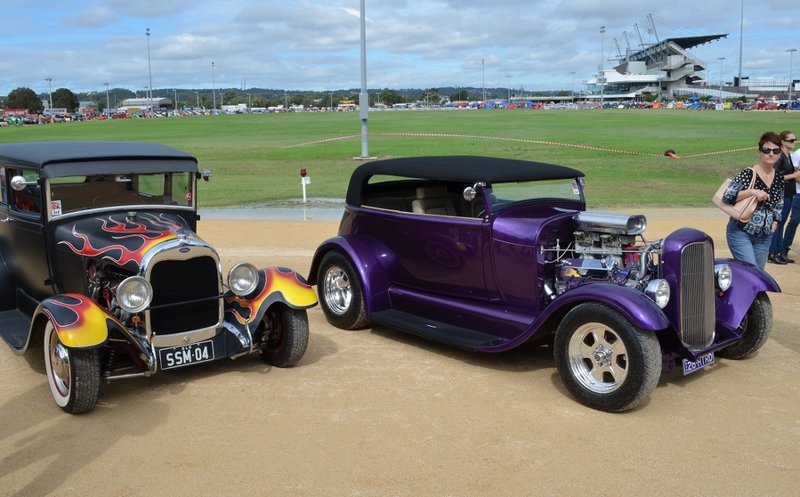 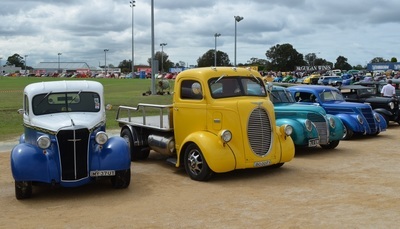 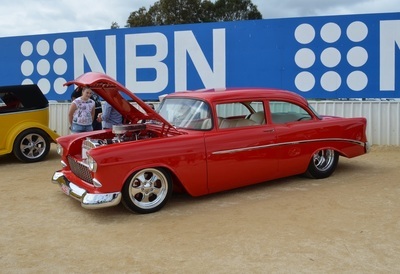 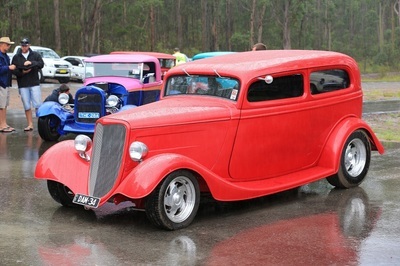 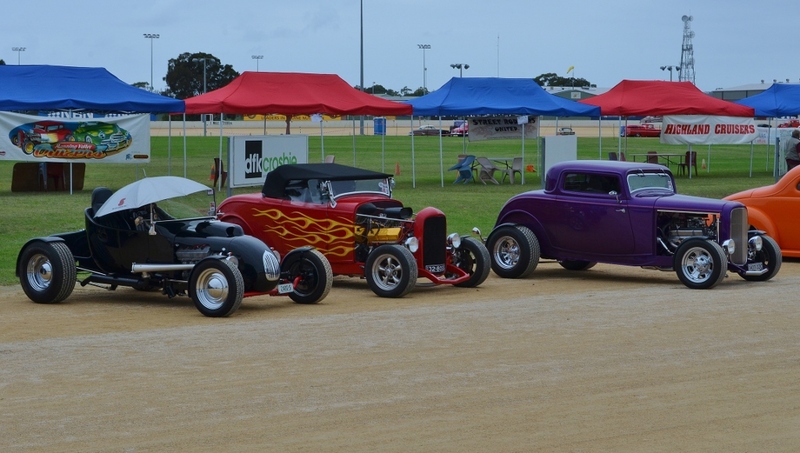 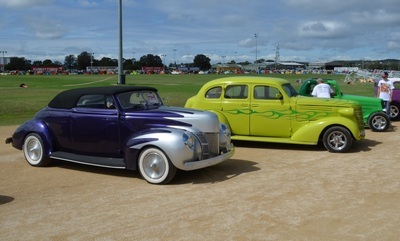 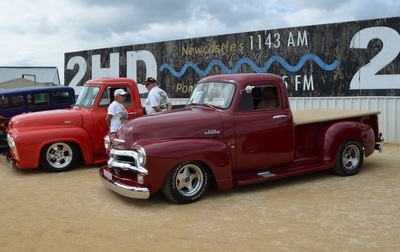 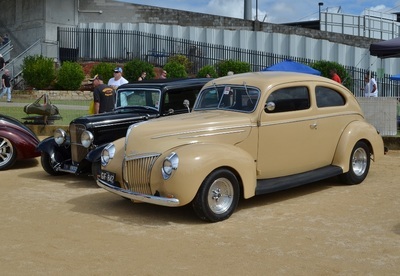 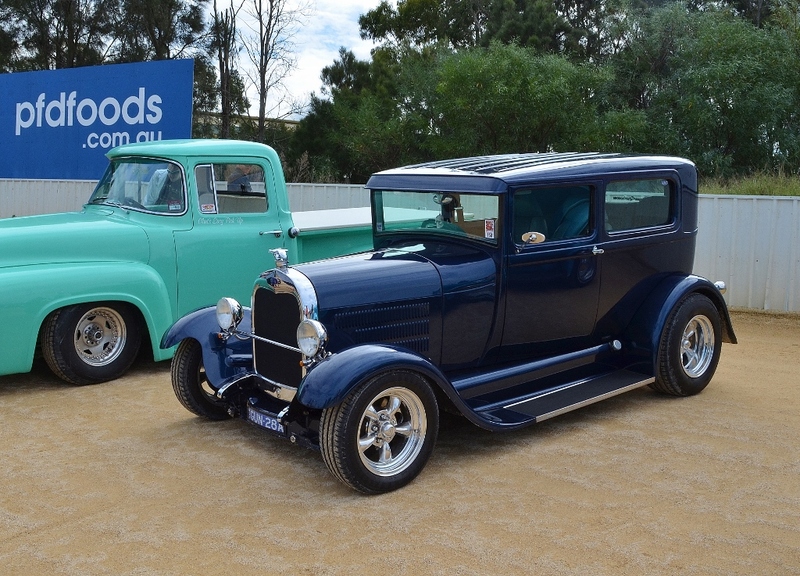 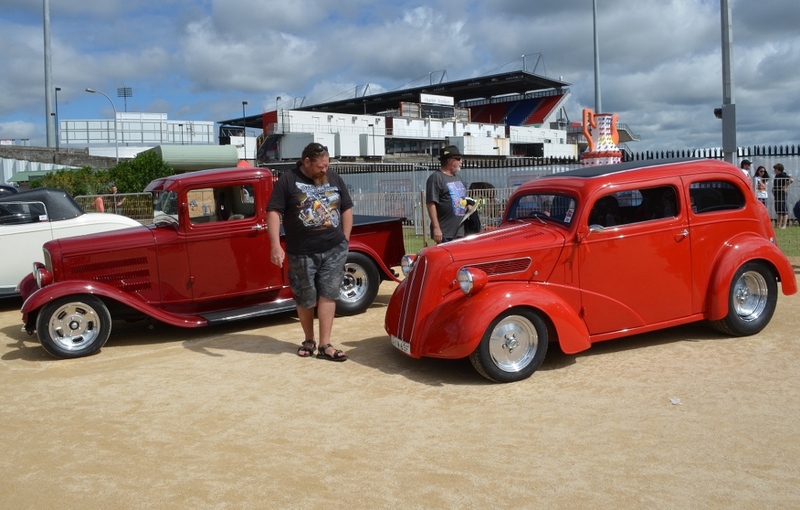 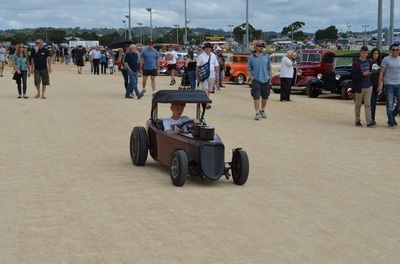 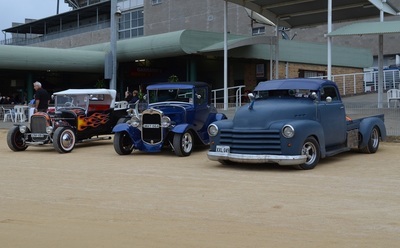 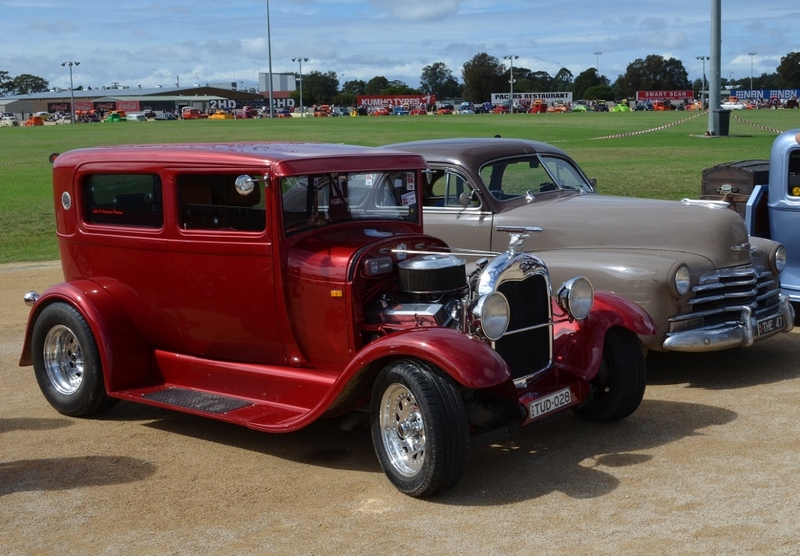 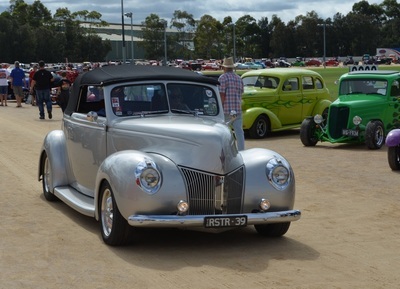 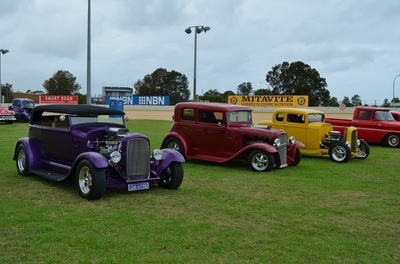 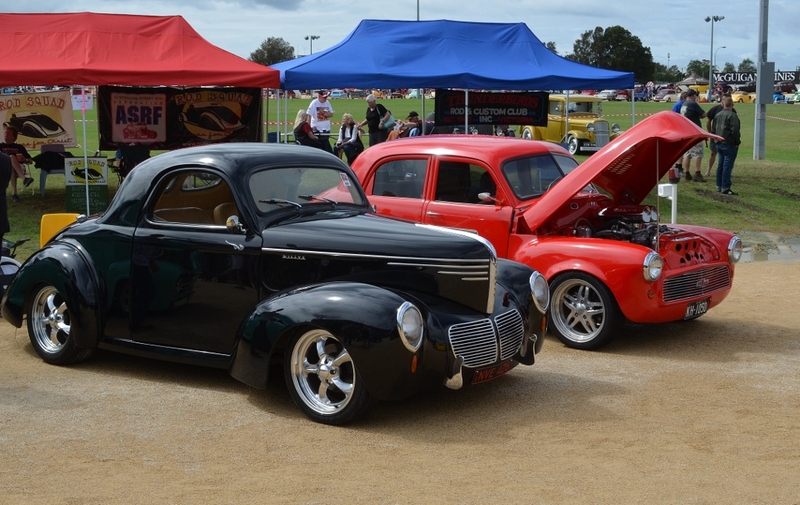 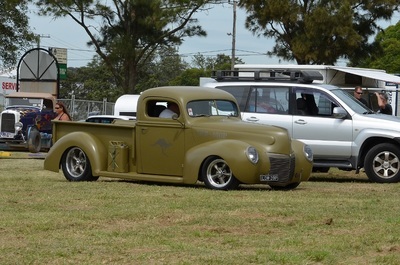 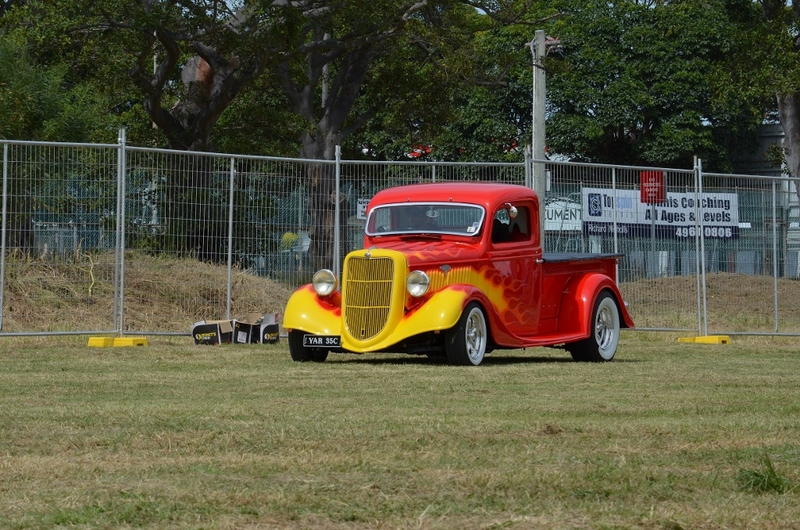 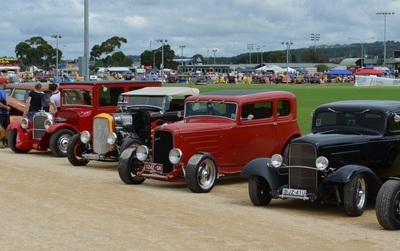 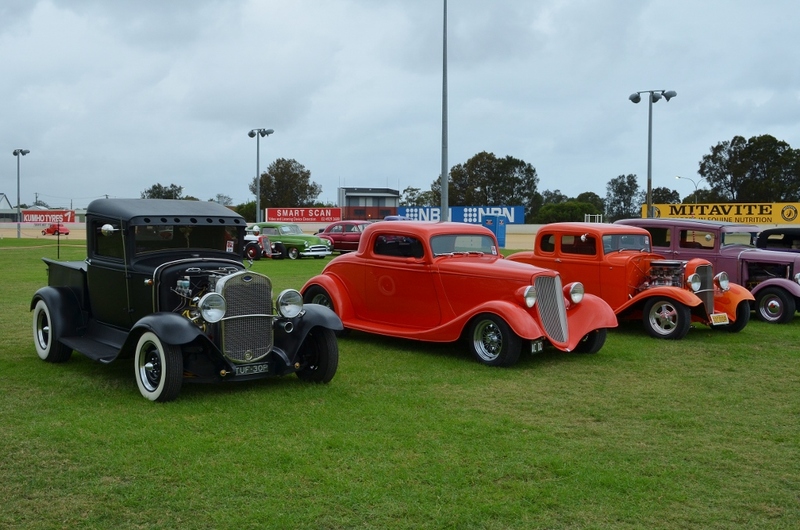 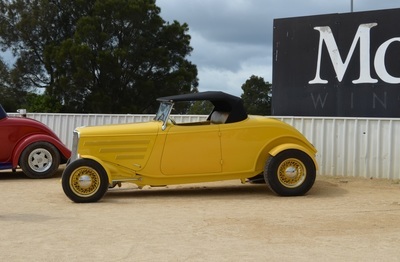 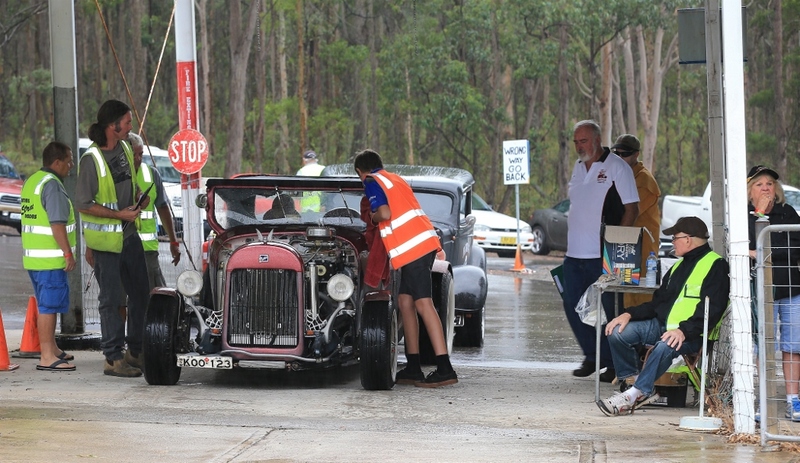 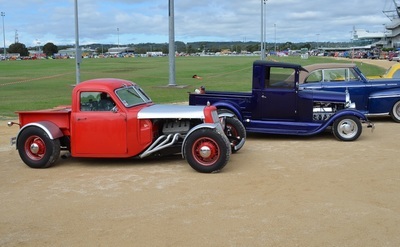 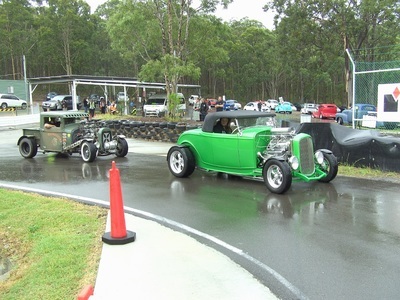 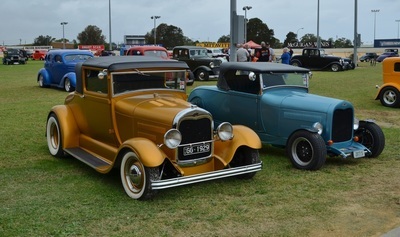 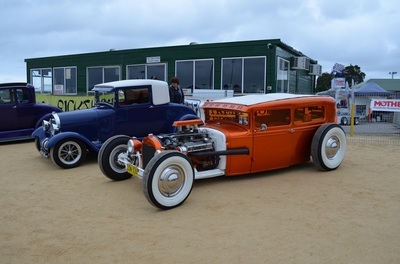 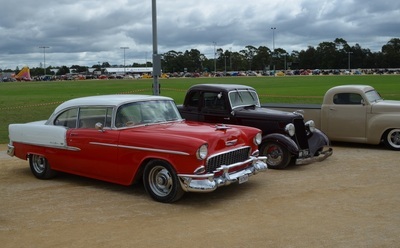 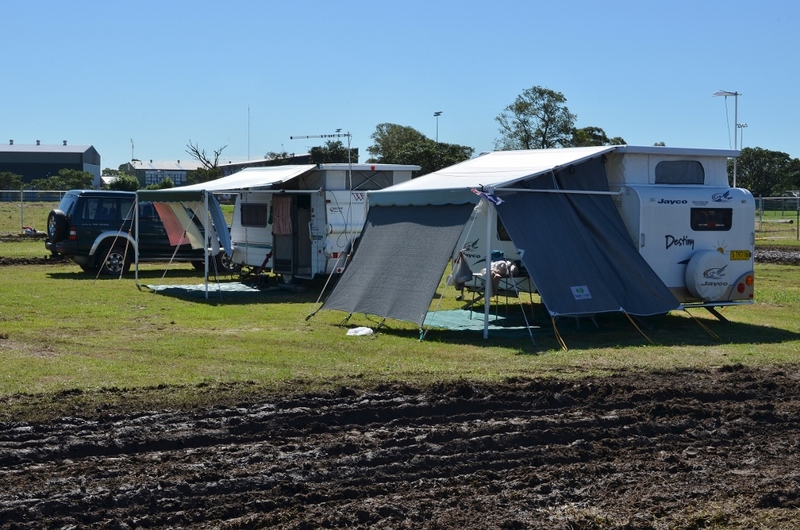 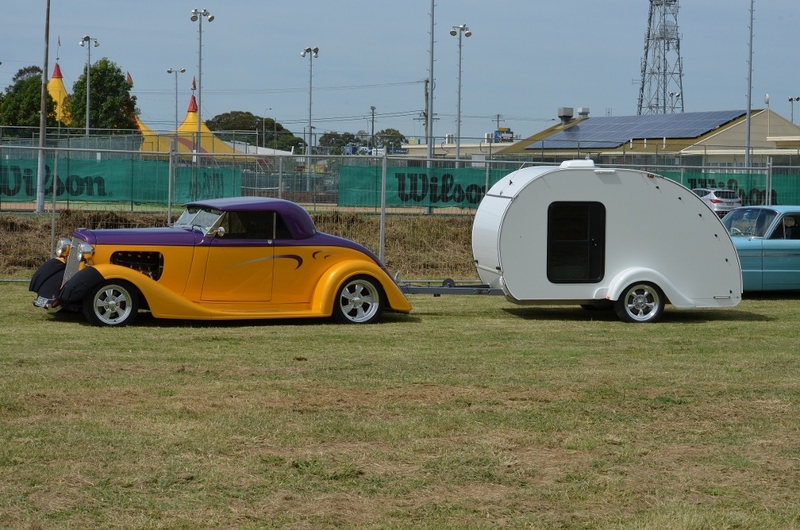 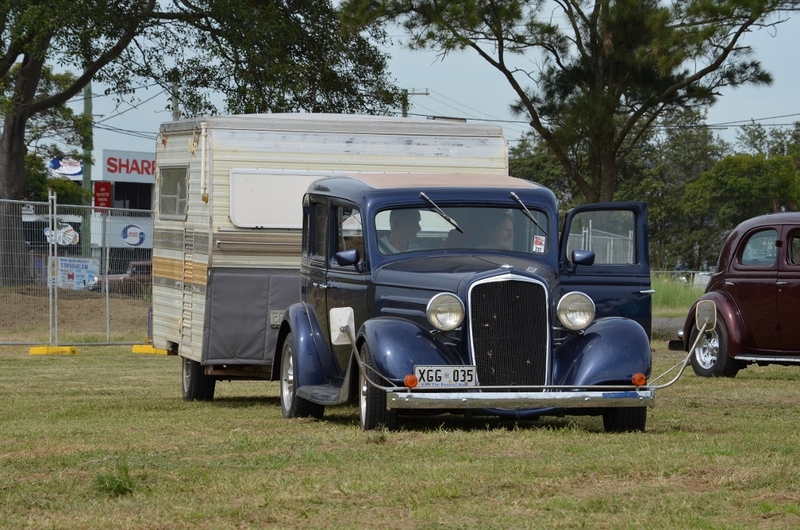 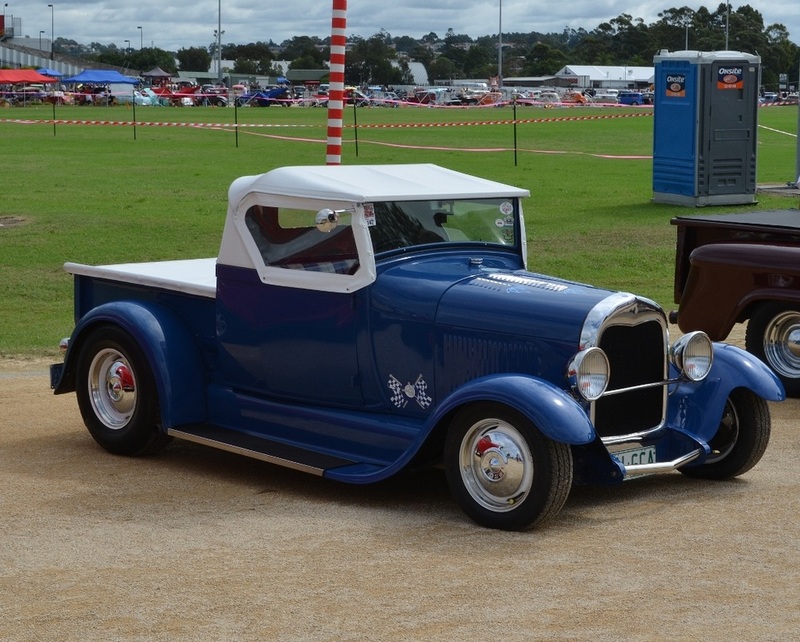 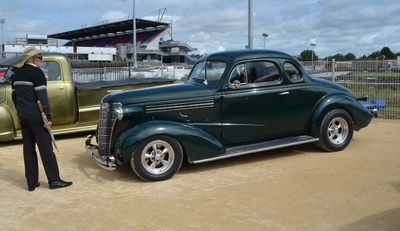 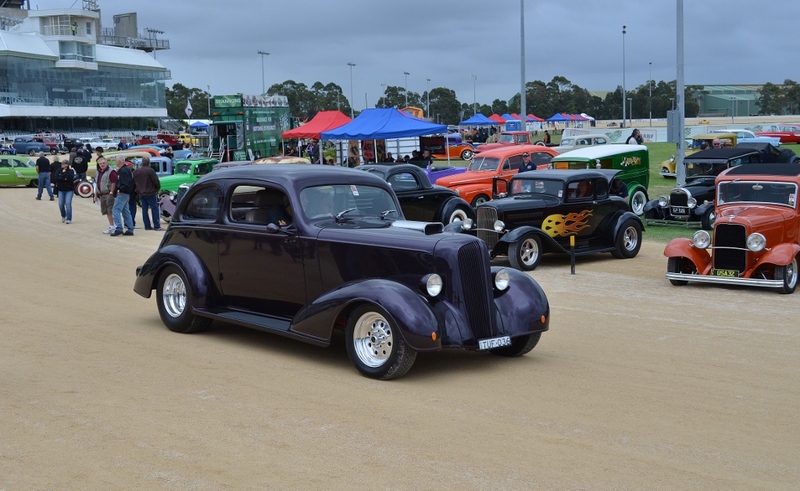 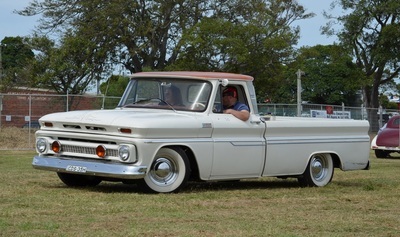 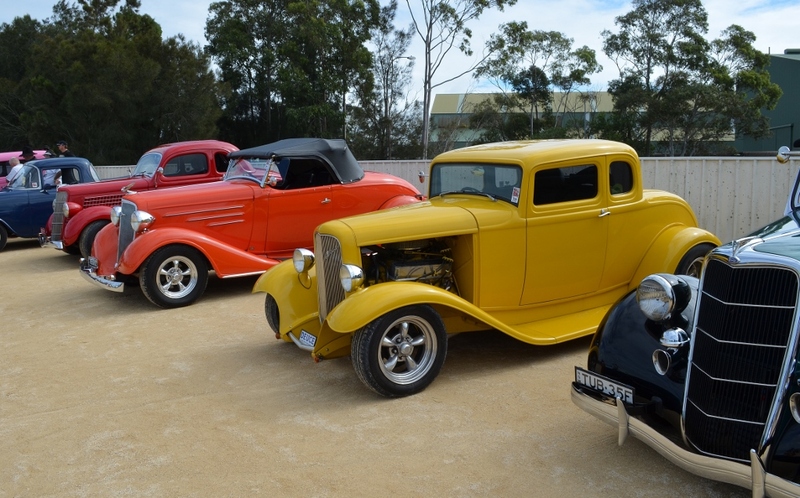 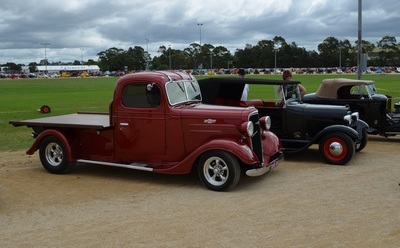 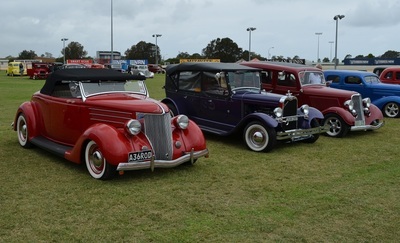 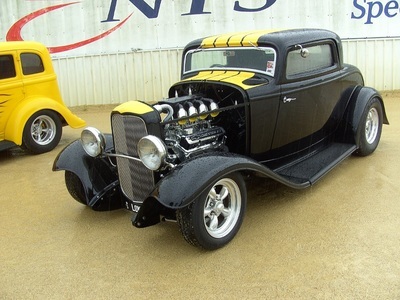 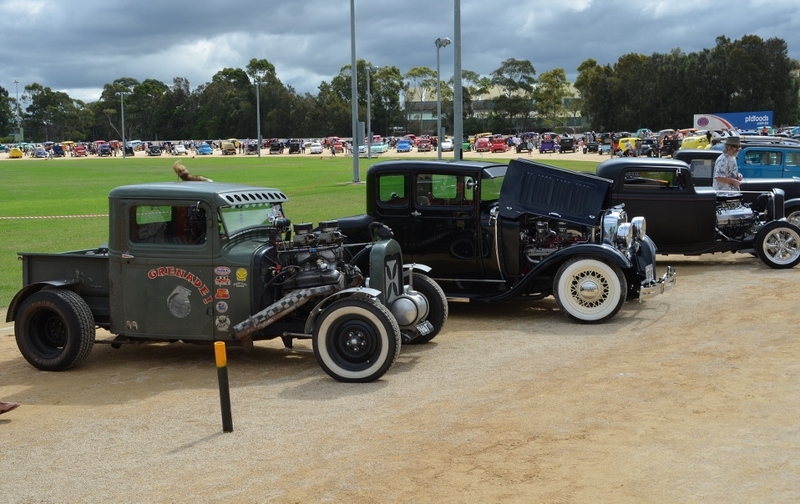 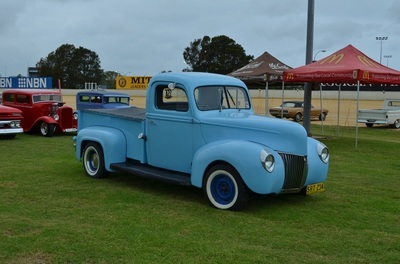 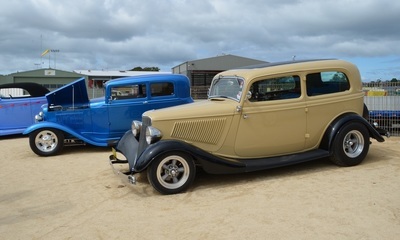 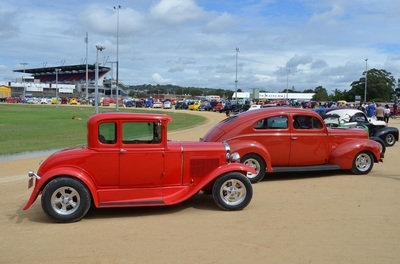 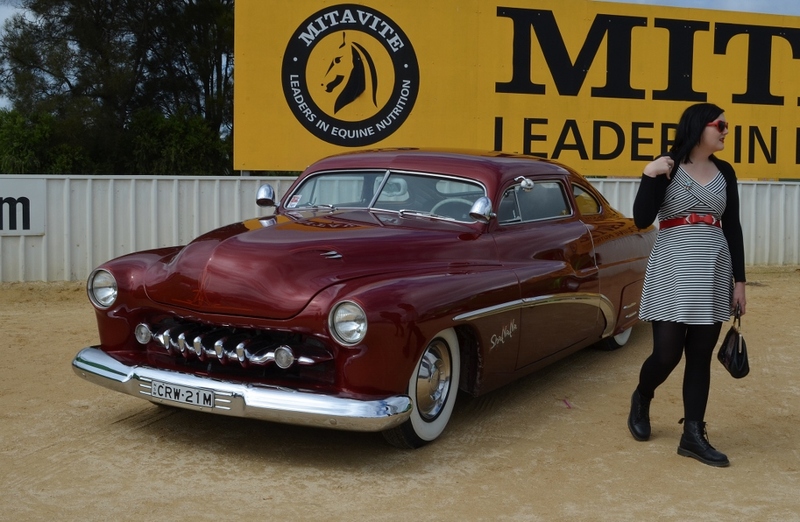 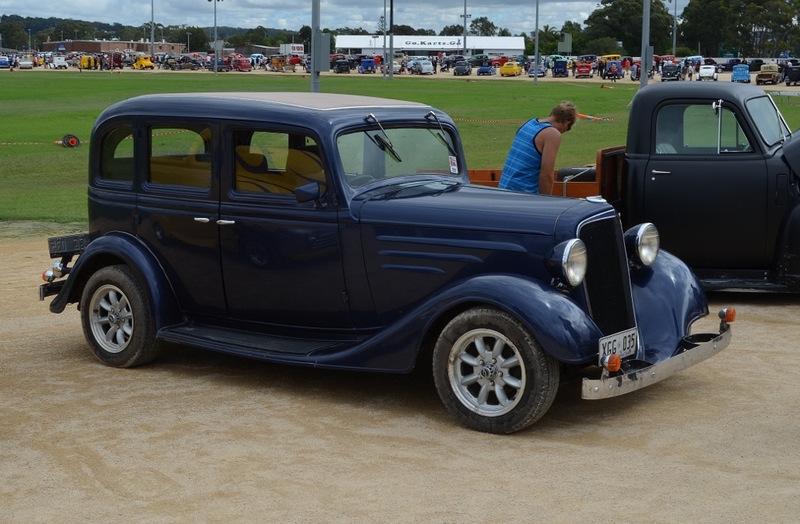 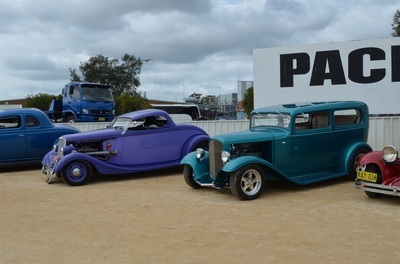 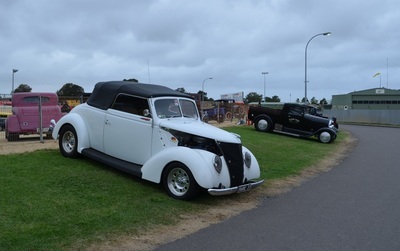 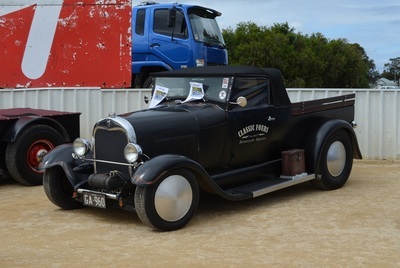 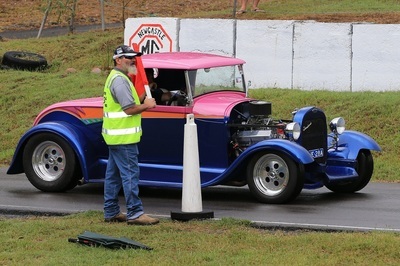 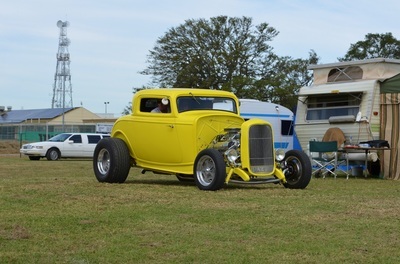 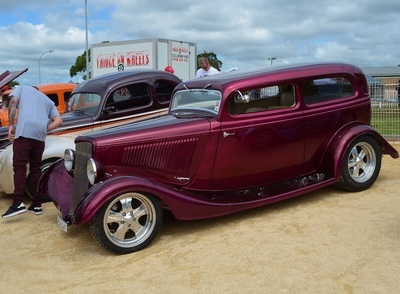 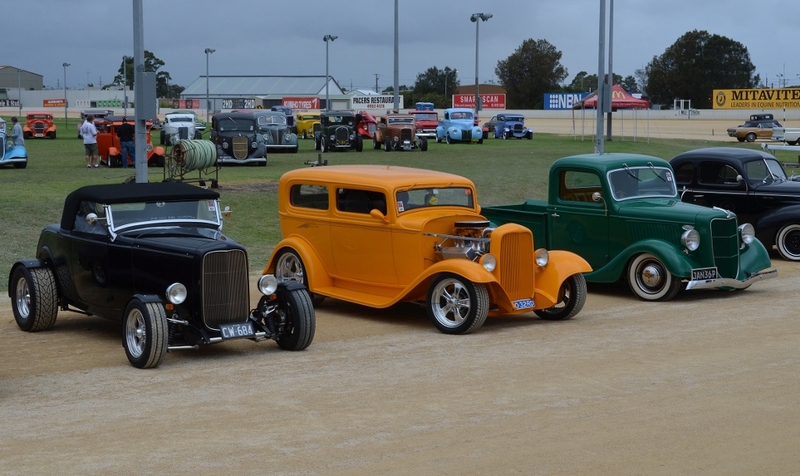 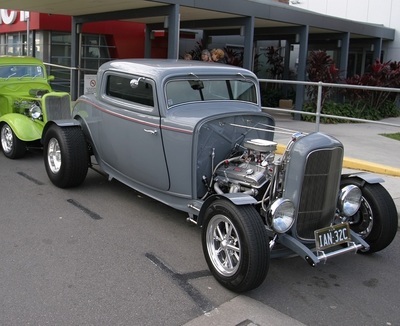 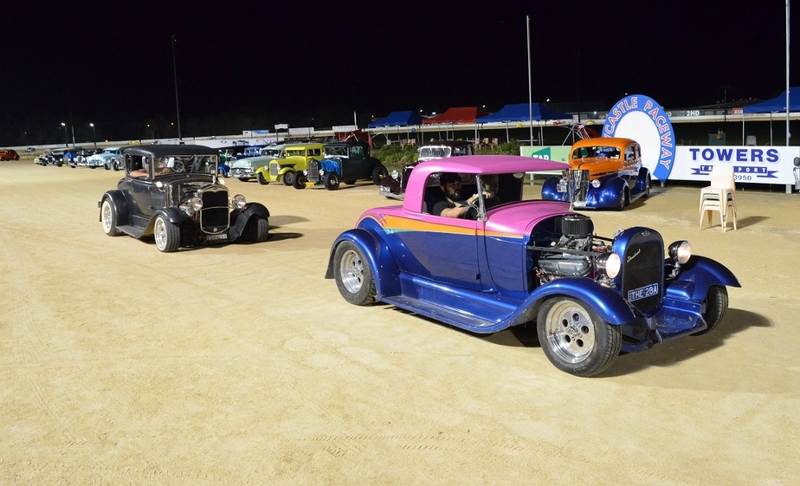 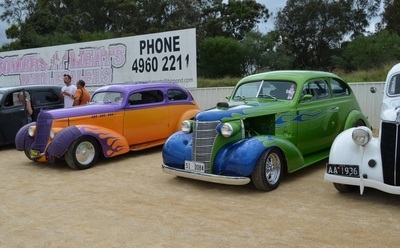 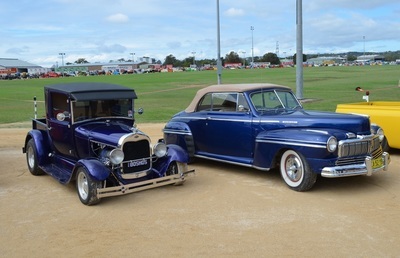 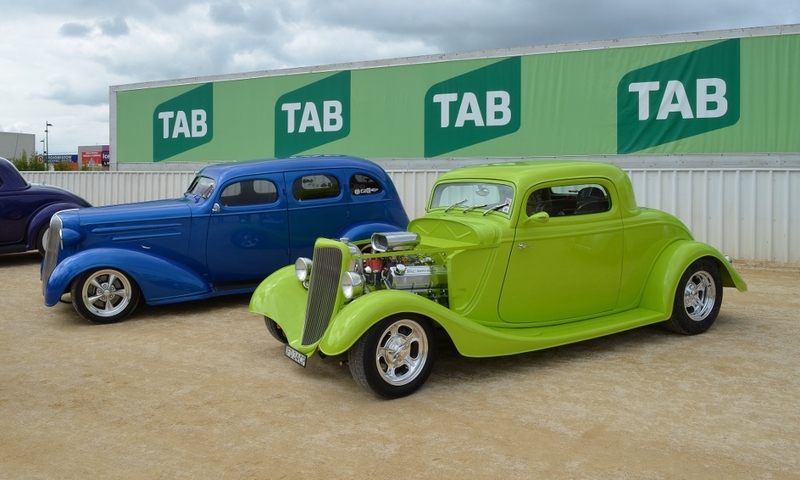 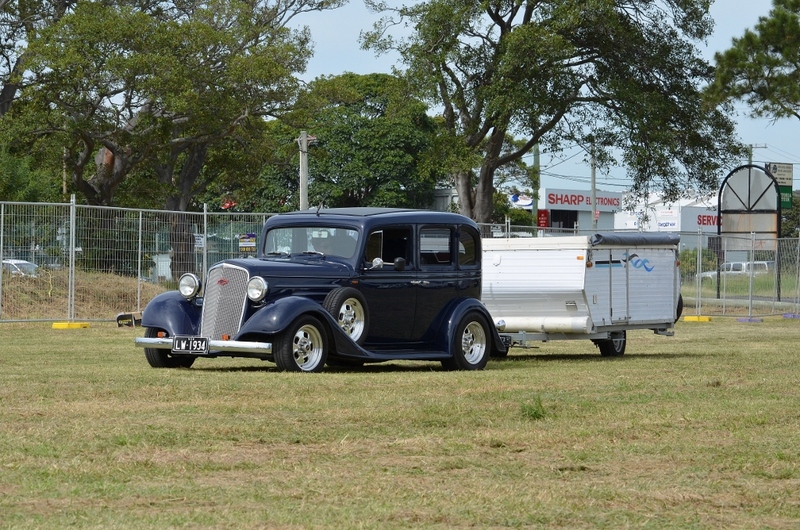 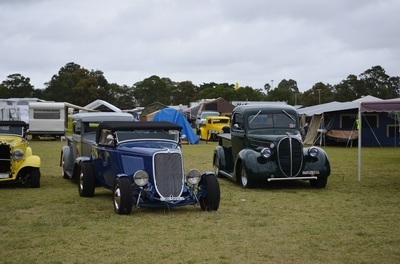 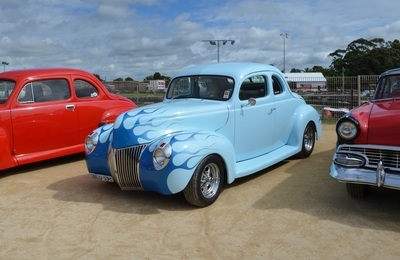 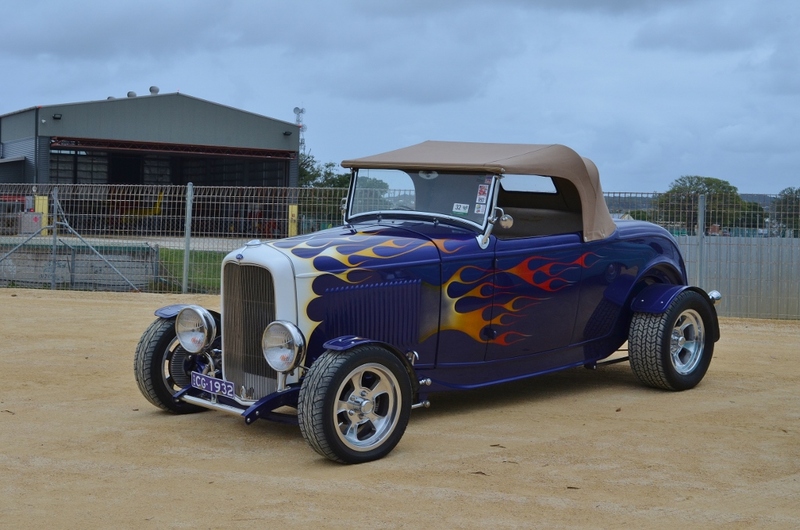 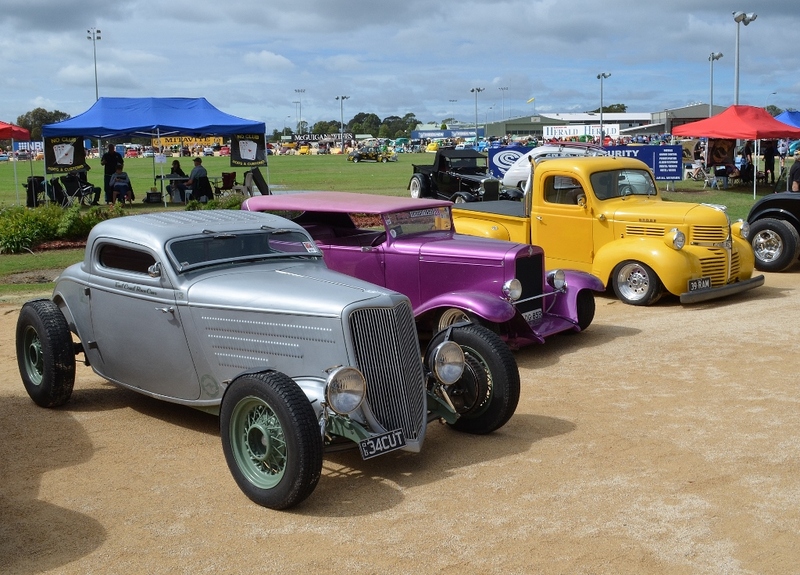 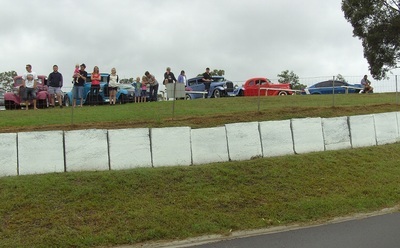 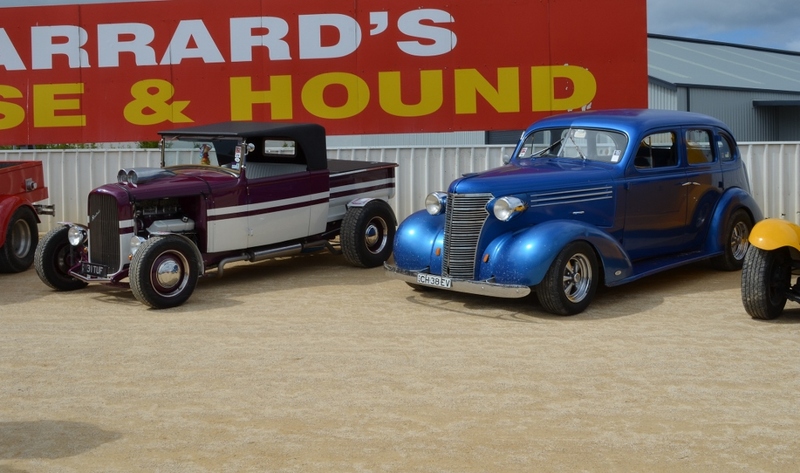 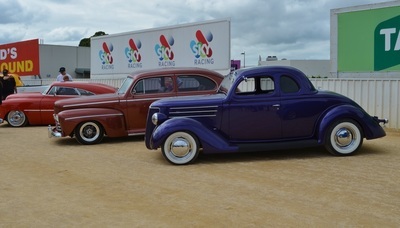 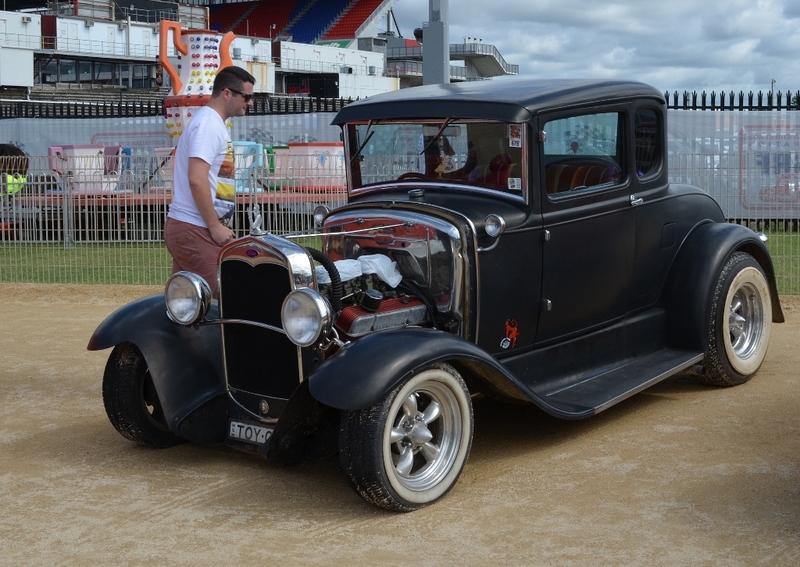 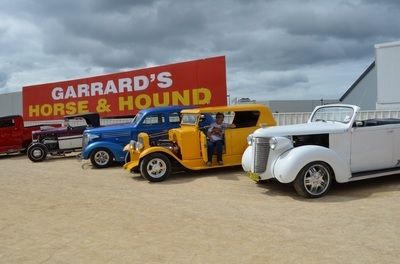 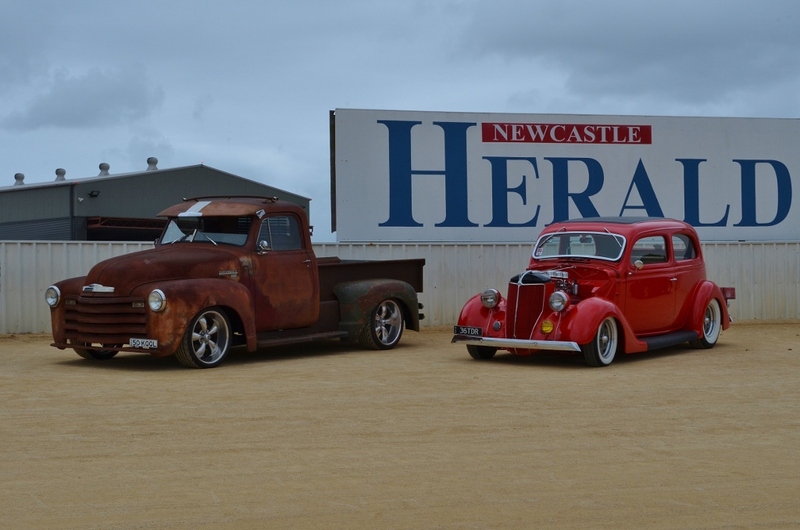 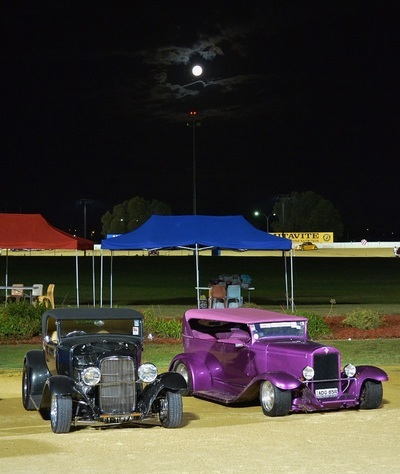 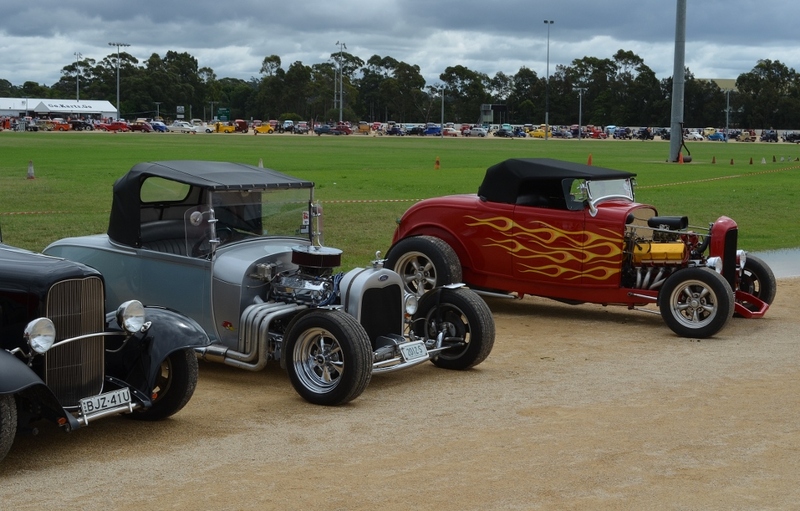 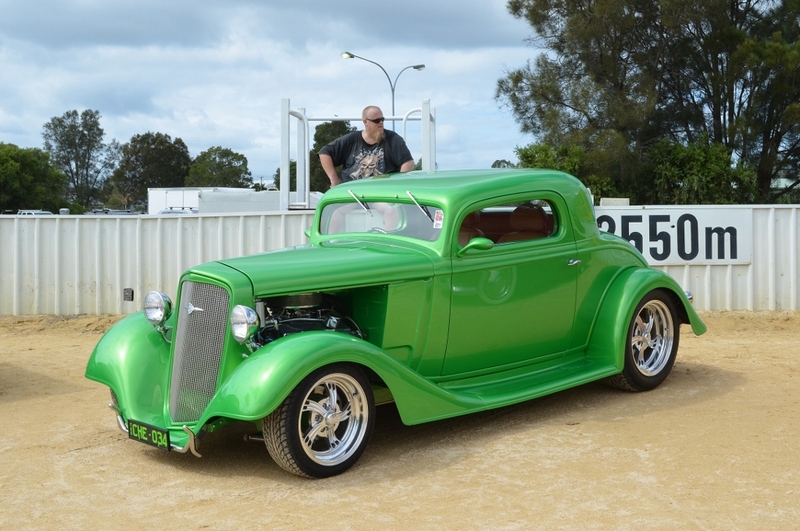 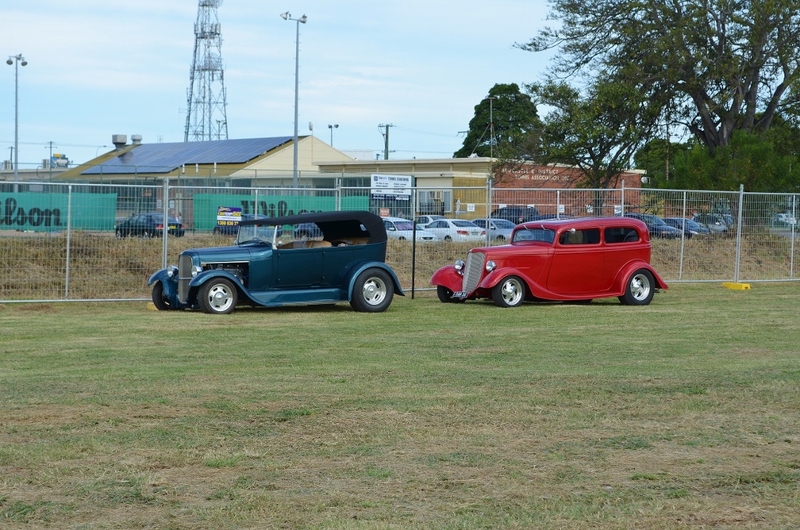 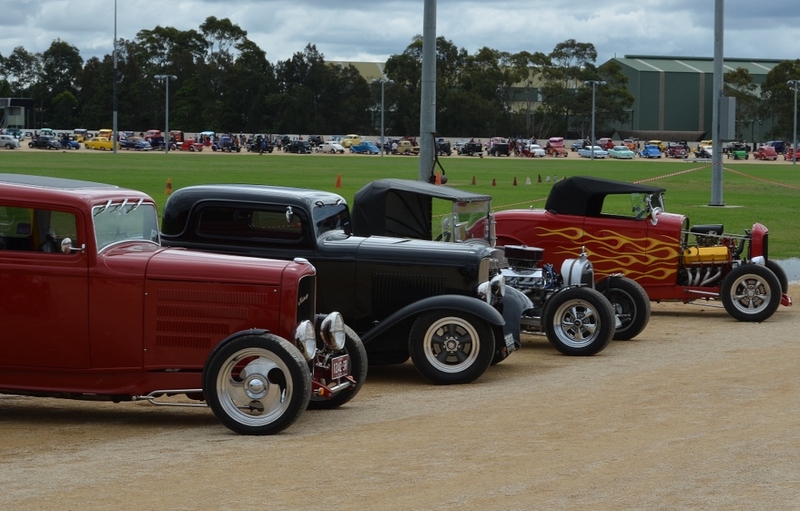 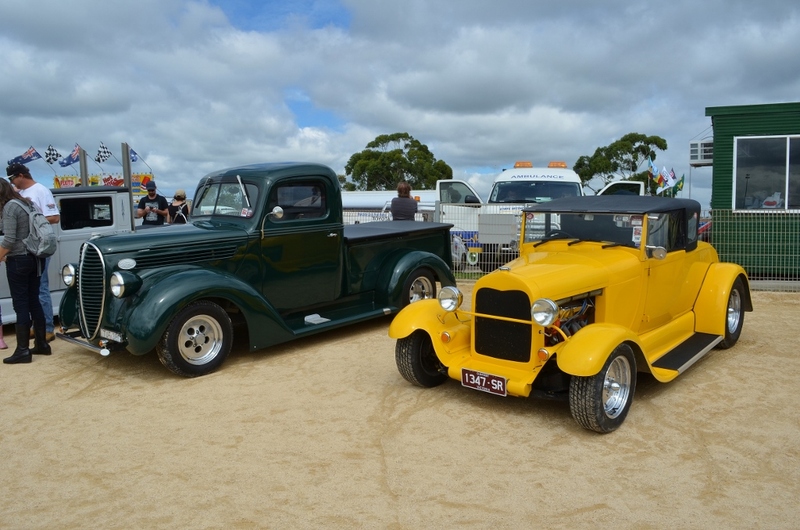 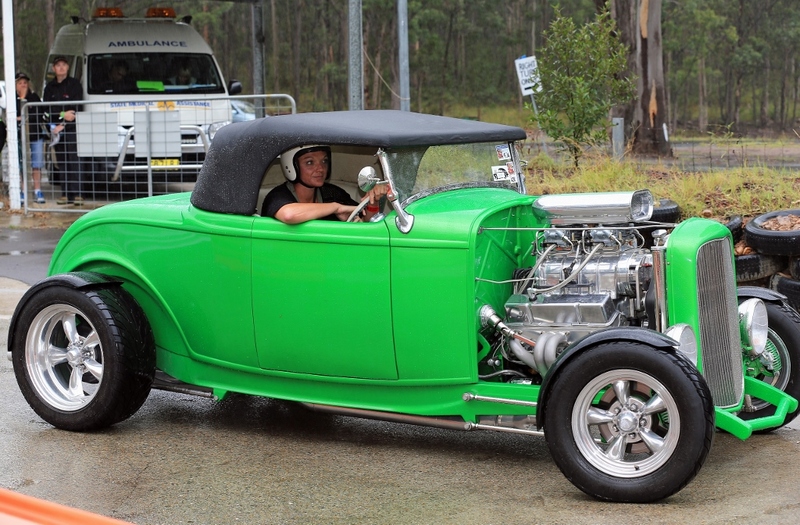 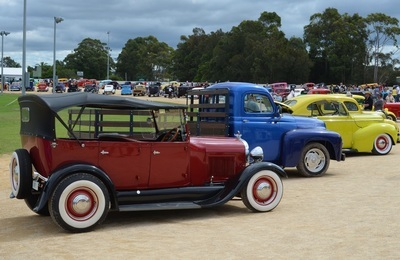 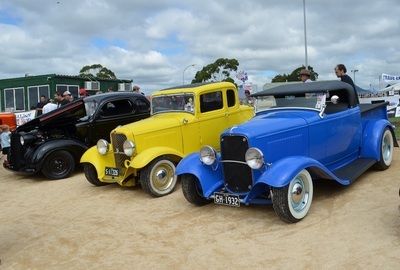 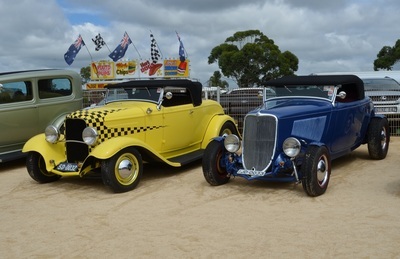 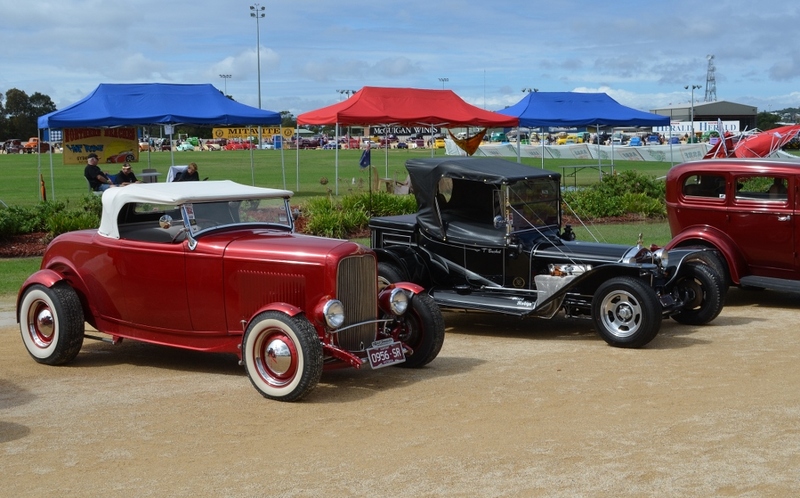 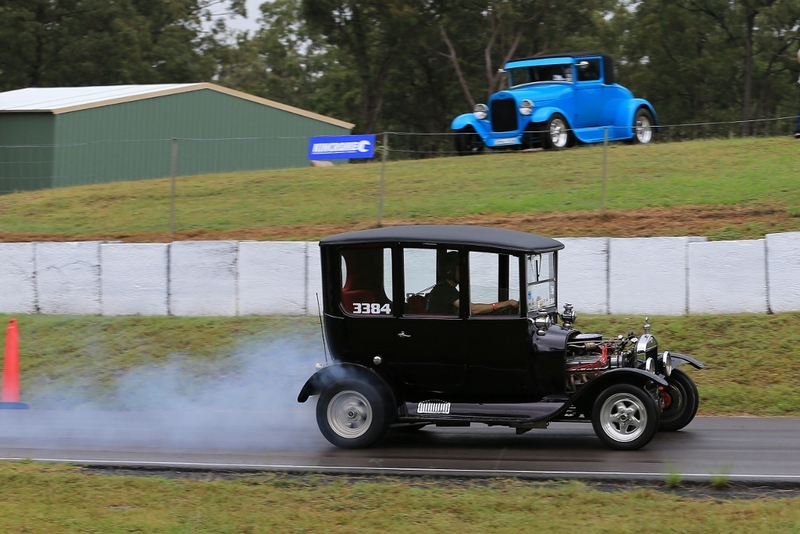 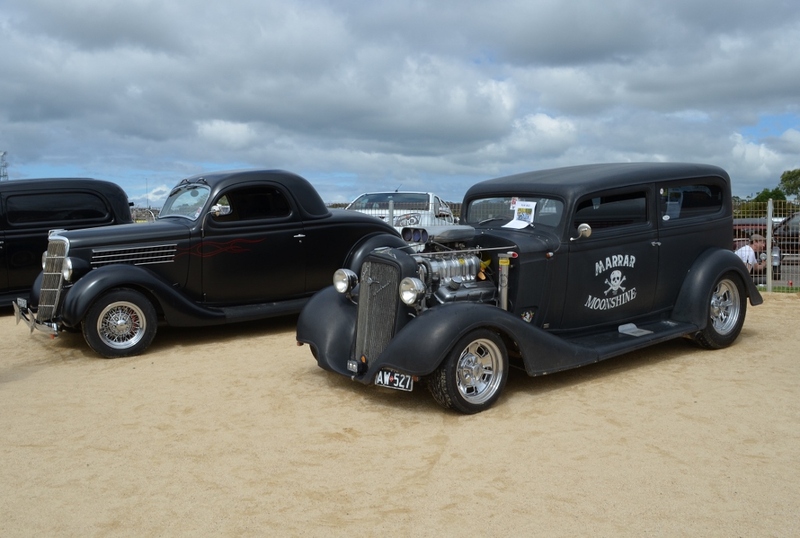 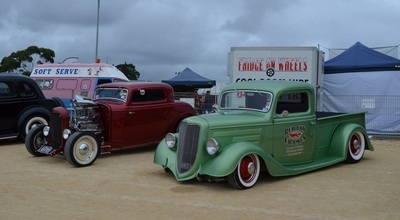 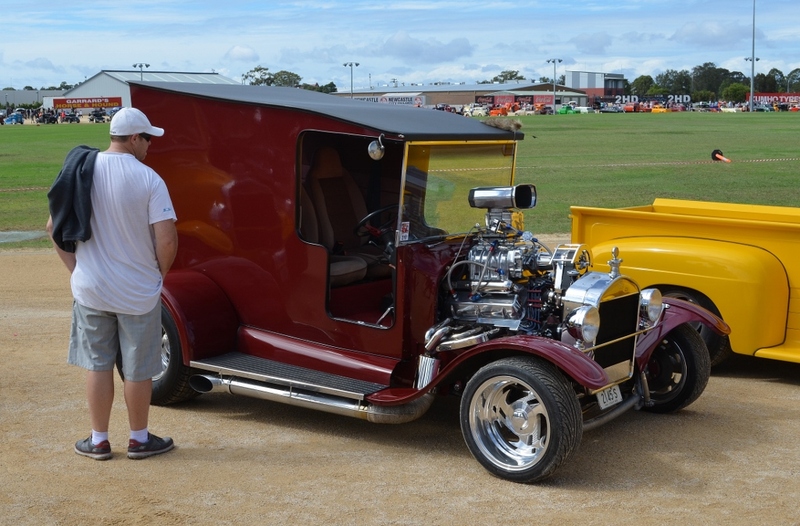 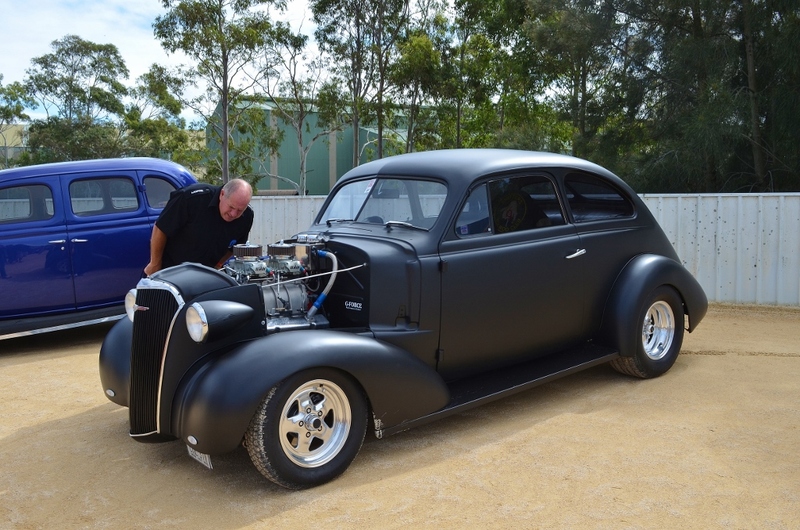 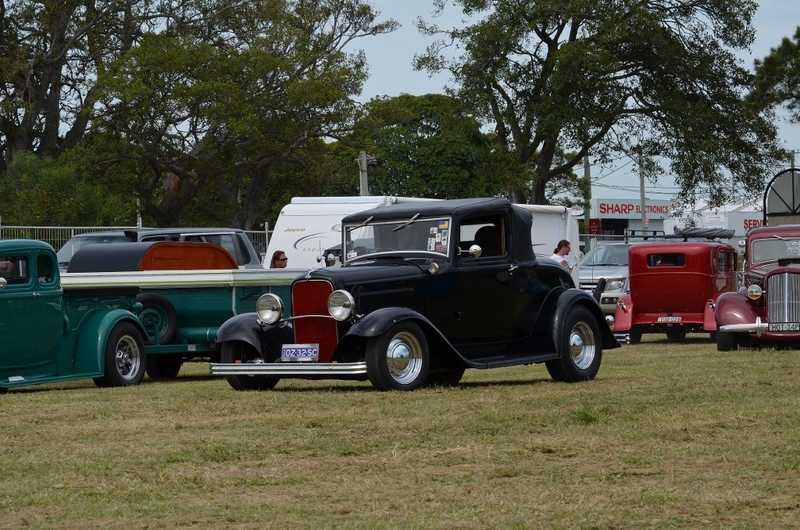 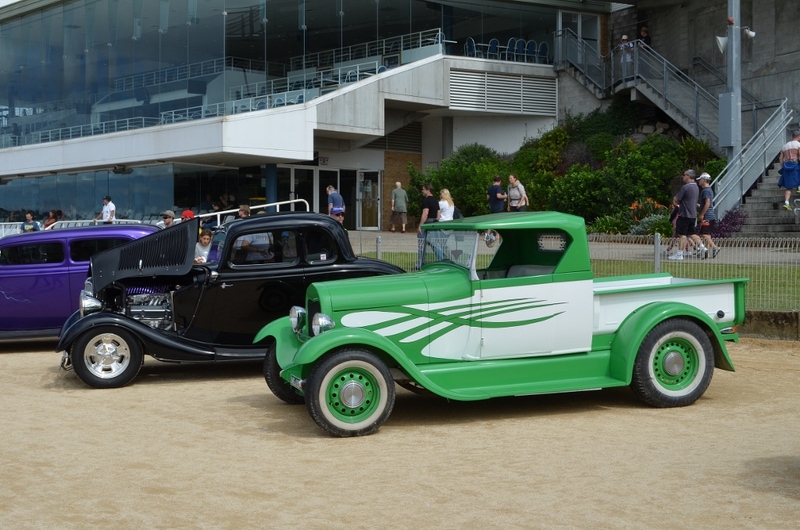 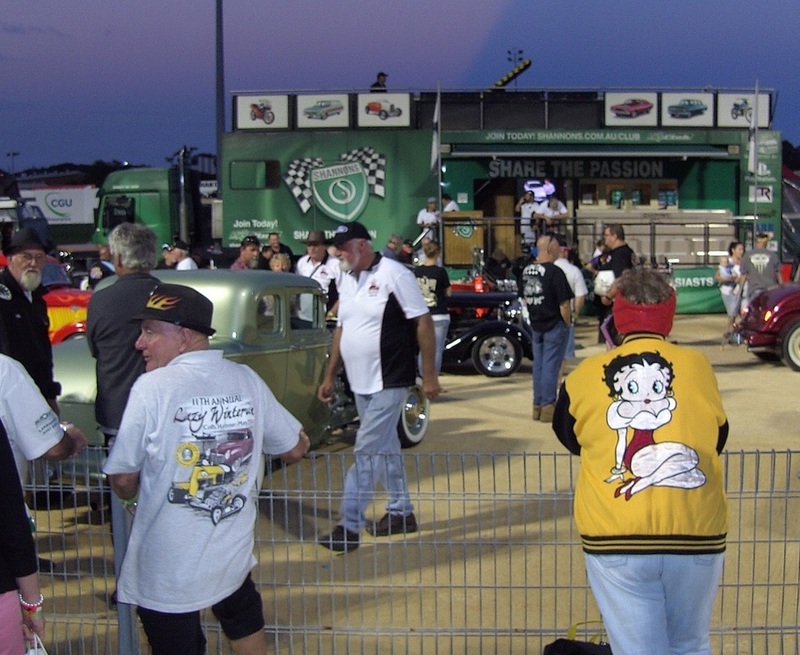 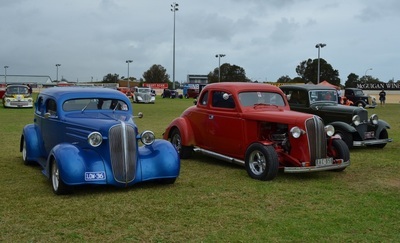 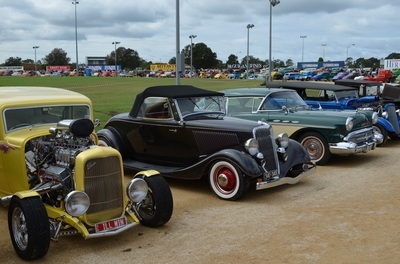 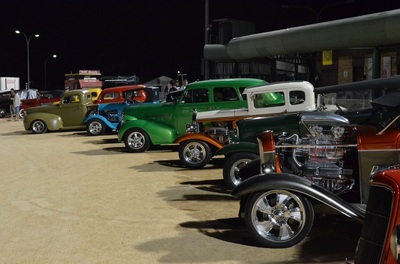 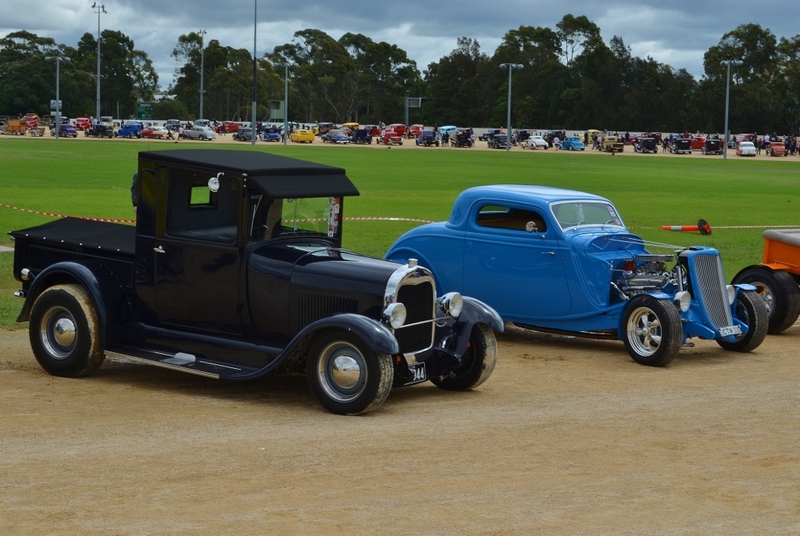 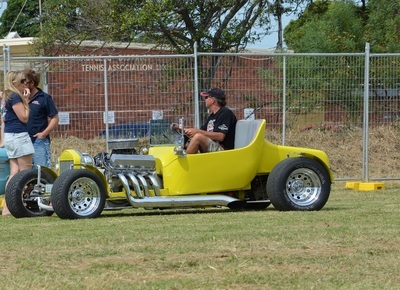 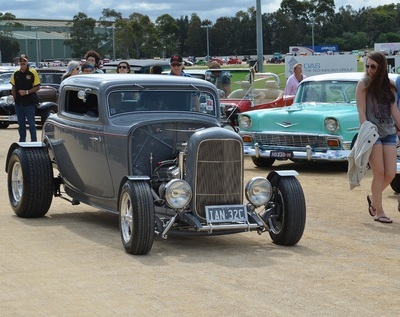 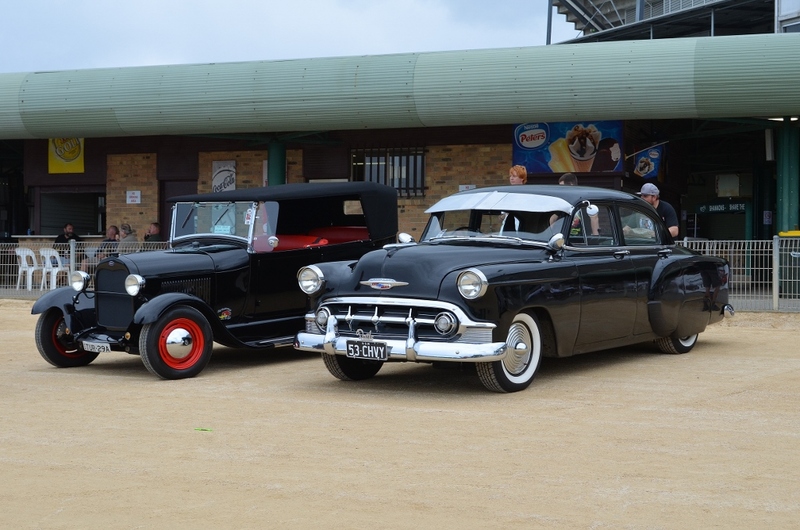 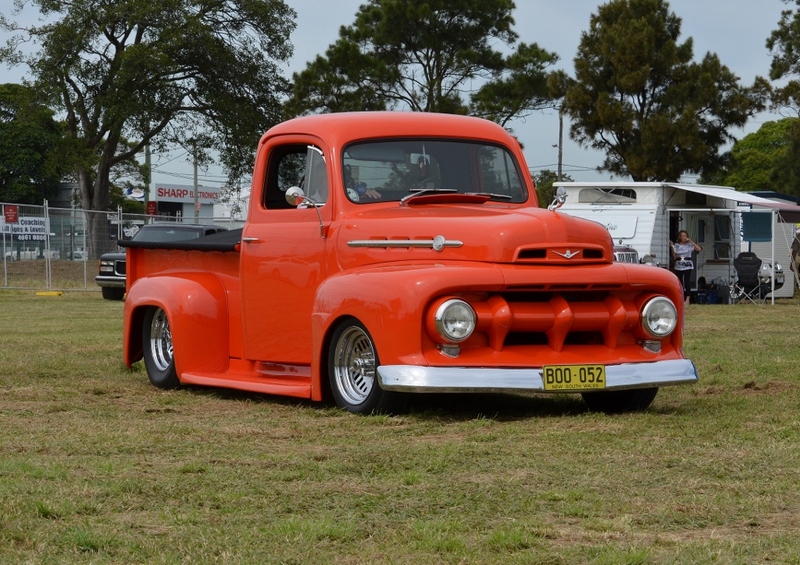 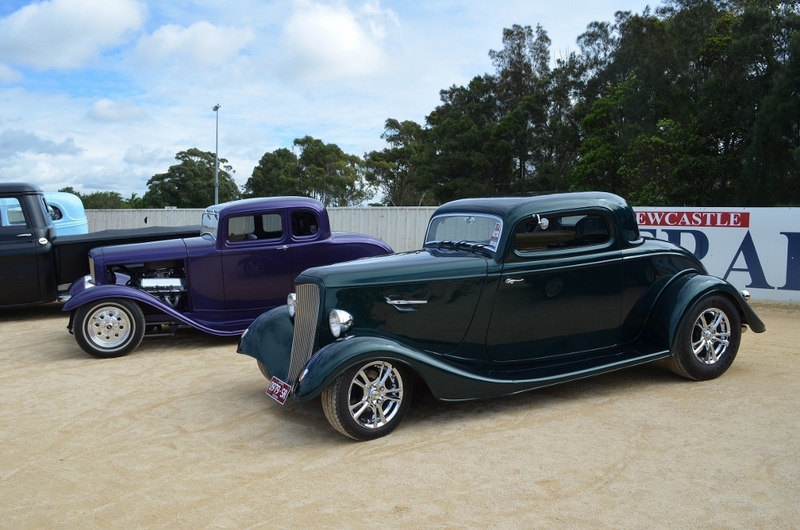 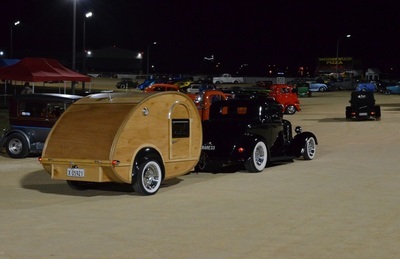 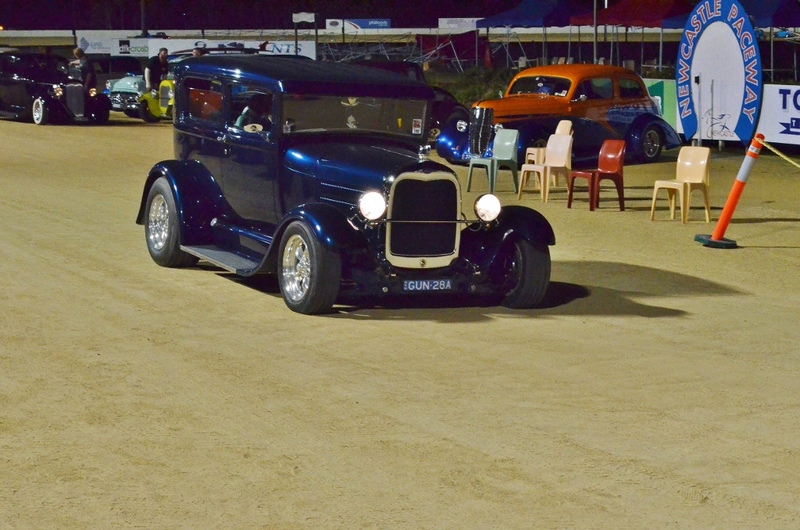 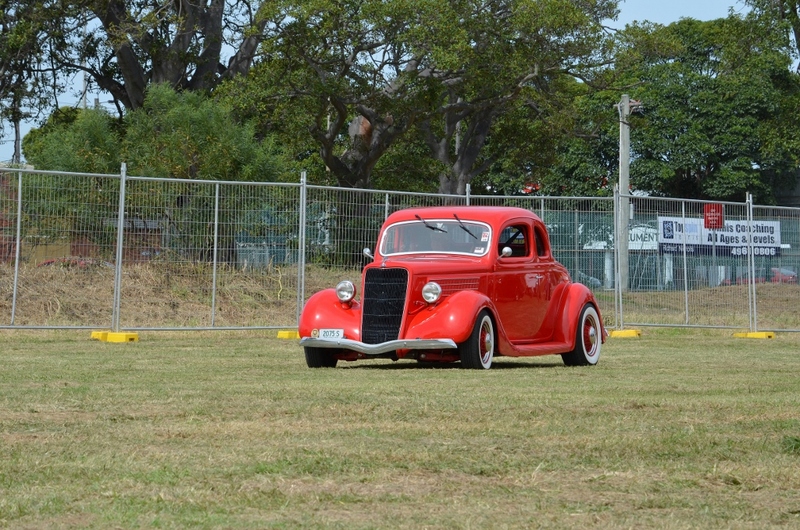 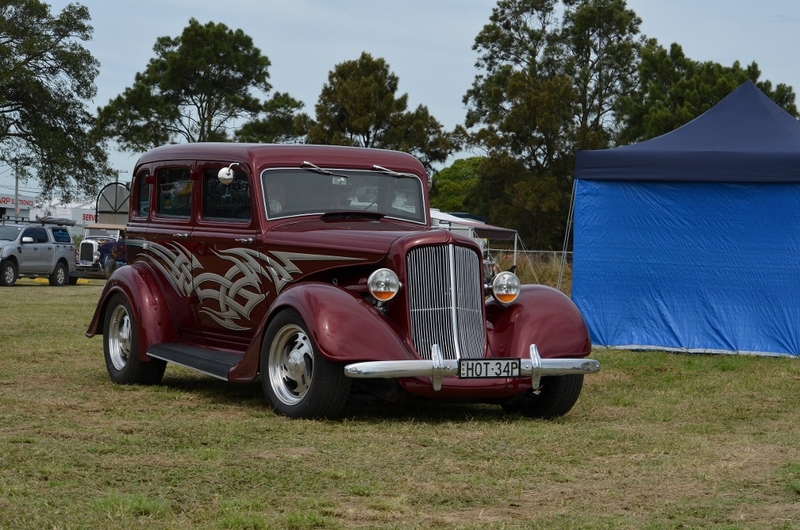 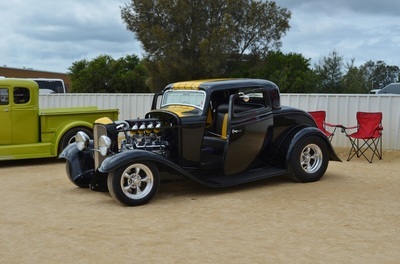 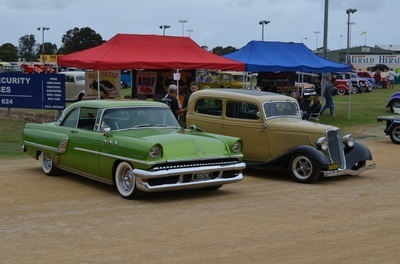 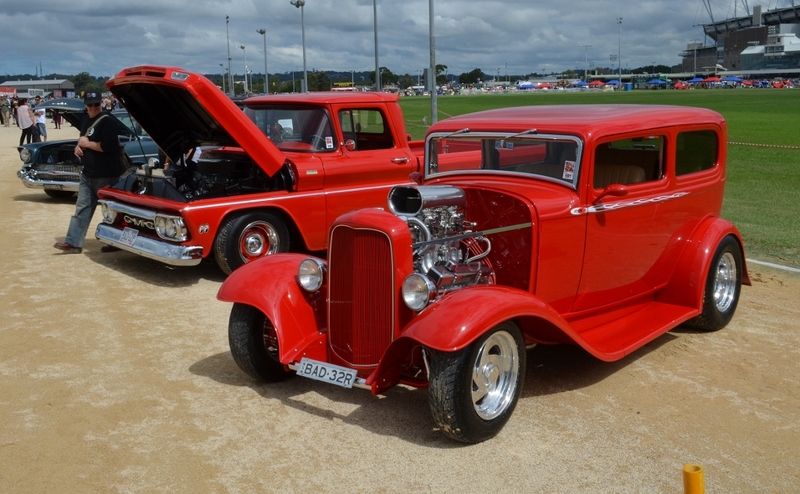 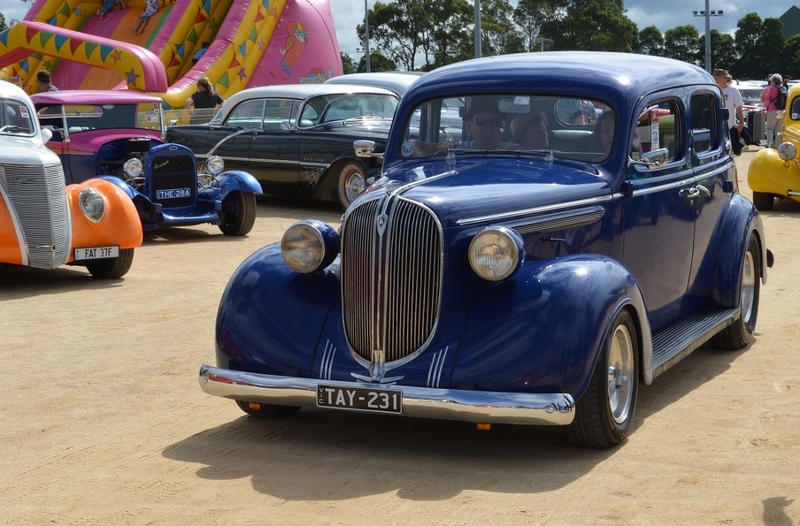 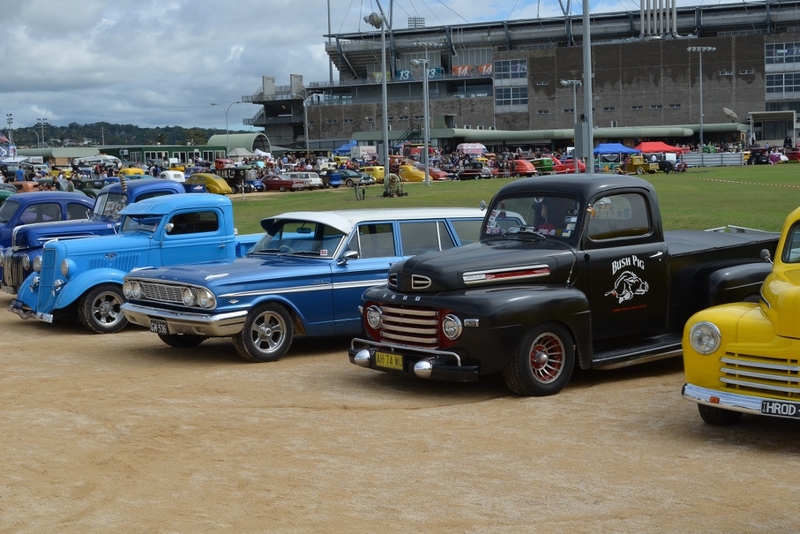 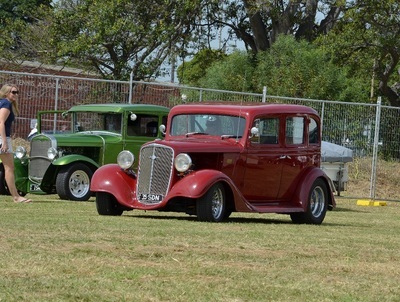 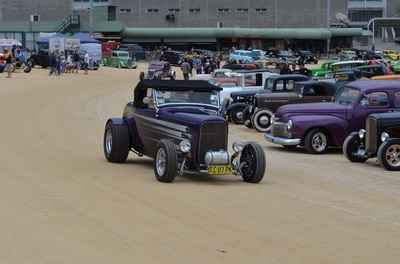 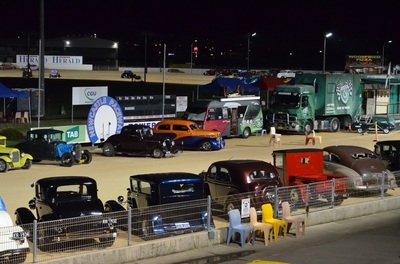 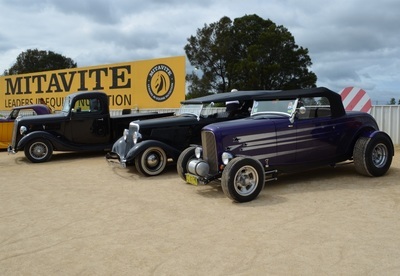 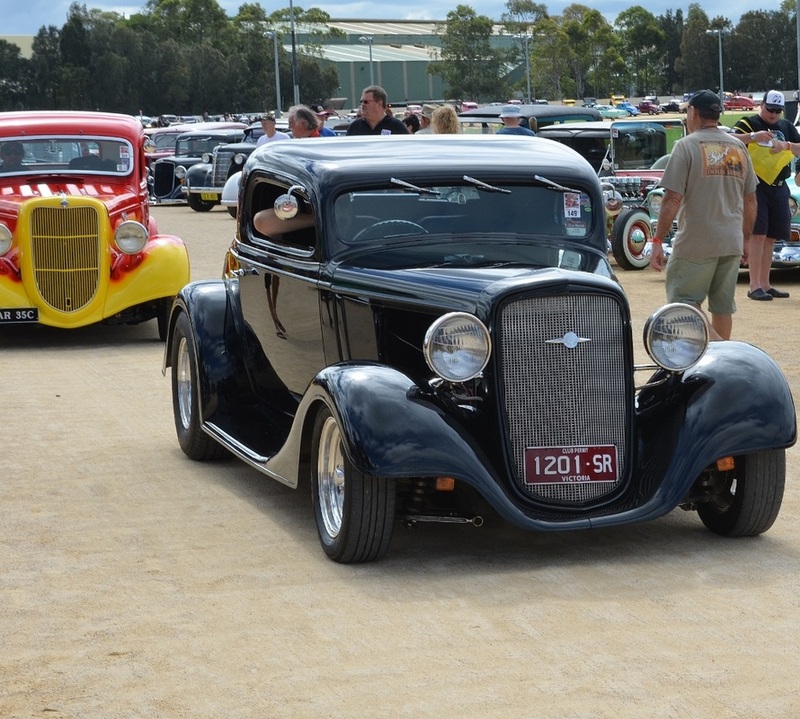 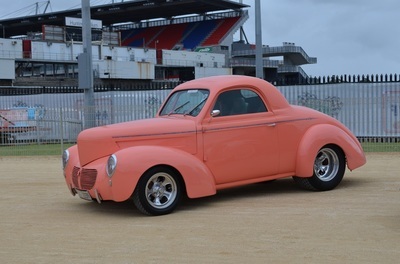 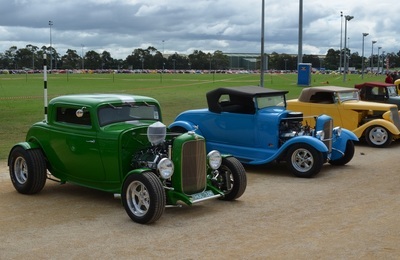 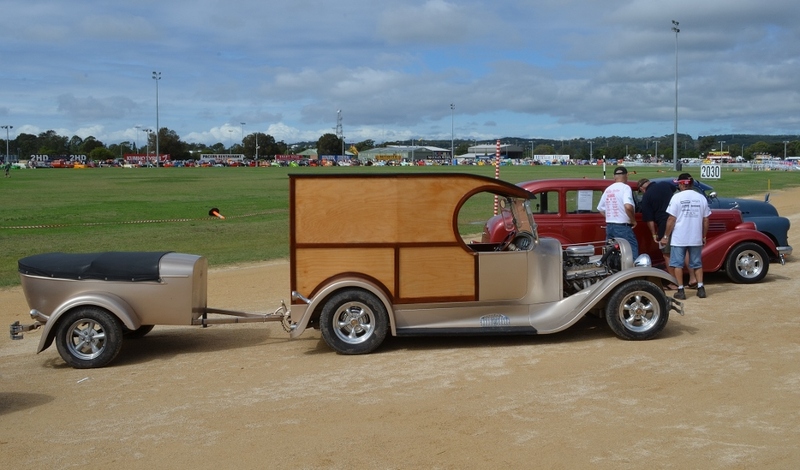 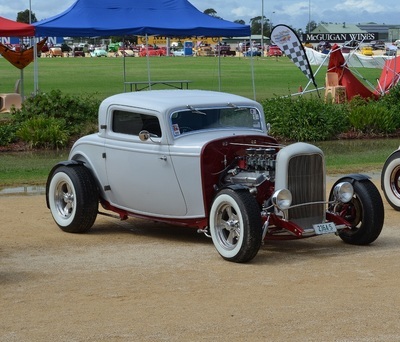 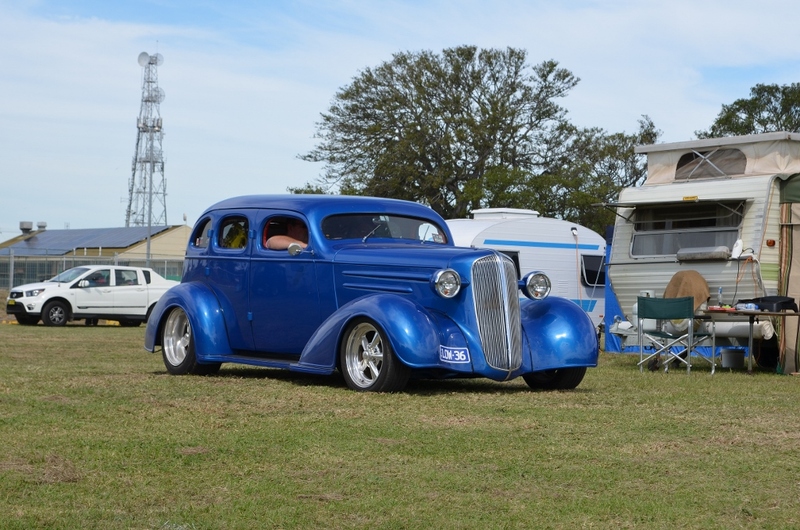 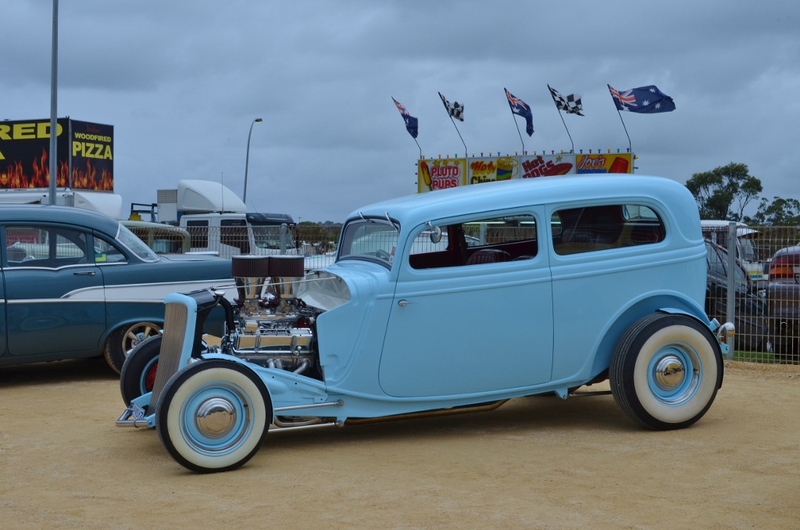 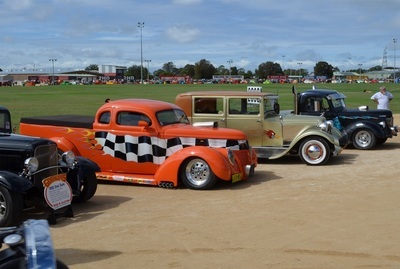 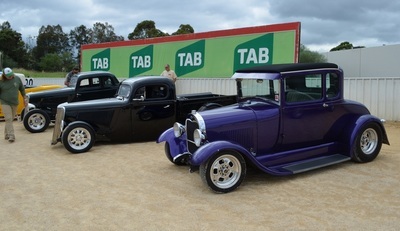 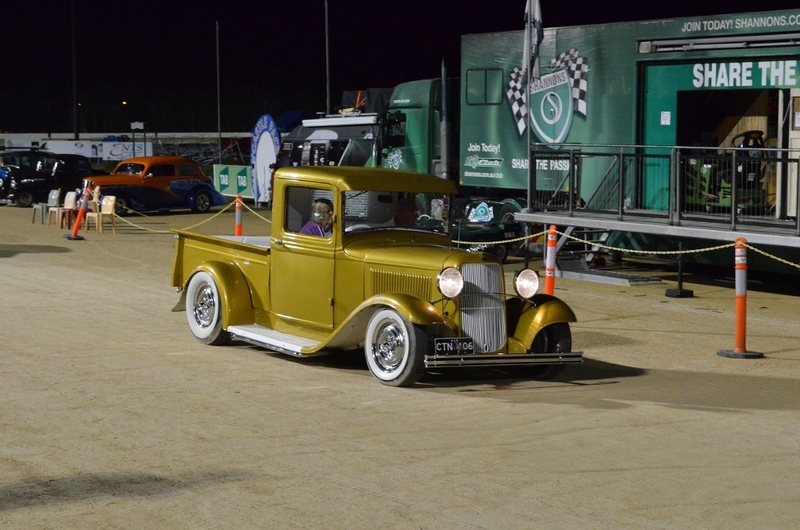 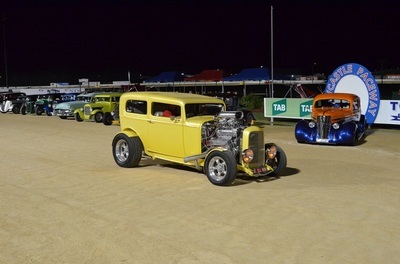 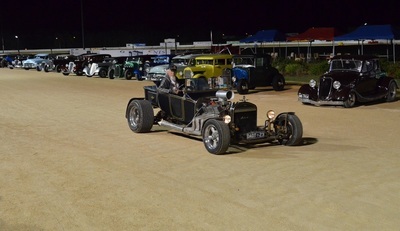 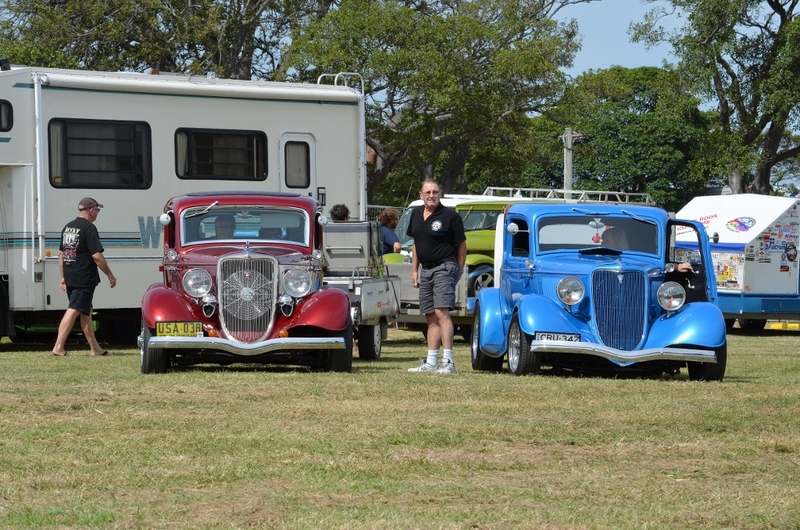 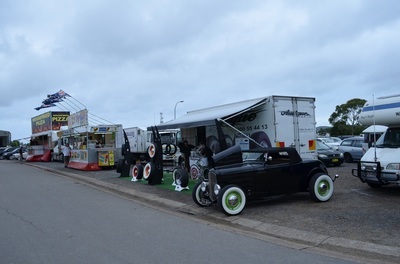 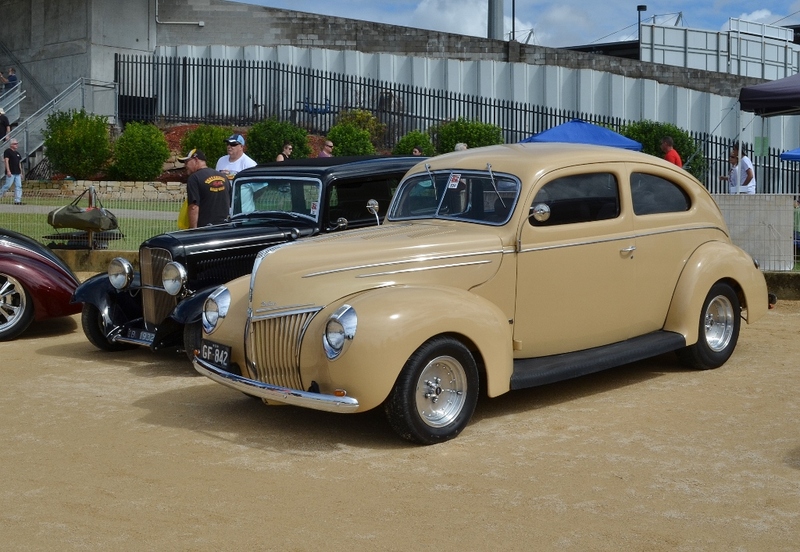 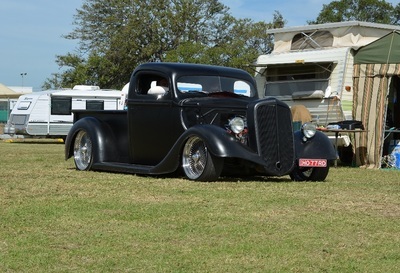 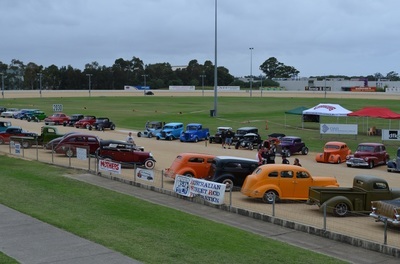 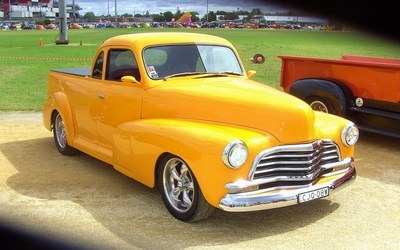 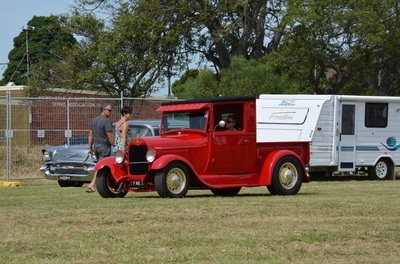 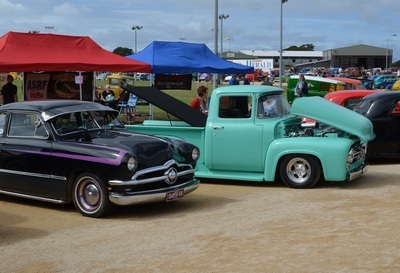 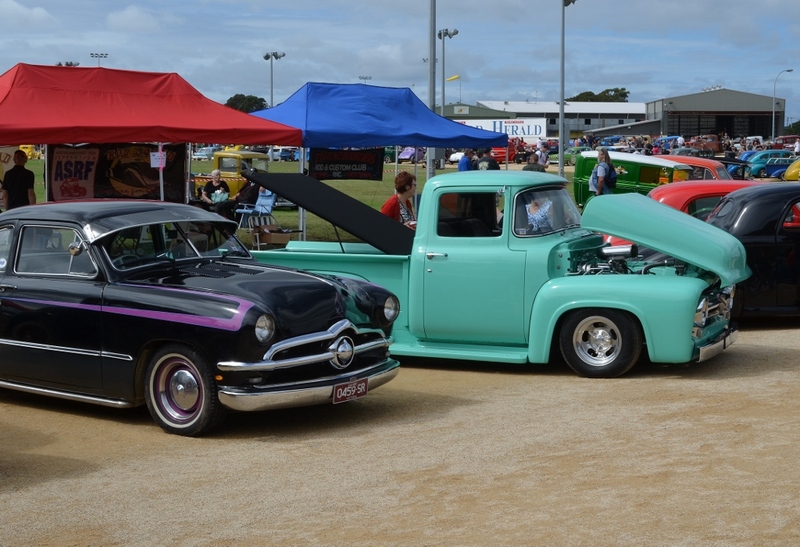 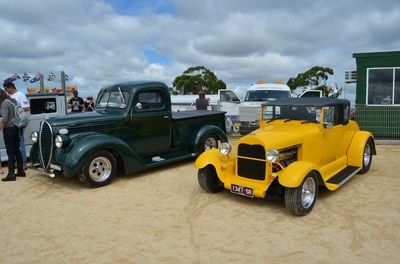 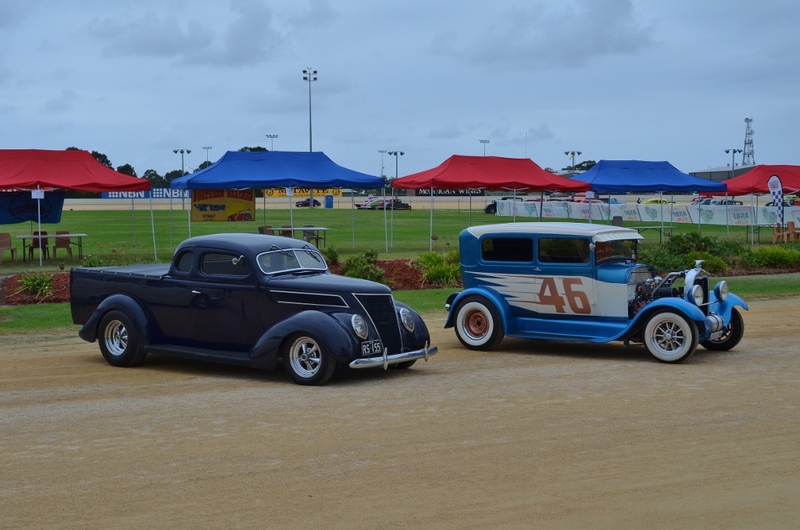 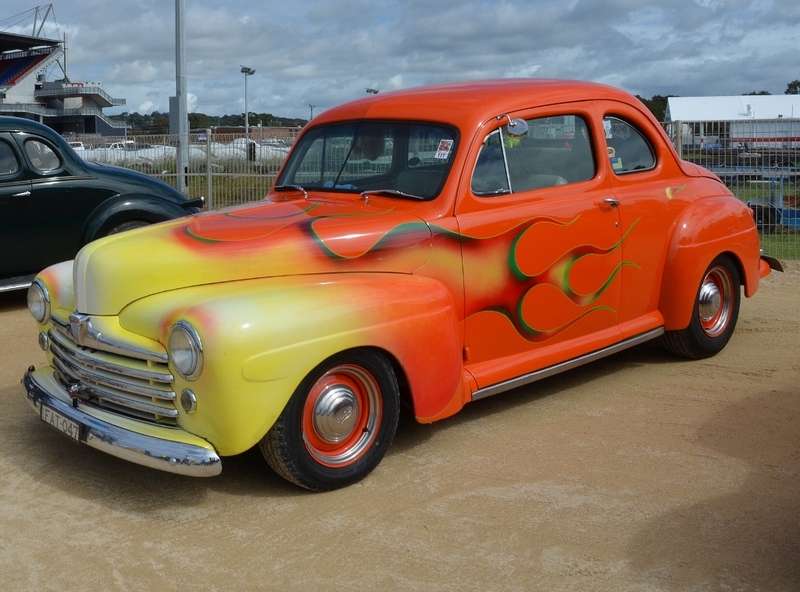 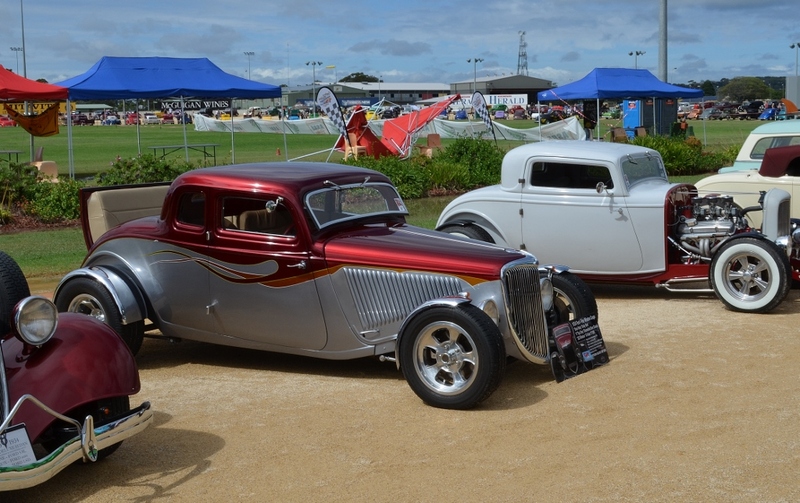 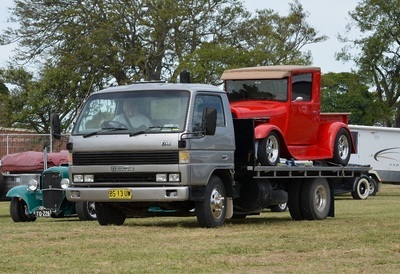 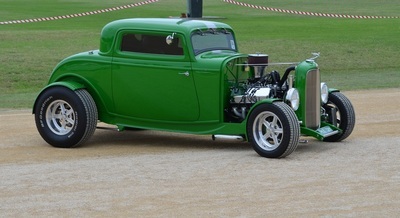 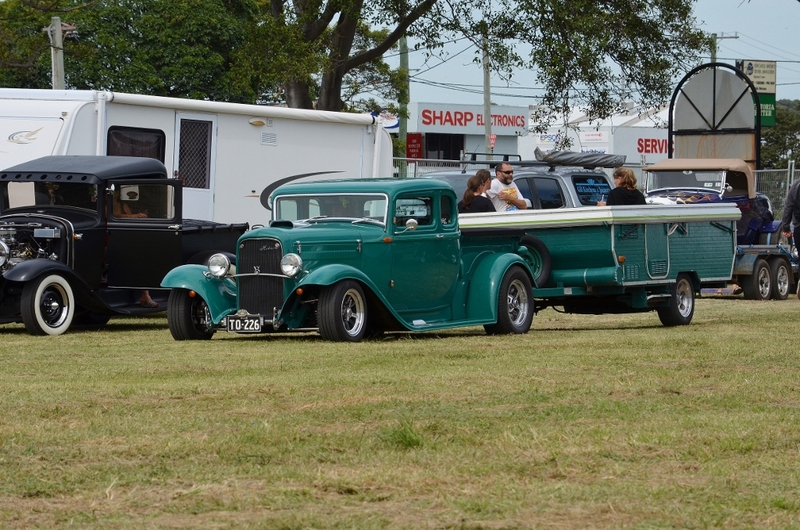 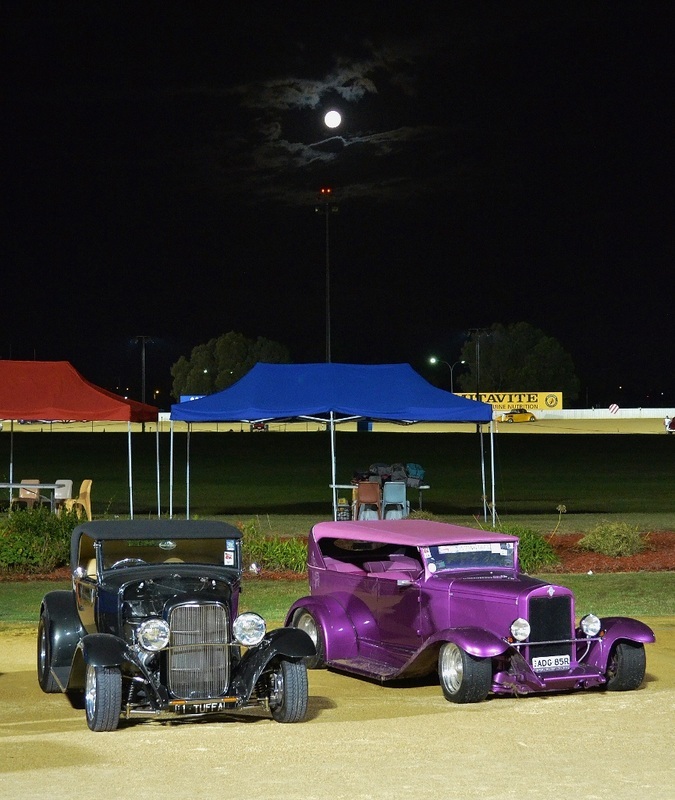 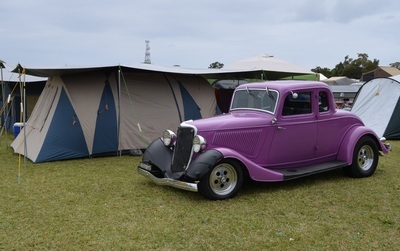 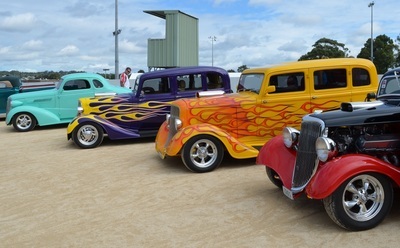 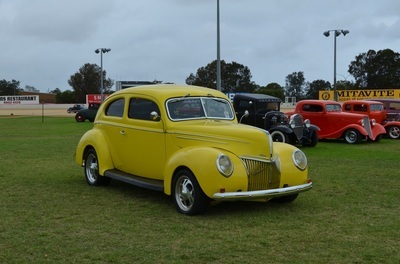 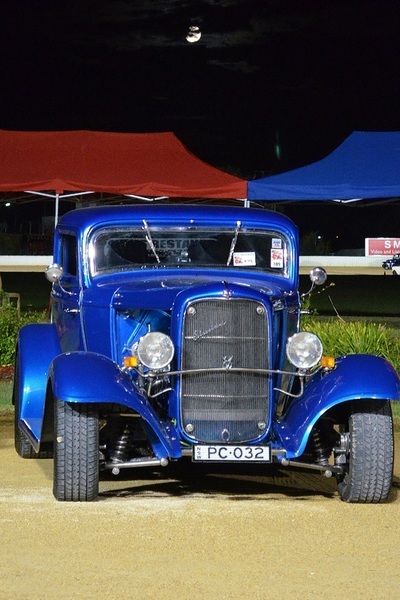 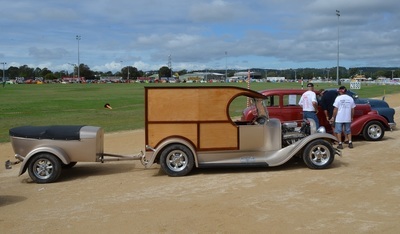 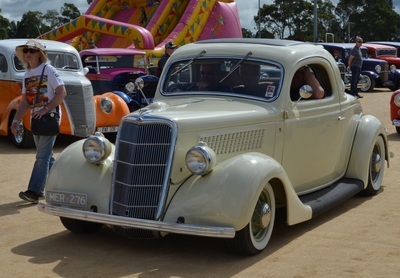 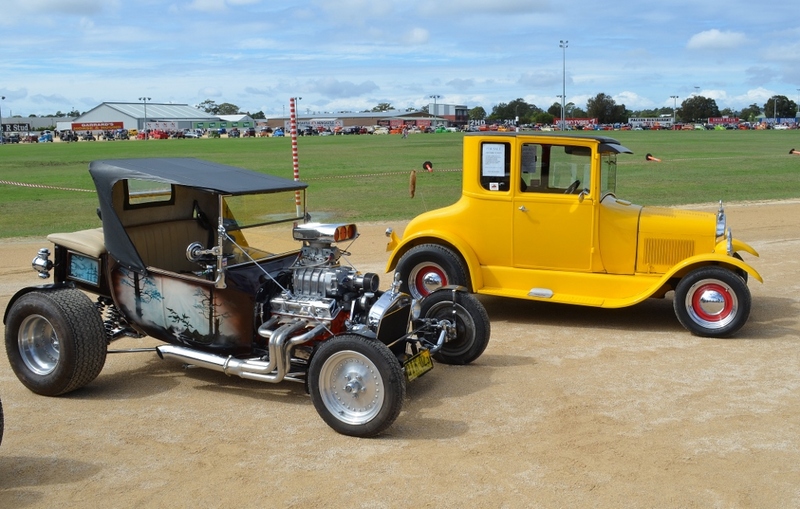 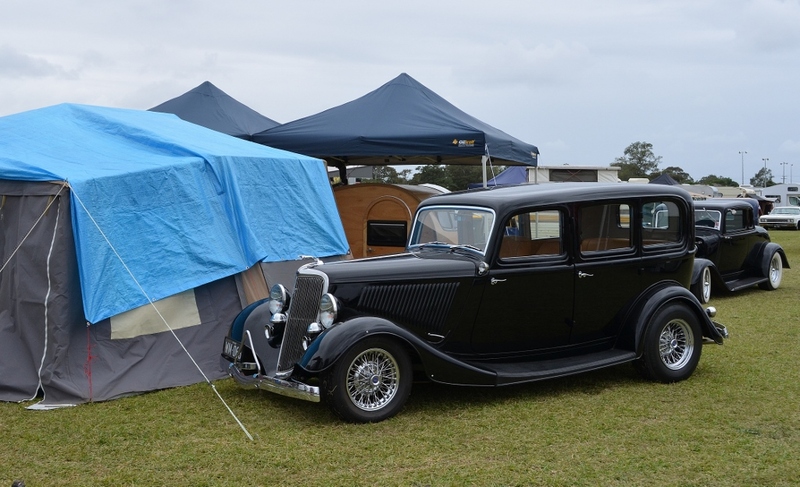 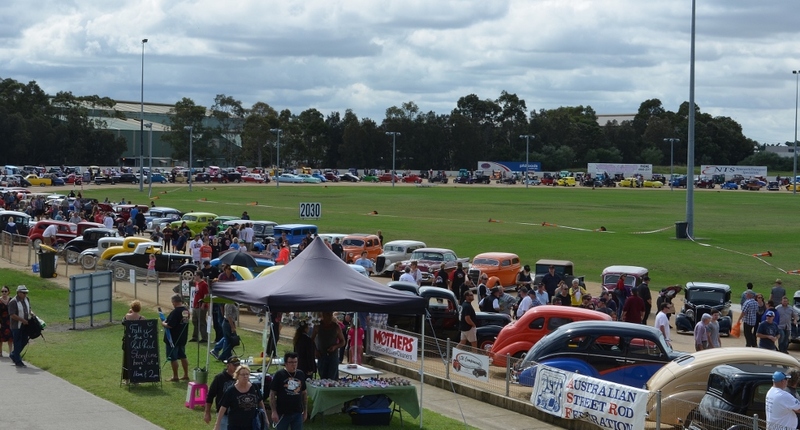 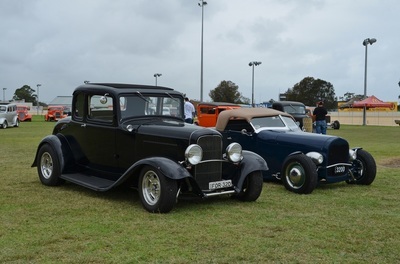 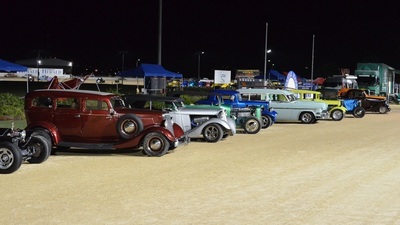 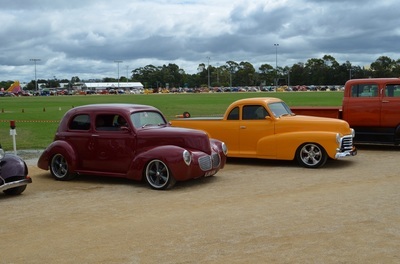 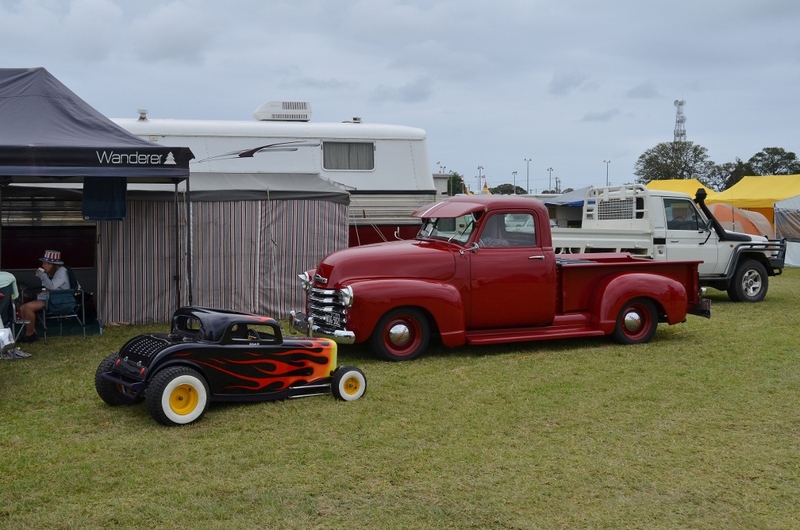 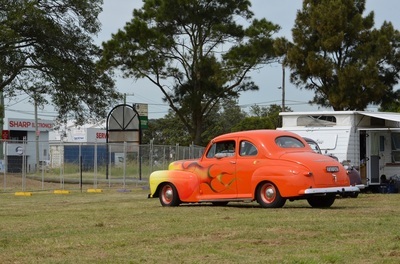 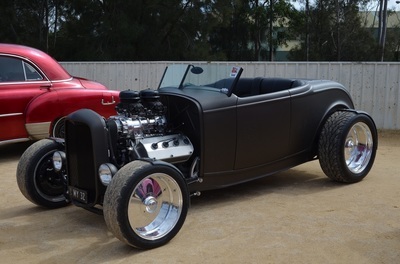 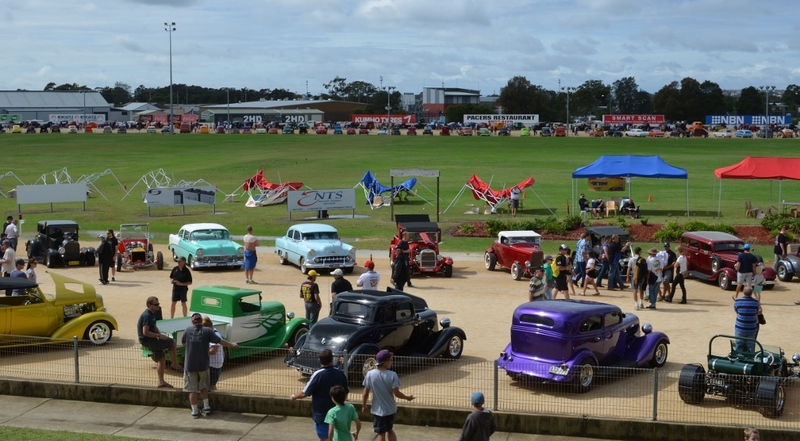 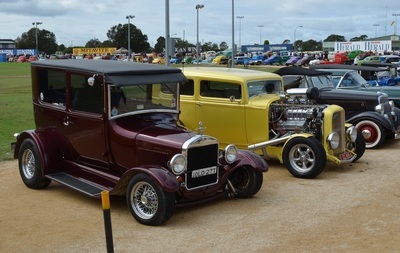 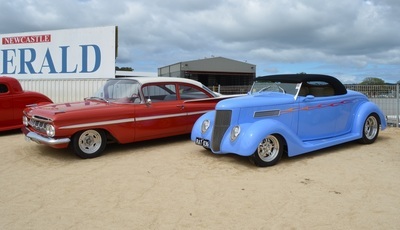 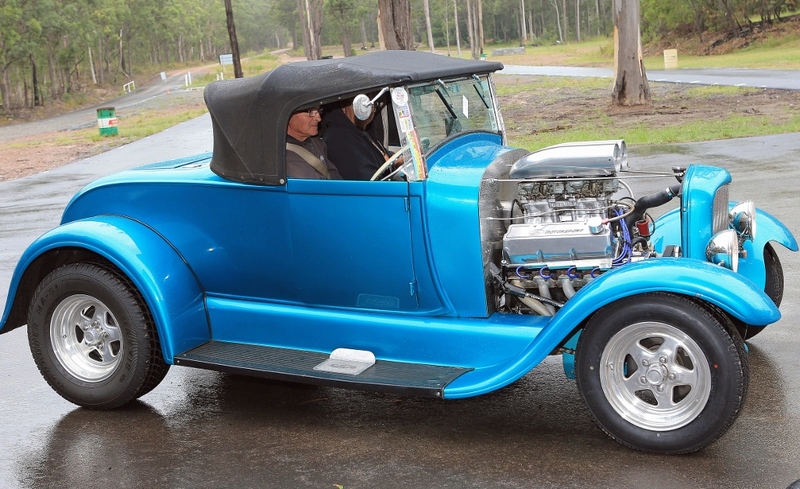 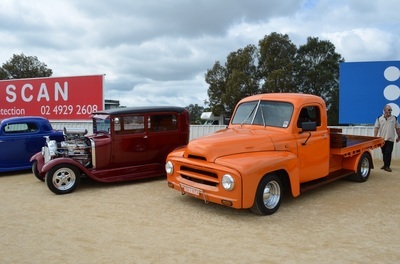 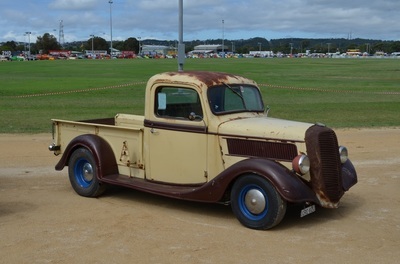 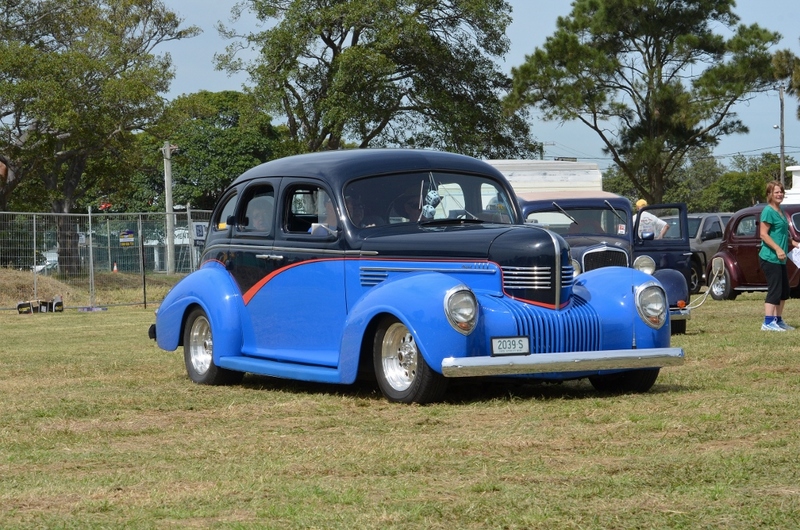 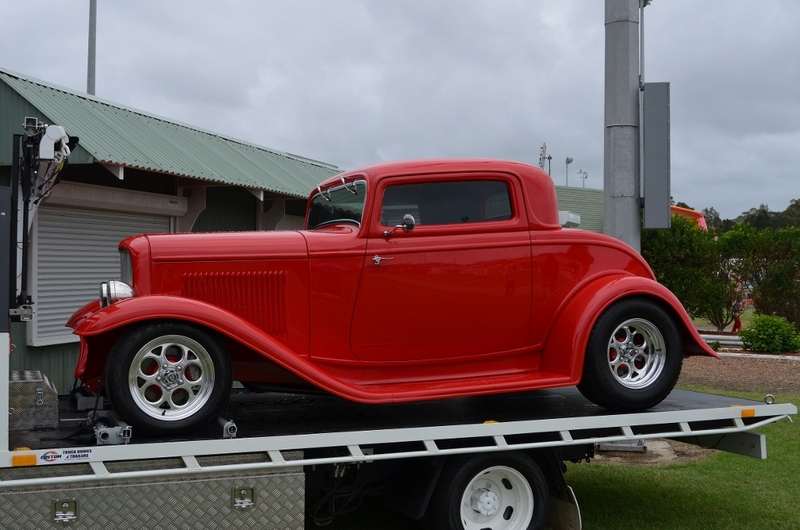 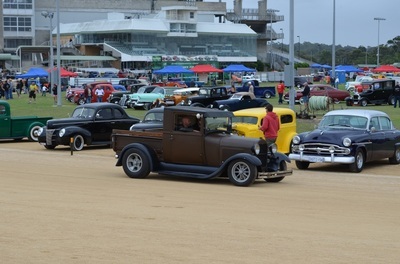 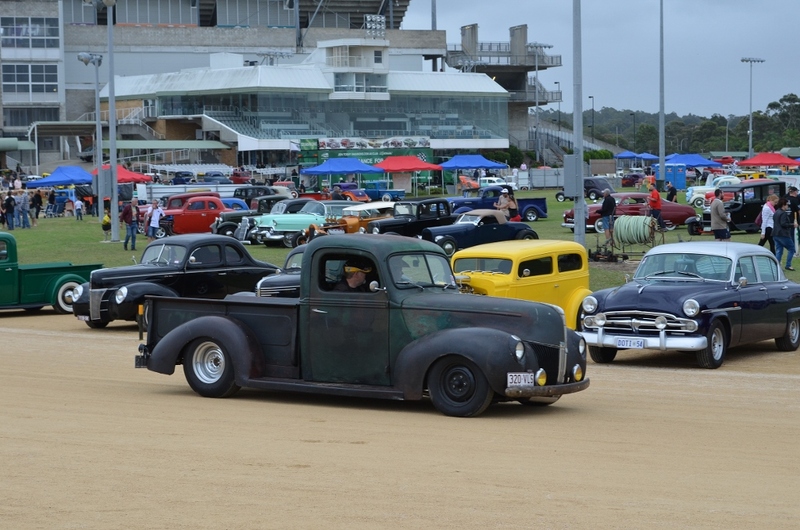 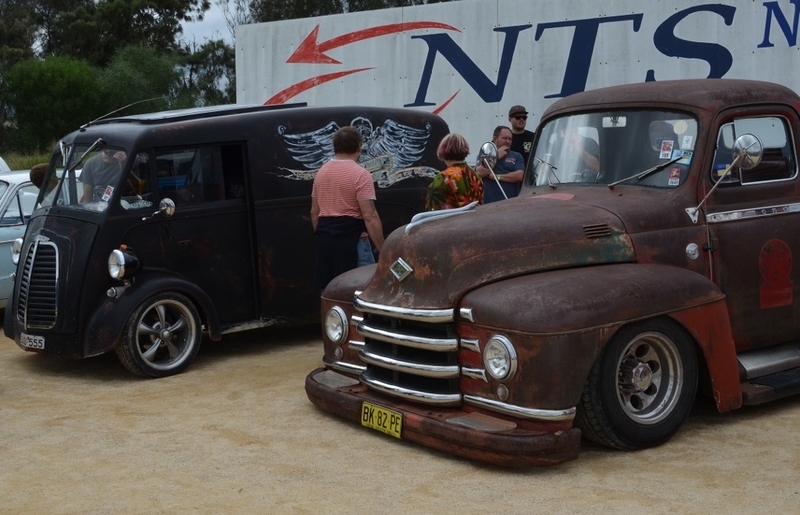 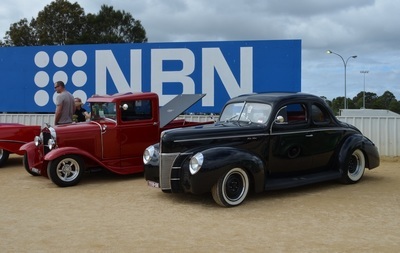 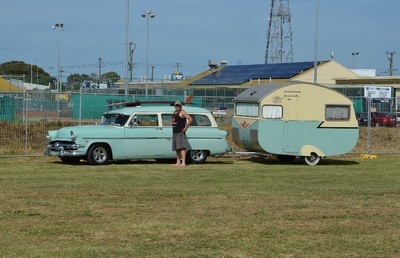 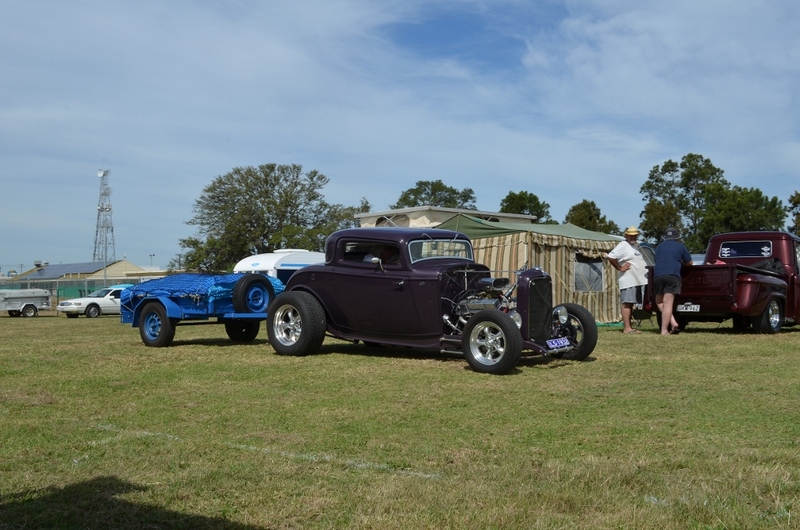 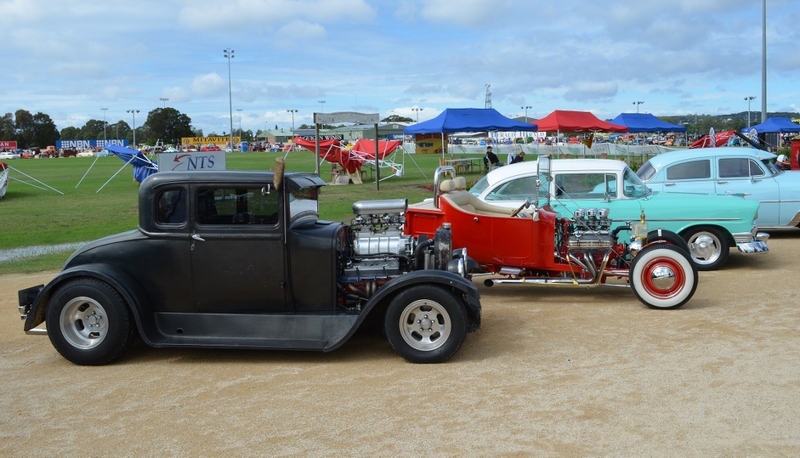 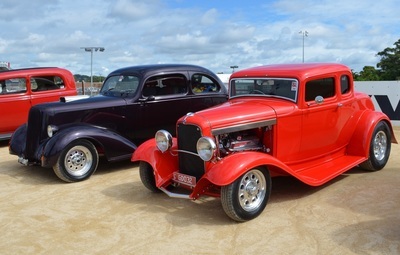 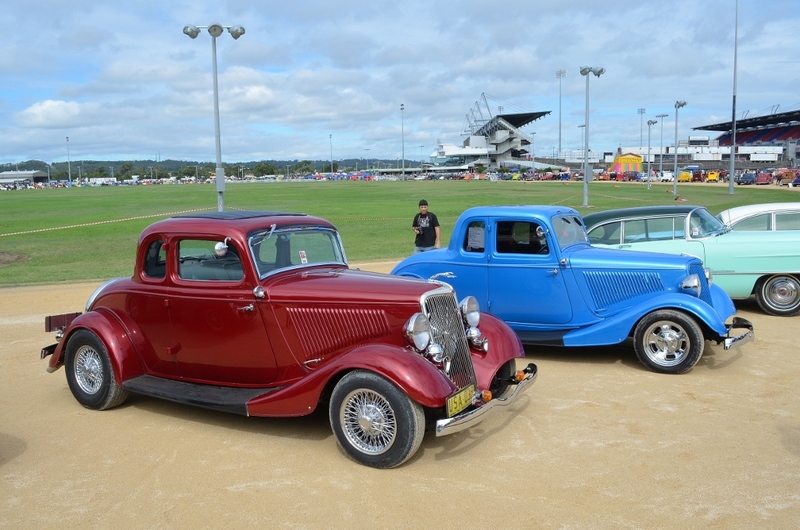 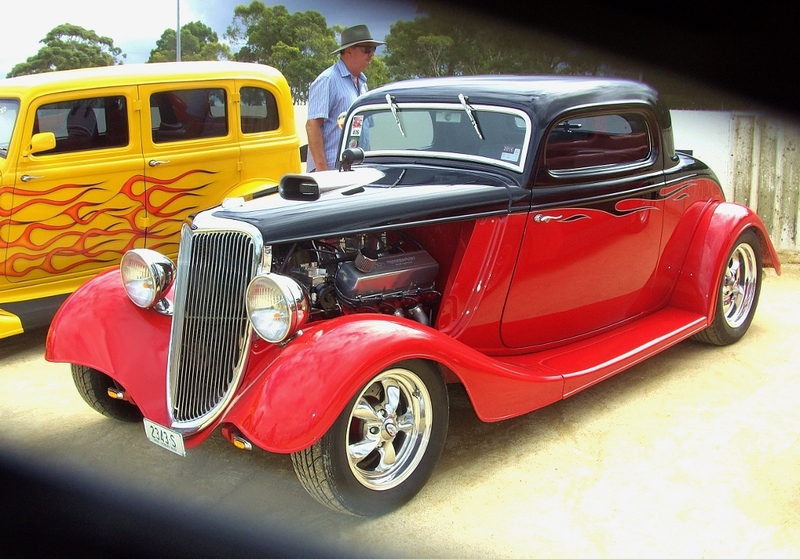 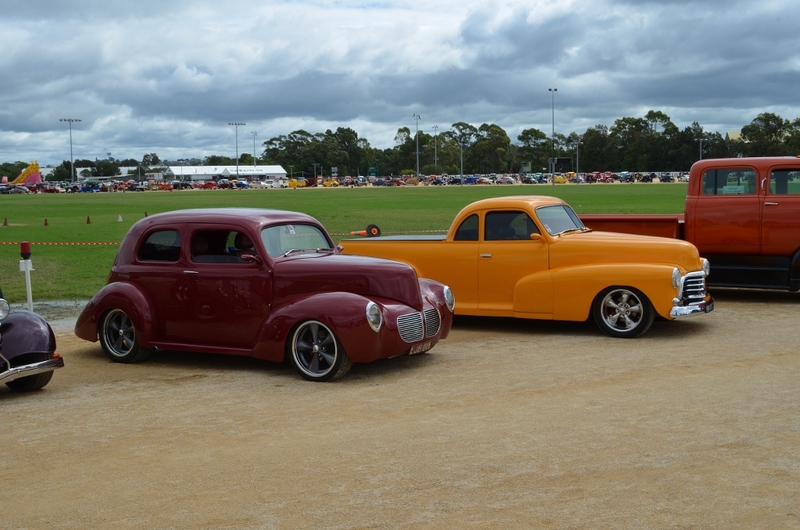 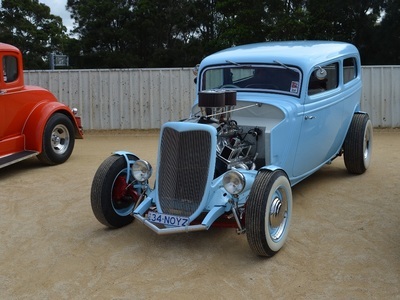 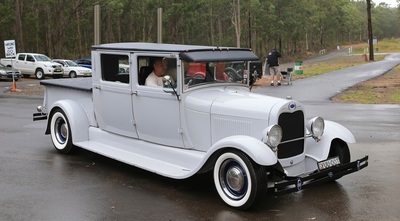 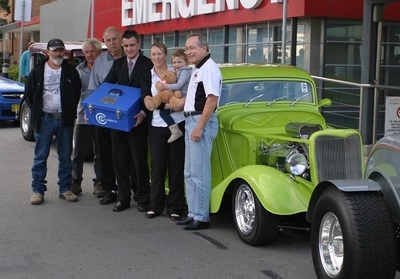 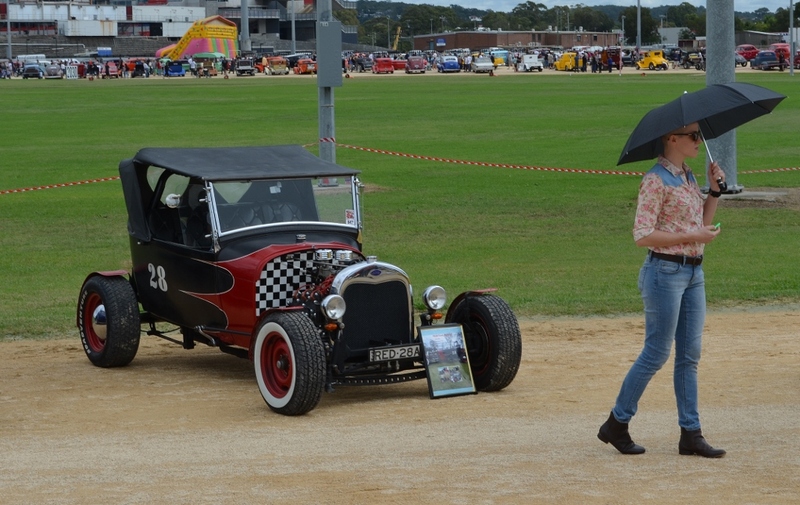 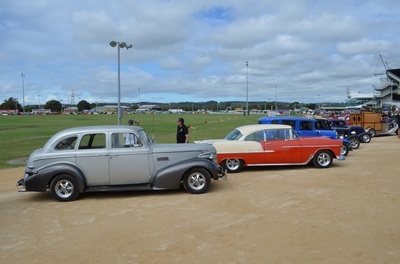 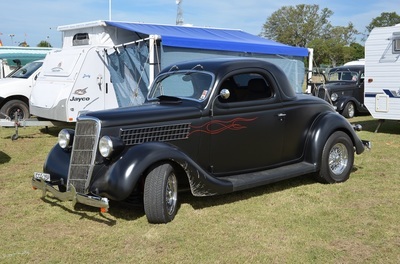 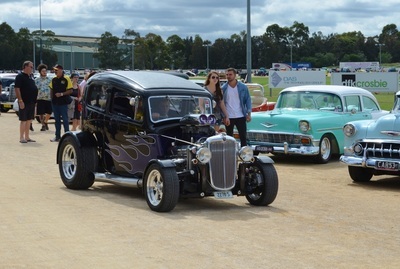 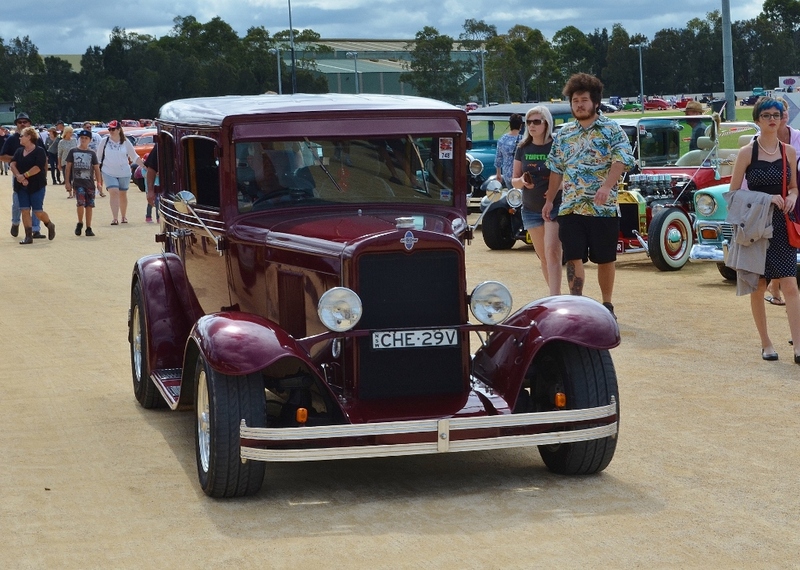 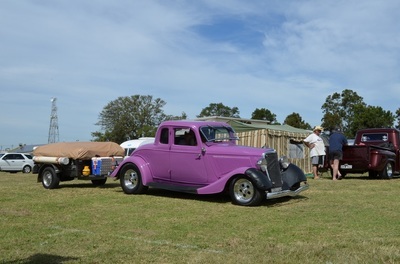 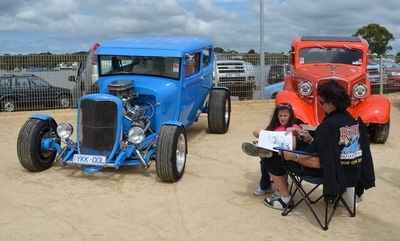 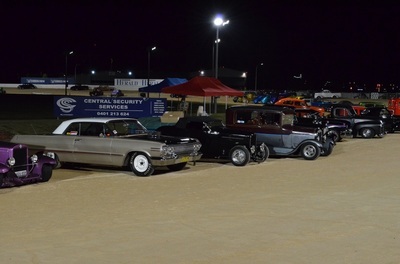 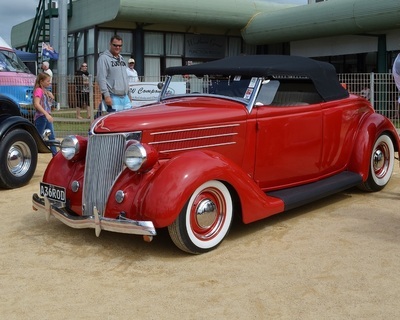 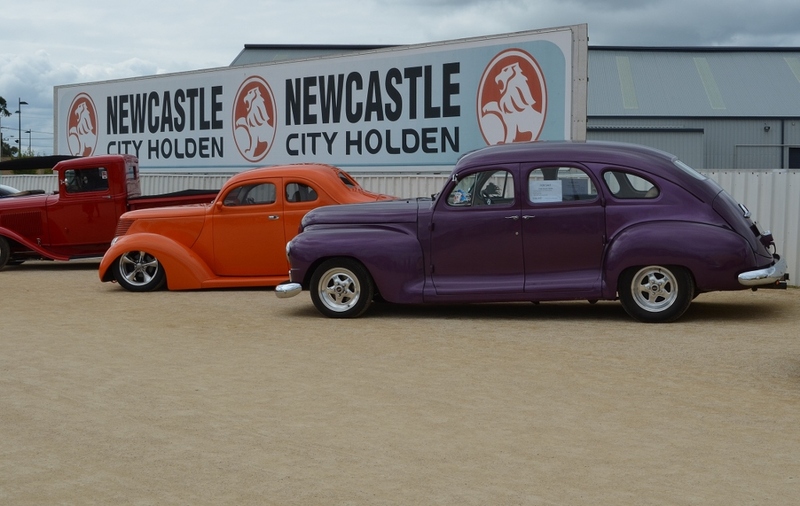 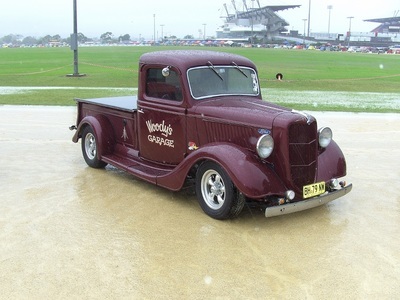 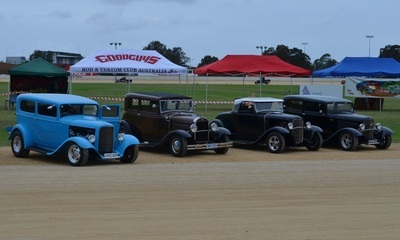 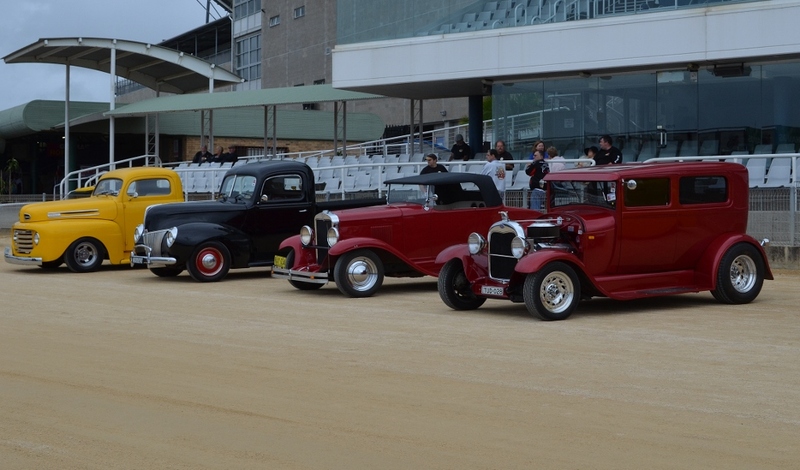 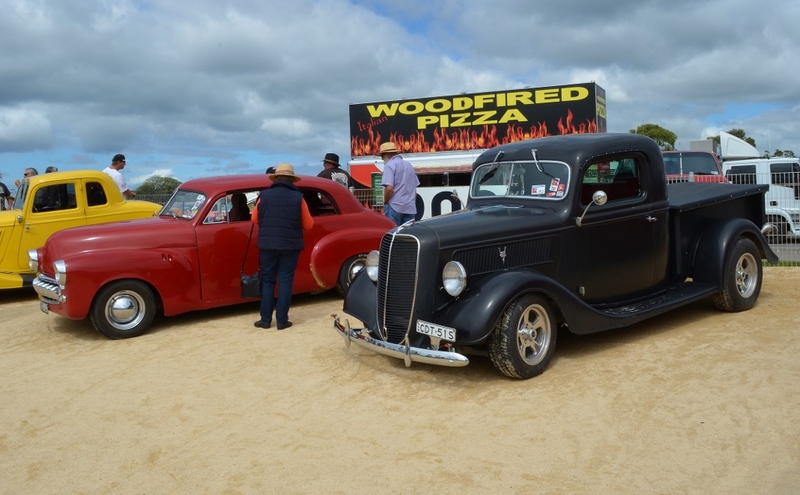 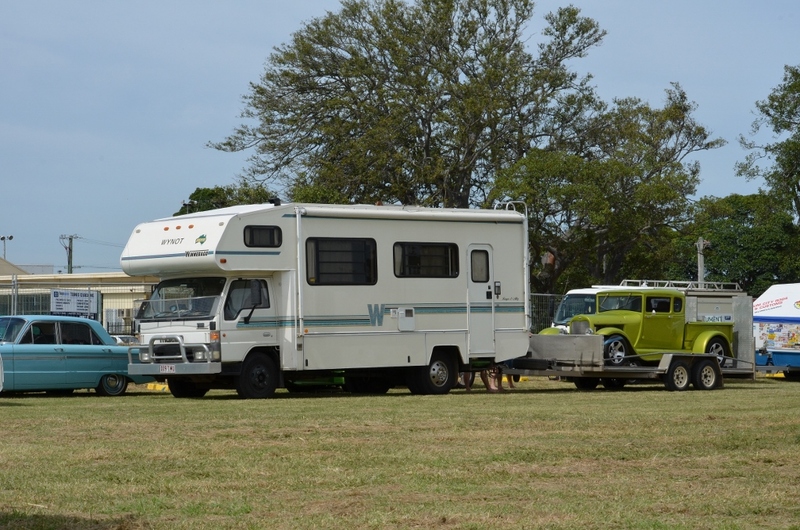 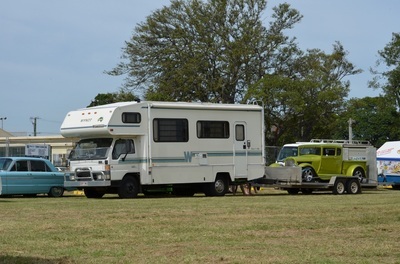 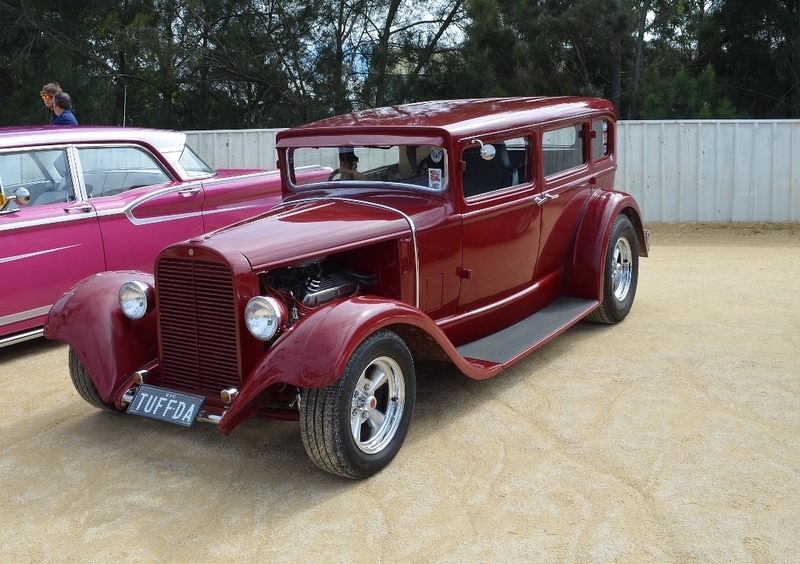 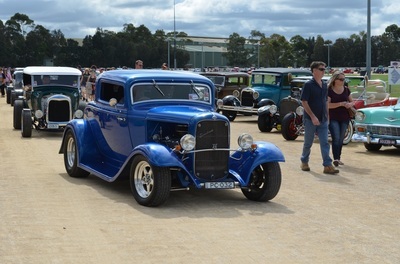 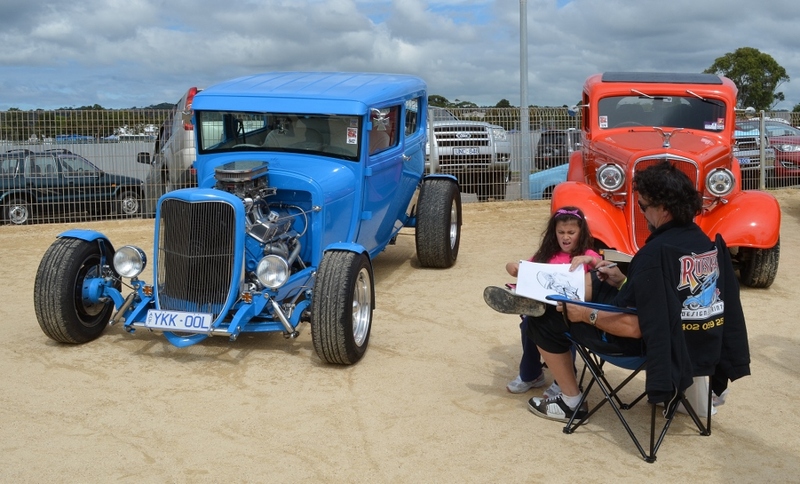 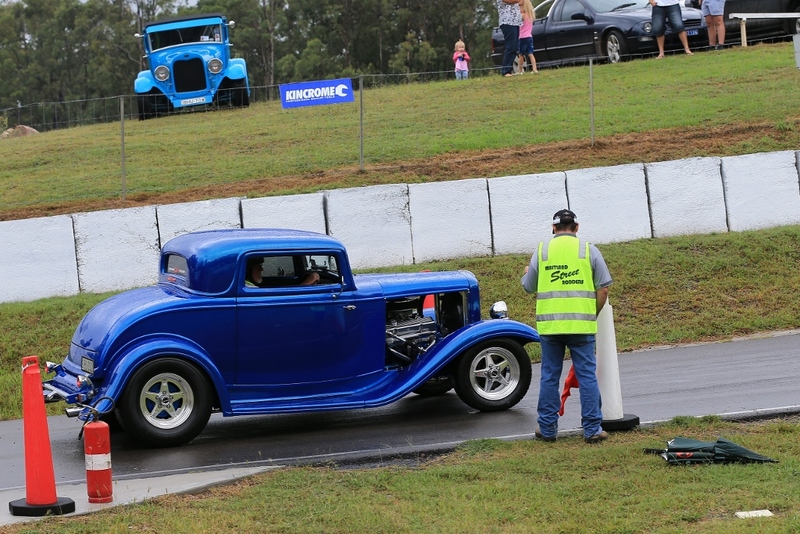 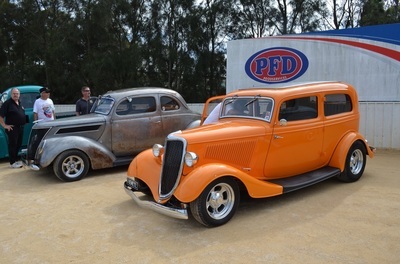 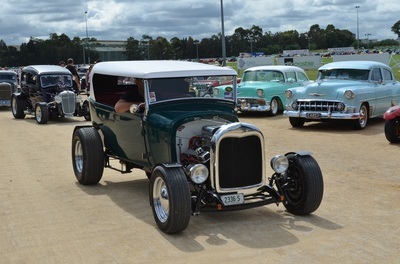 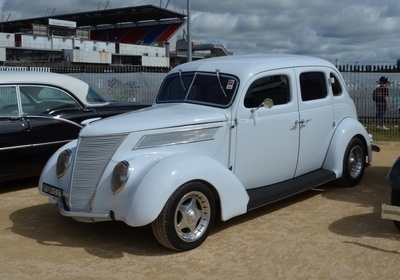 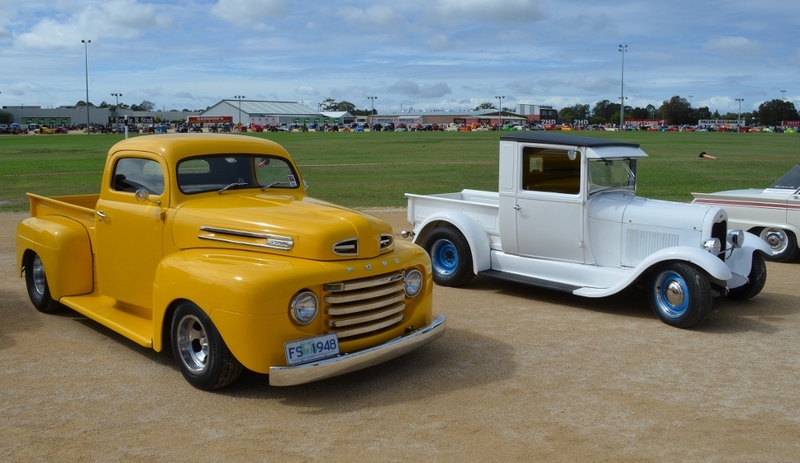 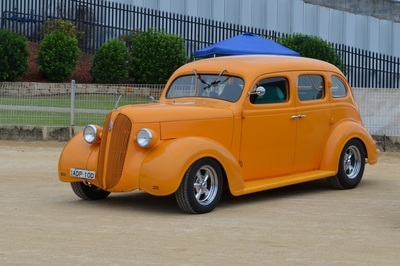 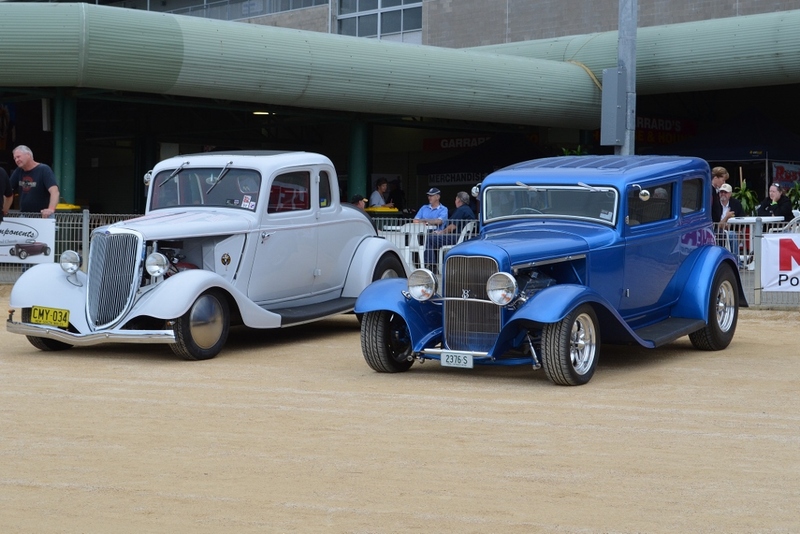 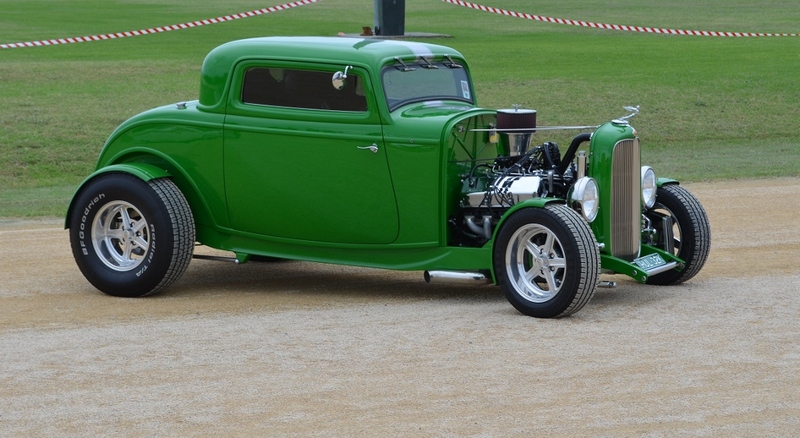 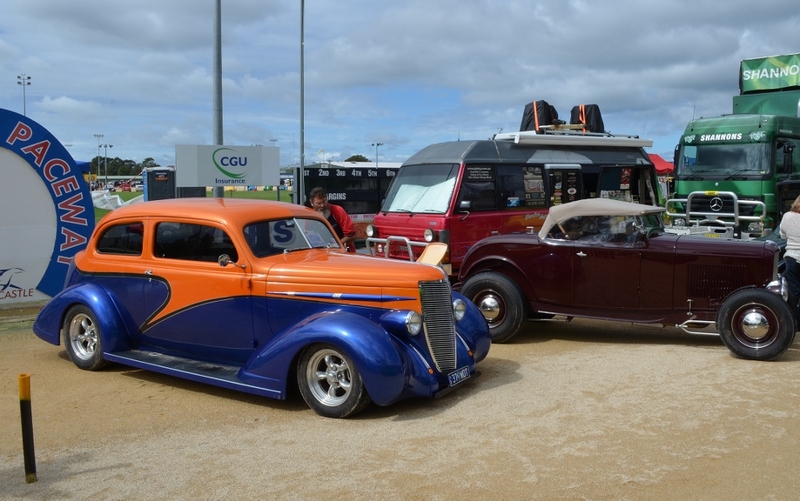 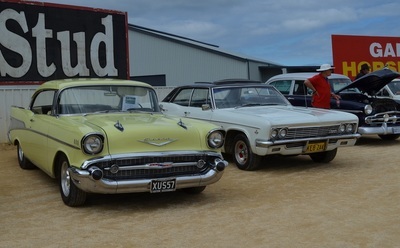 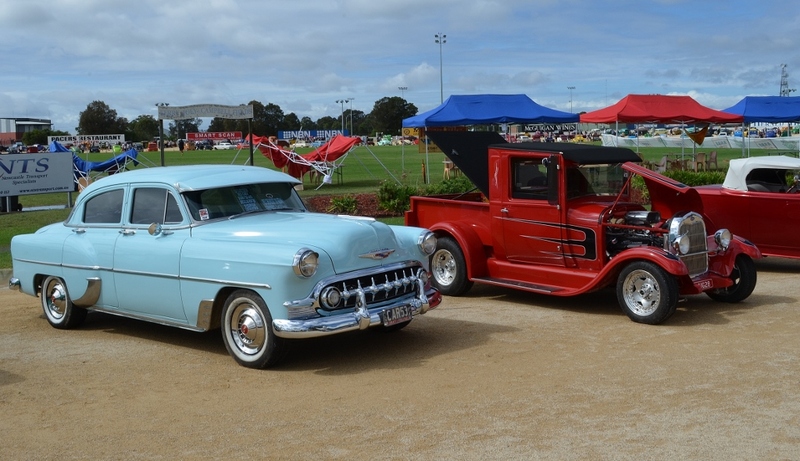 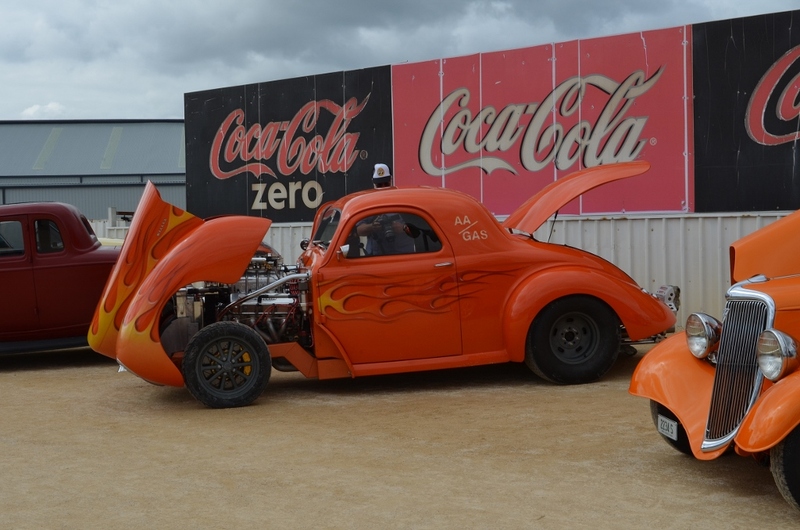 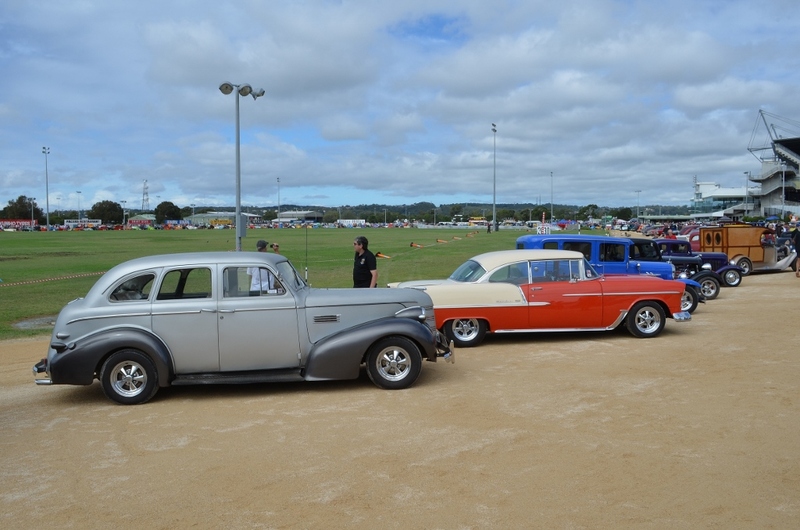 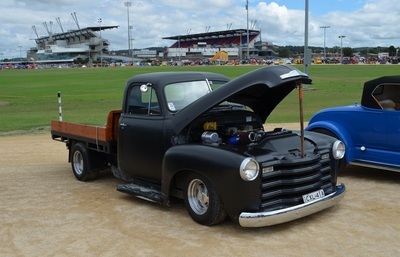 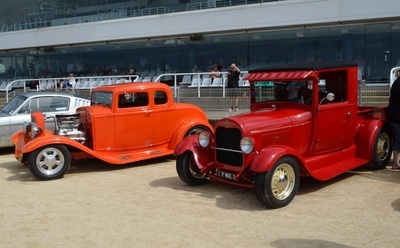 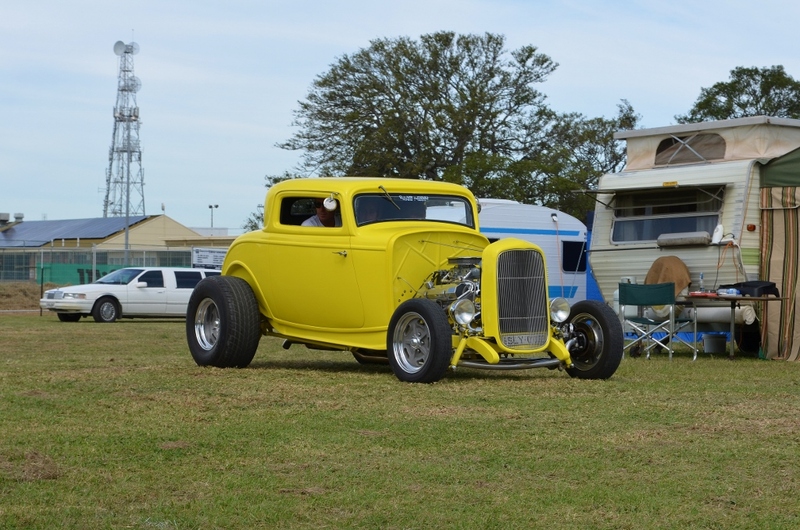 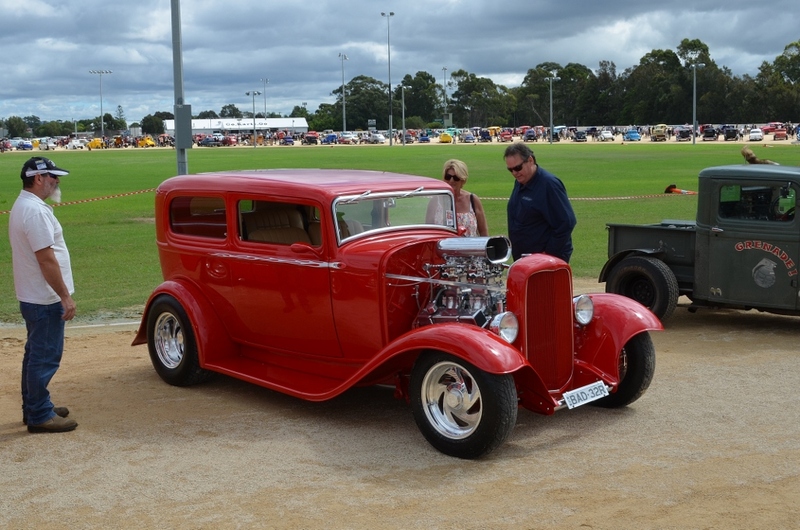 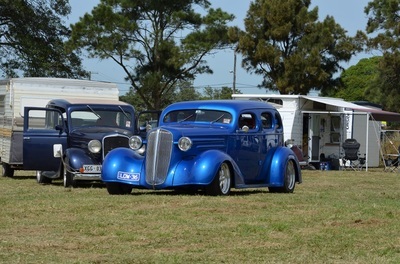 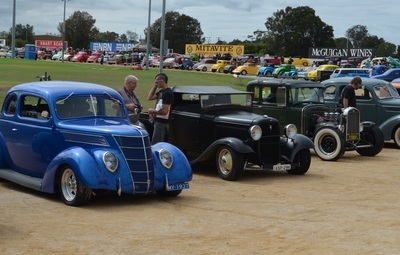 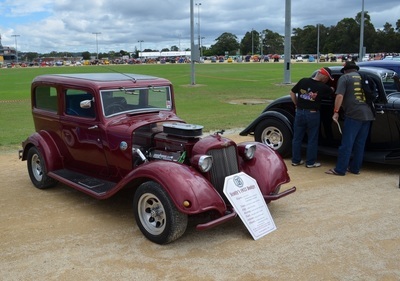 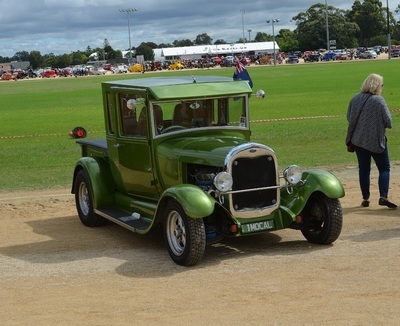 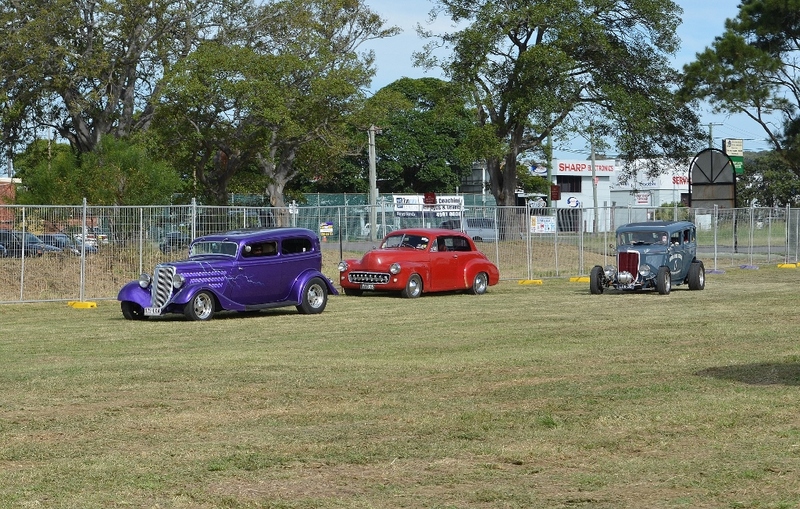 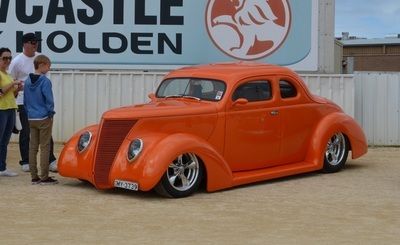 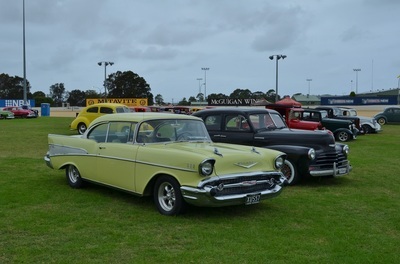 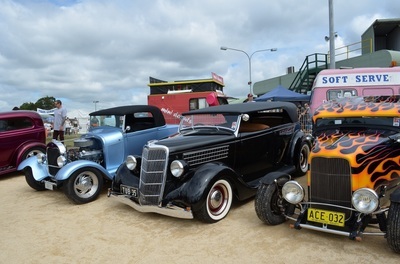 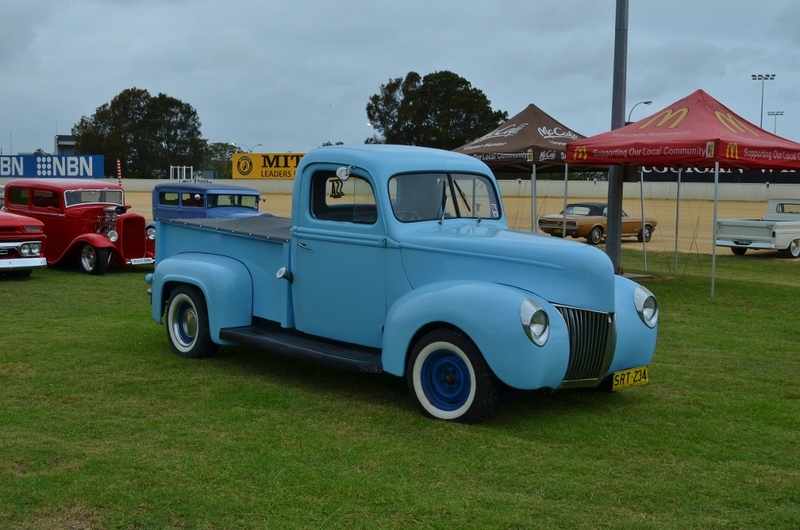 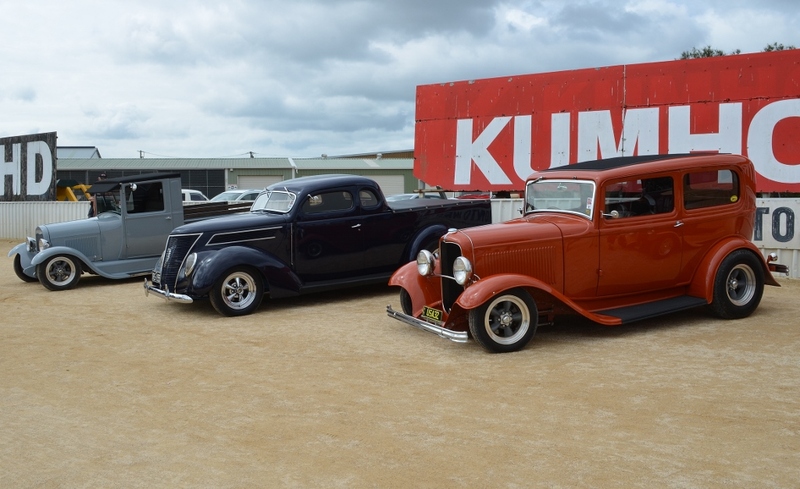 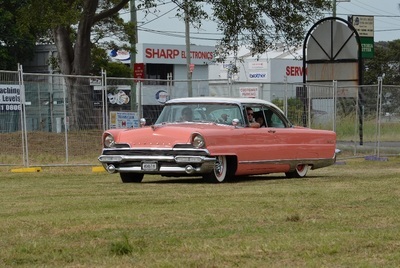 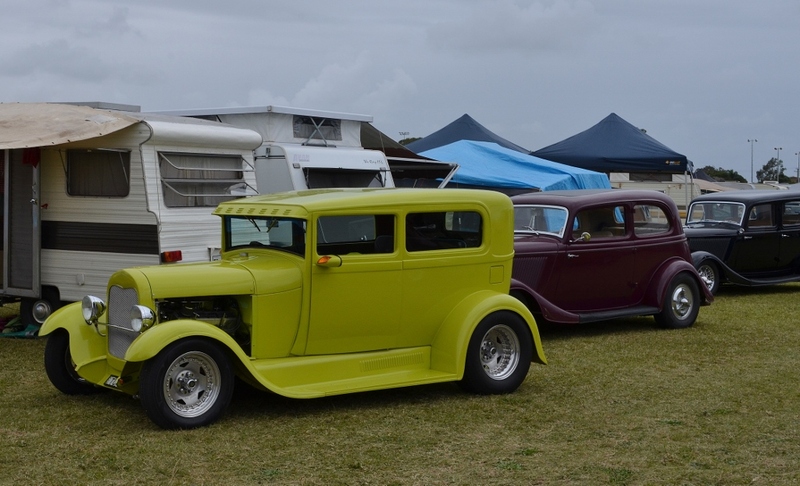 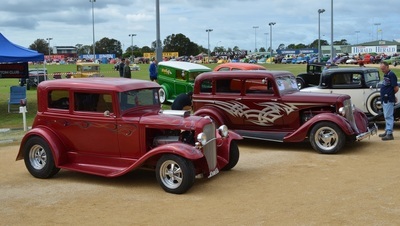 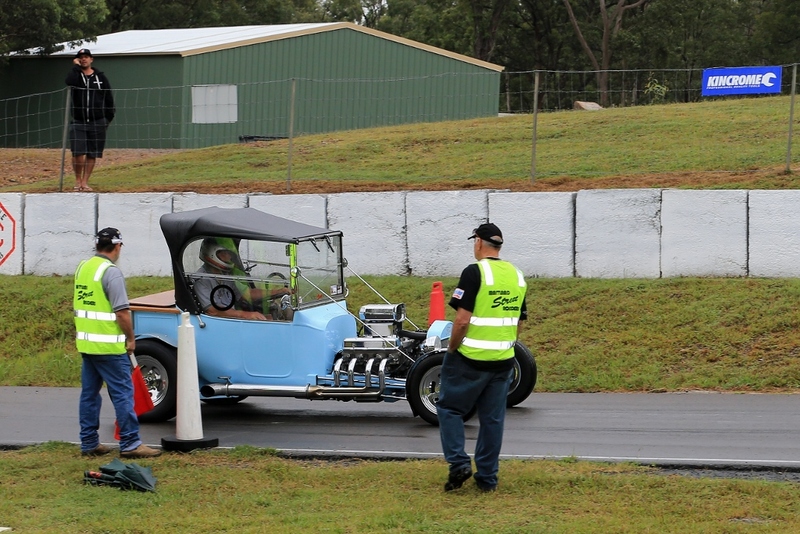 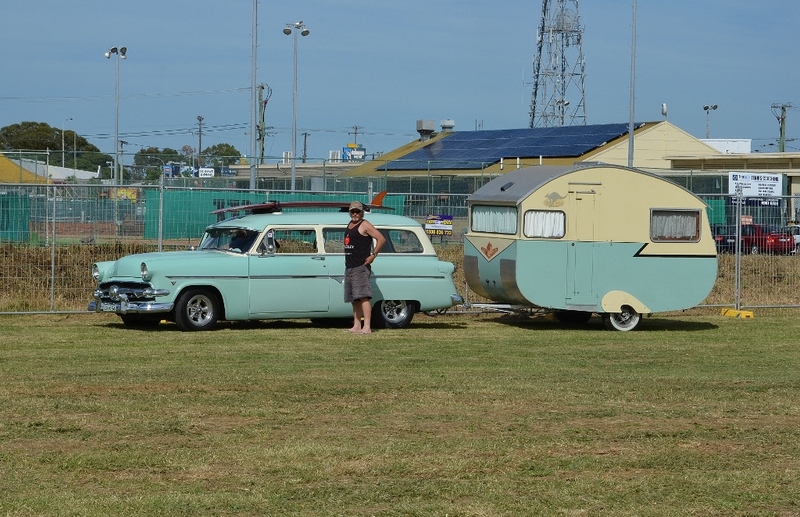 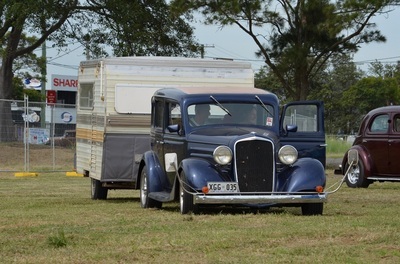 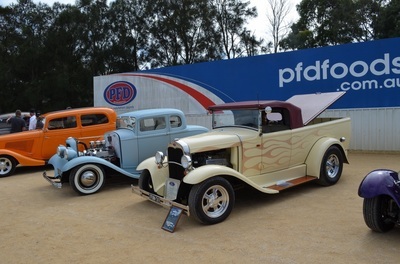 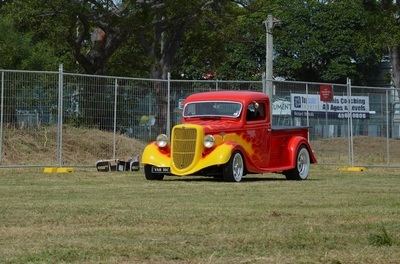 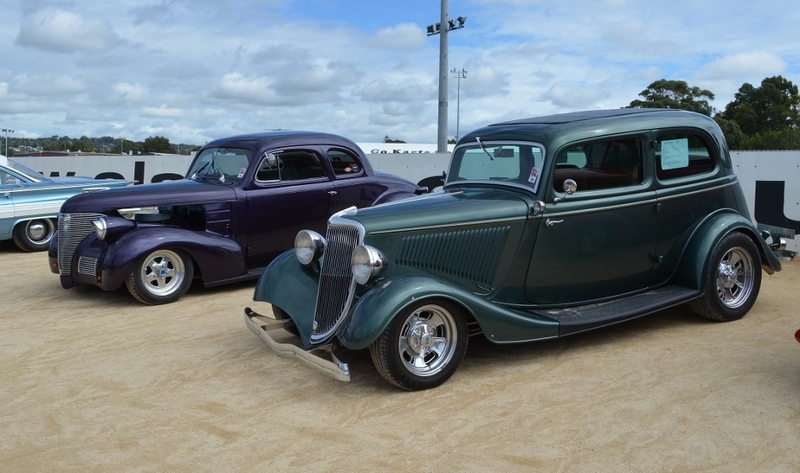 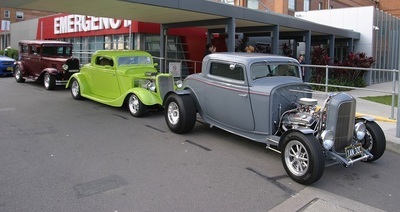 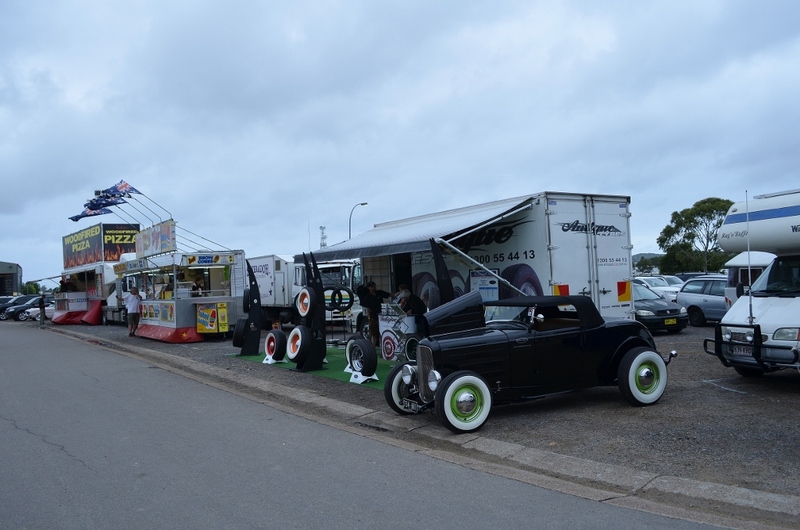 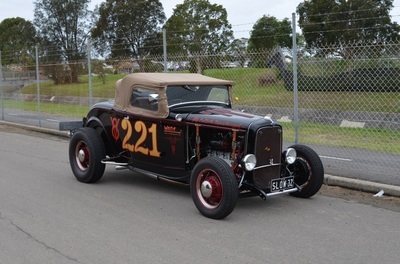 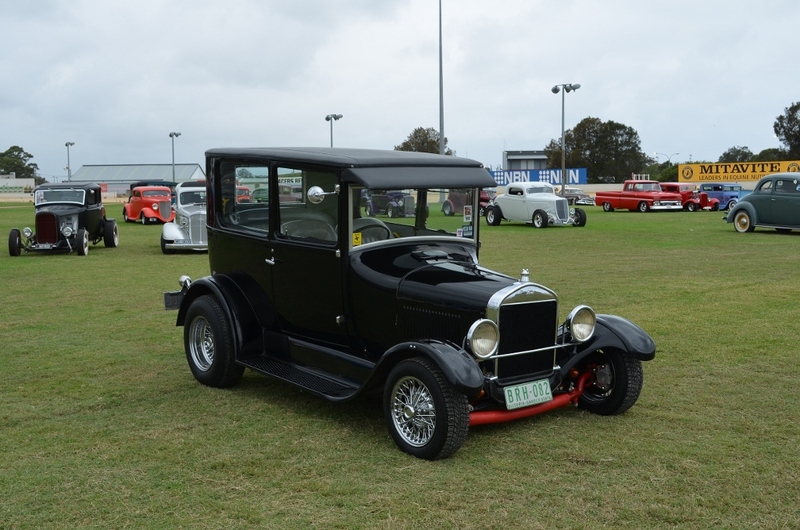 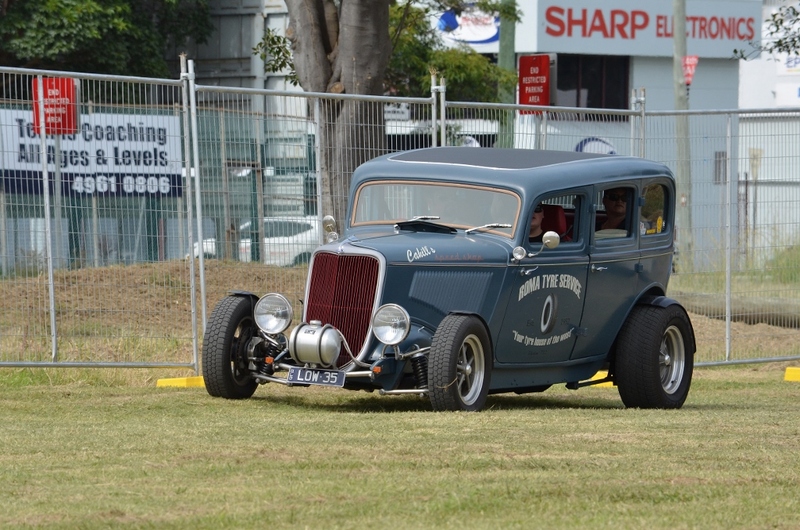 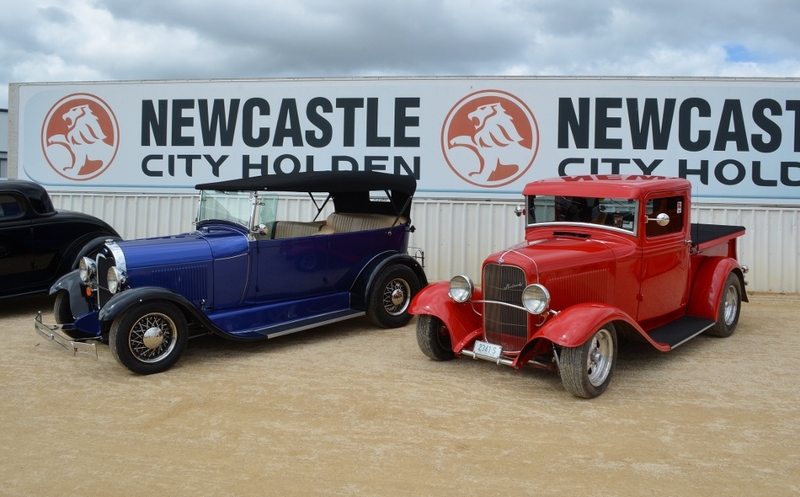 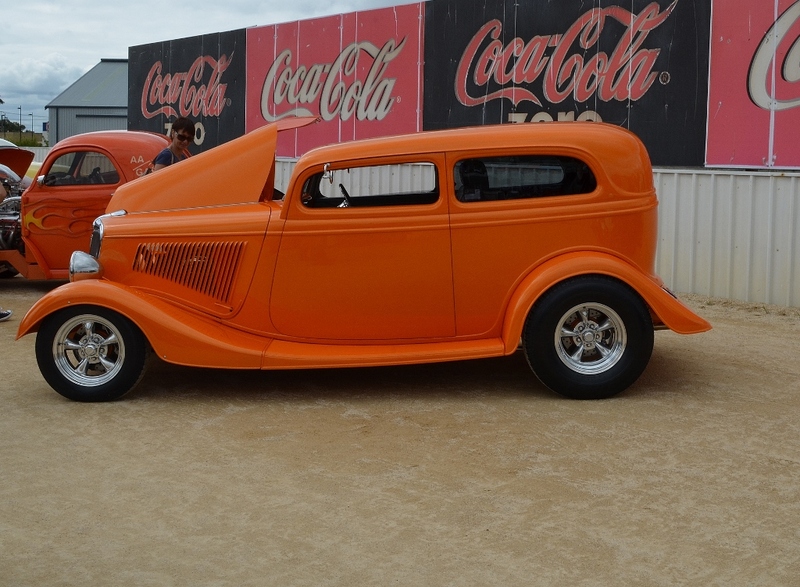 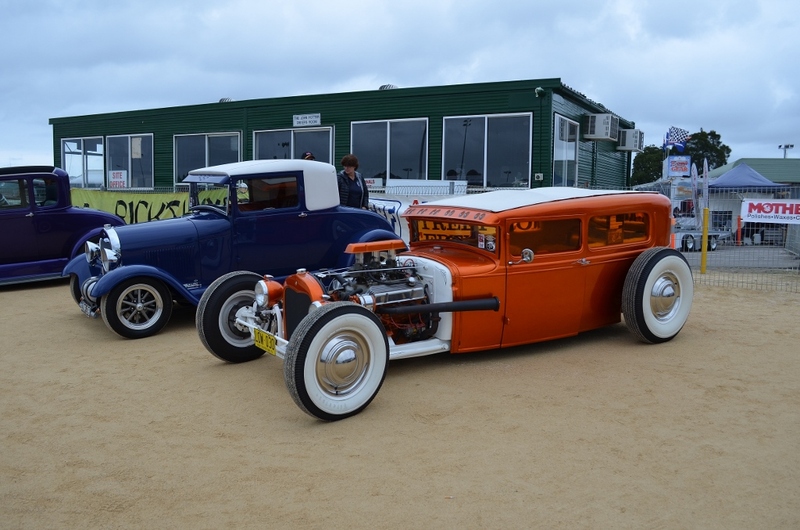 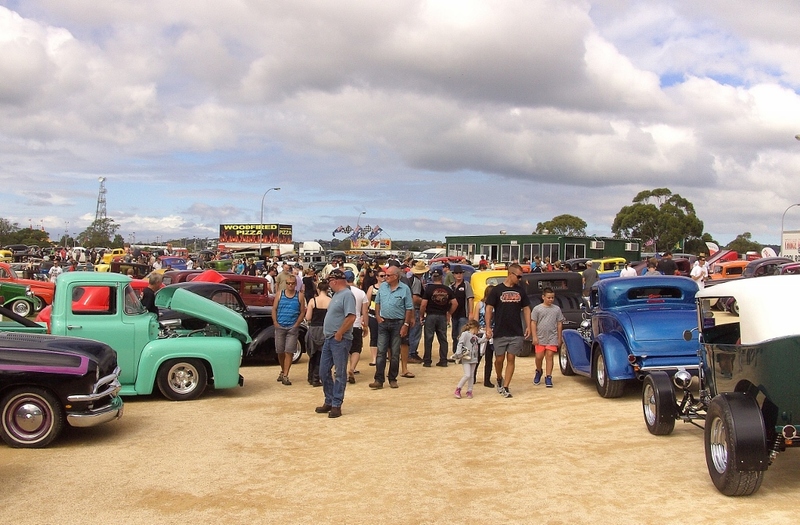 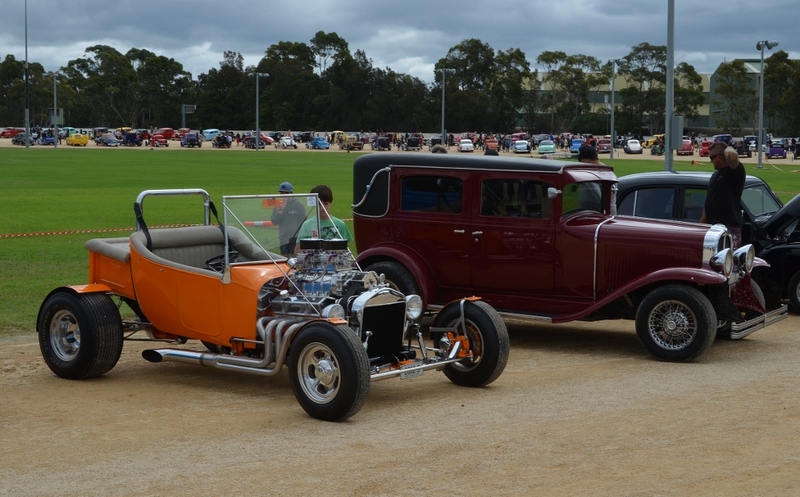 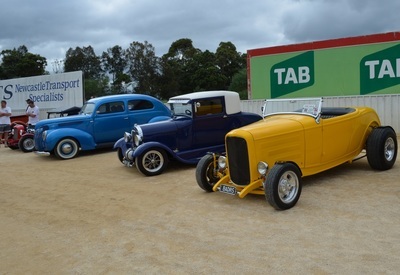 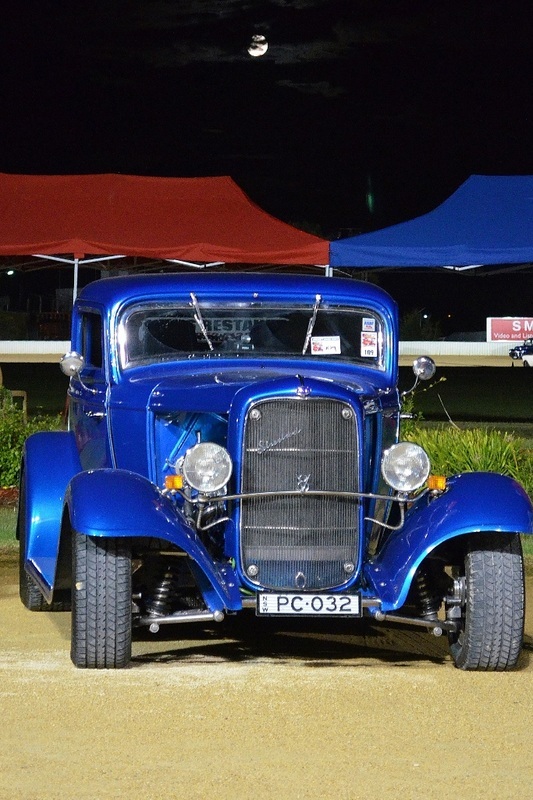 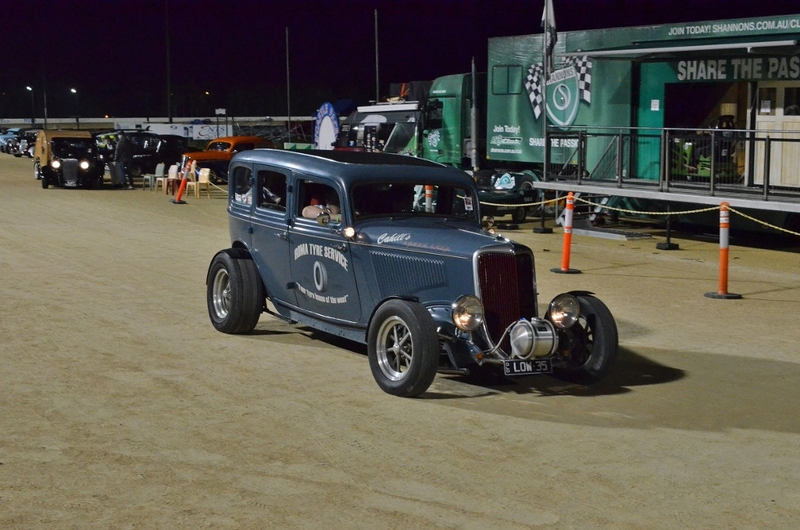 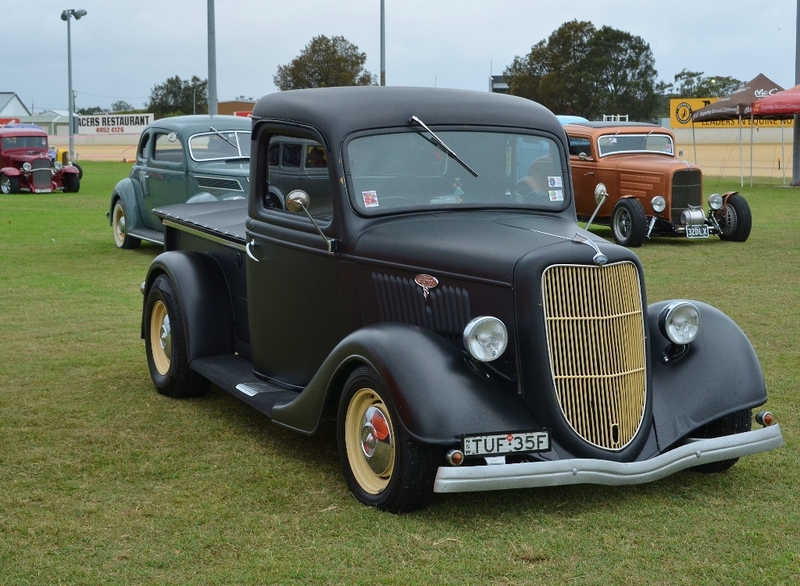 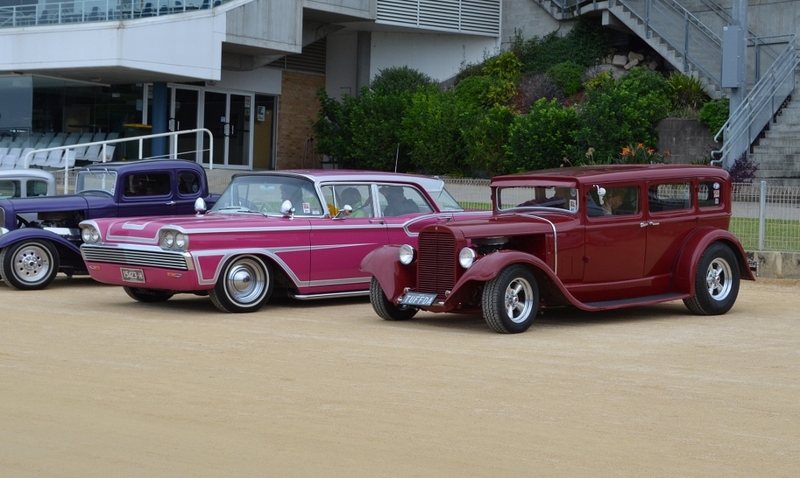 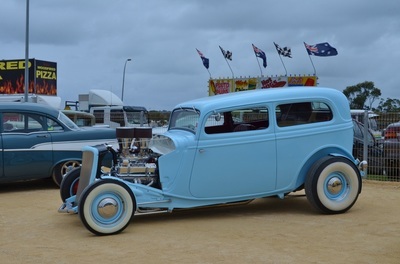 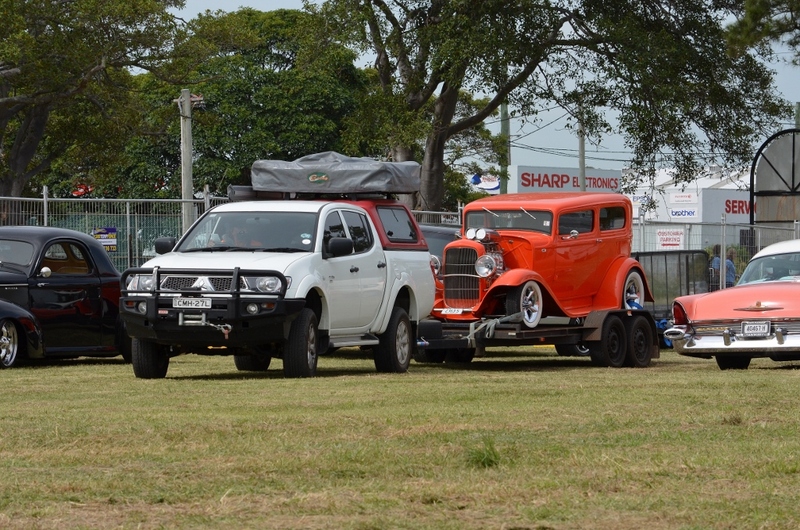 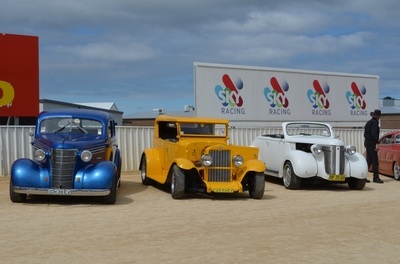 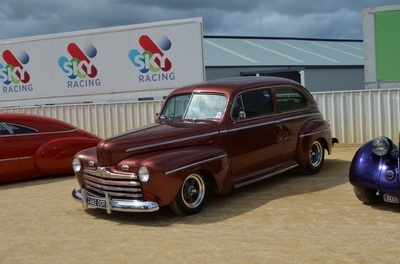 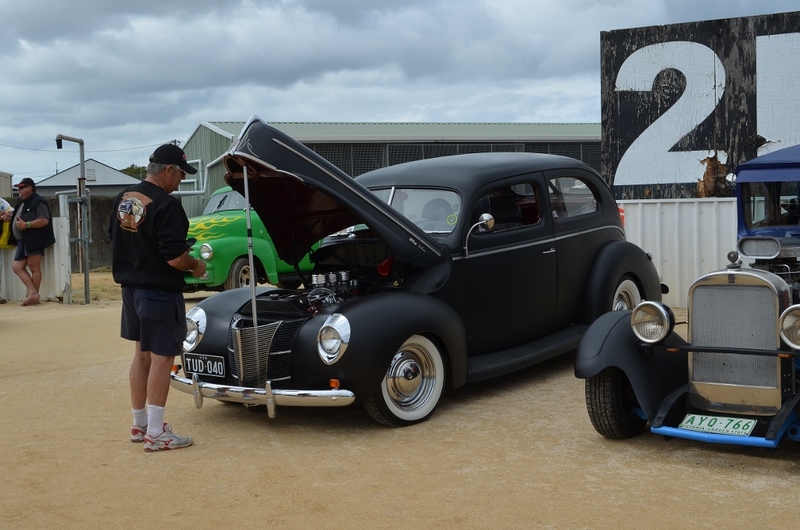 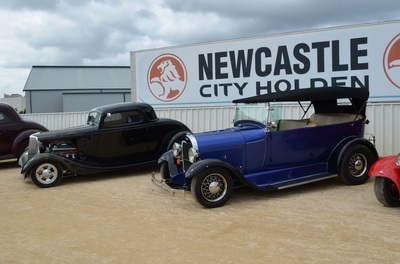 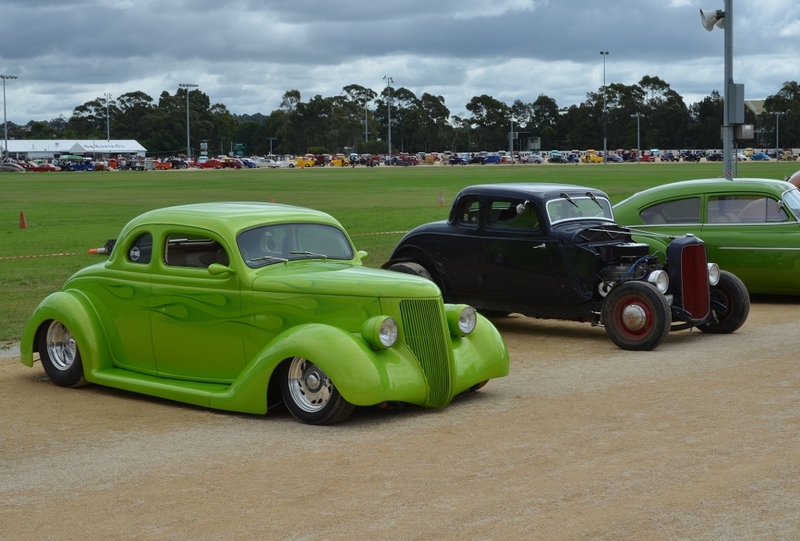 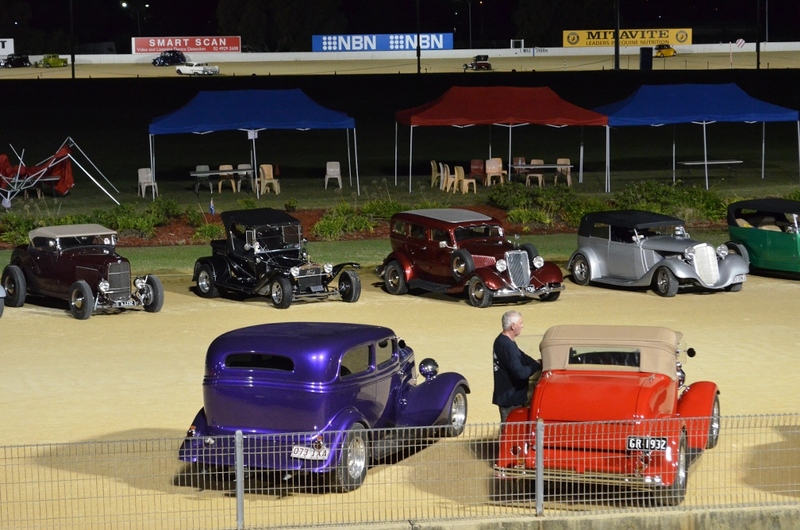 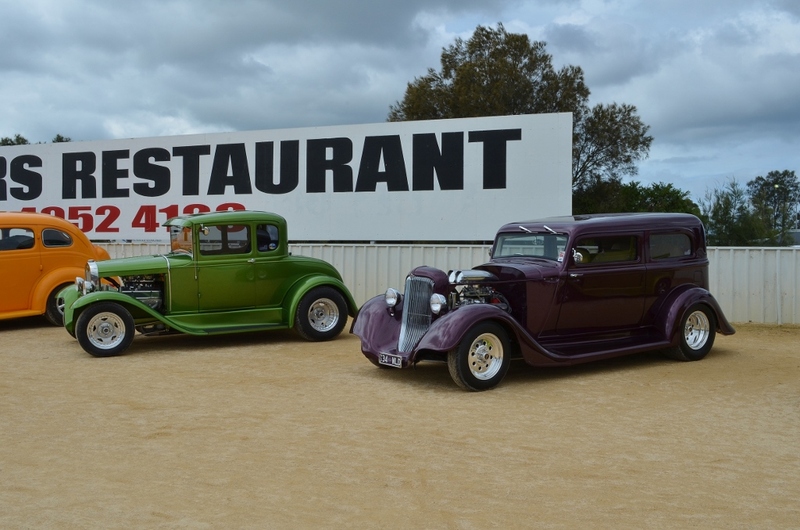 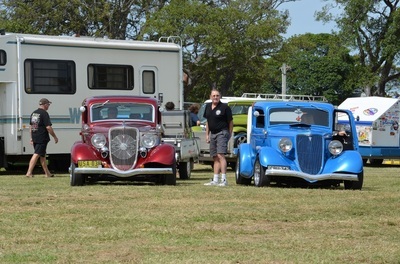 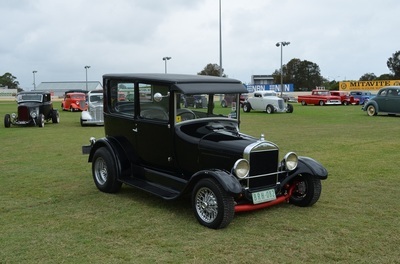 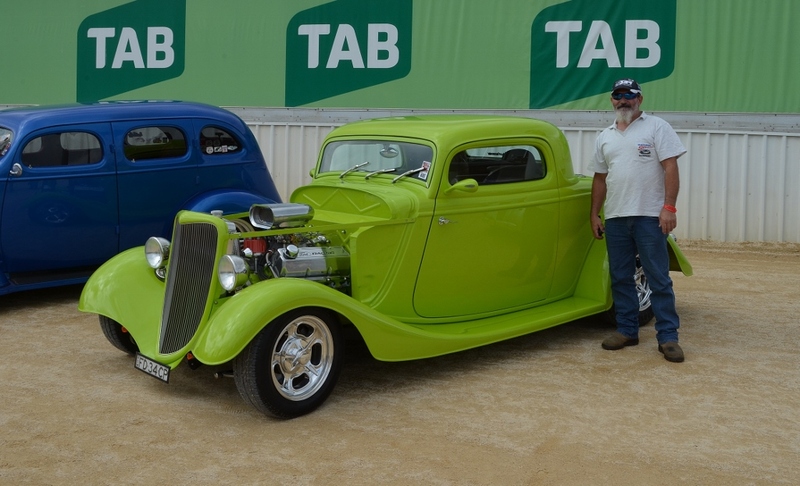 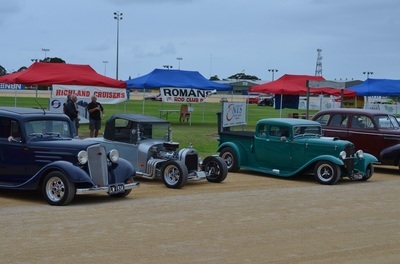 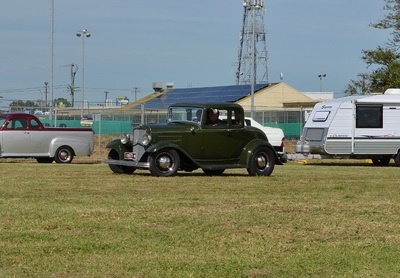 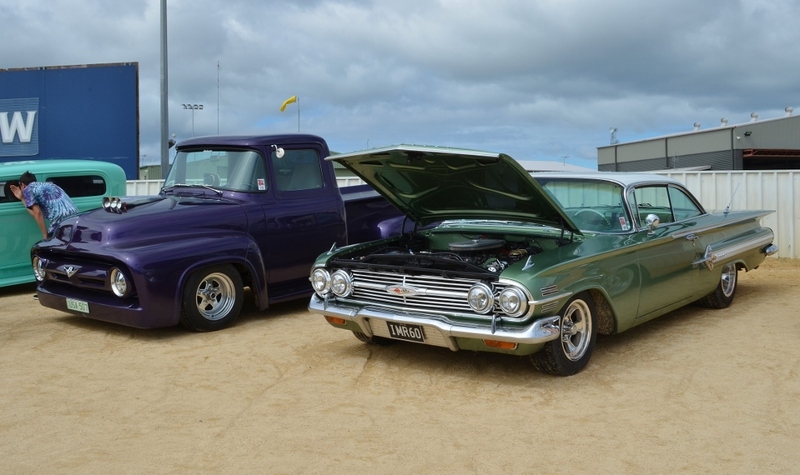 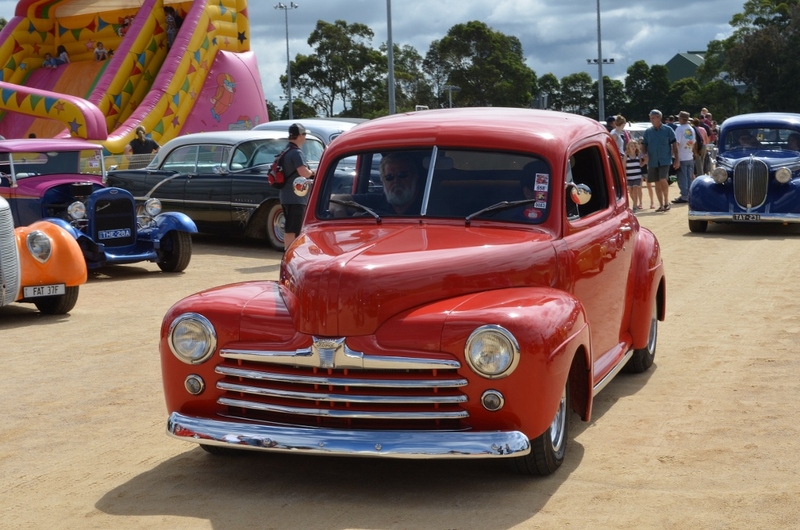 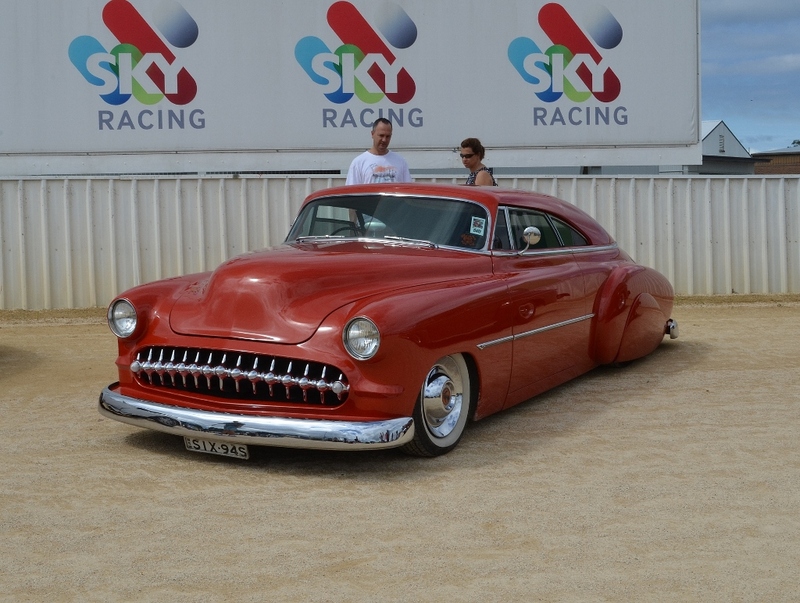 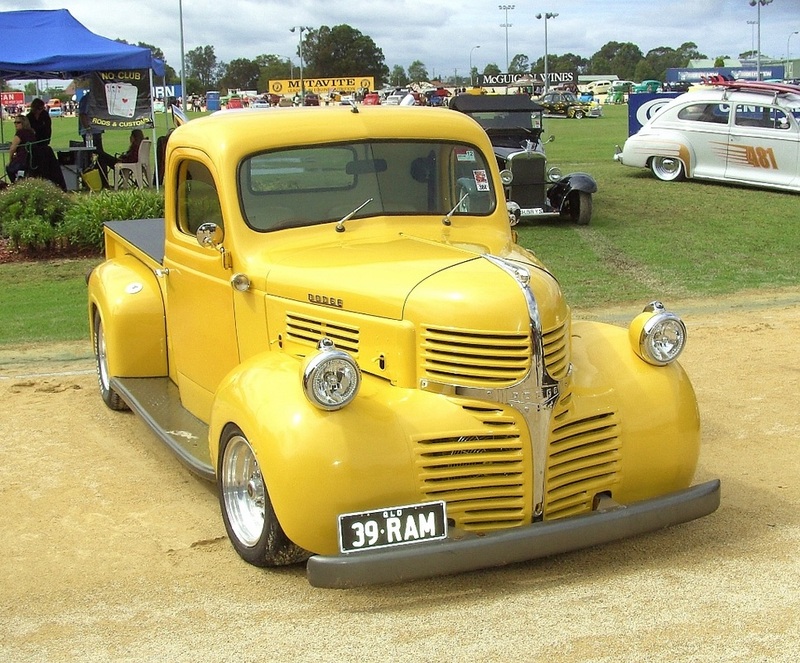 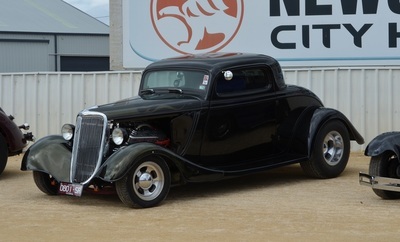 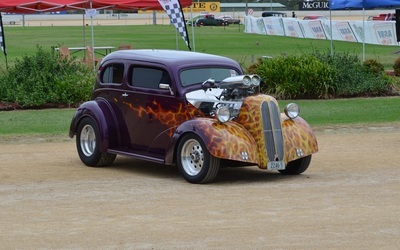 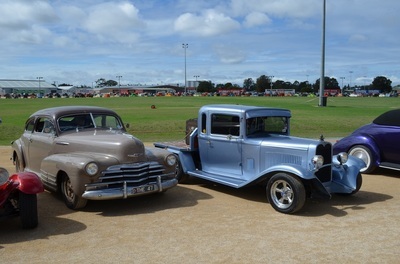 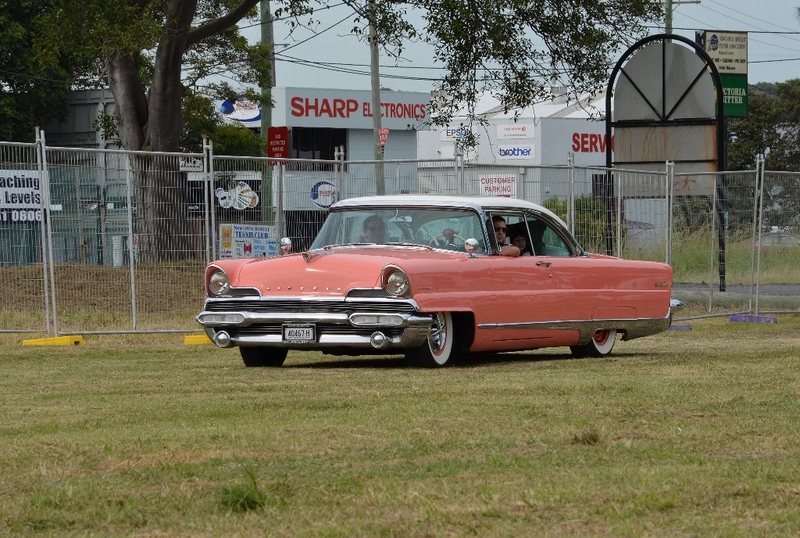 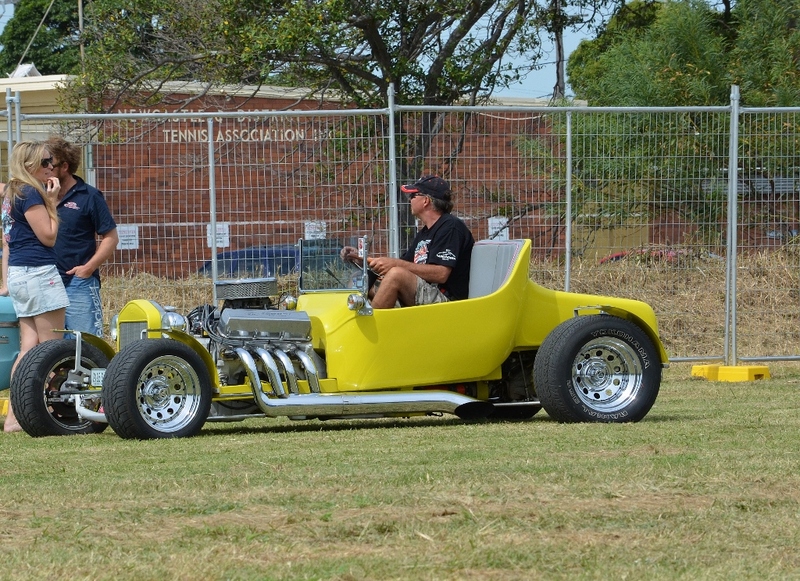 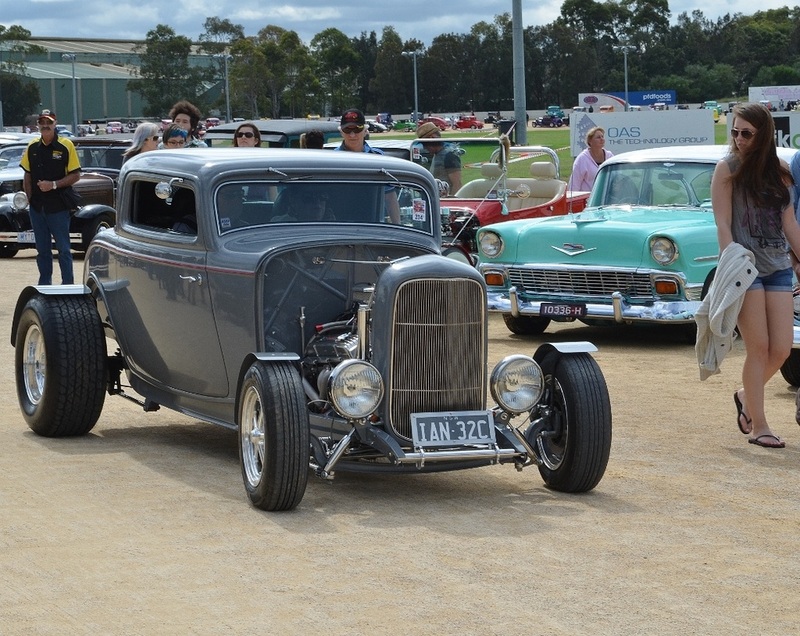 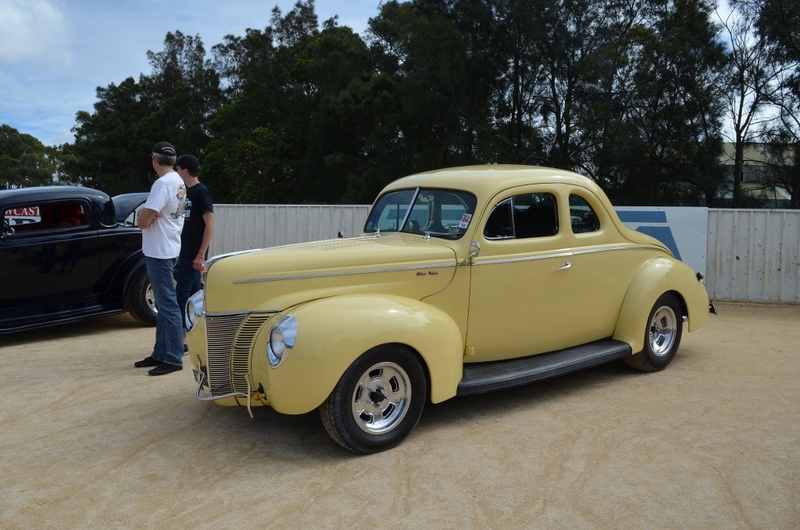 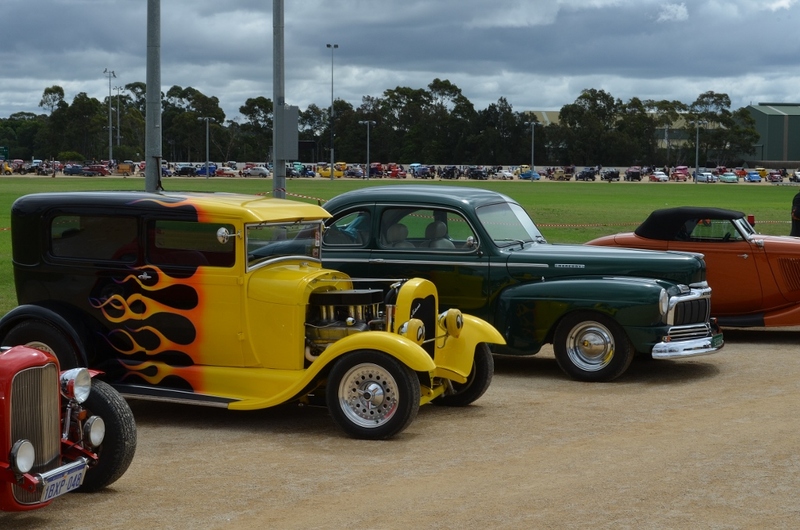 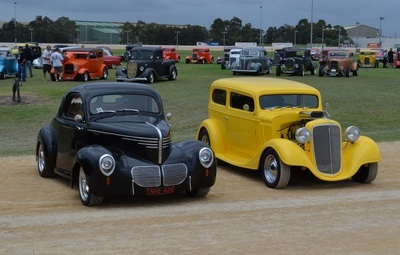 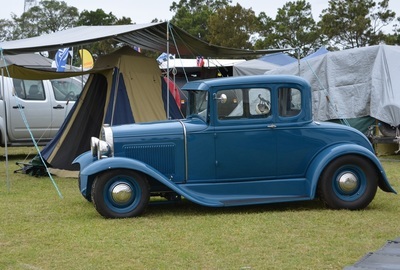 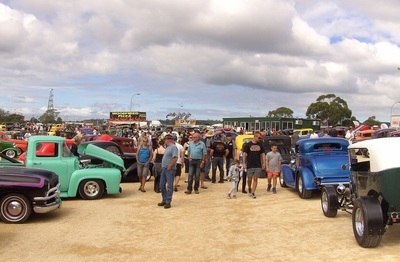 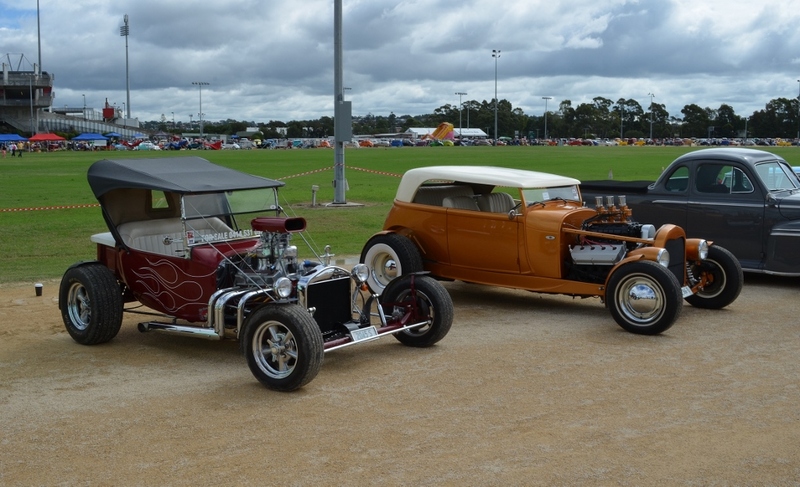 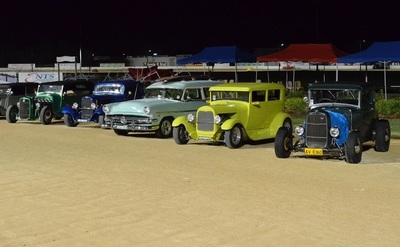 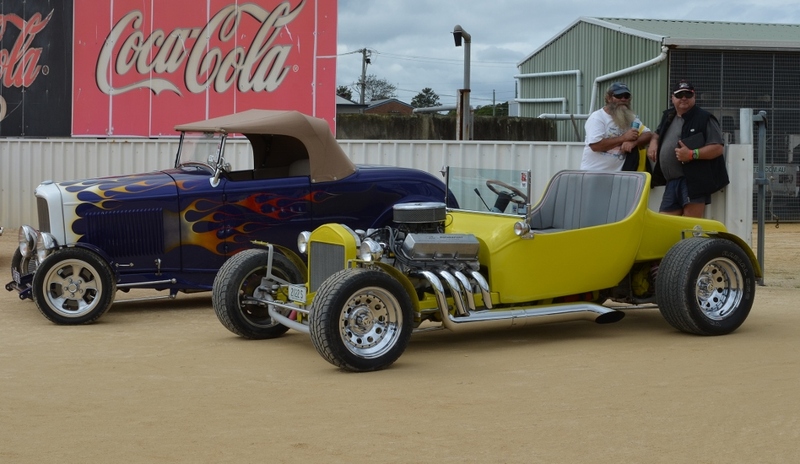 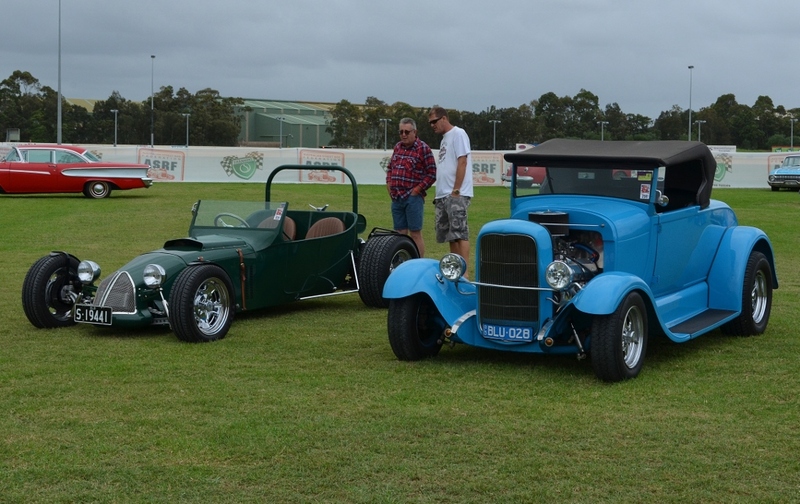 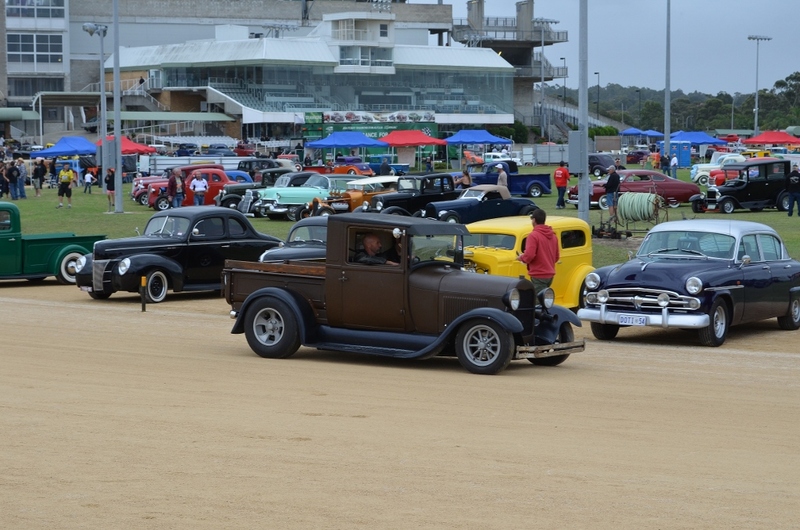 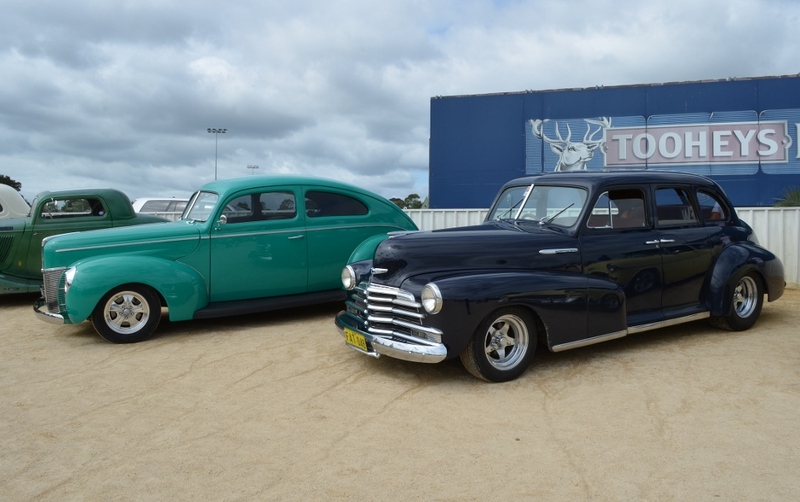 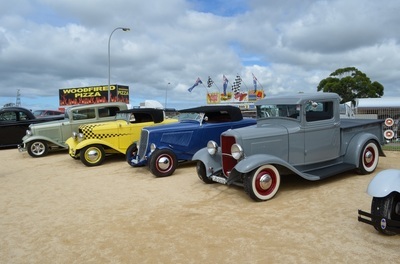 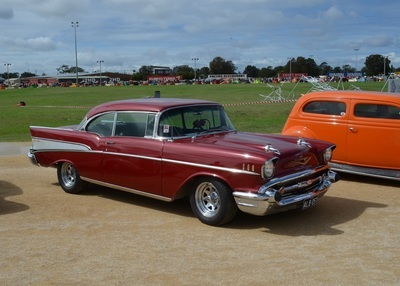 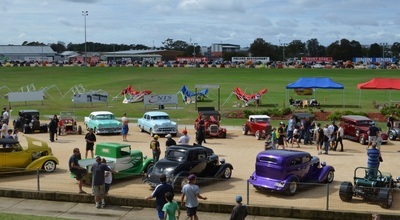 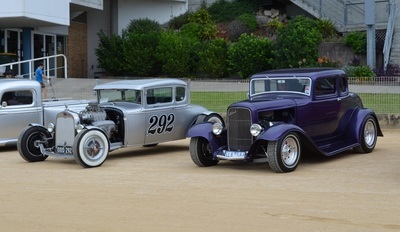 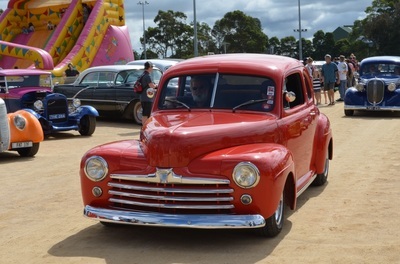 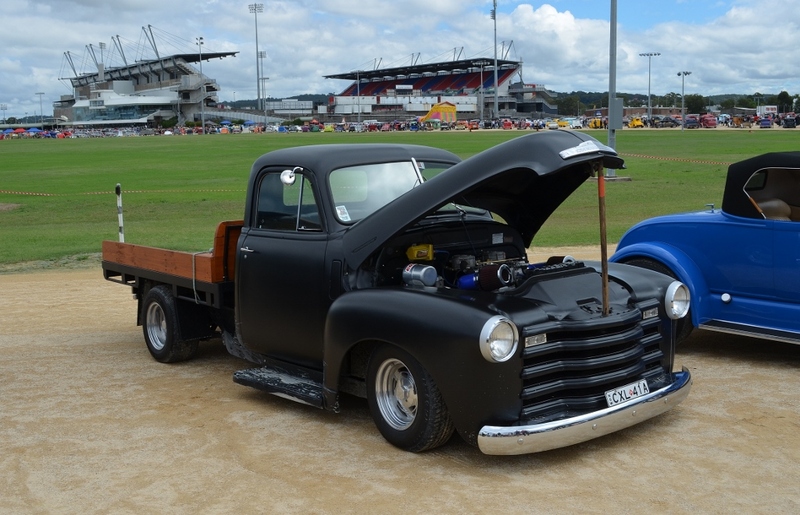 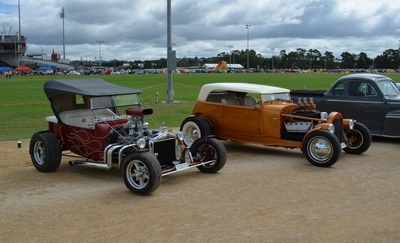 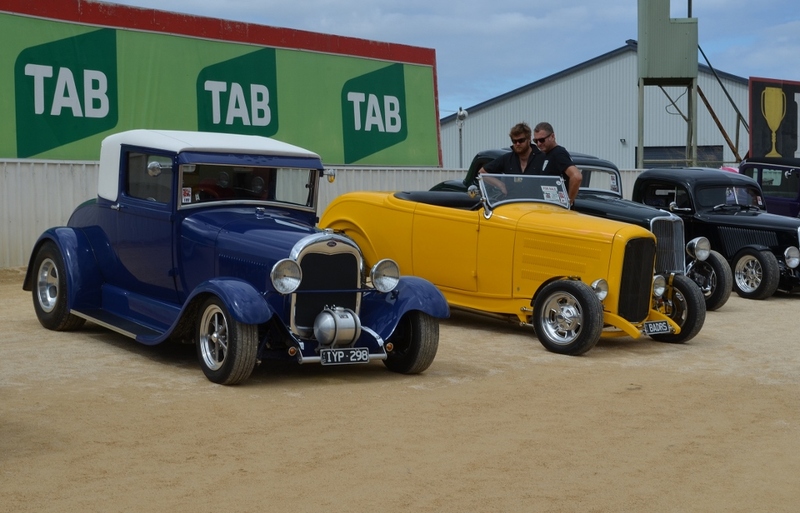 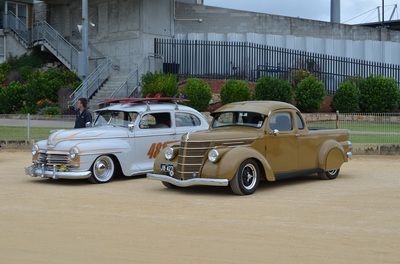 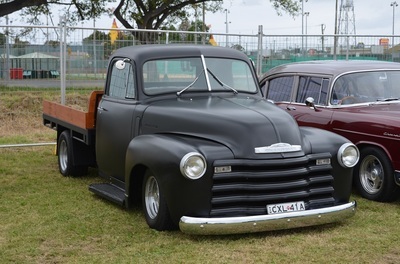 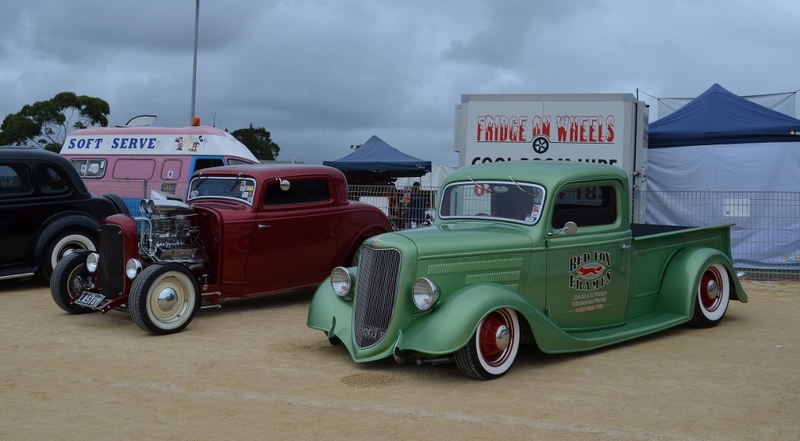 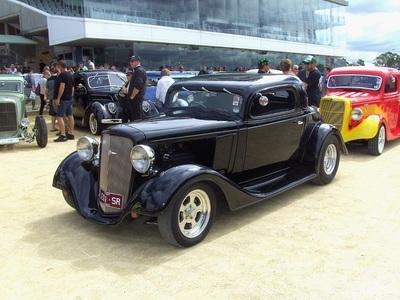 The Newcastle Hot Rod Nationals raised money for local communities and one of the beneficiaries was Maitland Hospital who were presented with a Cuddle Cot used by the parents of still born babies. 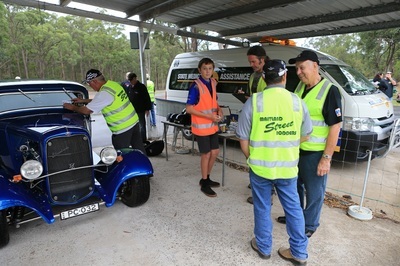 Ian, Claude and Sandy attended the presentation along with Tony from Liberty Rodders.